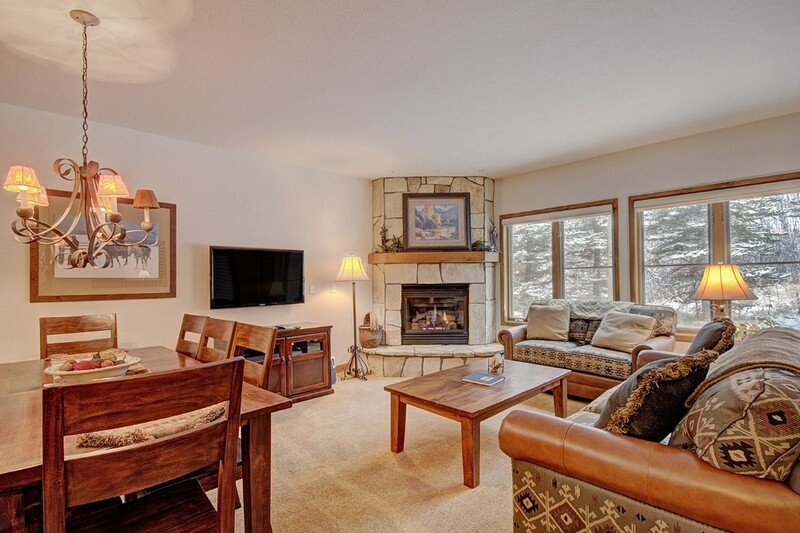 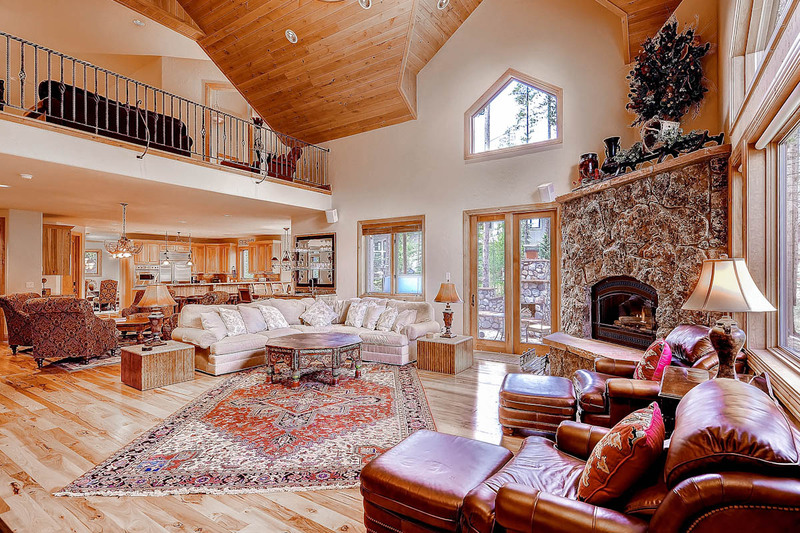 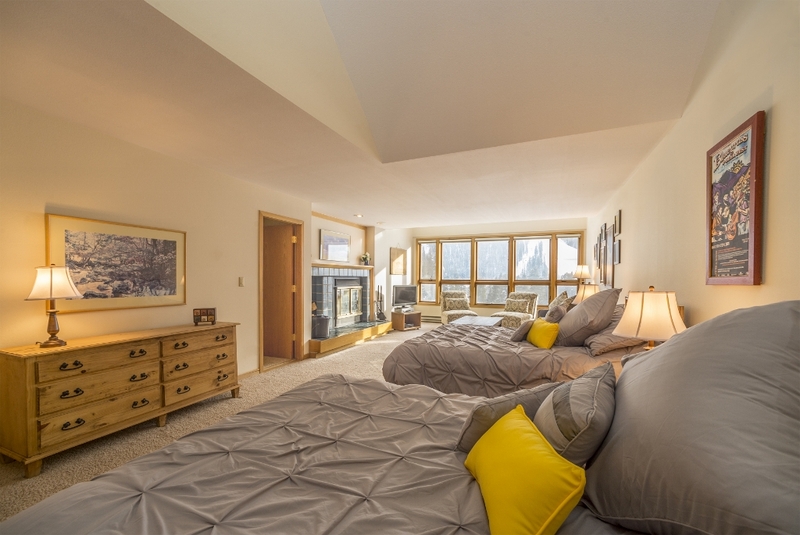 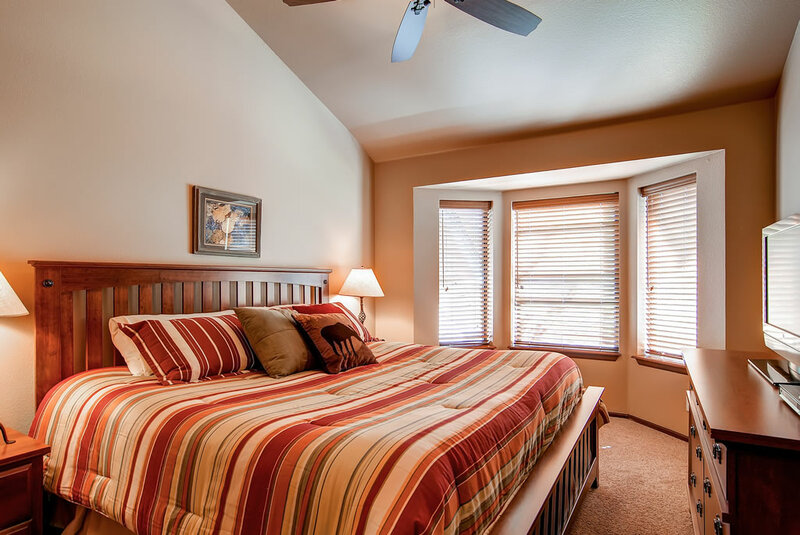 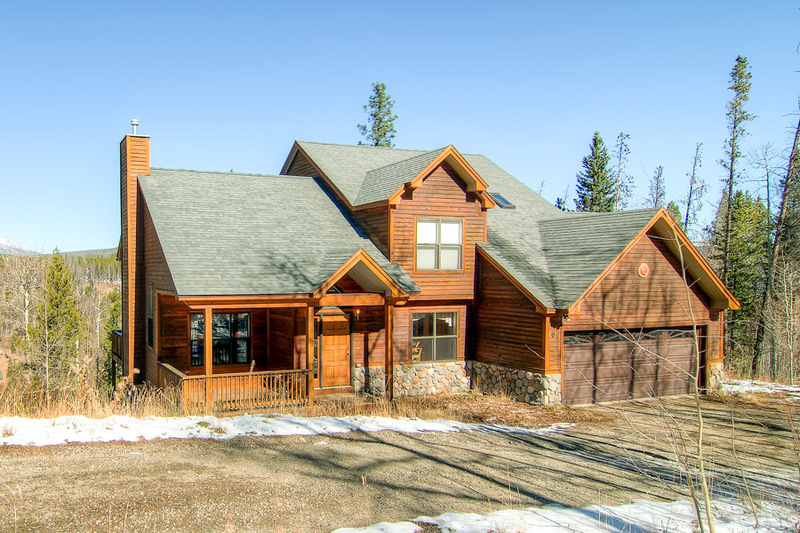 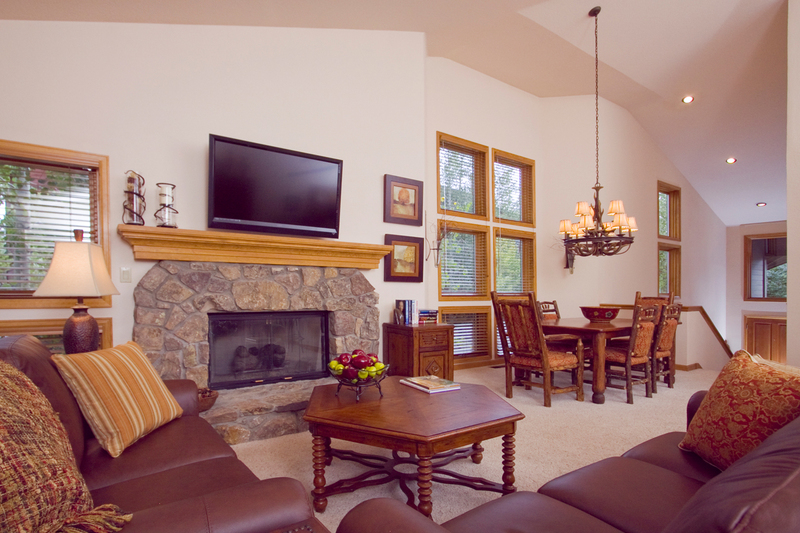 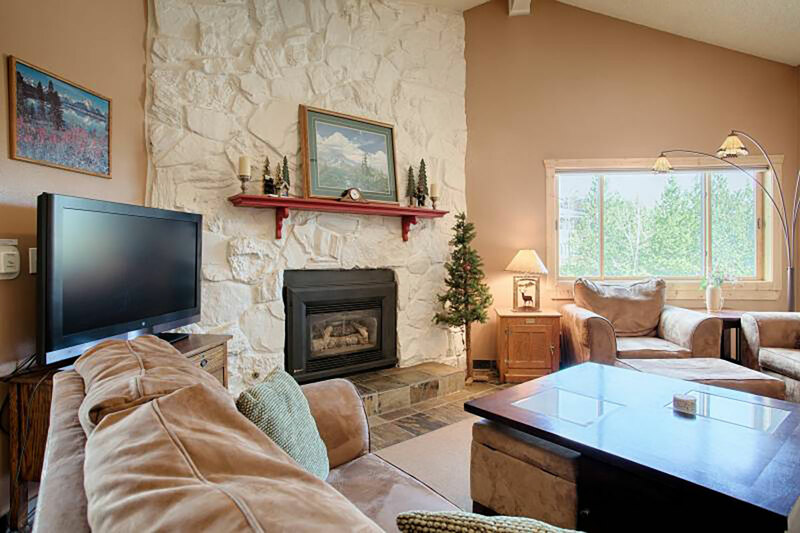 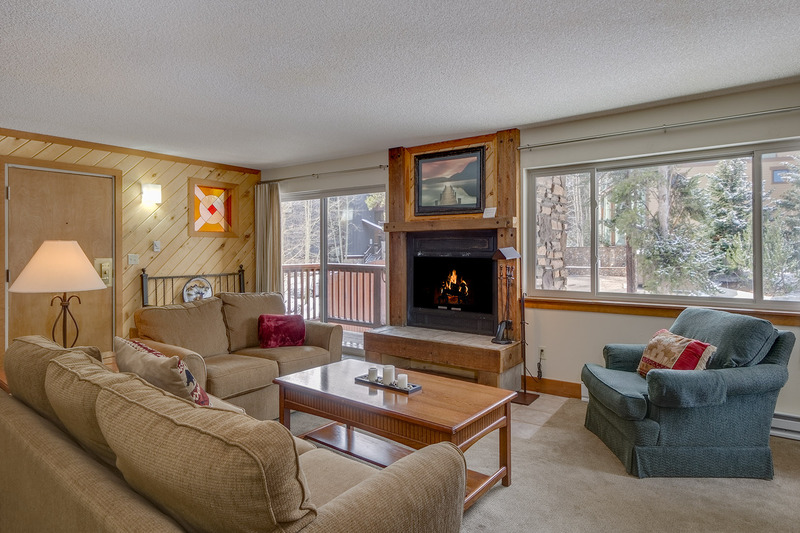 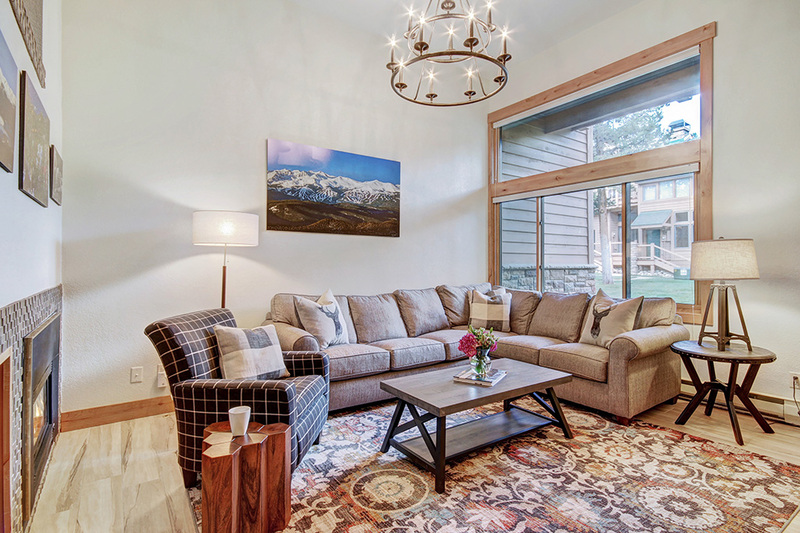 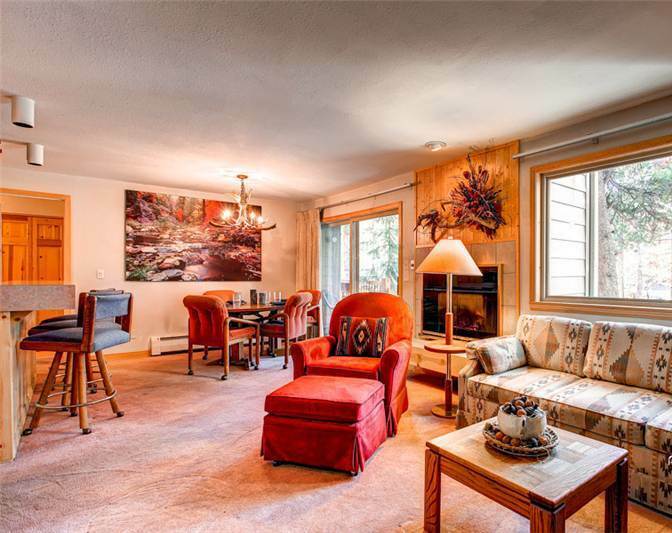 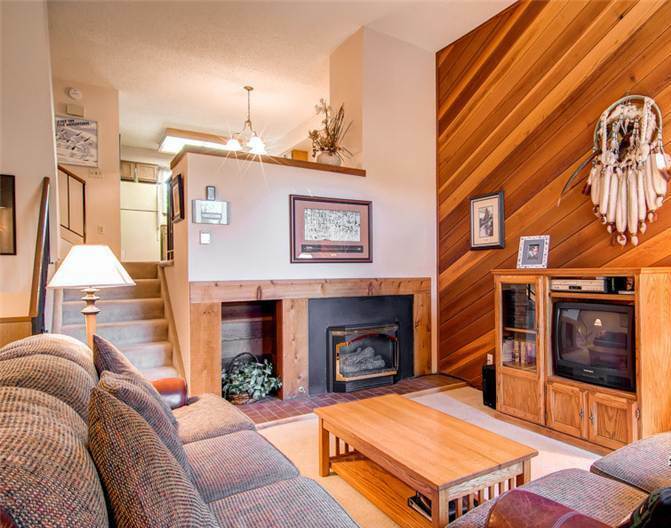 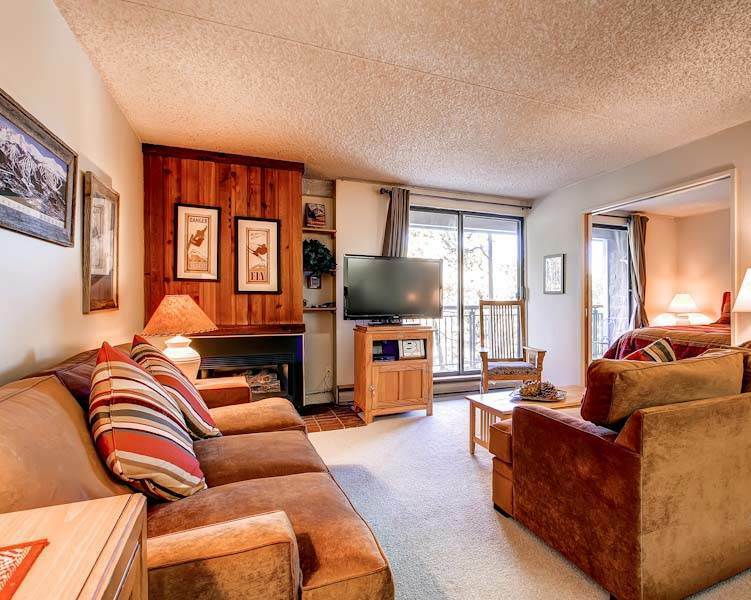 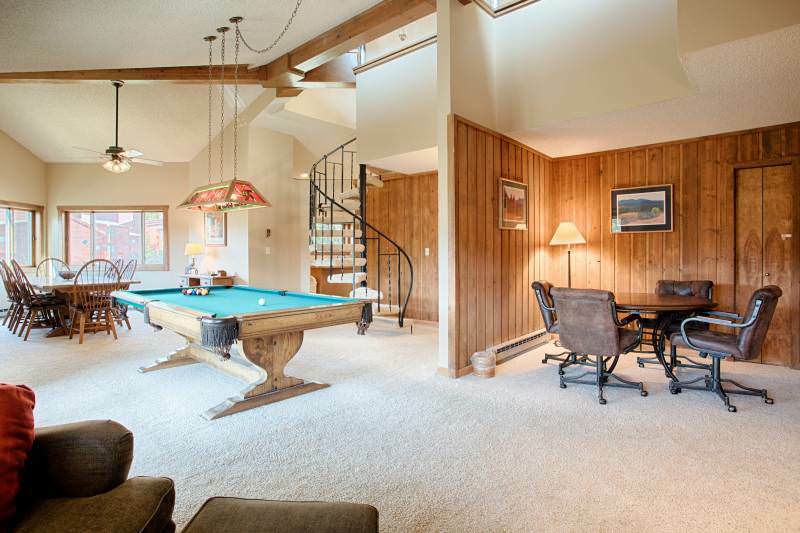 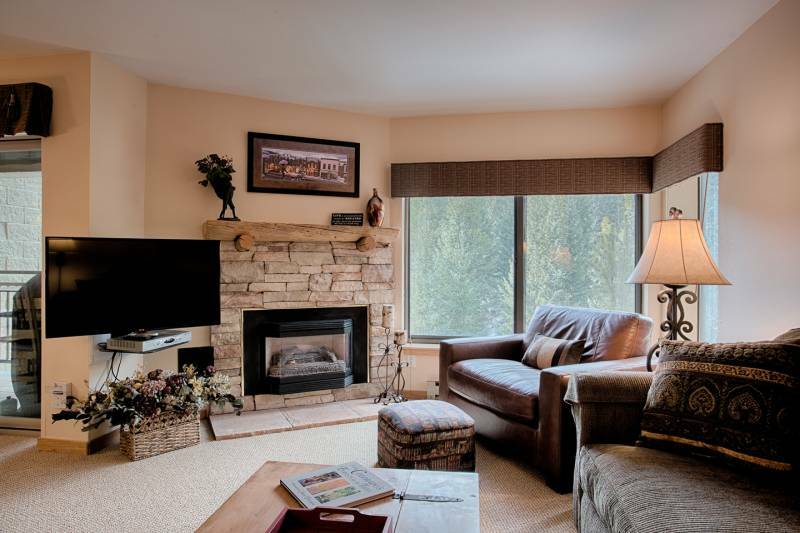 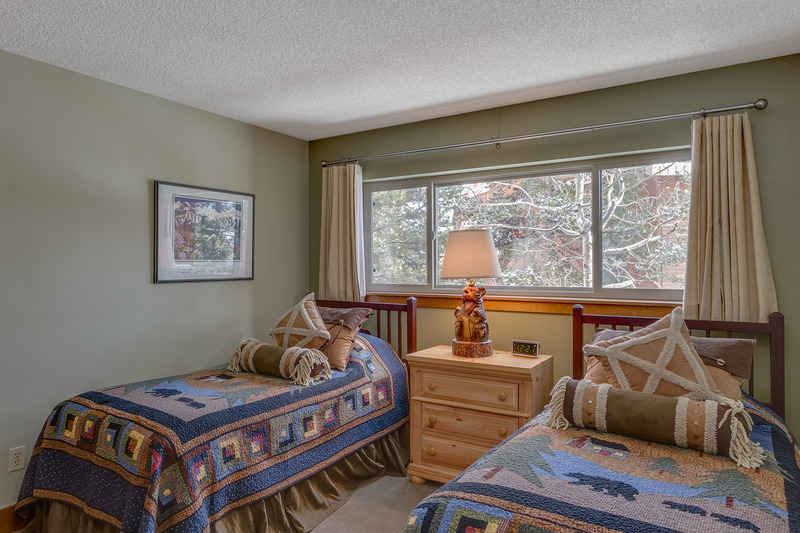 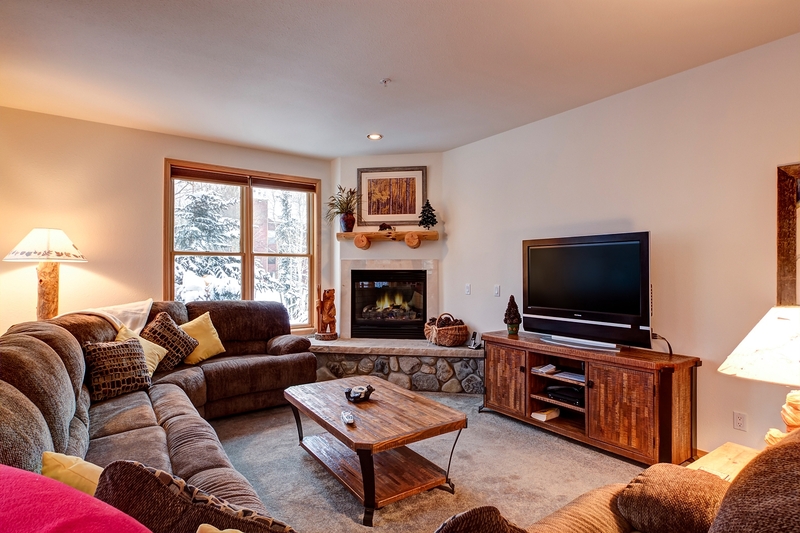 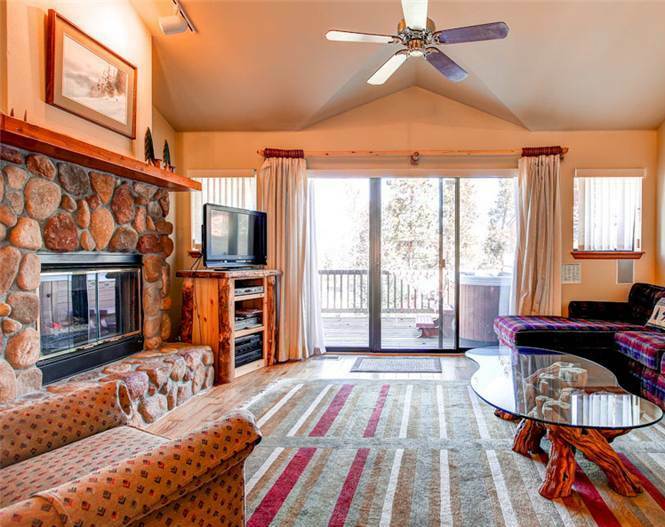 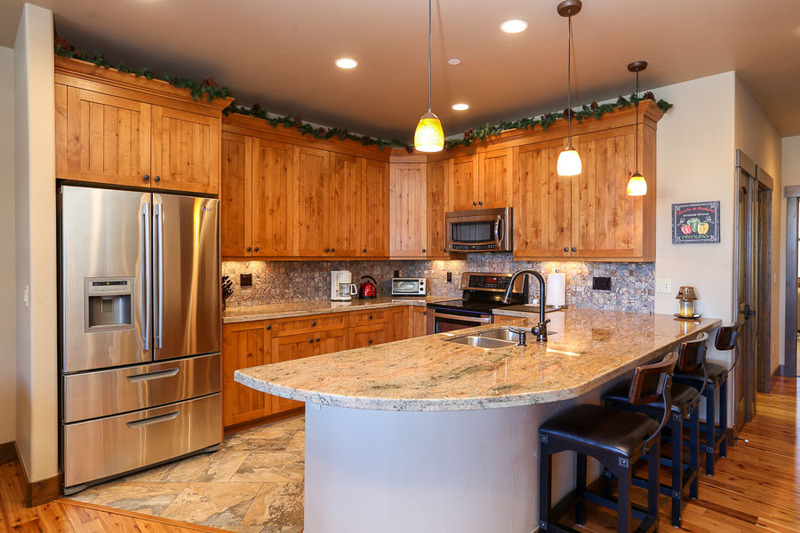 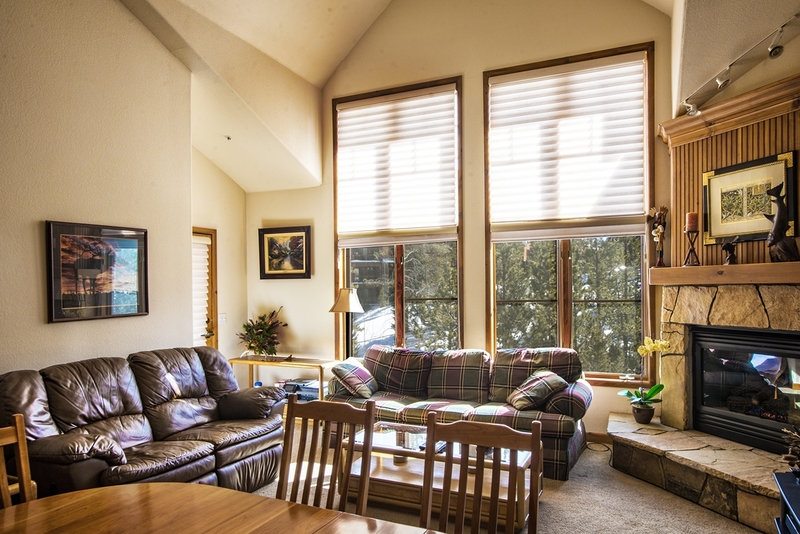 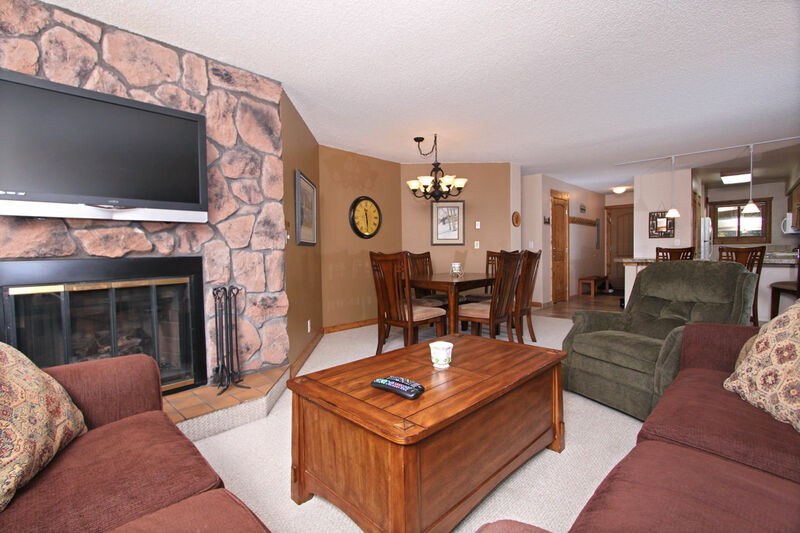 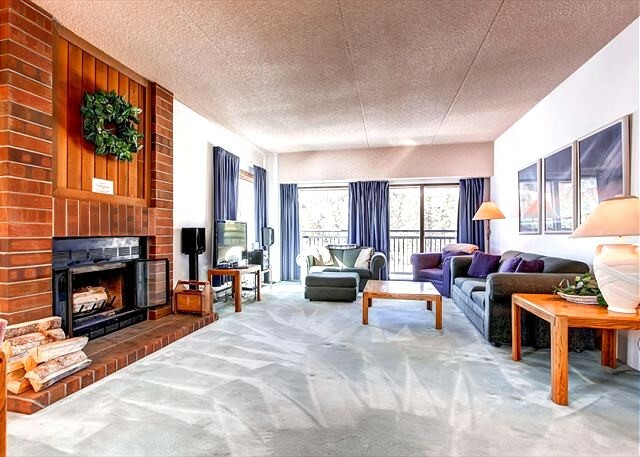 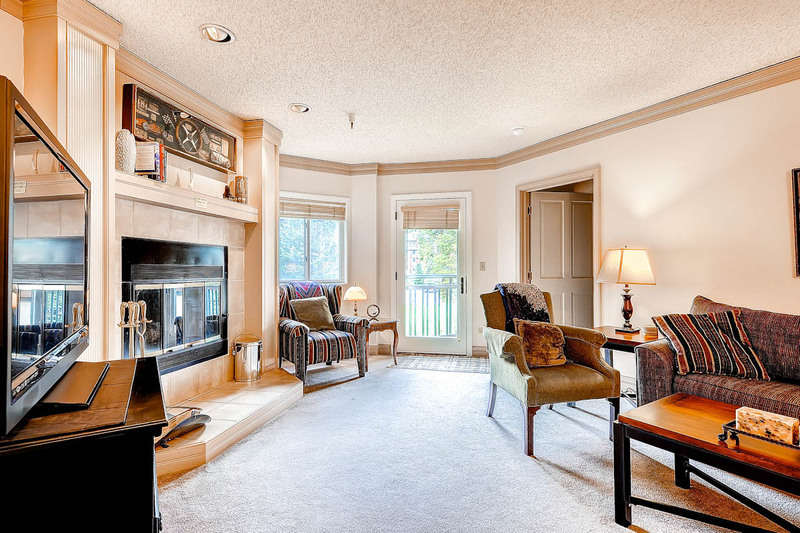 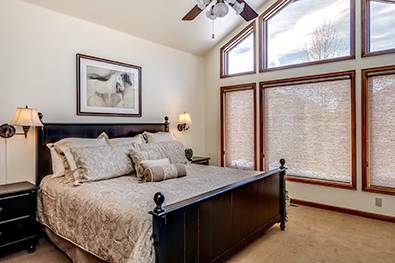 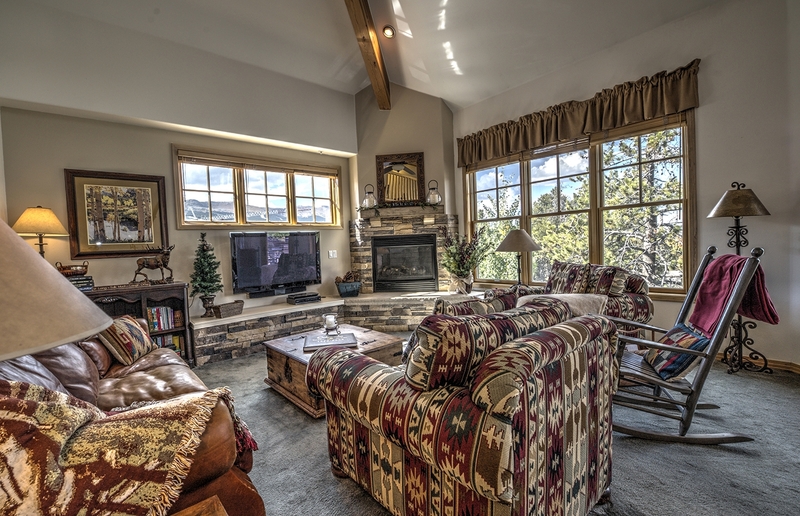 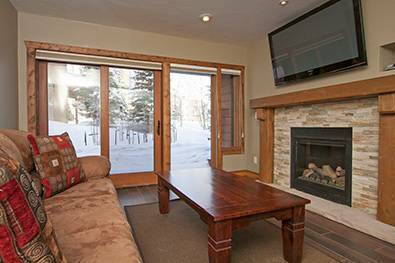 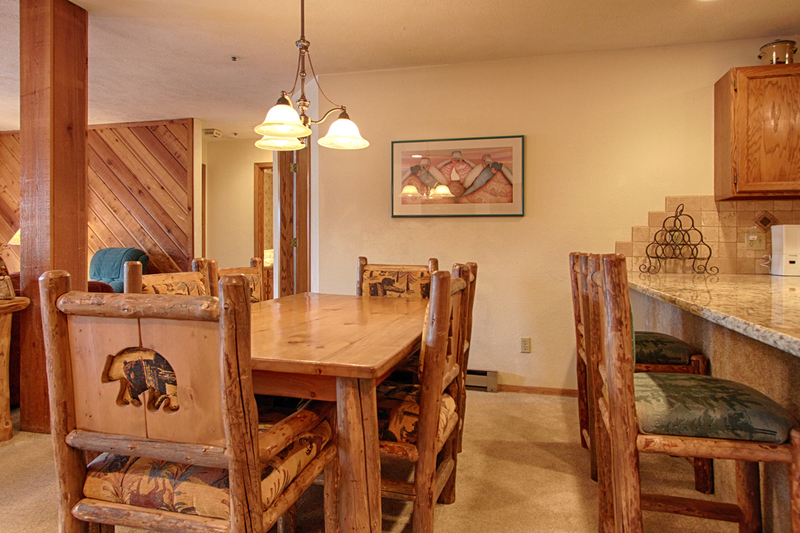 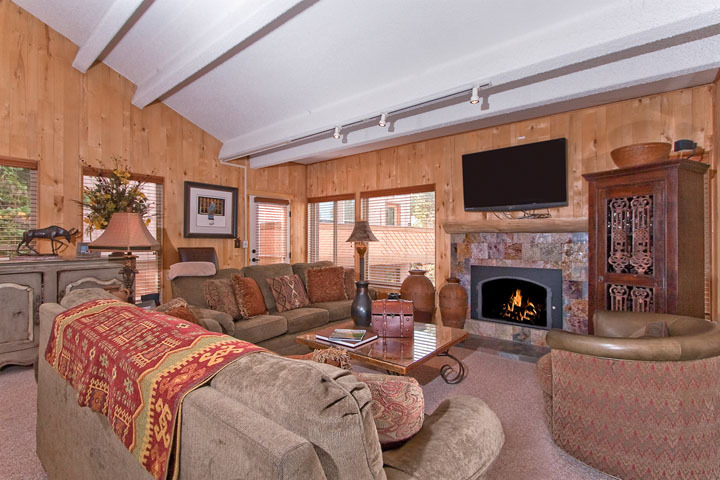 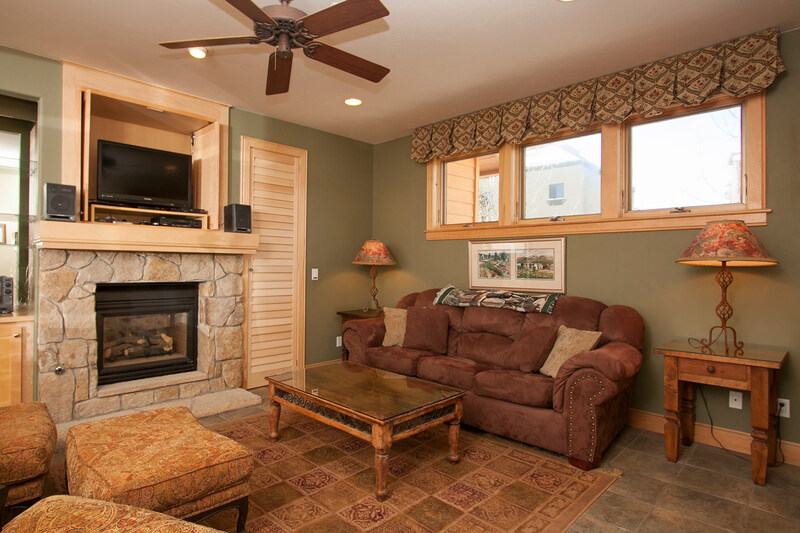 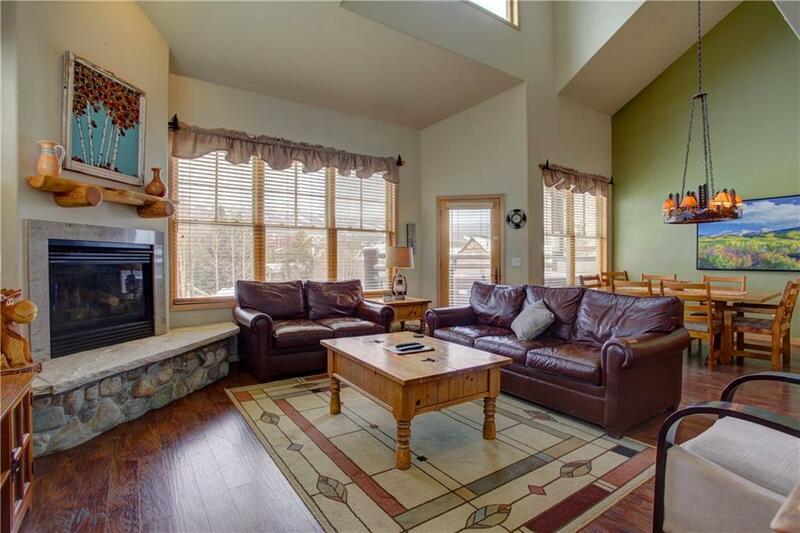 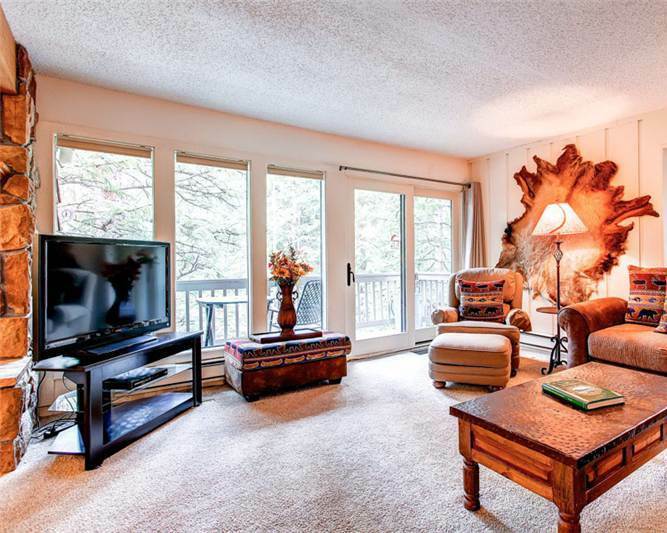 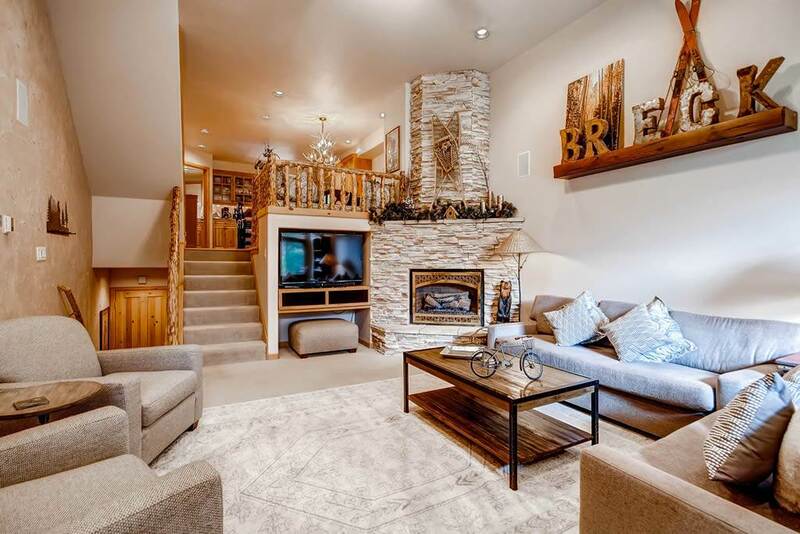 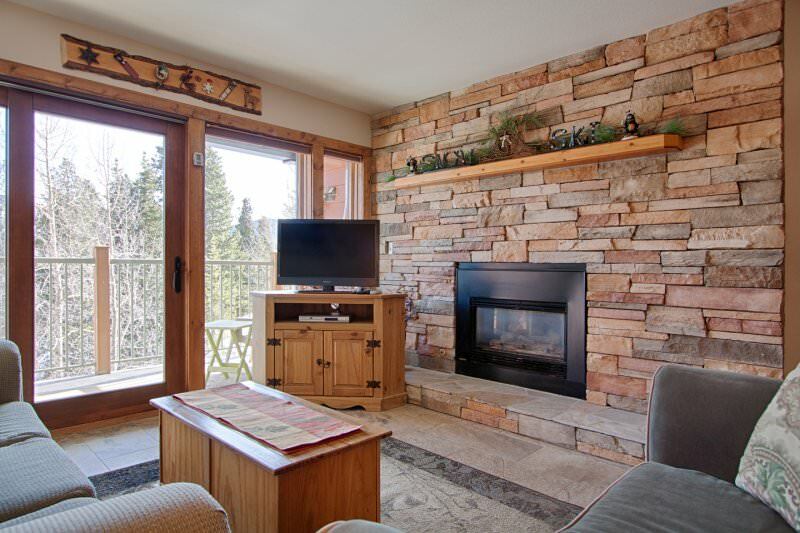 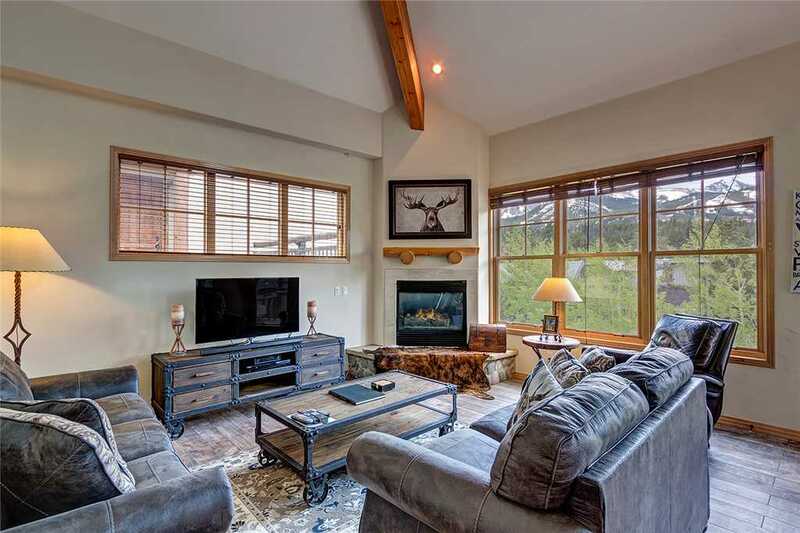 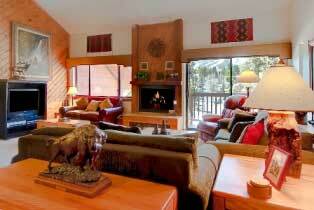 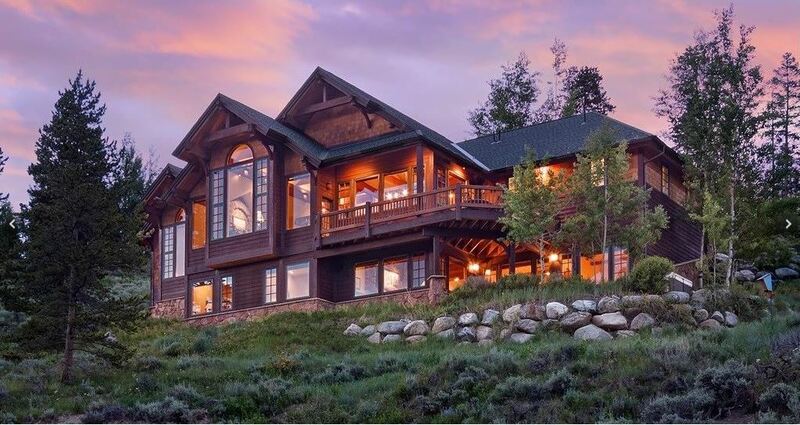 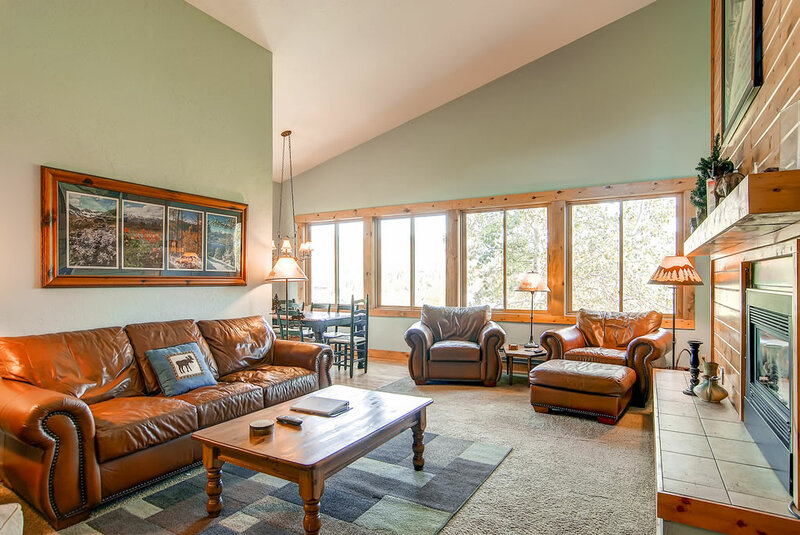 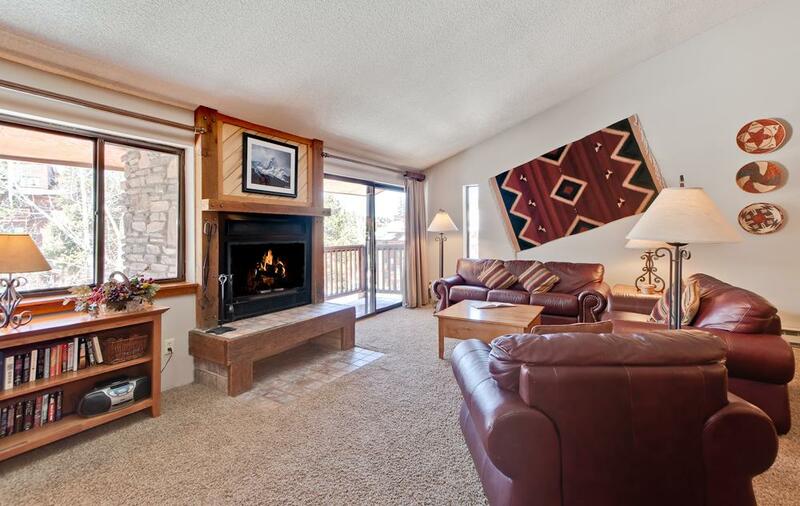 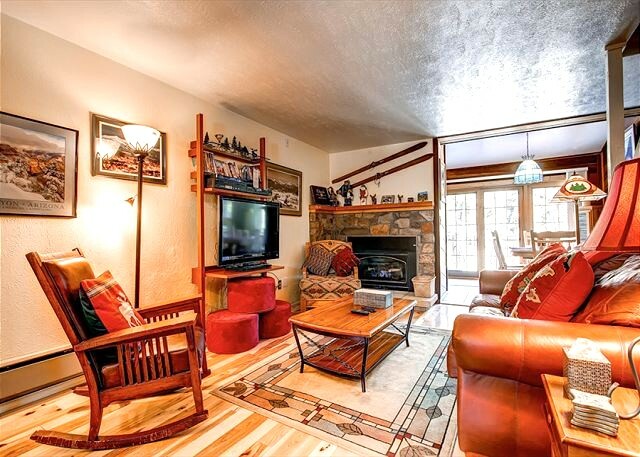 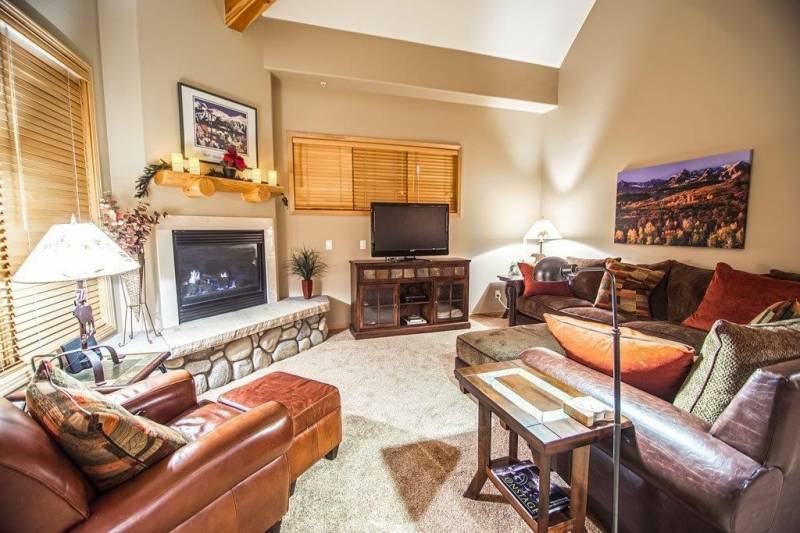 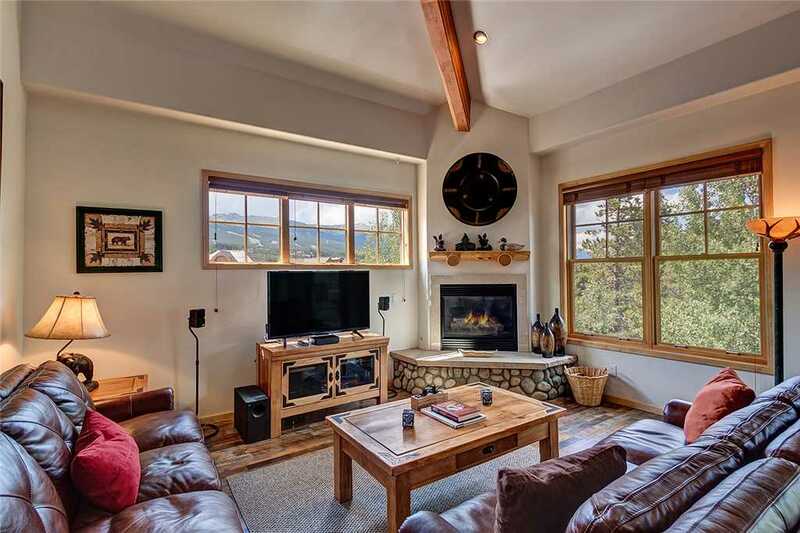 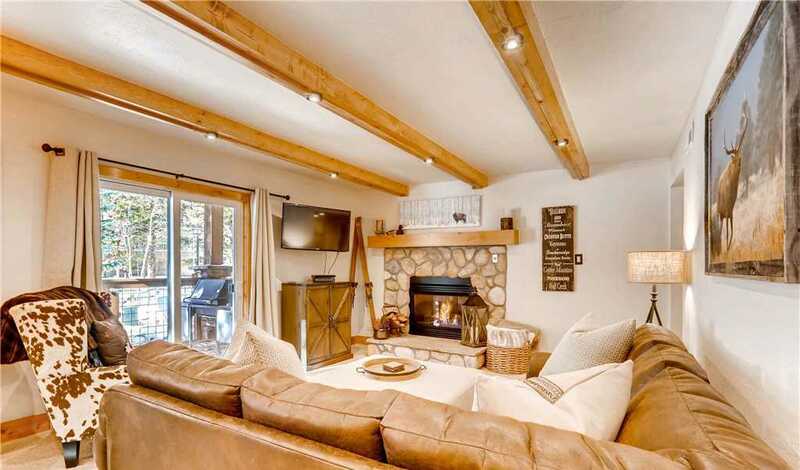 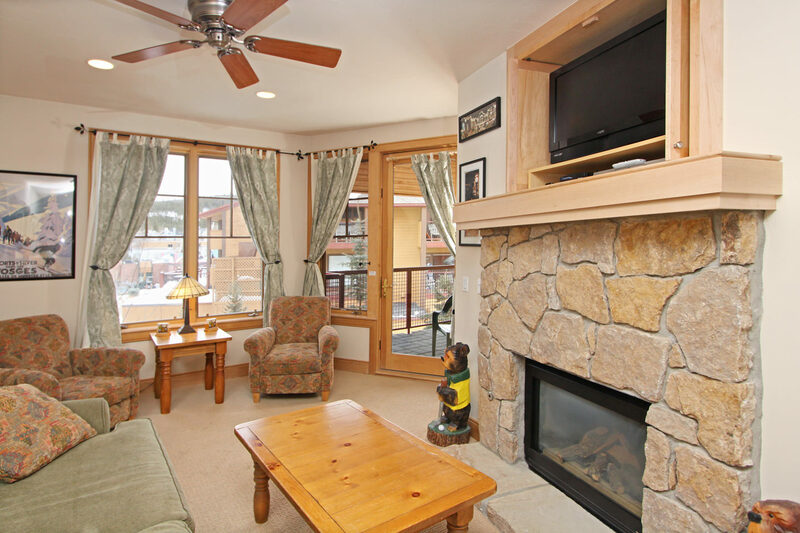 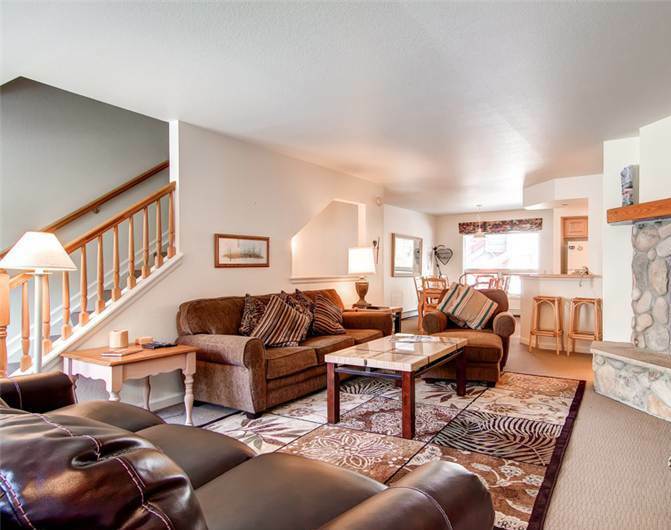 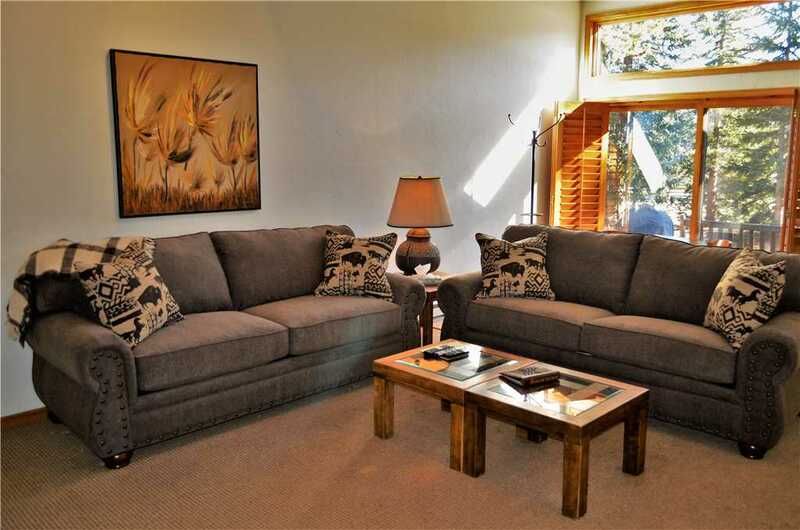 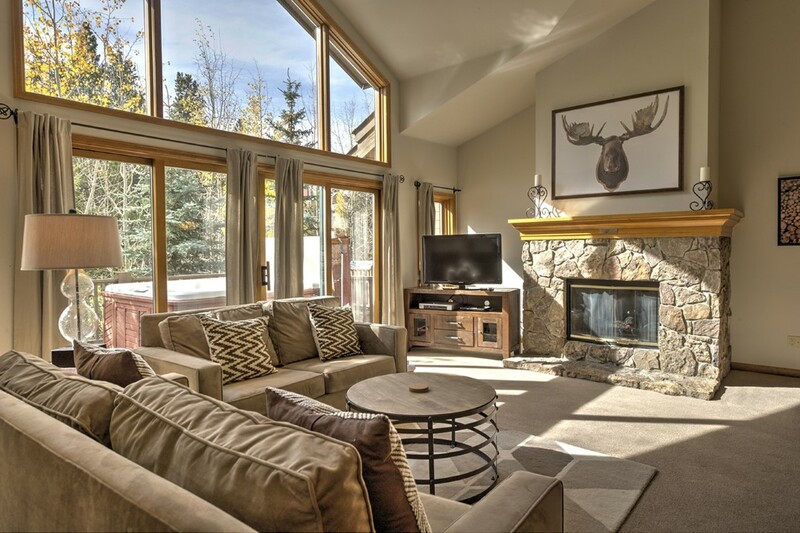 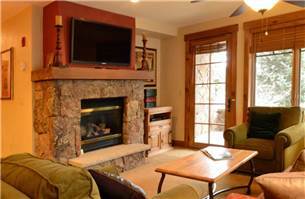 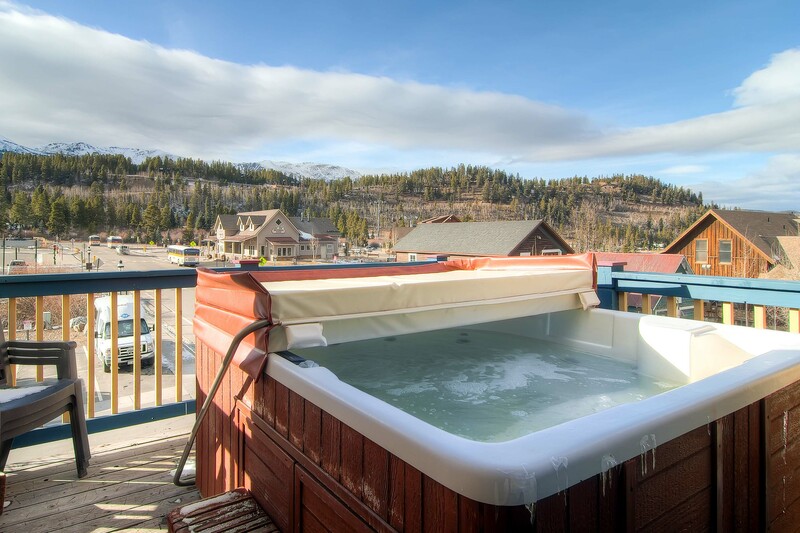 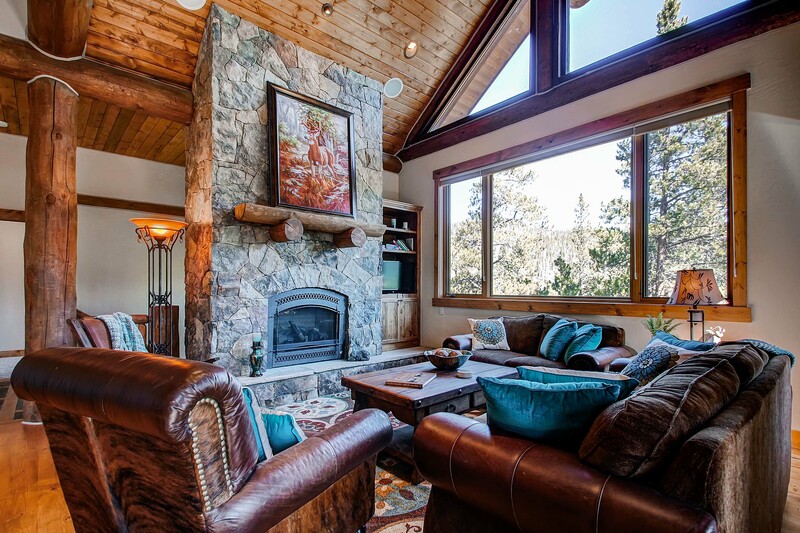 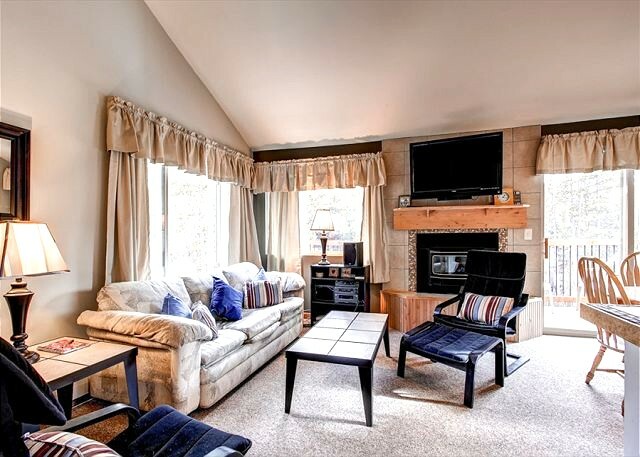 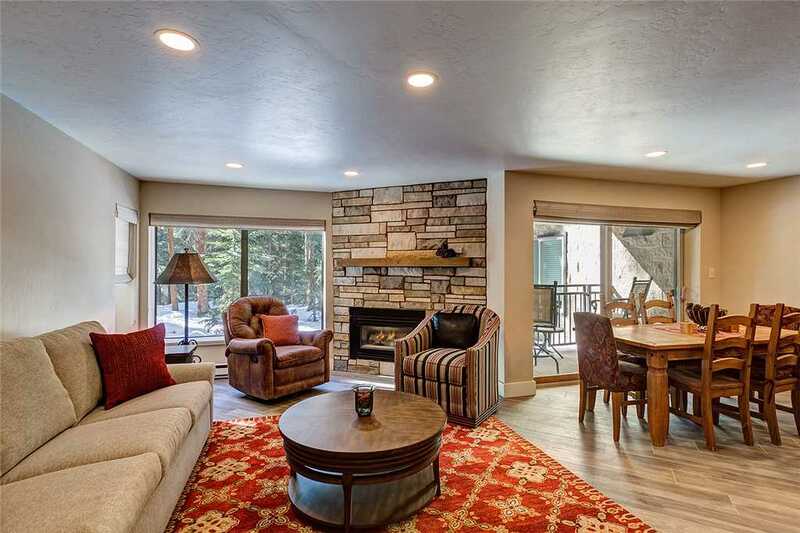 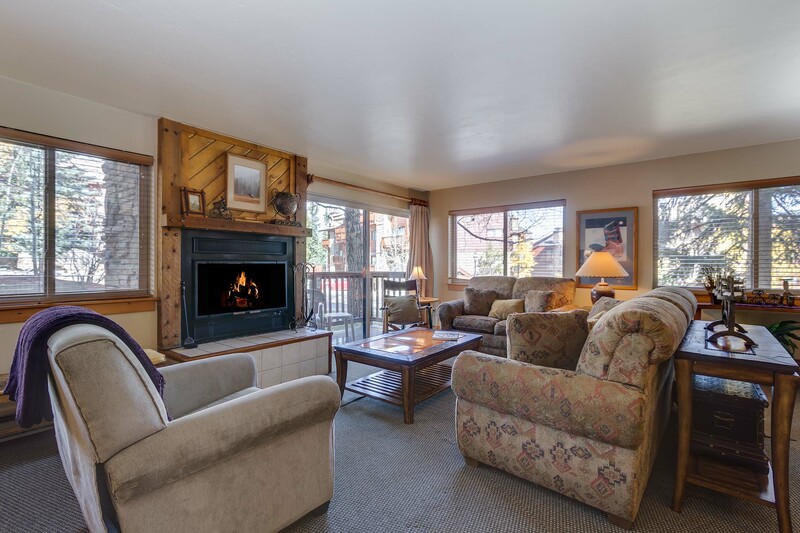 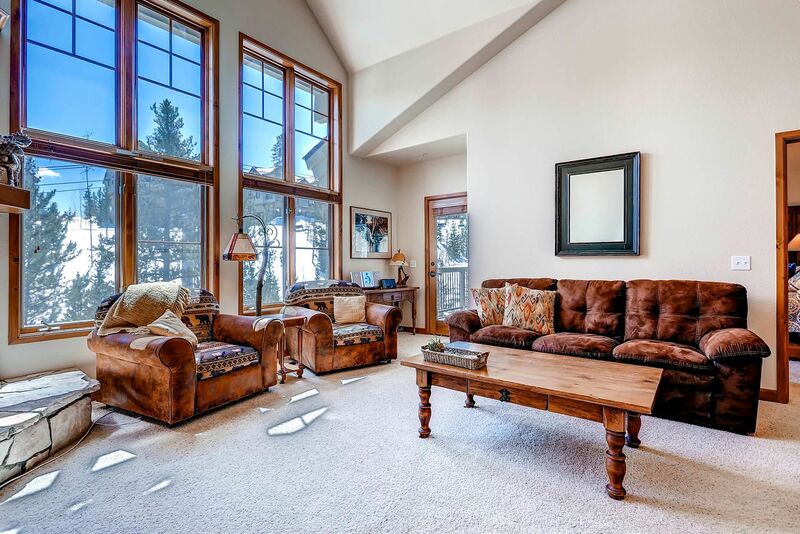 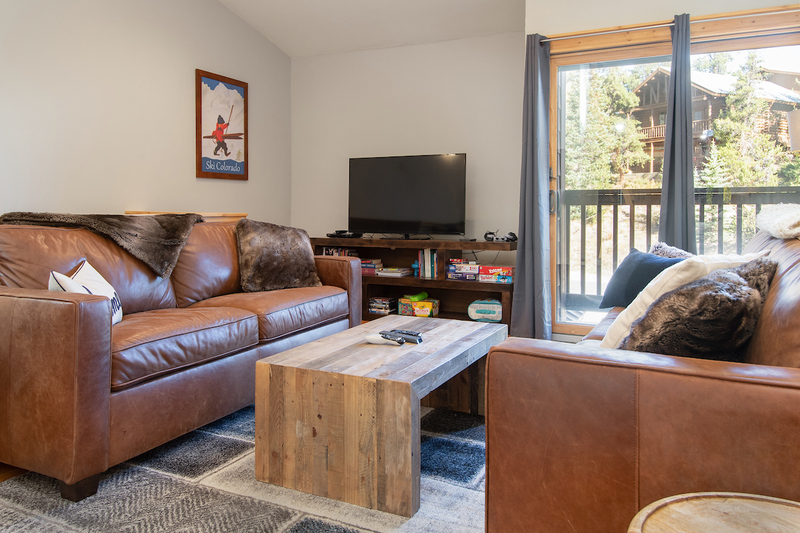 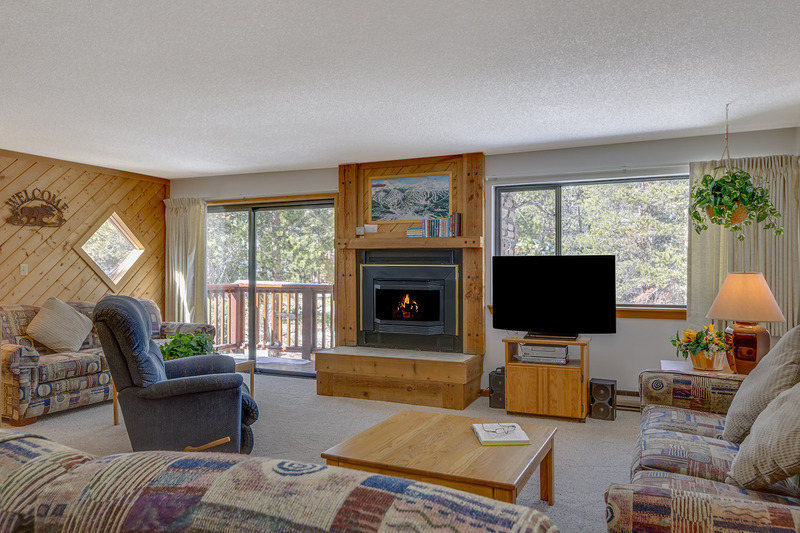 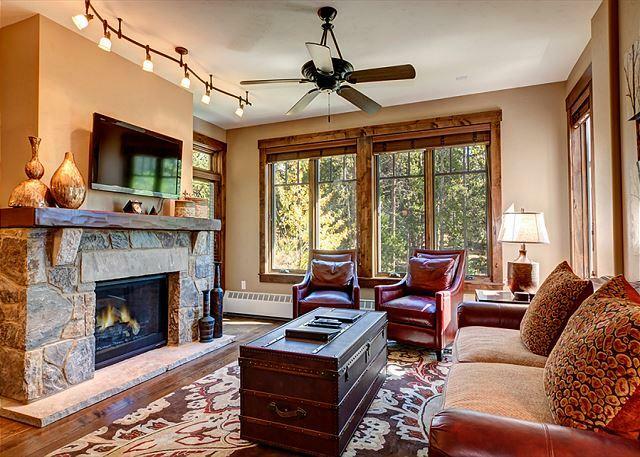 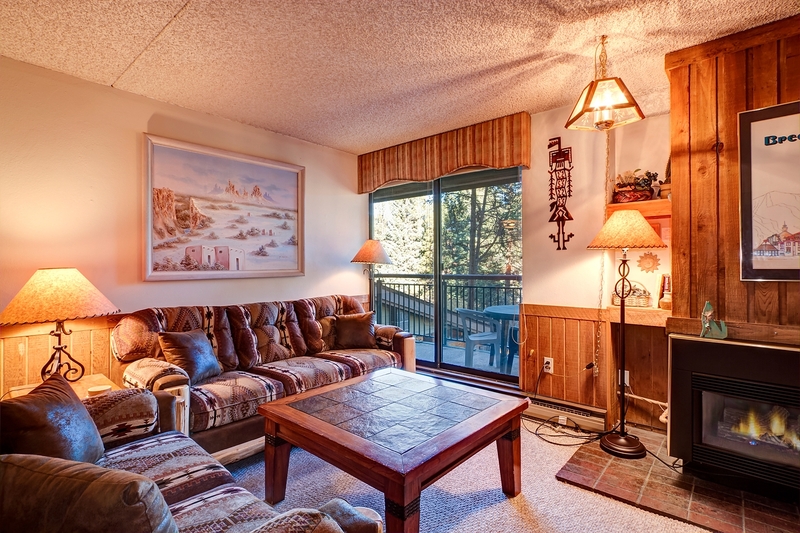 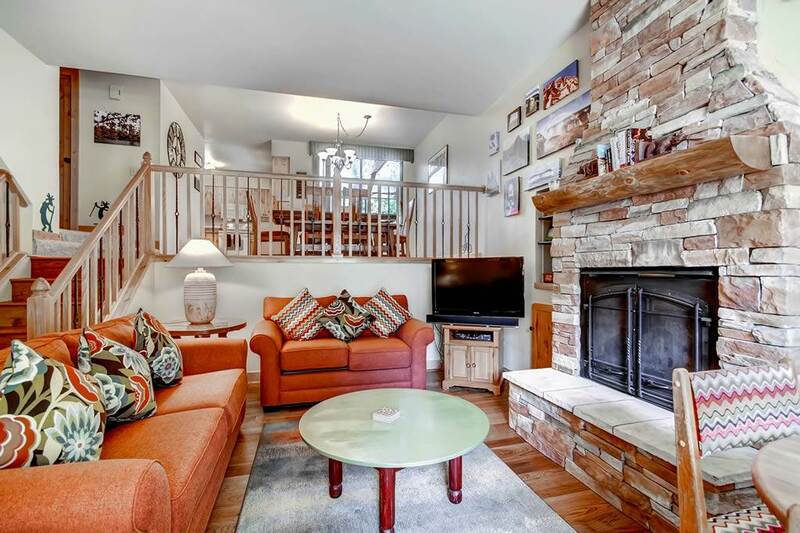 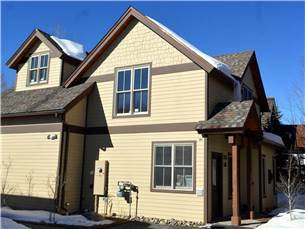 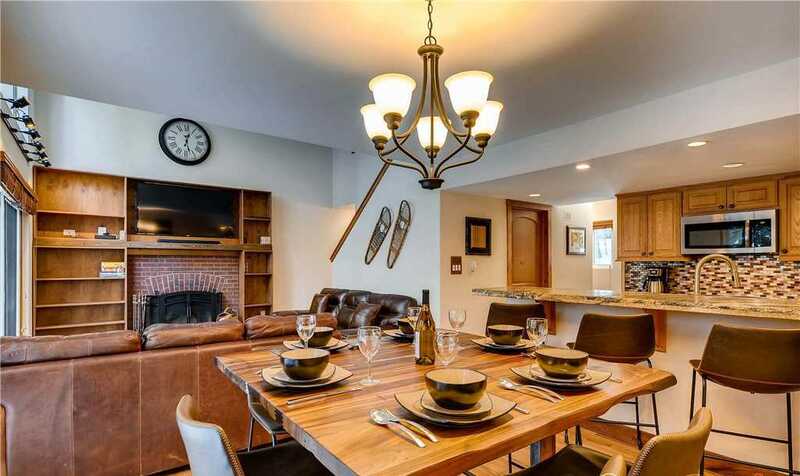 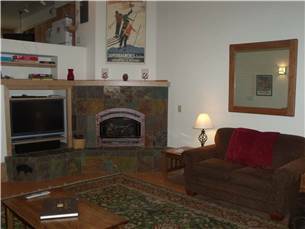 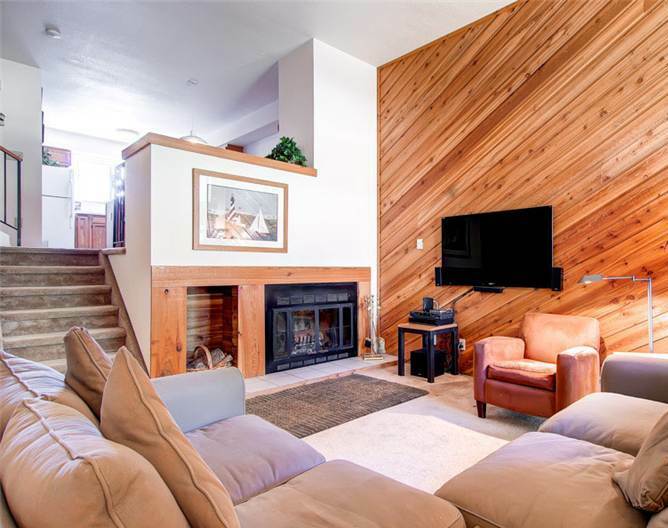 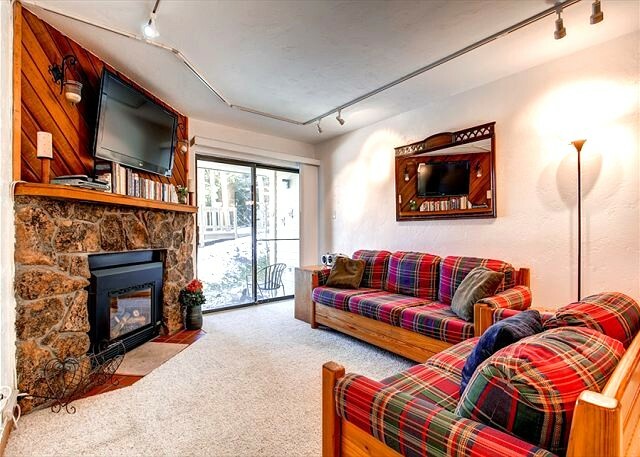 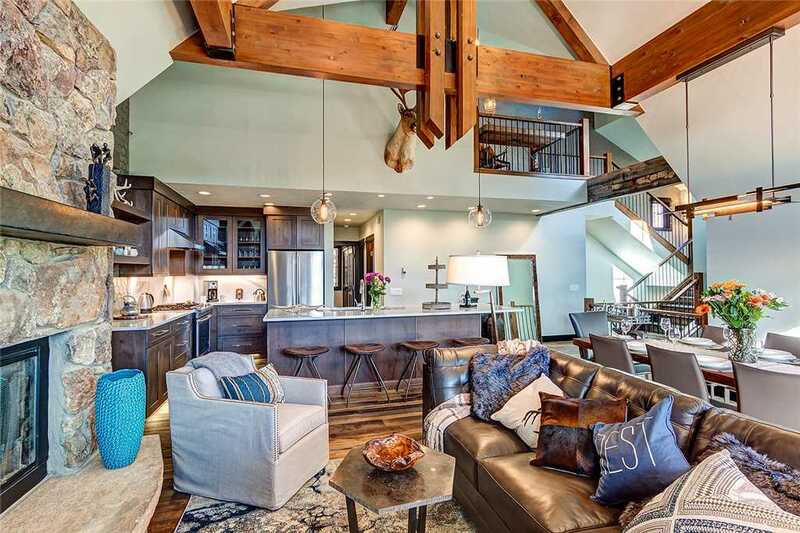 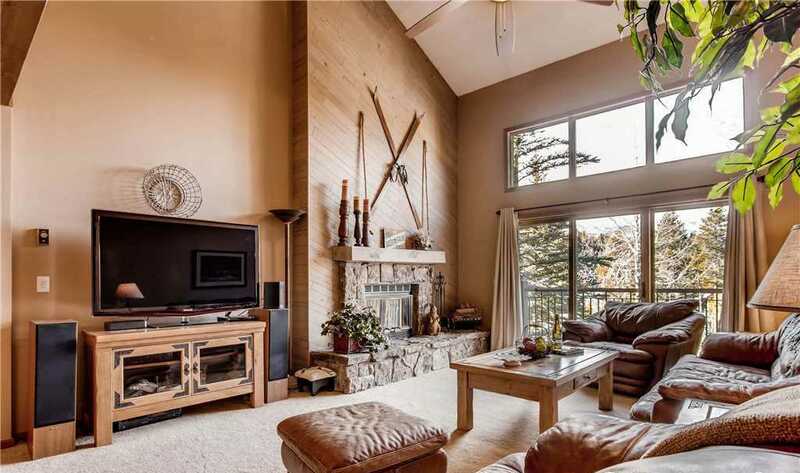 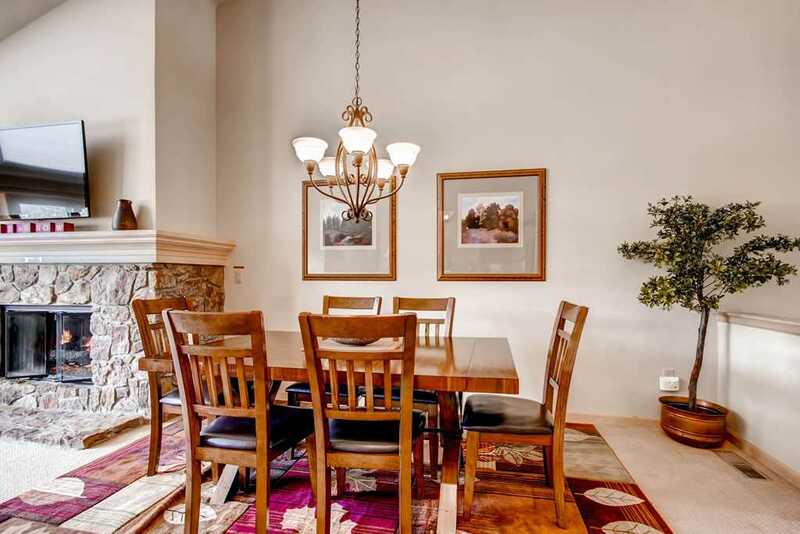 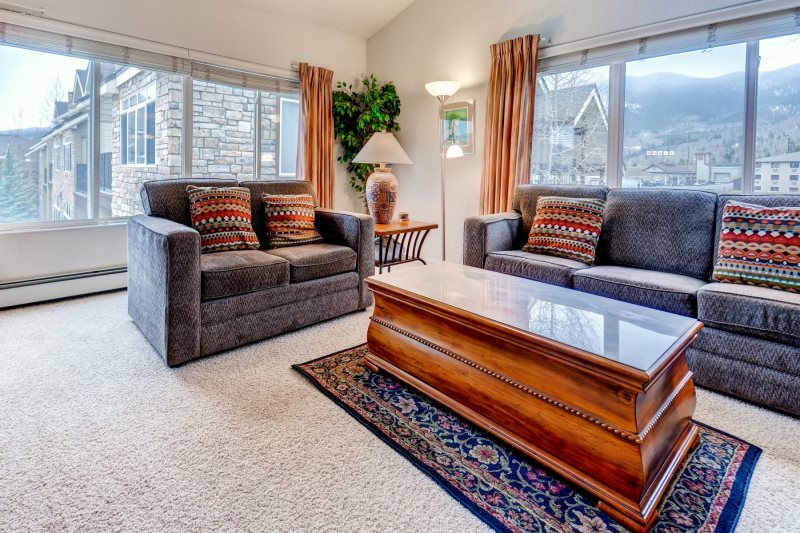 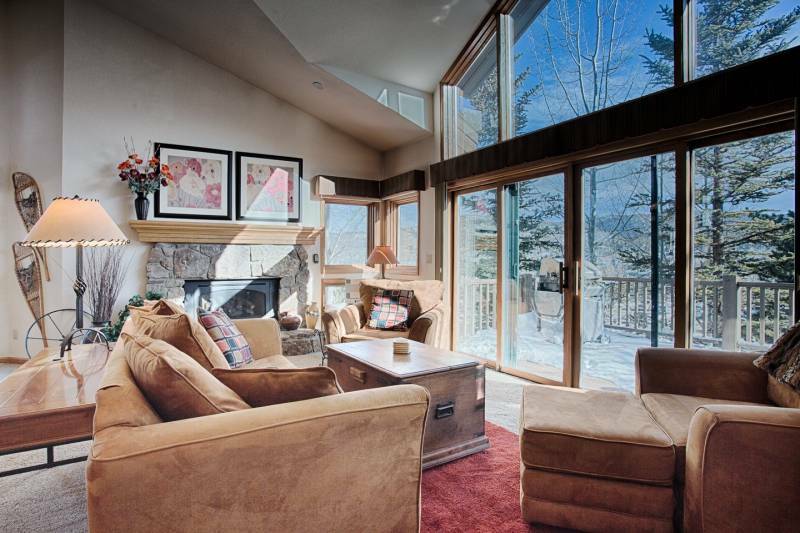 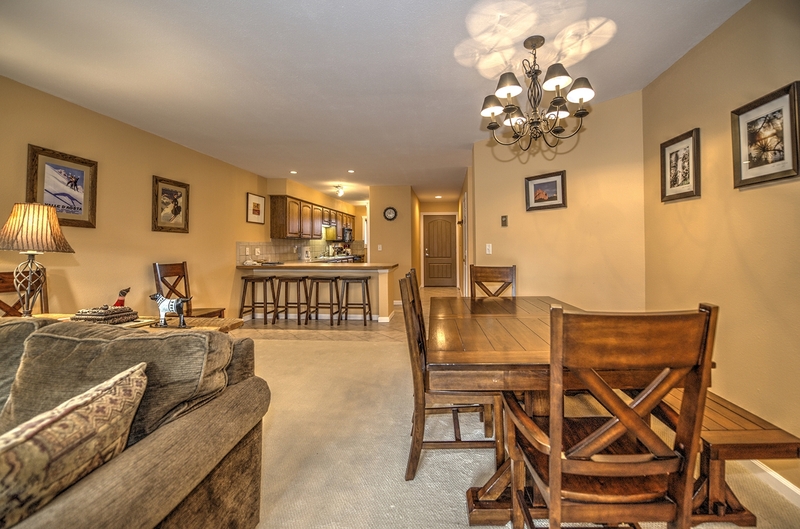 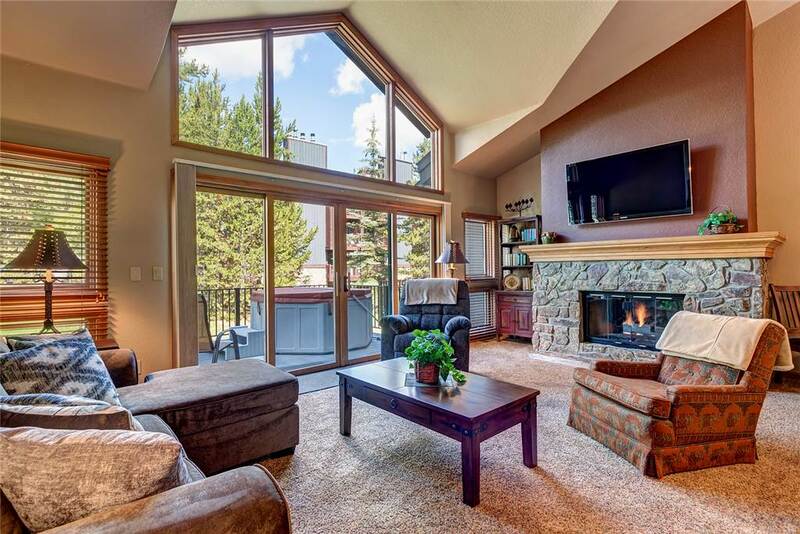 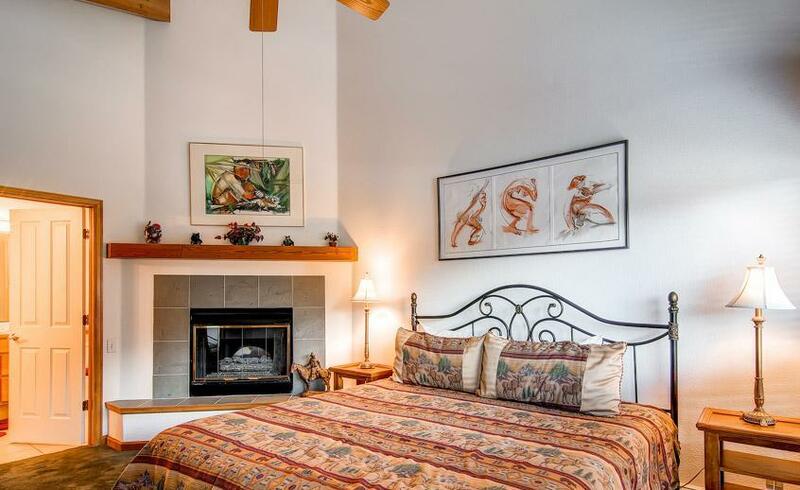 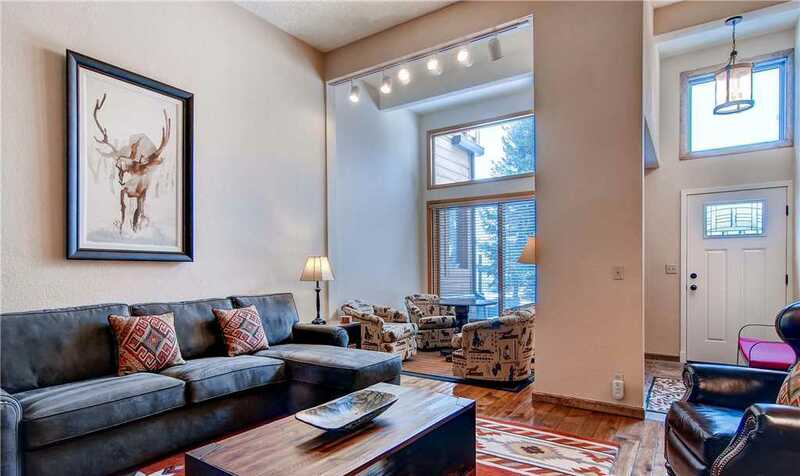 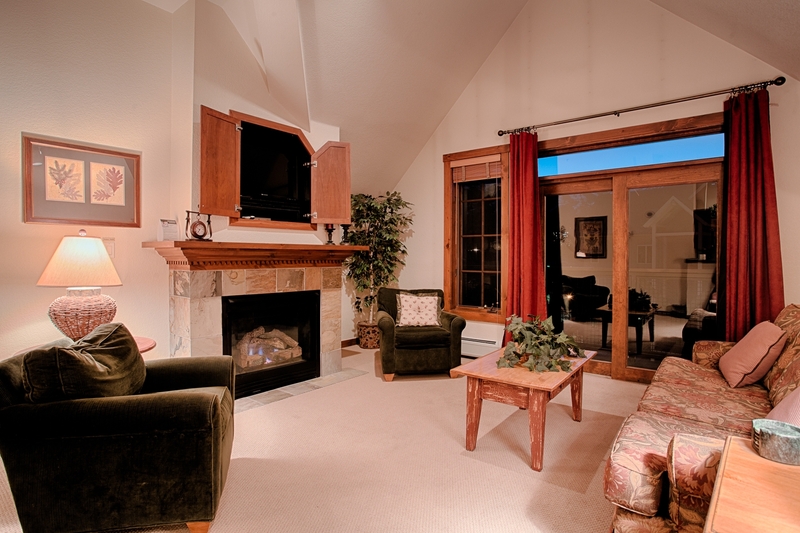 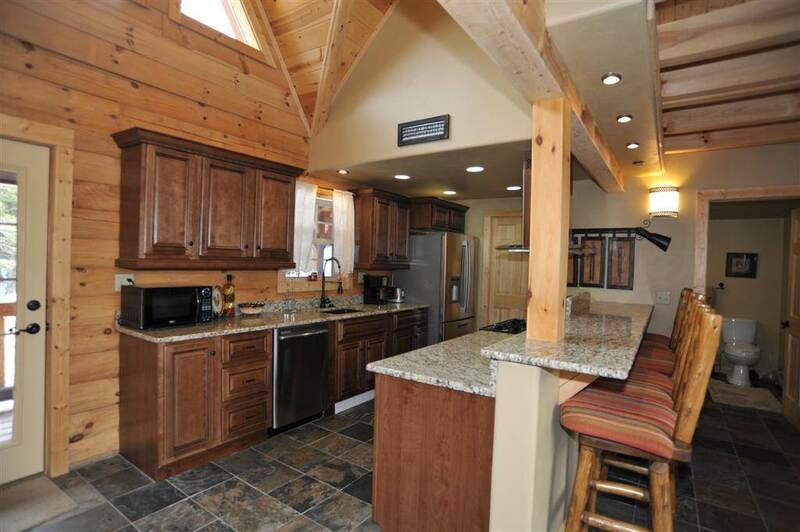 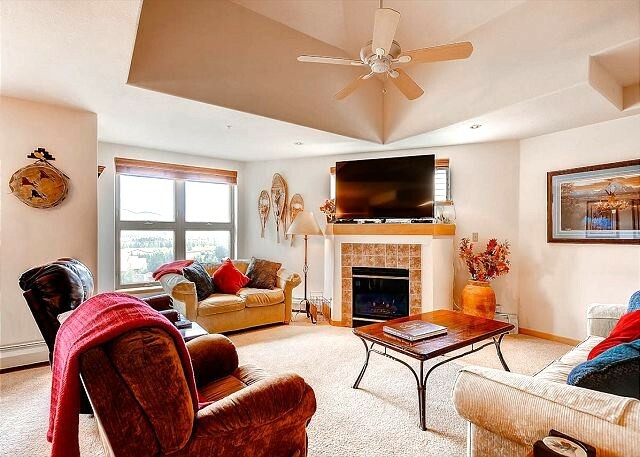 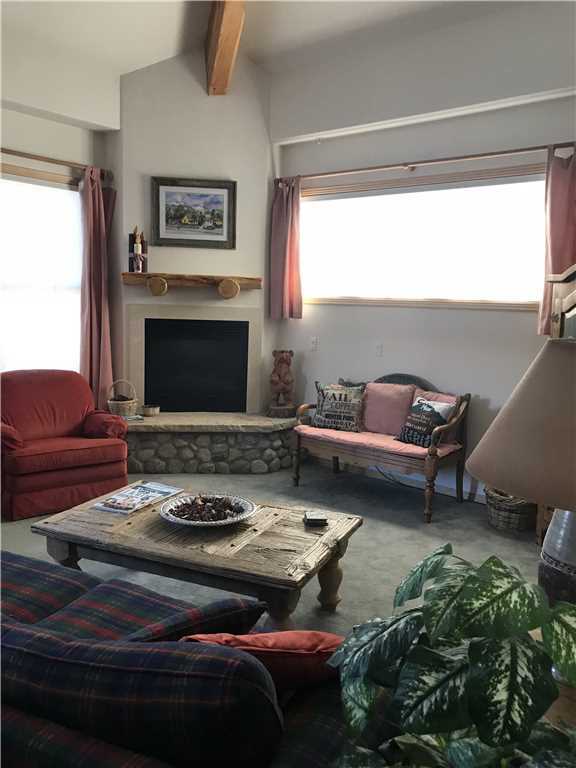 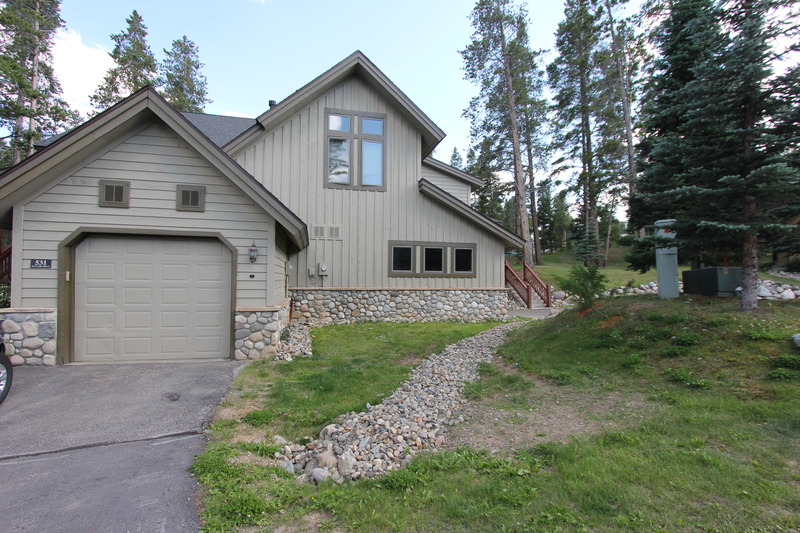 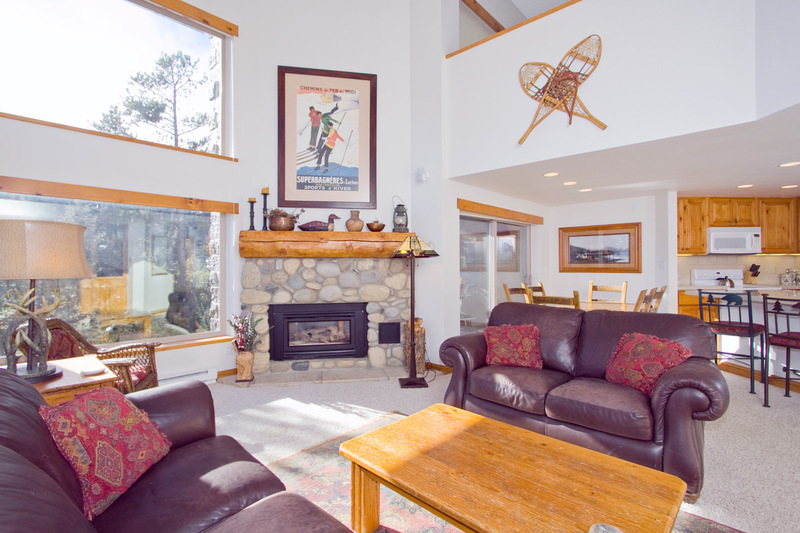 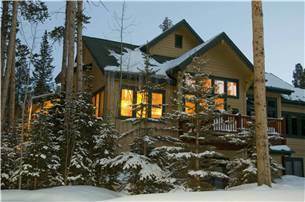 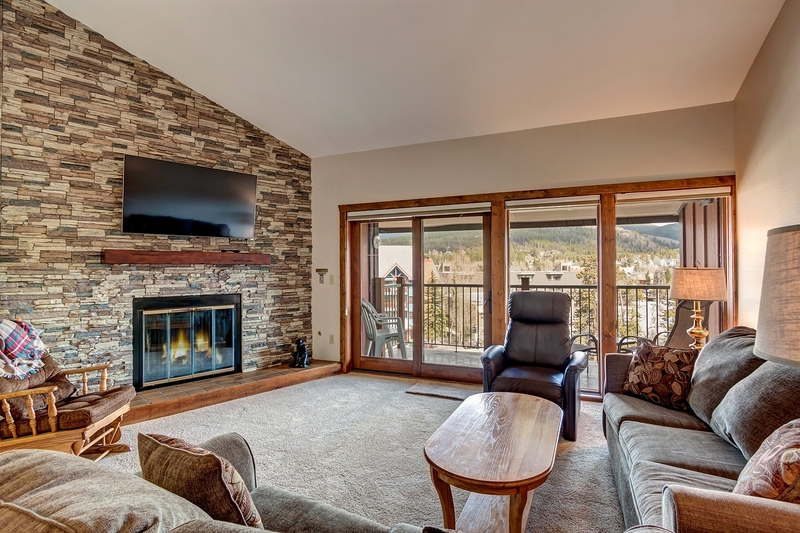 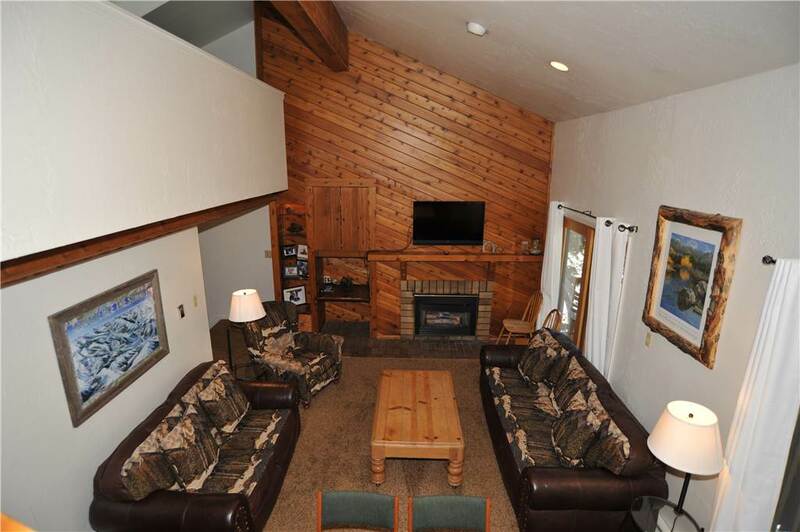 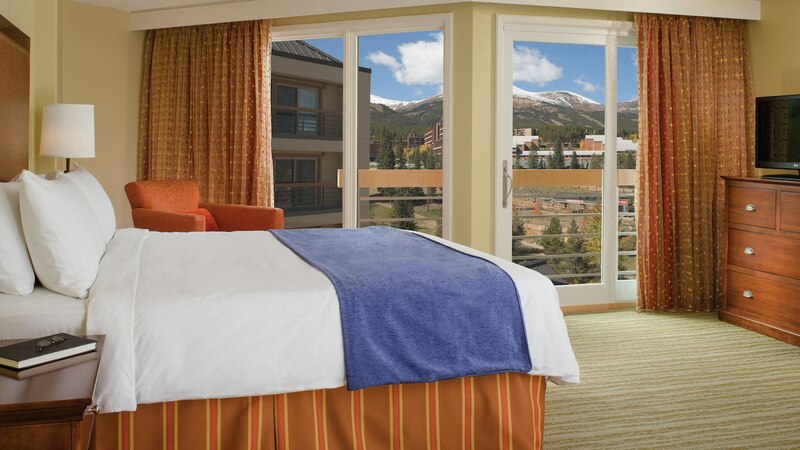 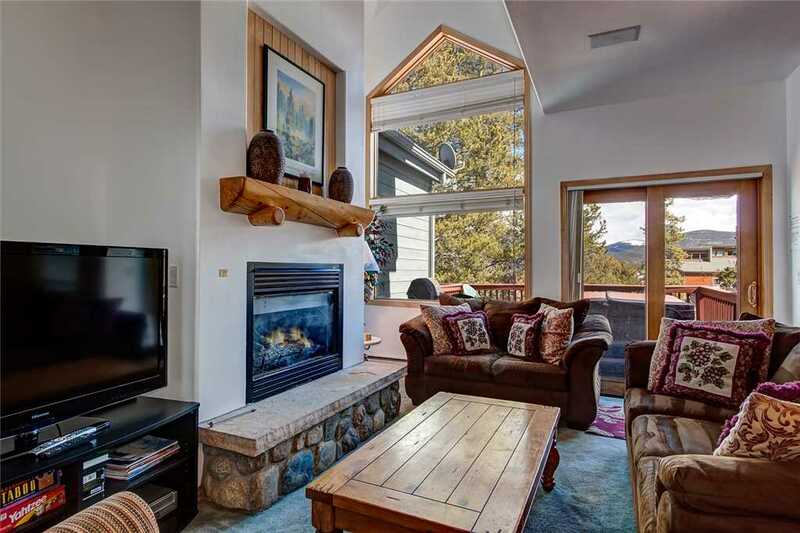 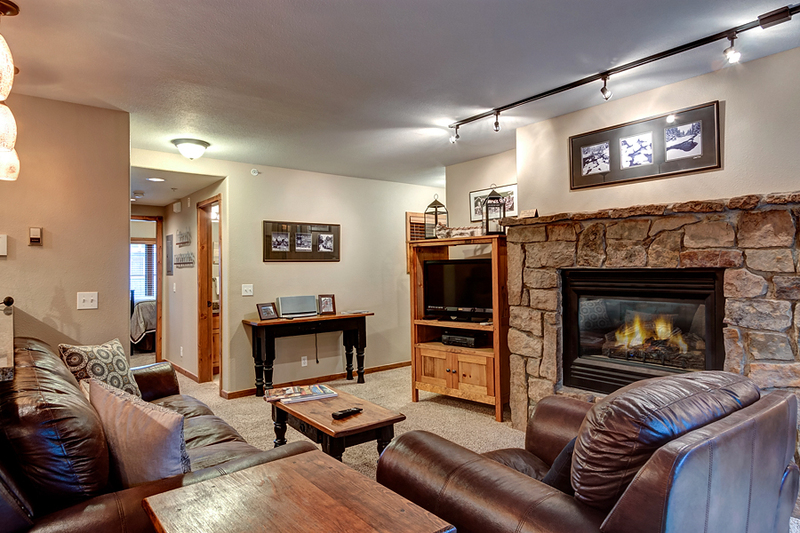 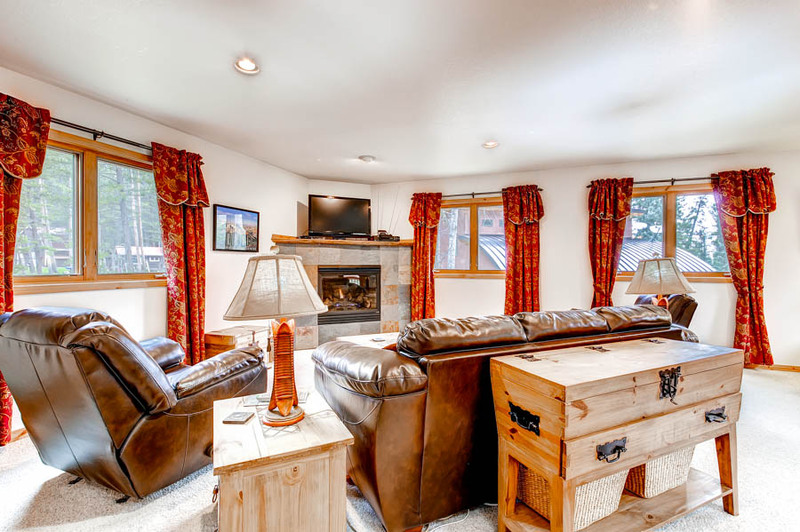 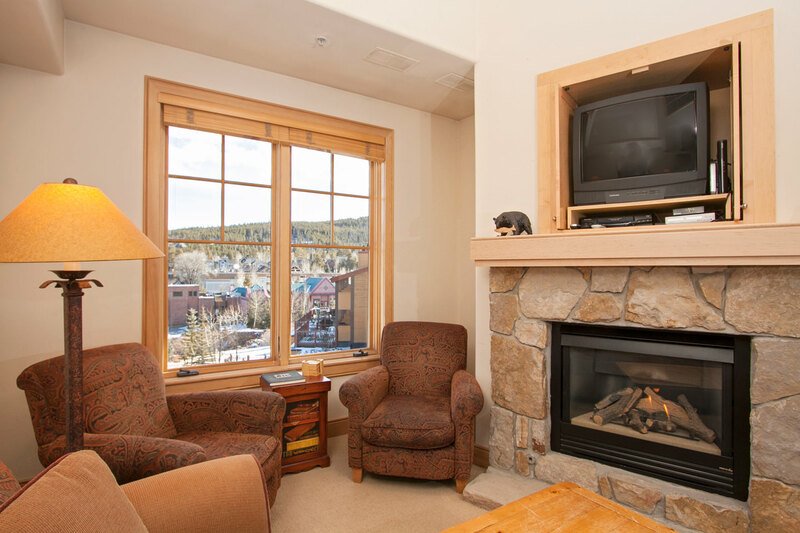 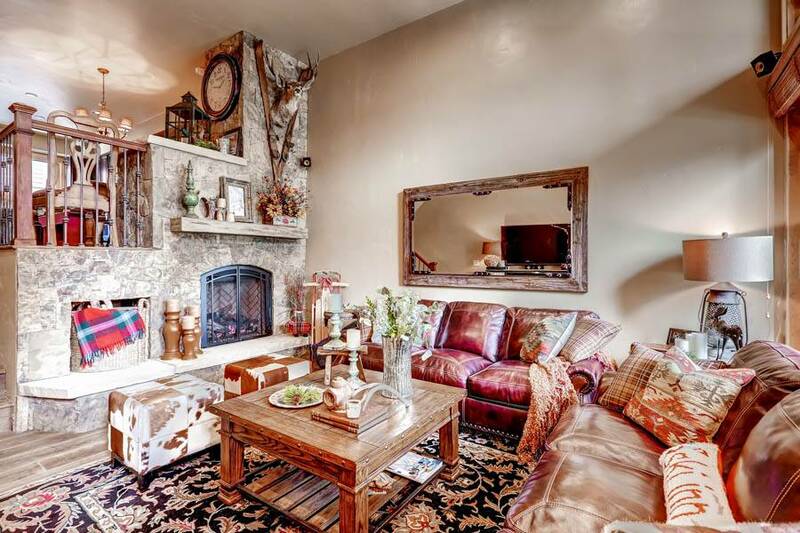 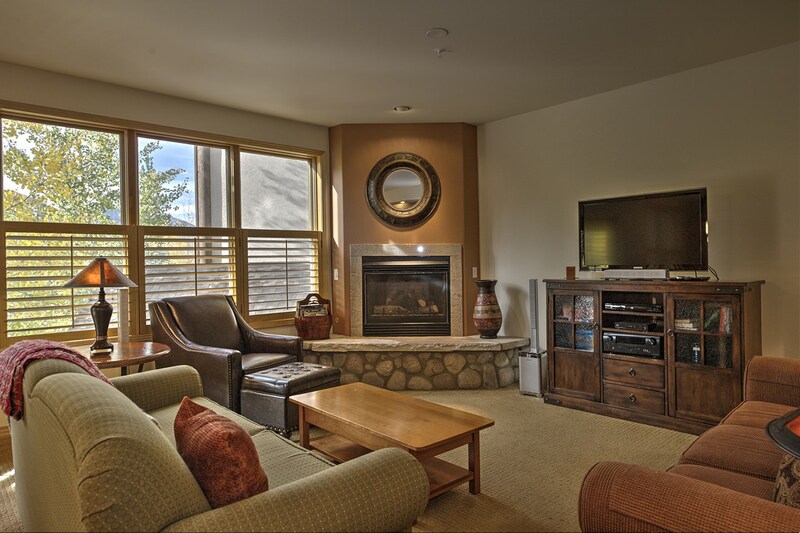 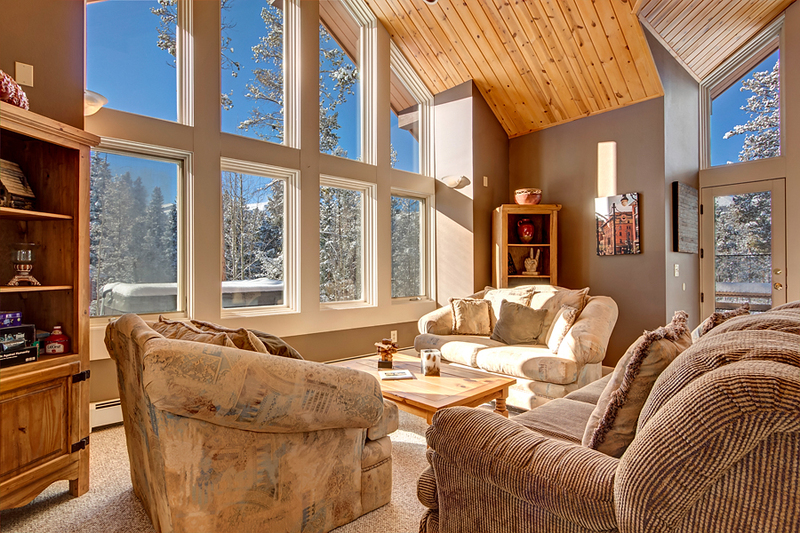 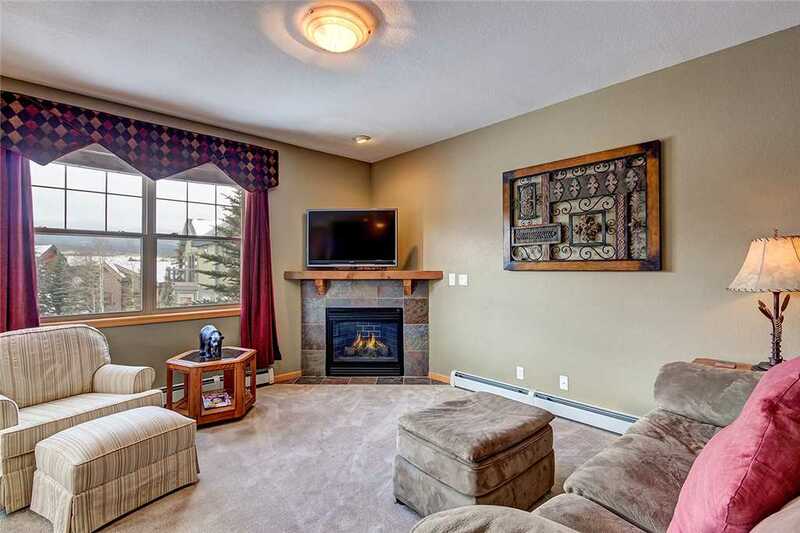 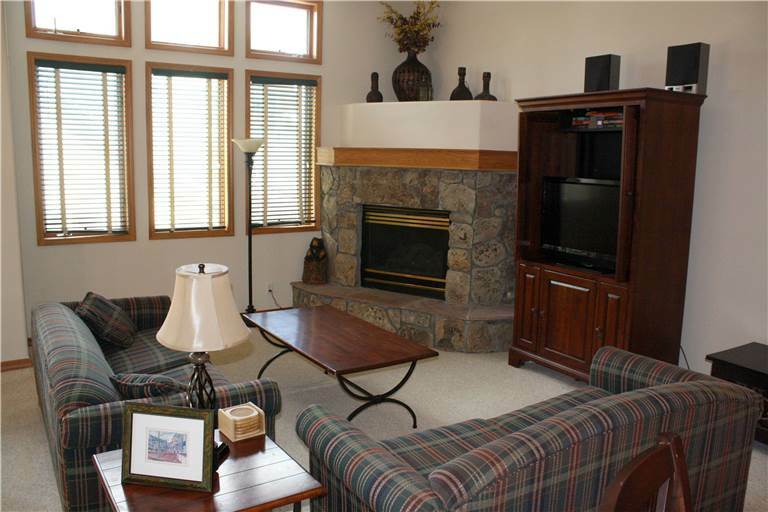 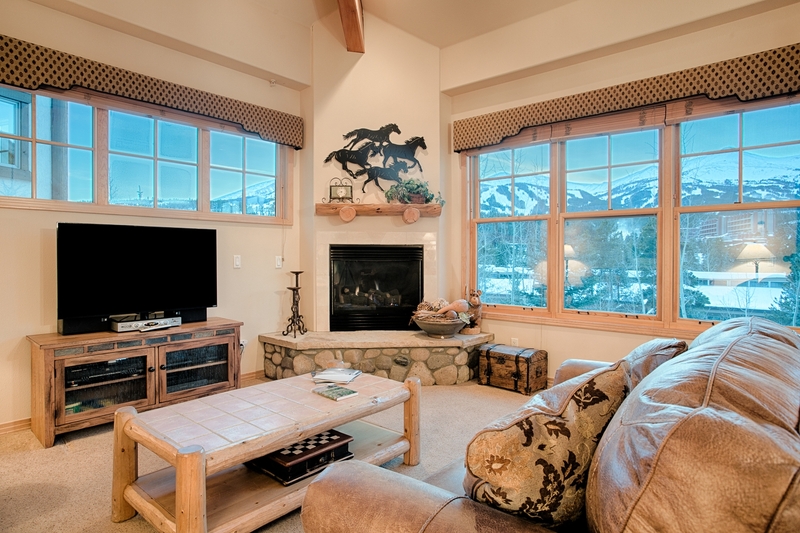 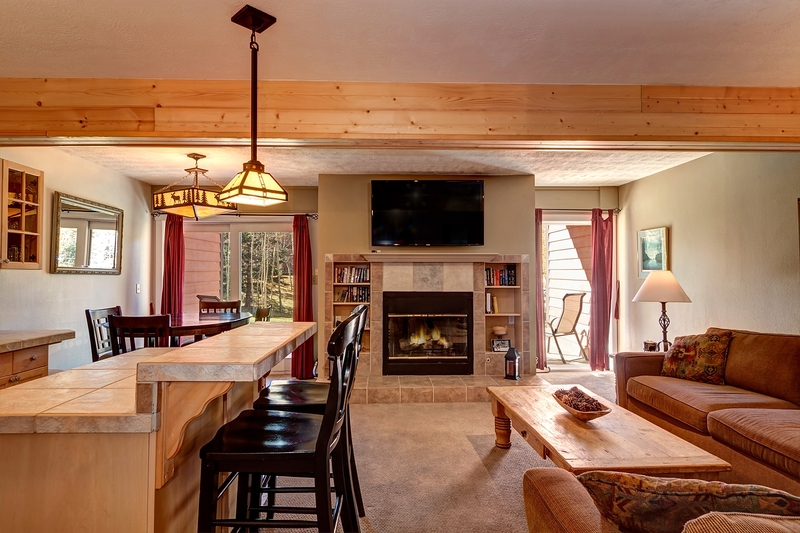 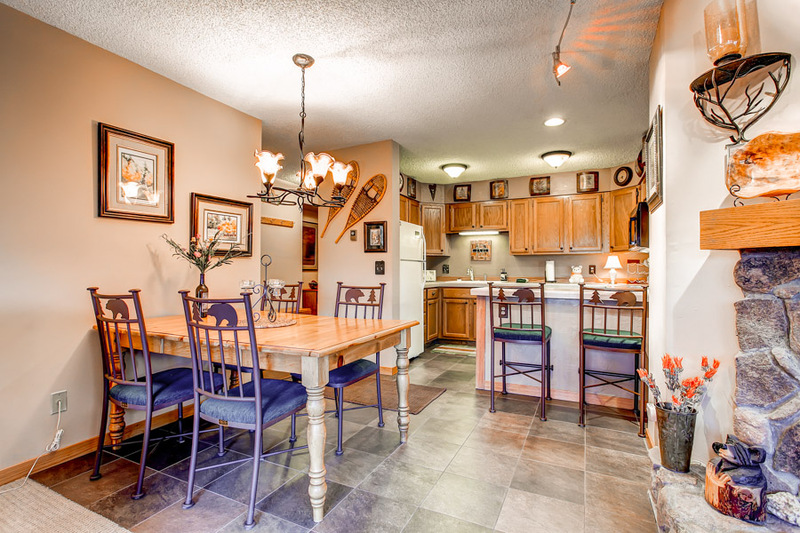 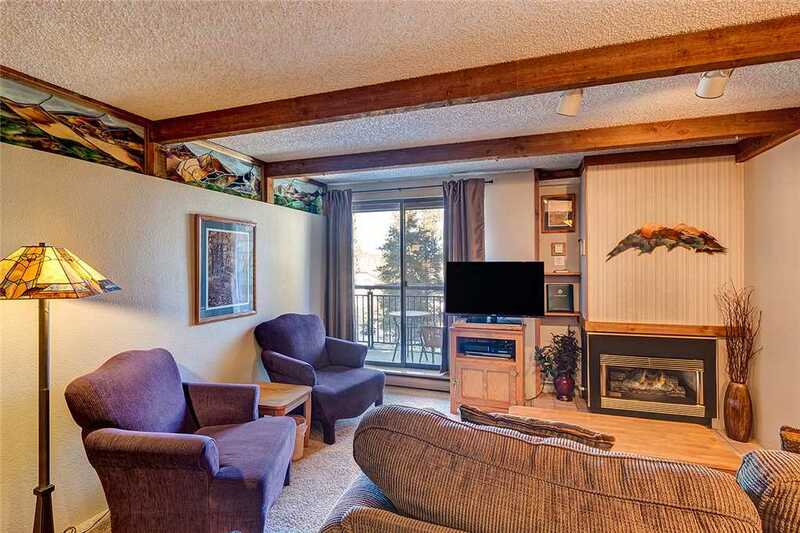 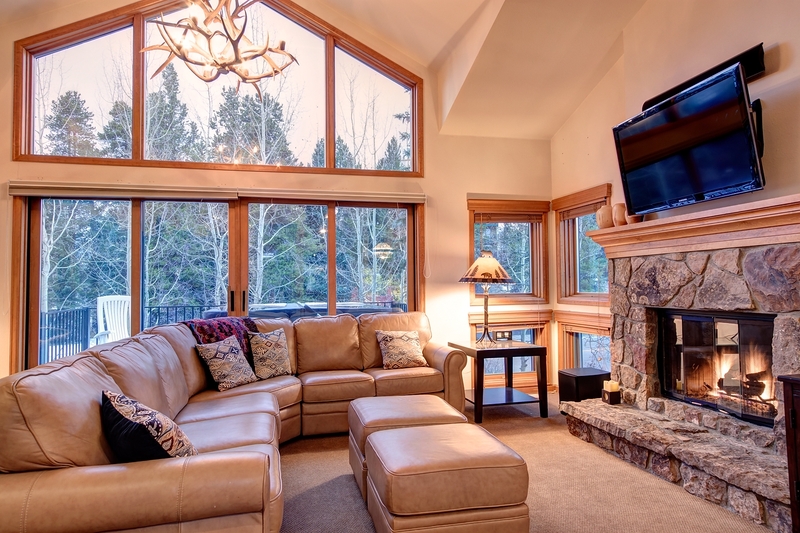 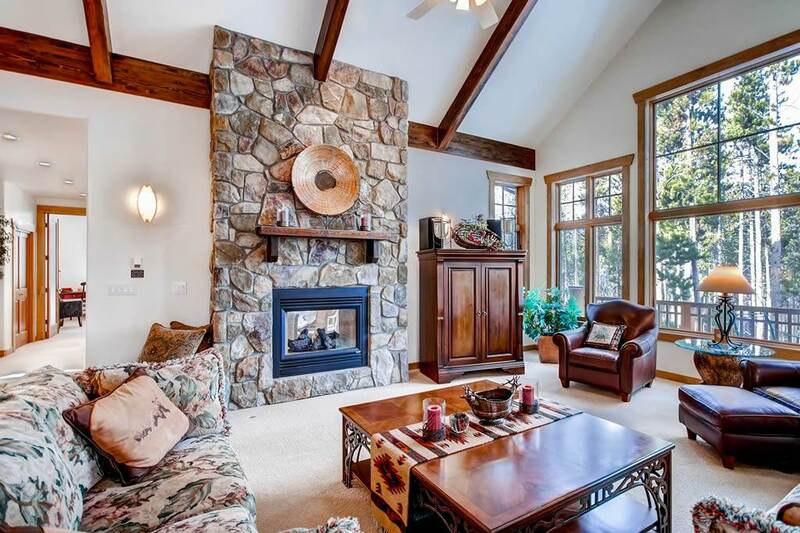 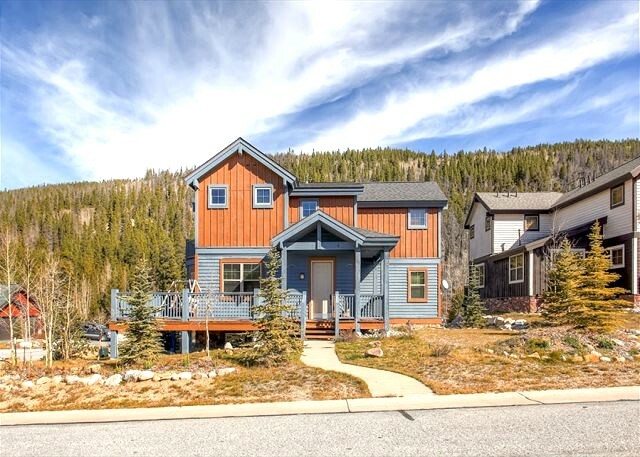 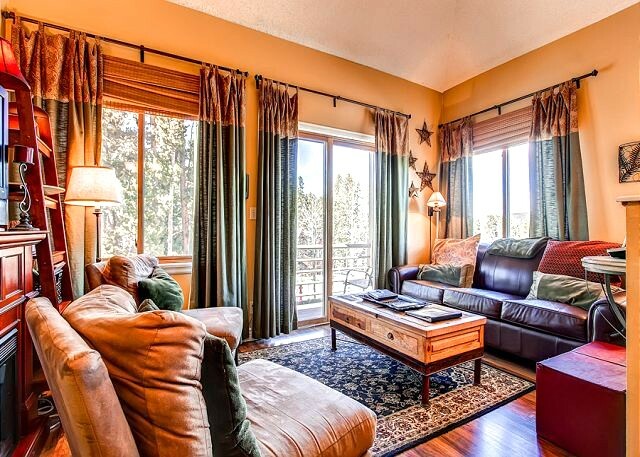 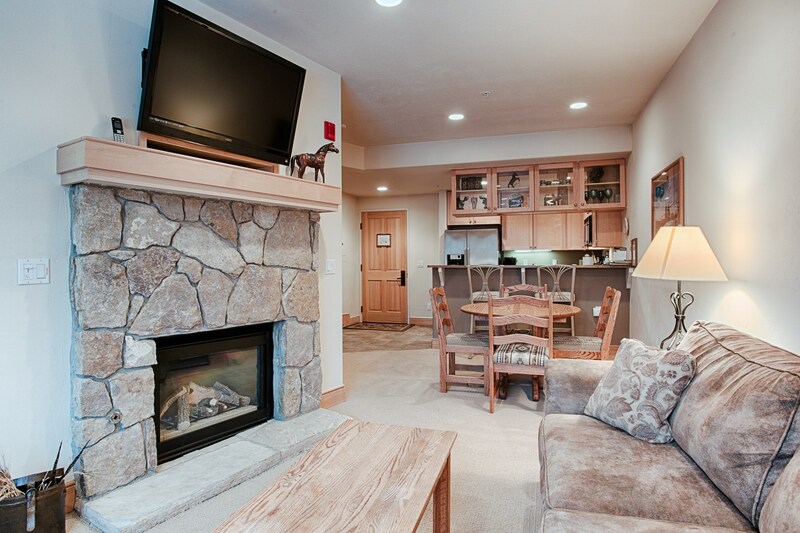 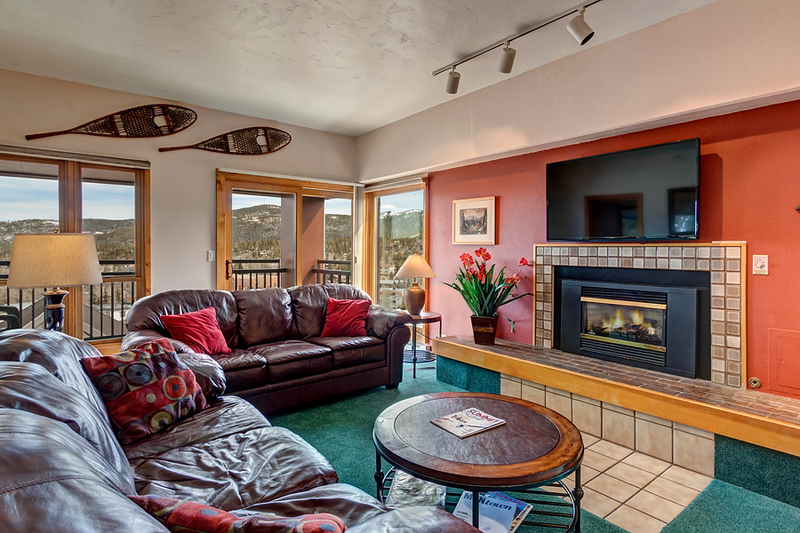 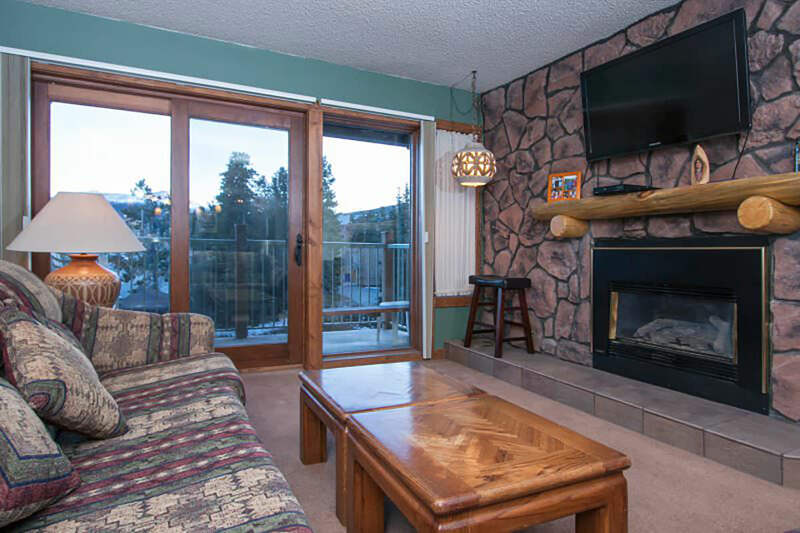 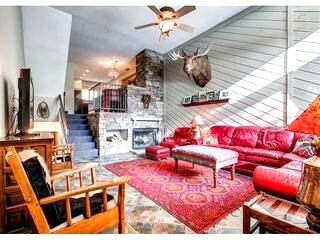 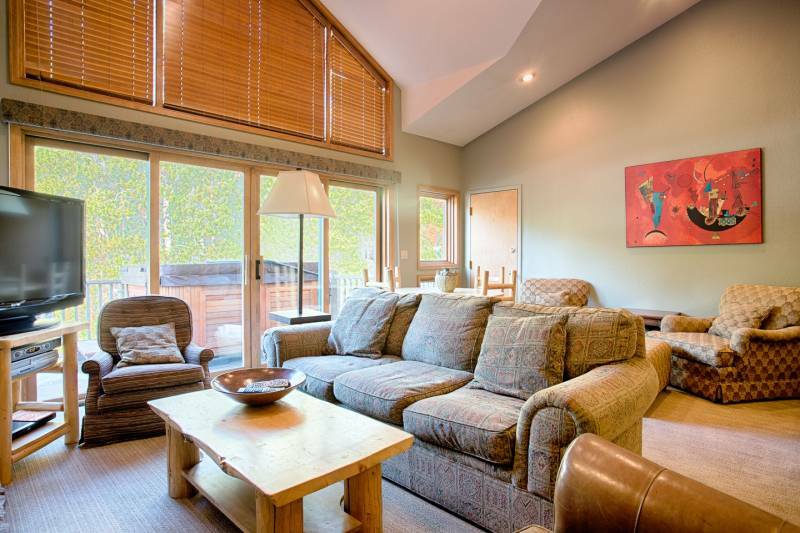 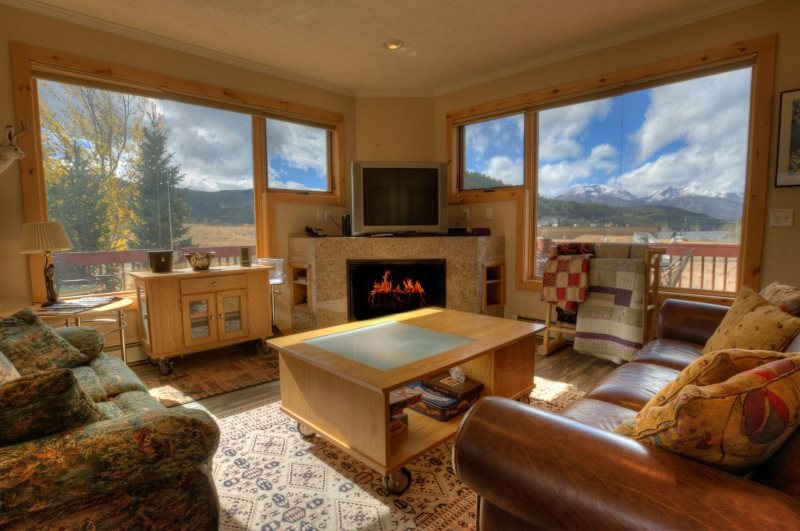 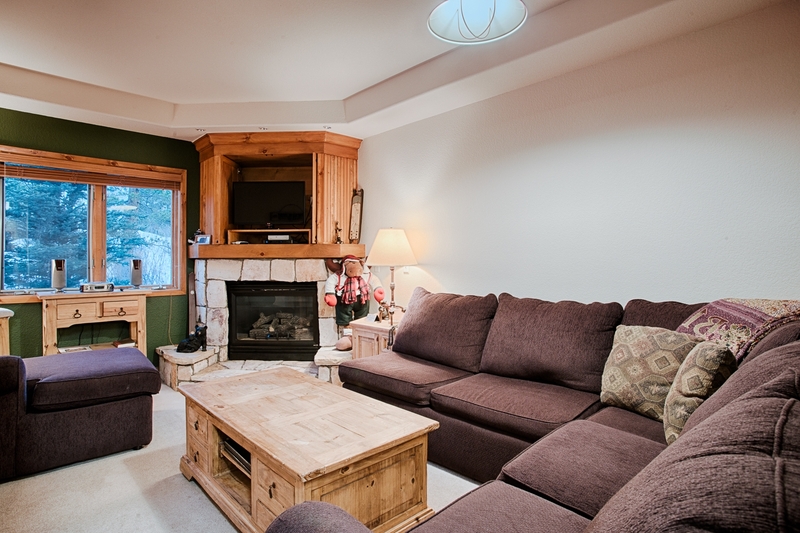 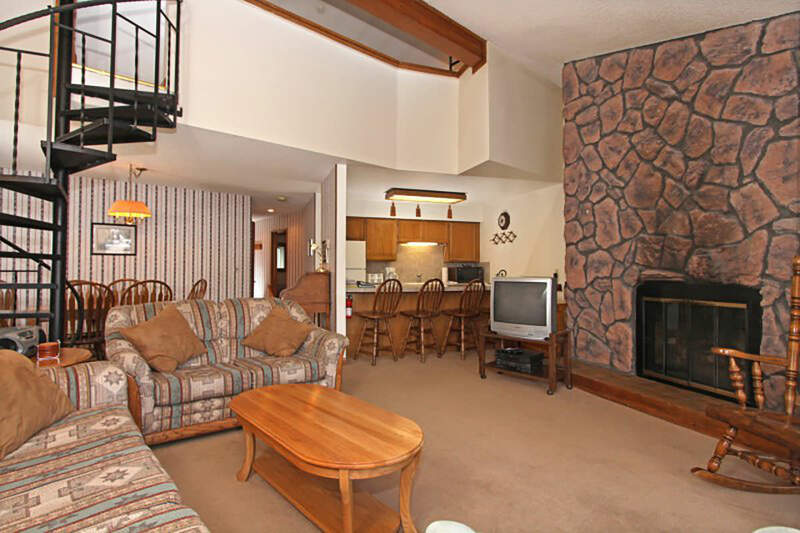 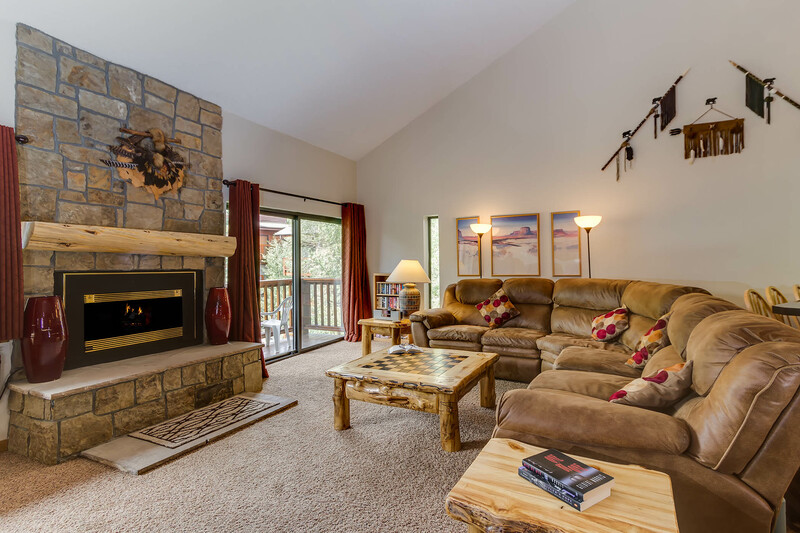 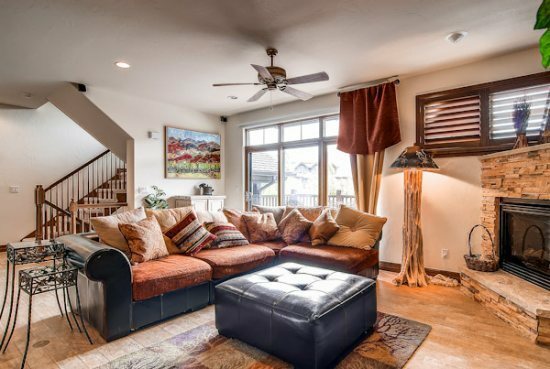 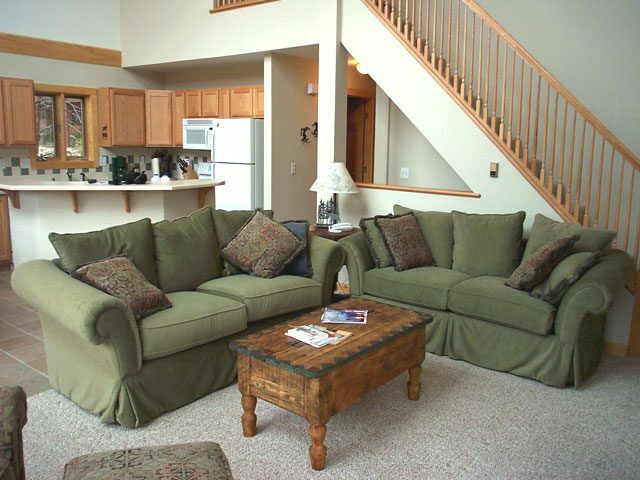 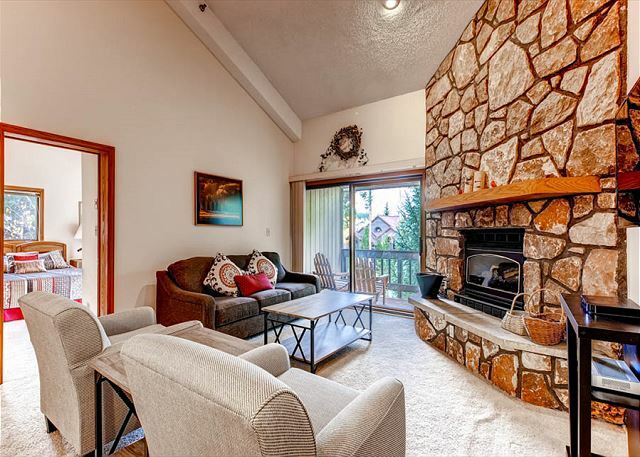 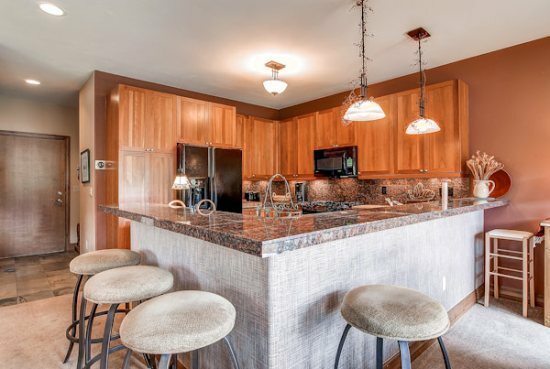 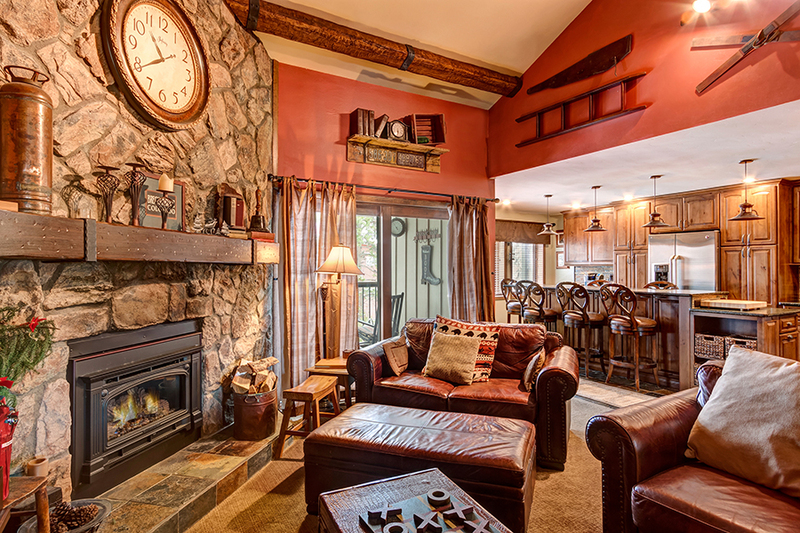 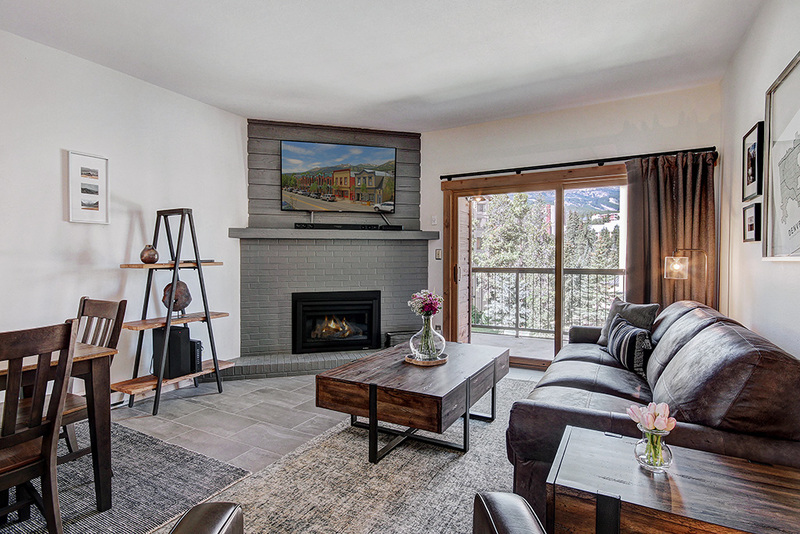 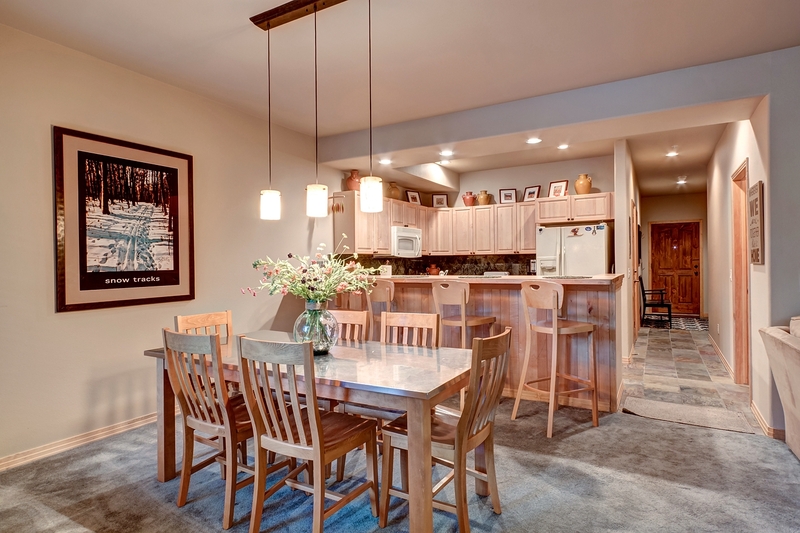 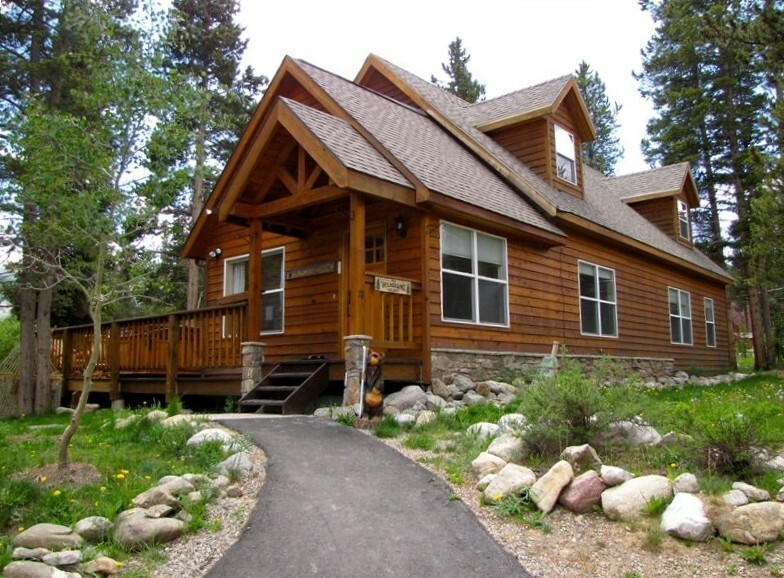 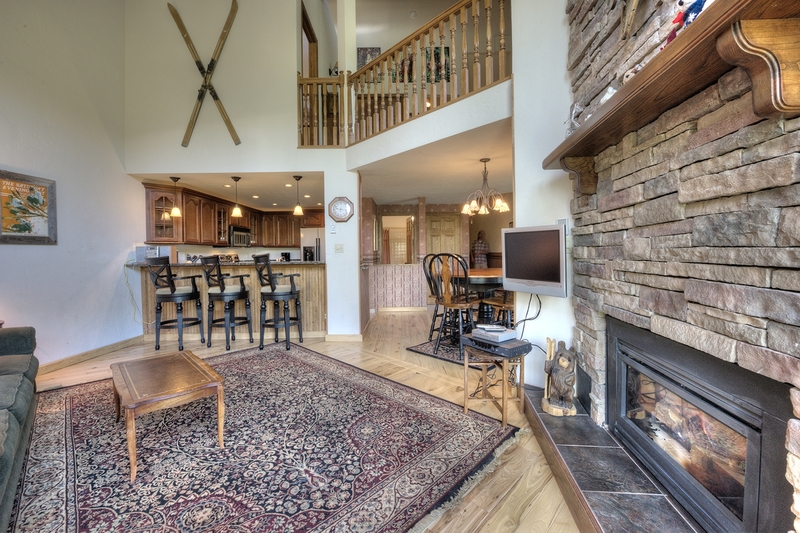 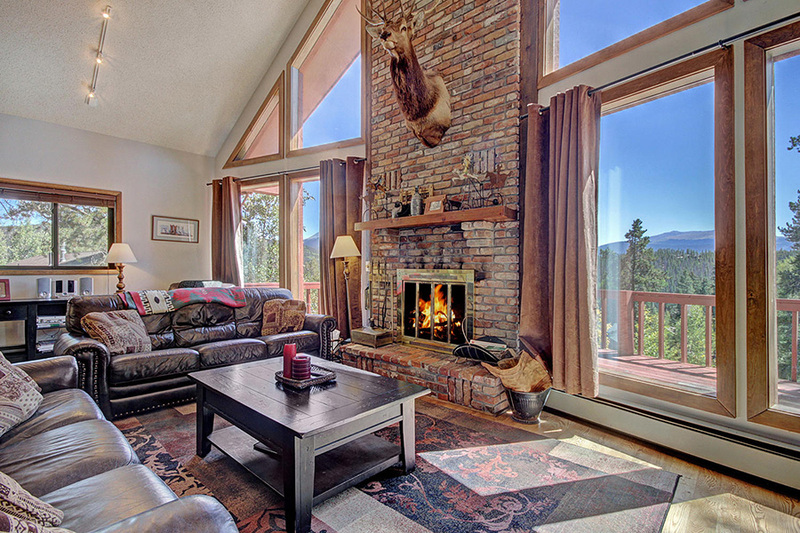 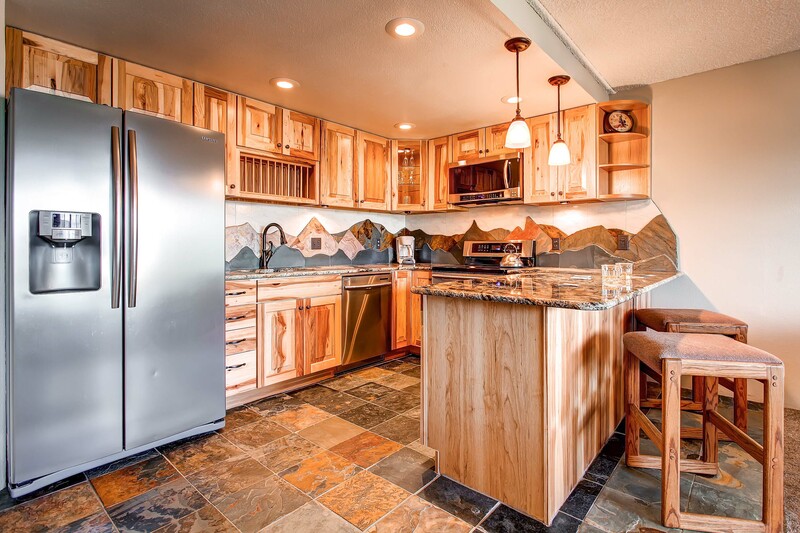 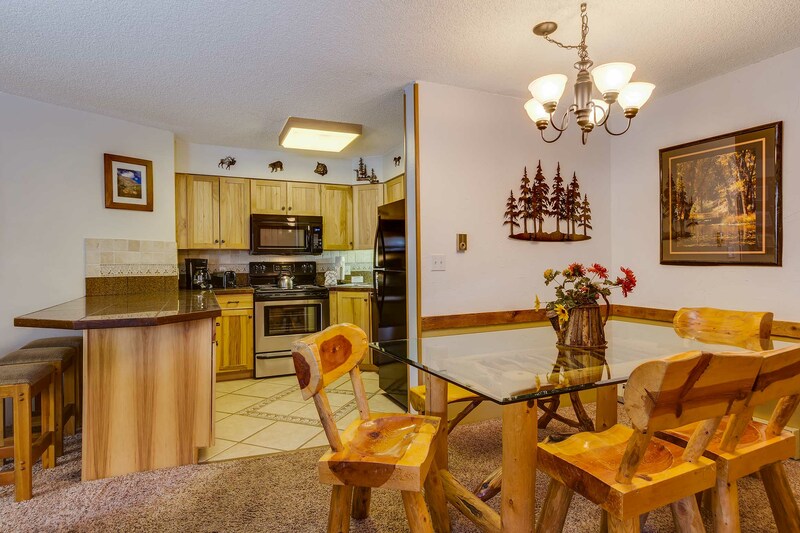 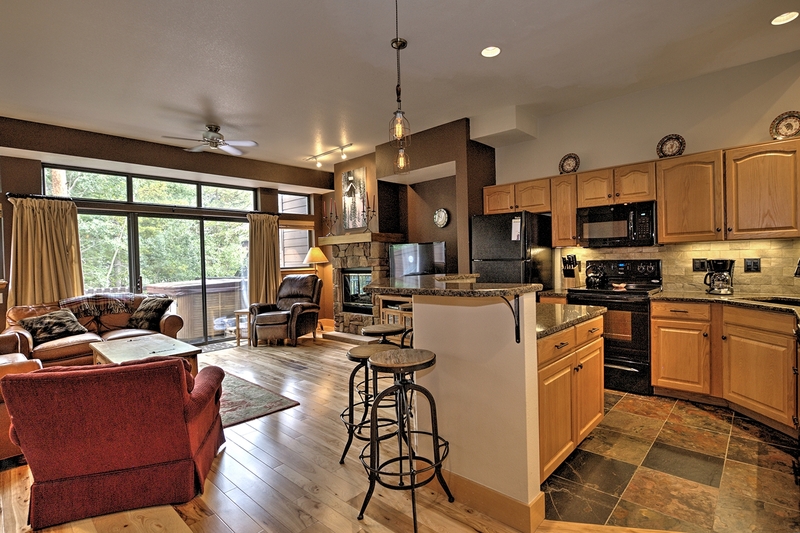 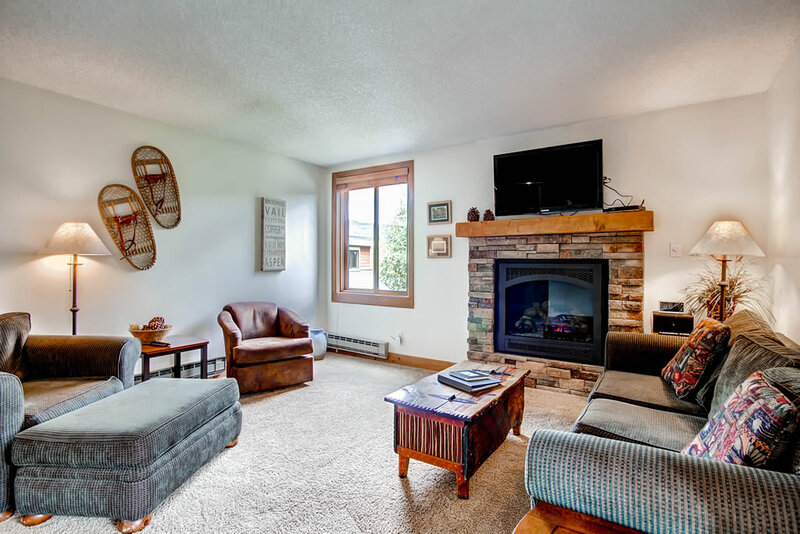 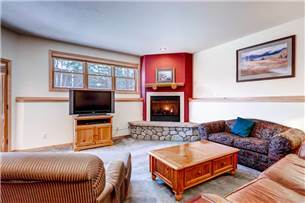 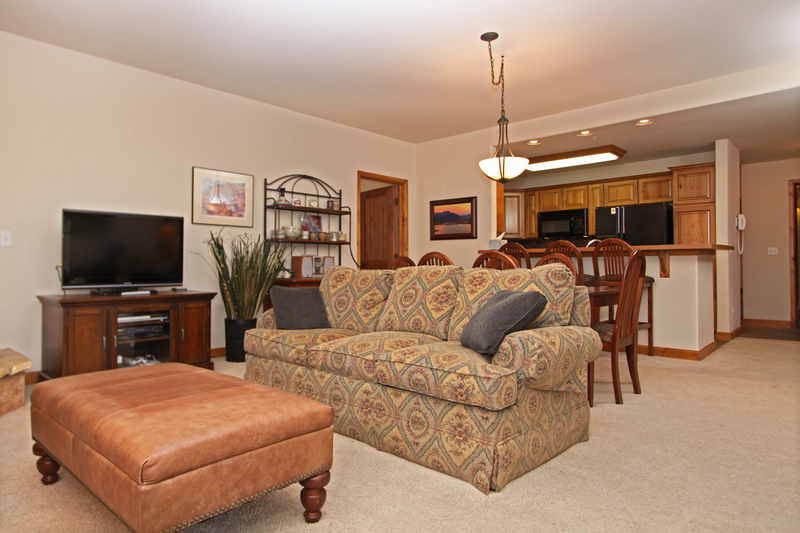 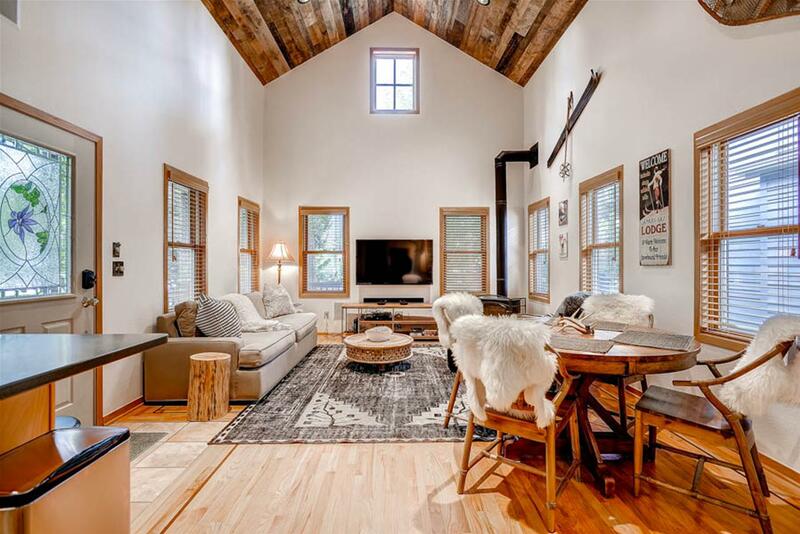 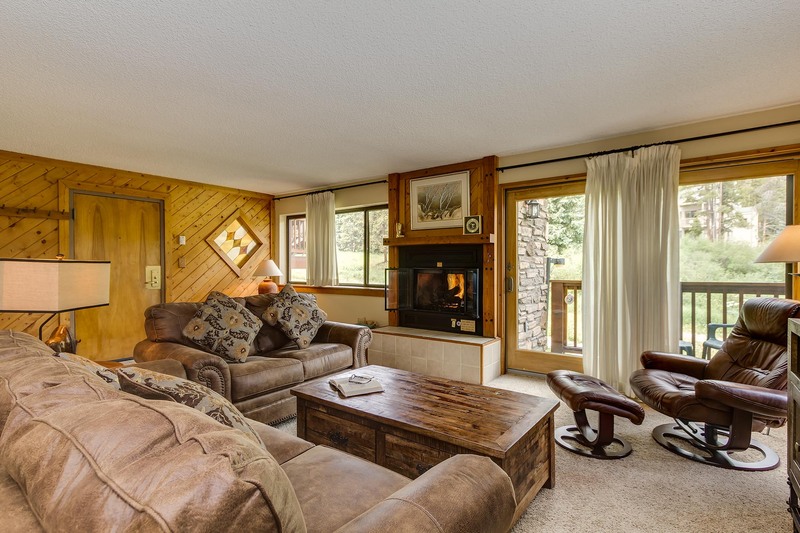 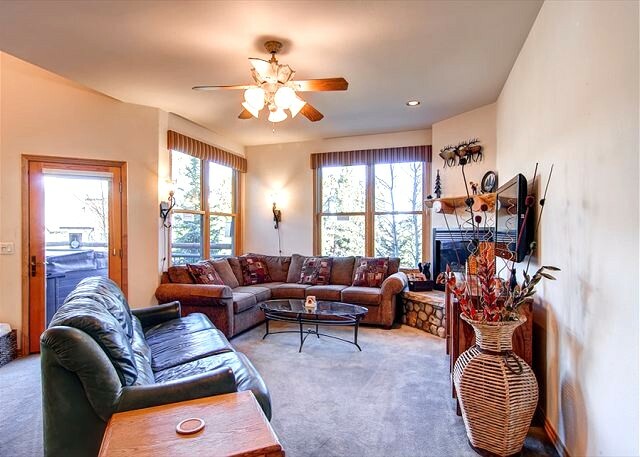 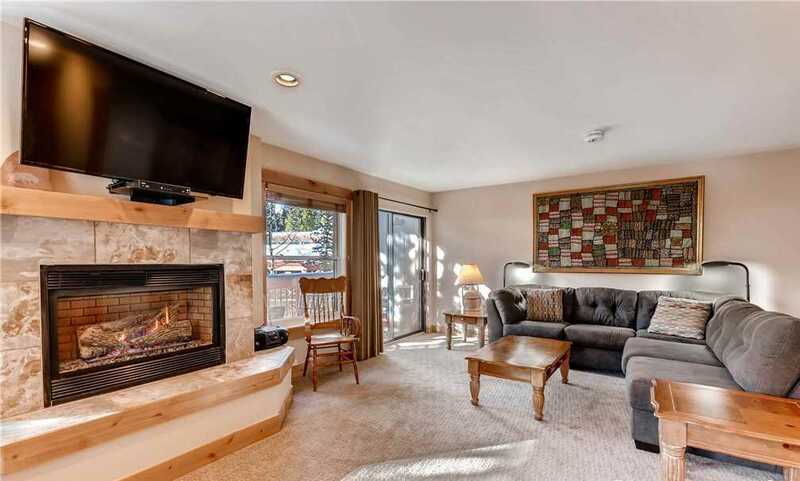 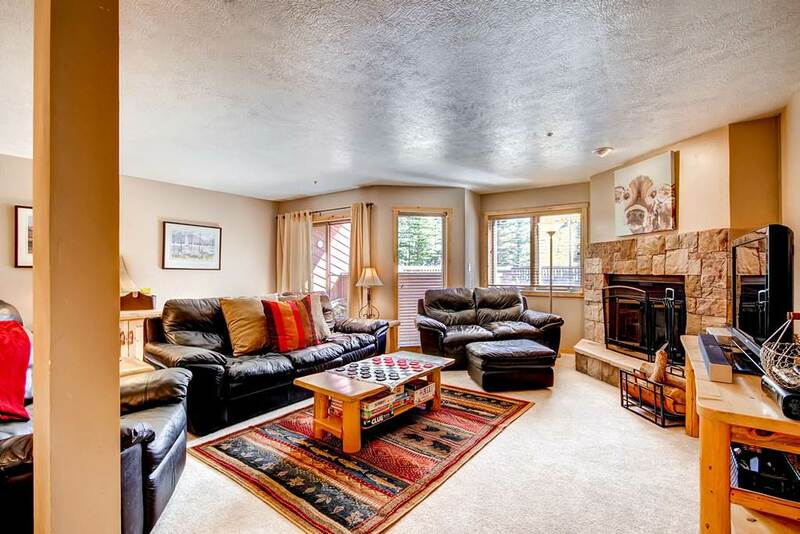 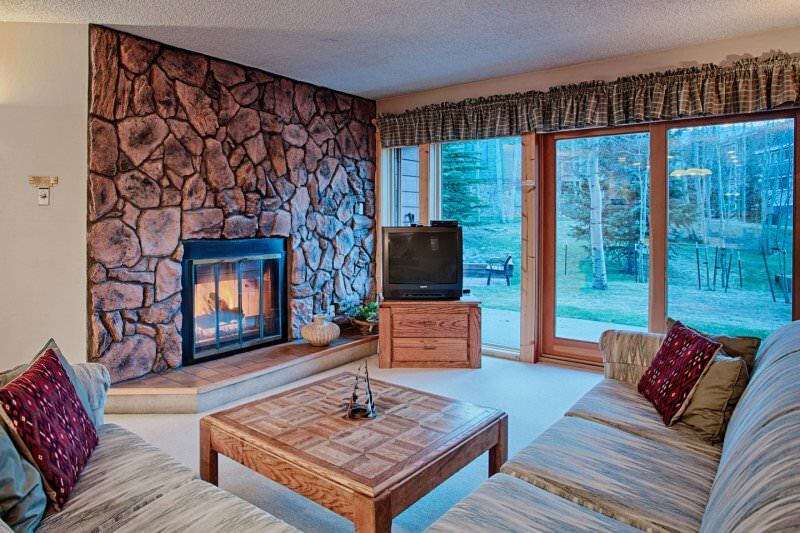 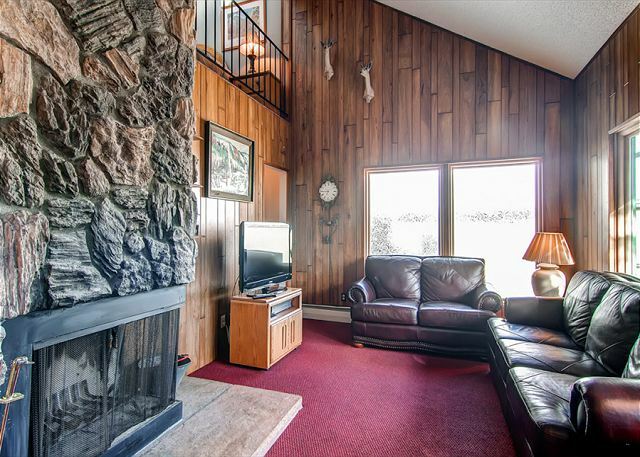 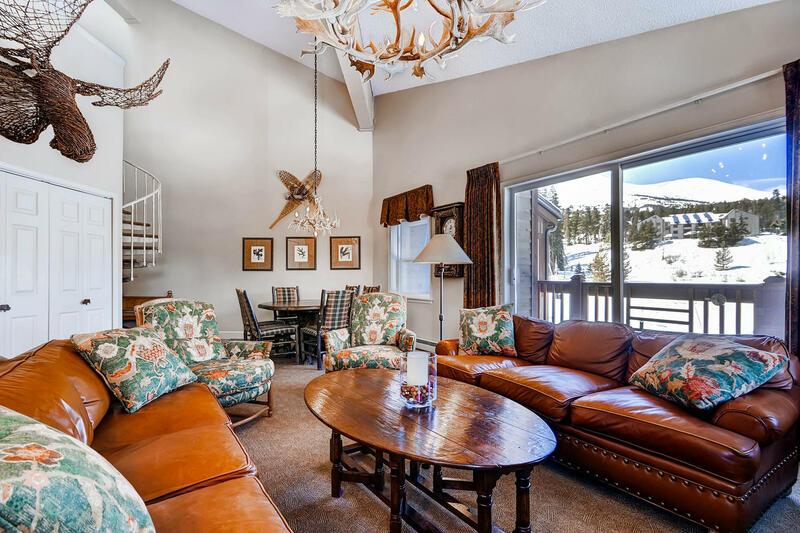 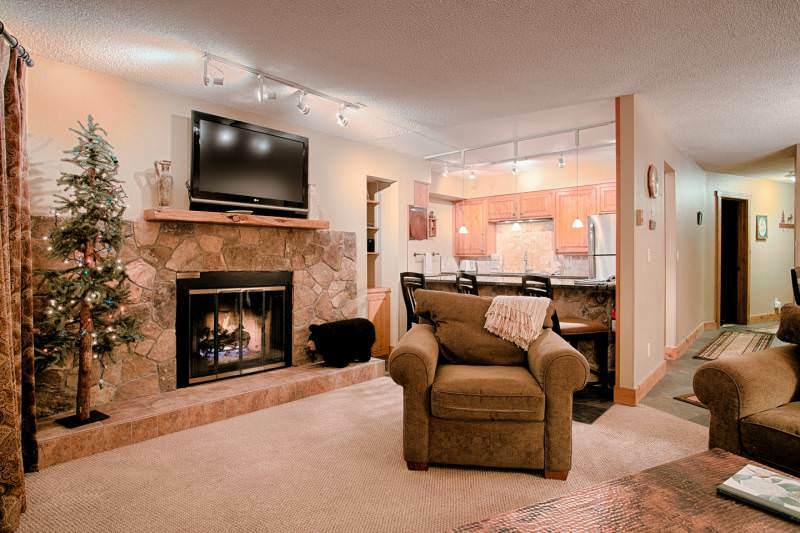 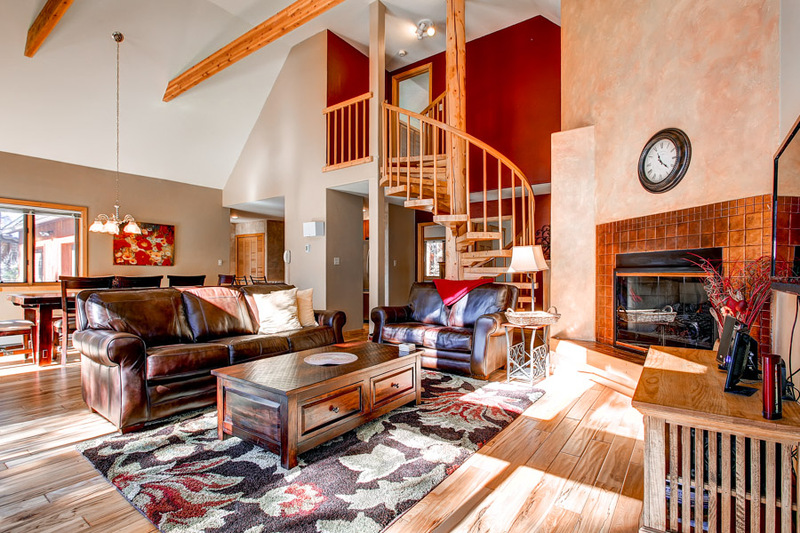 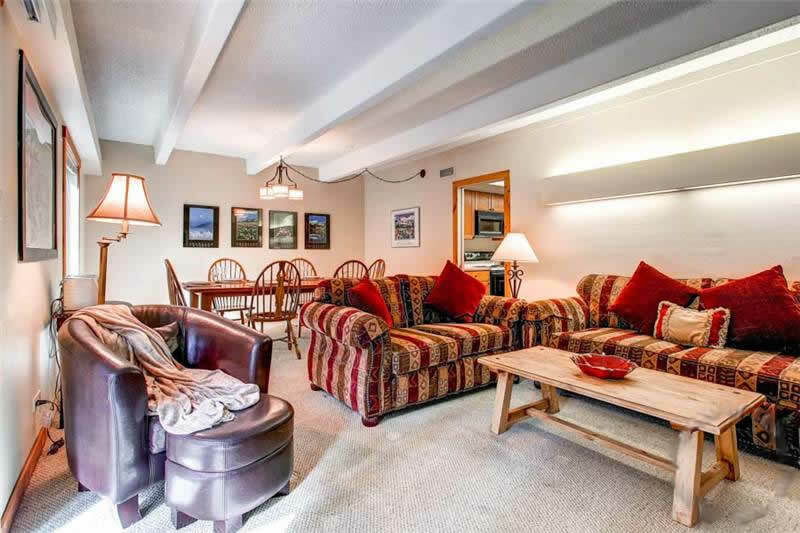 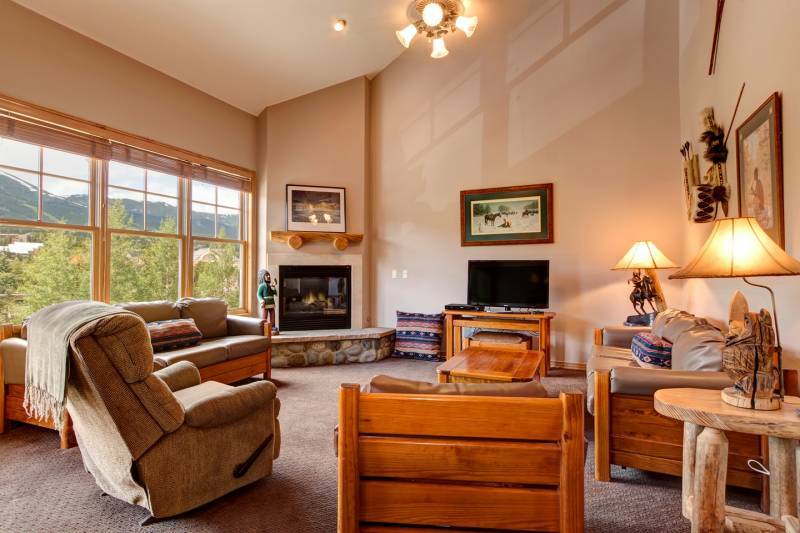 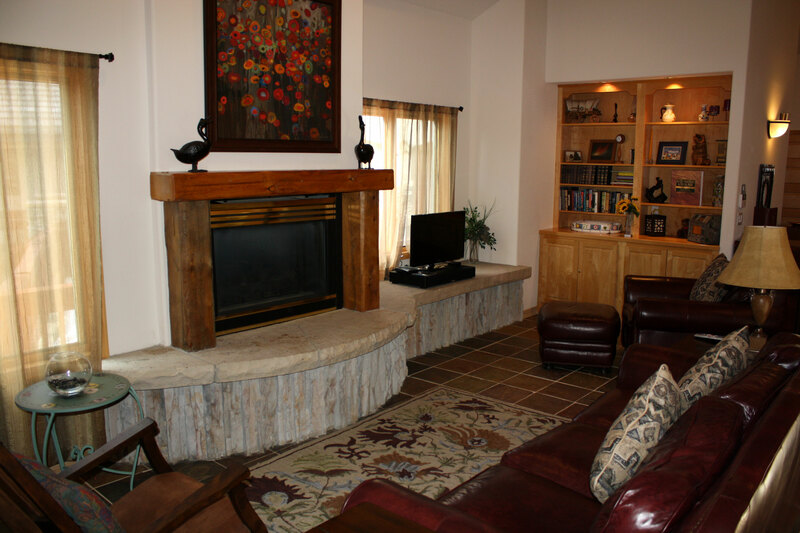 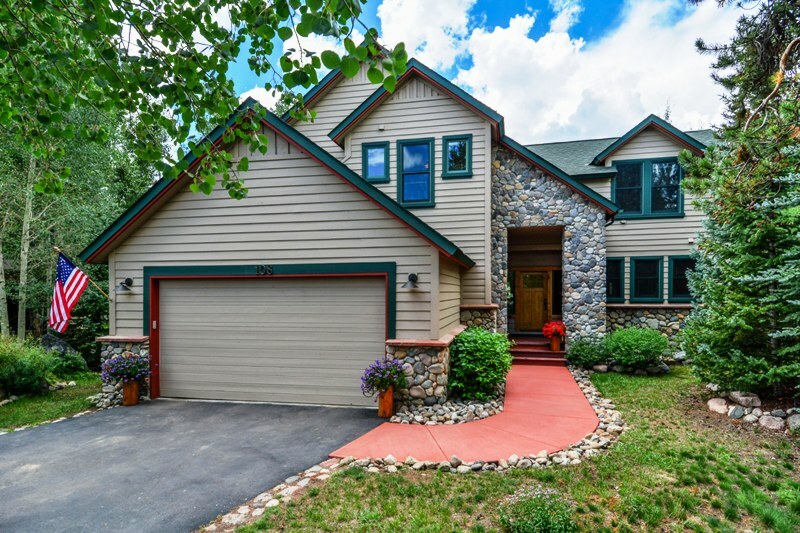 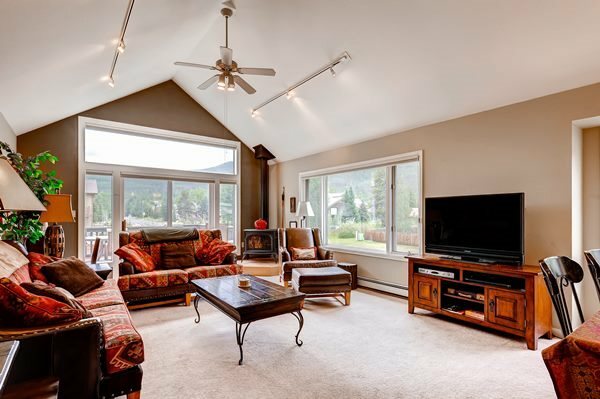 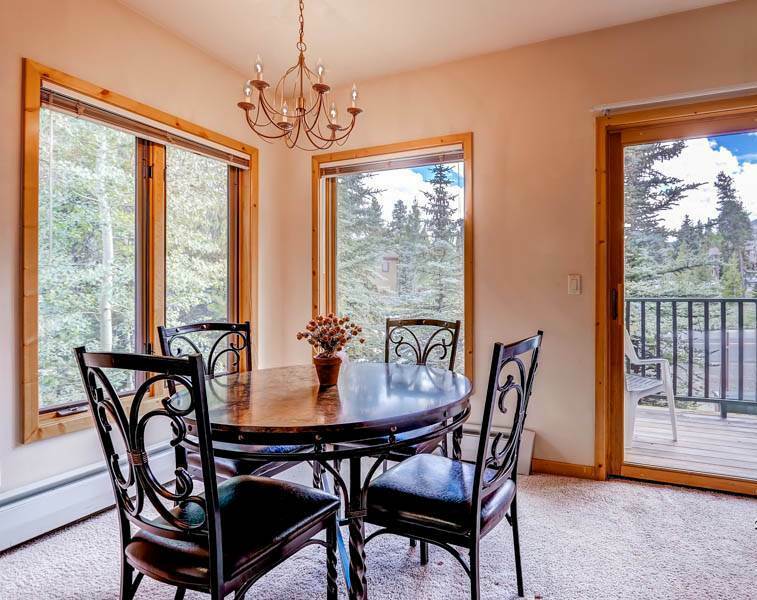 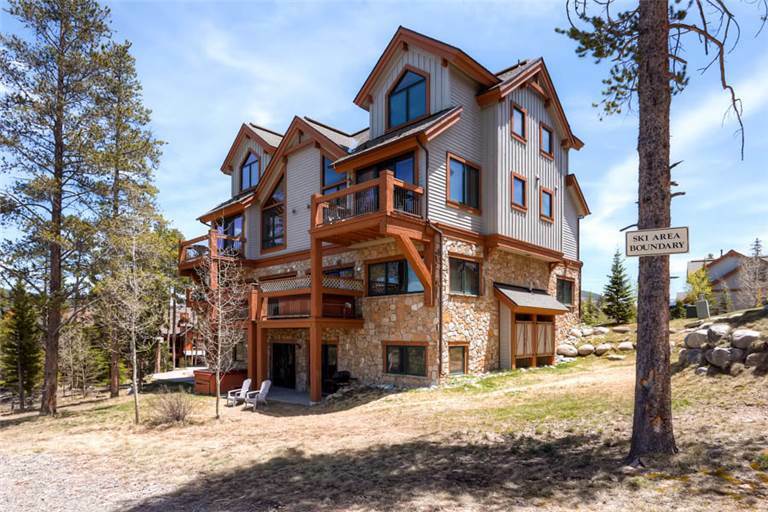 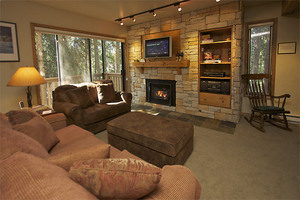 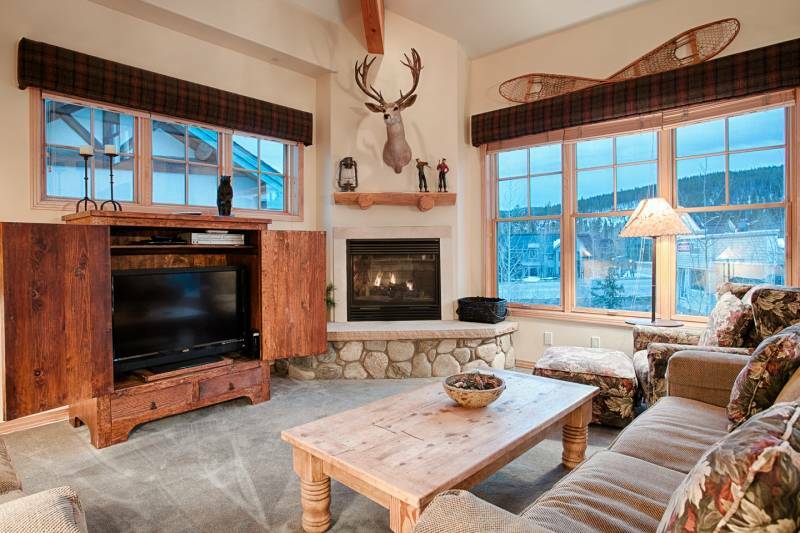 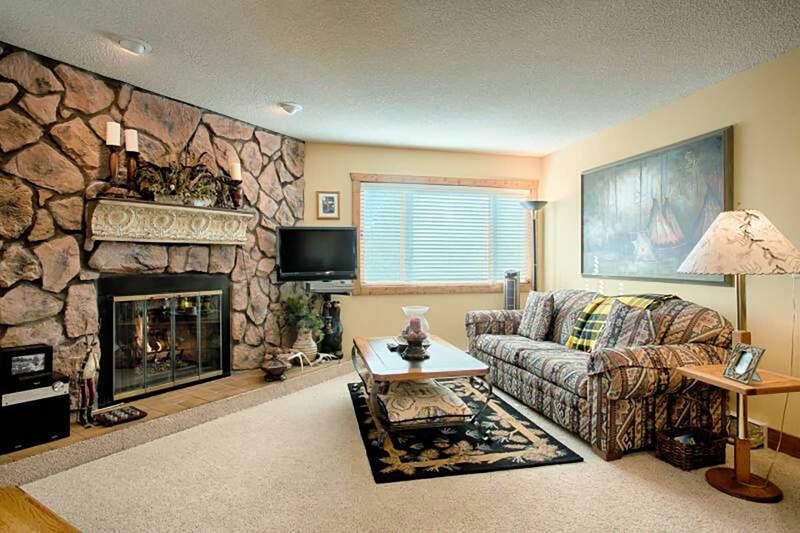 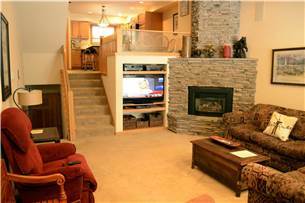 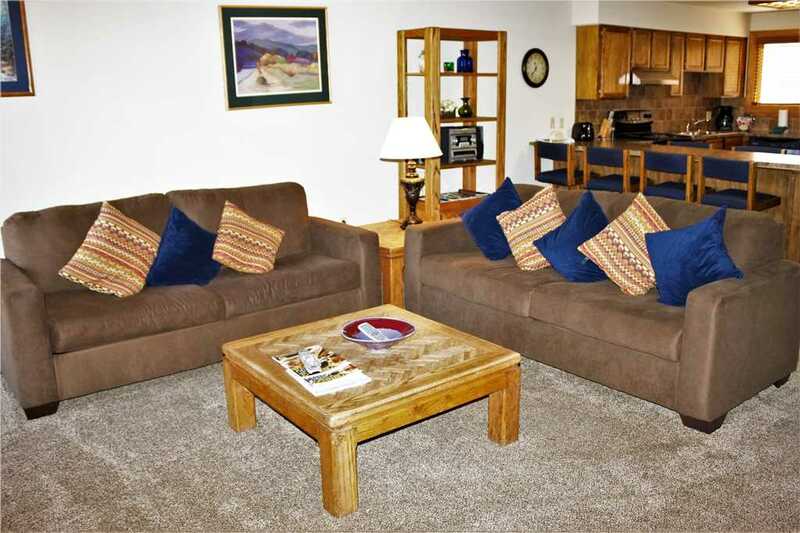 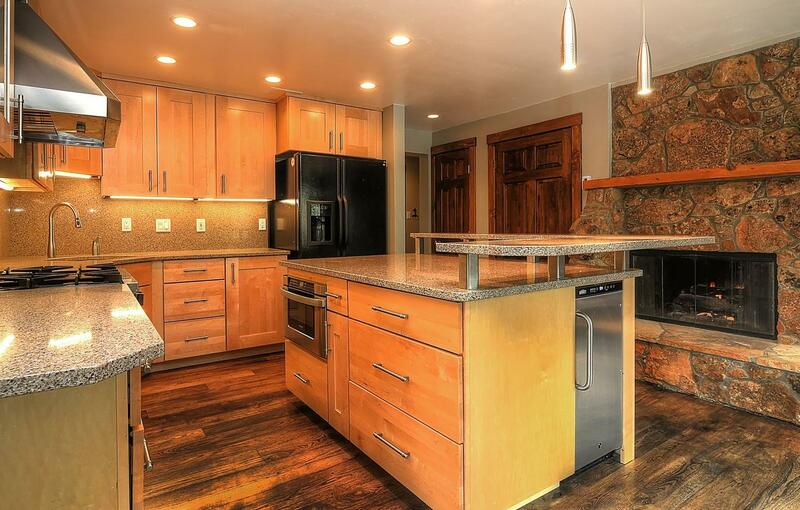 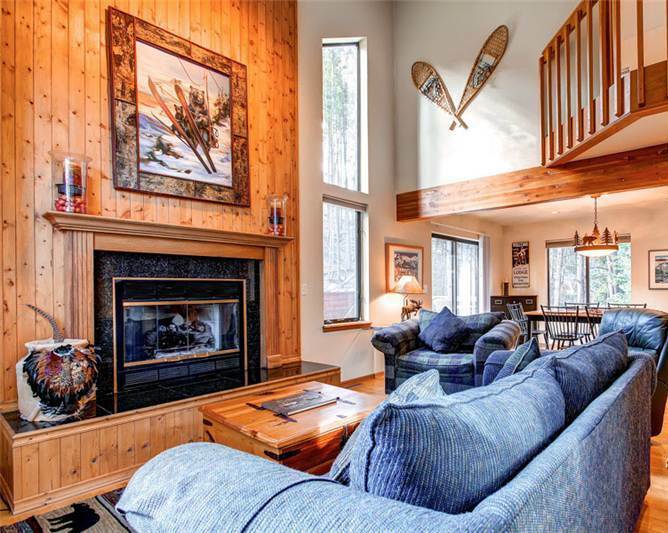 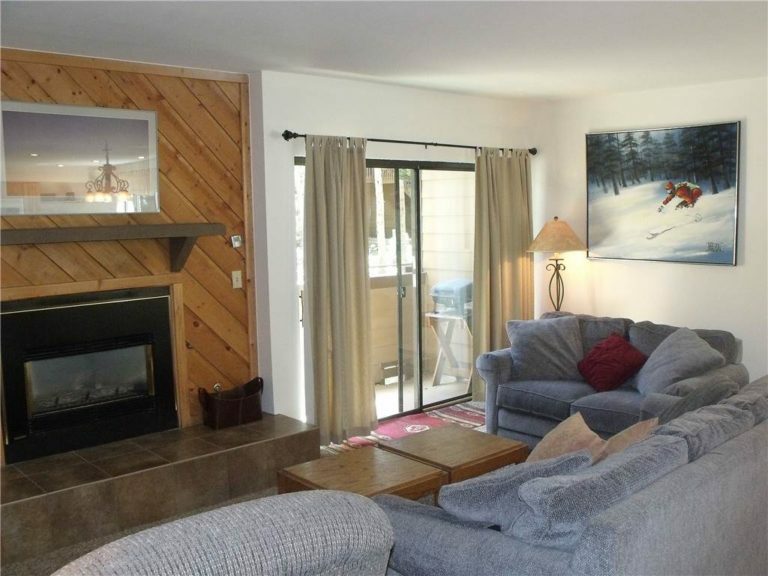 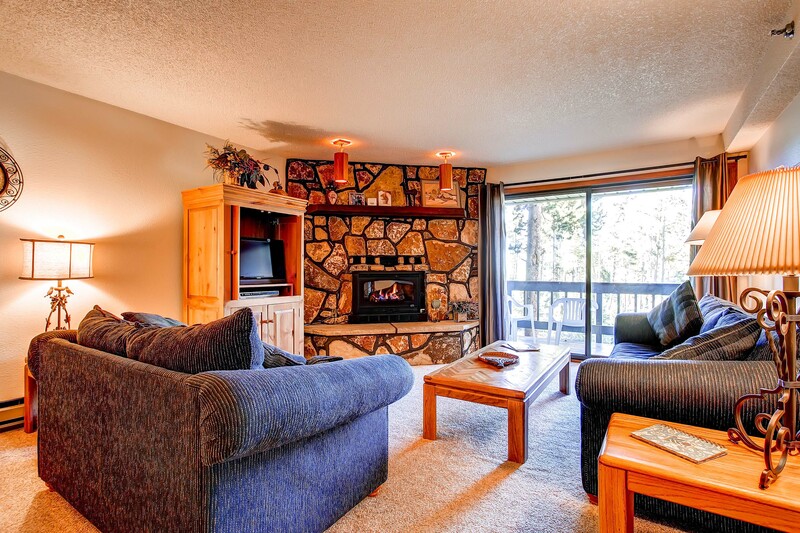 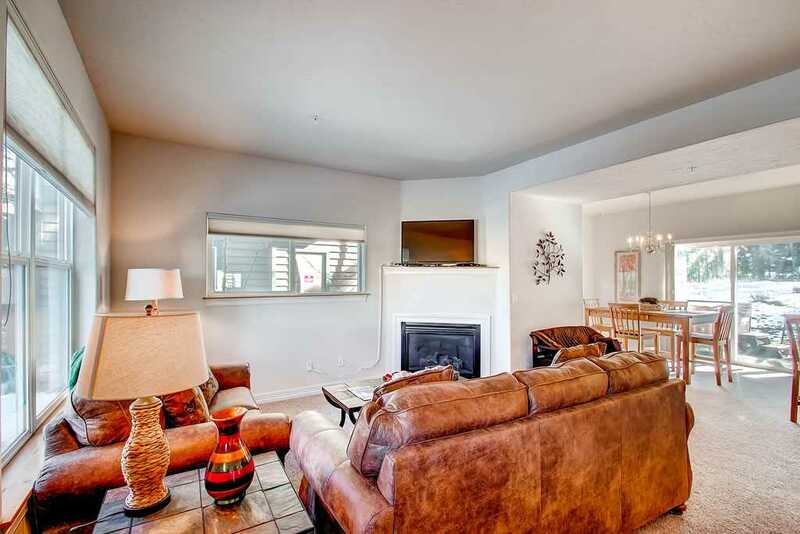 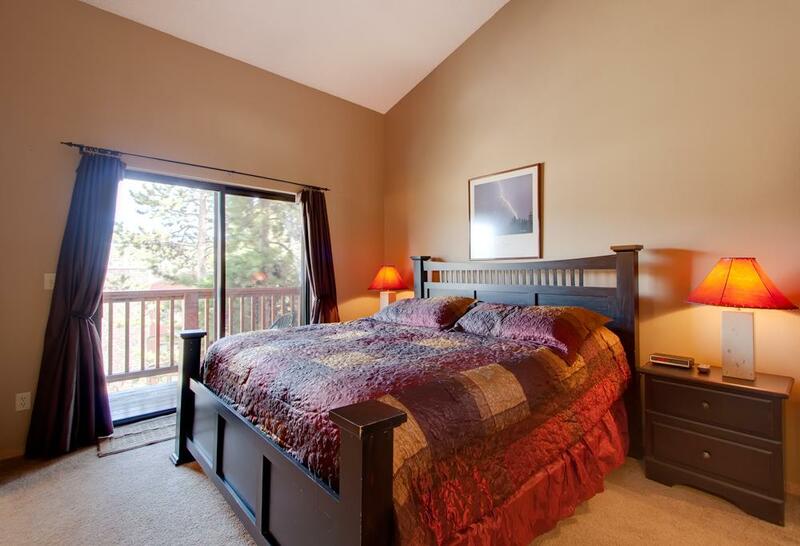 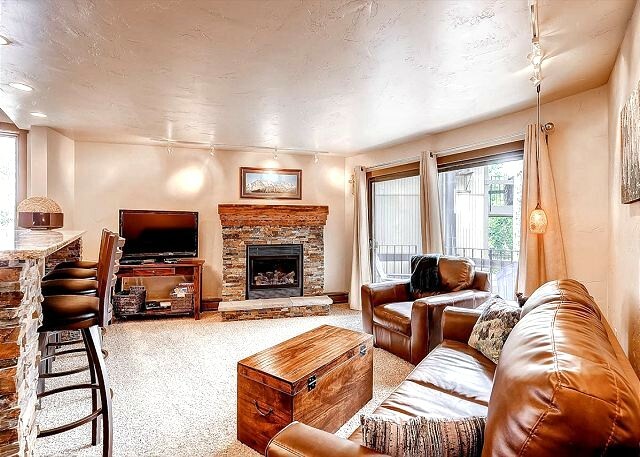 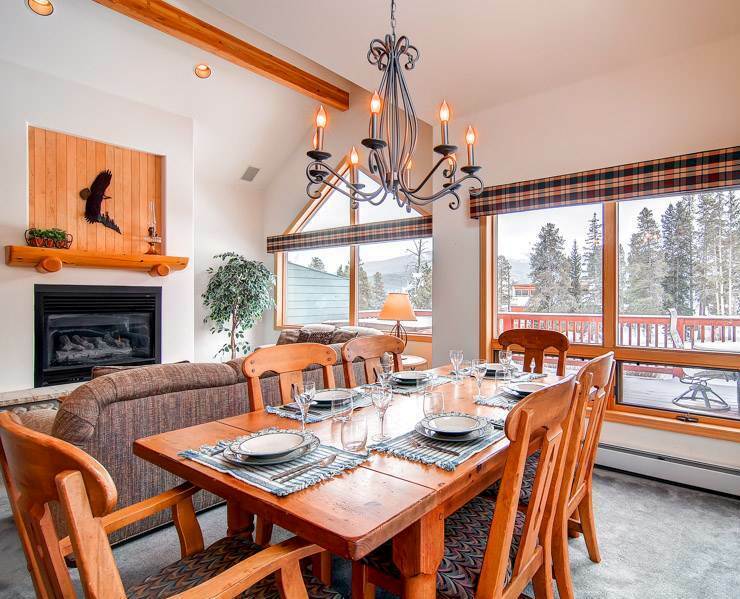 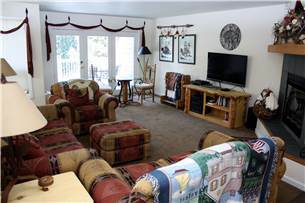 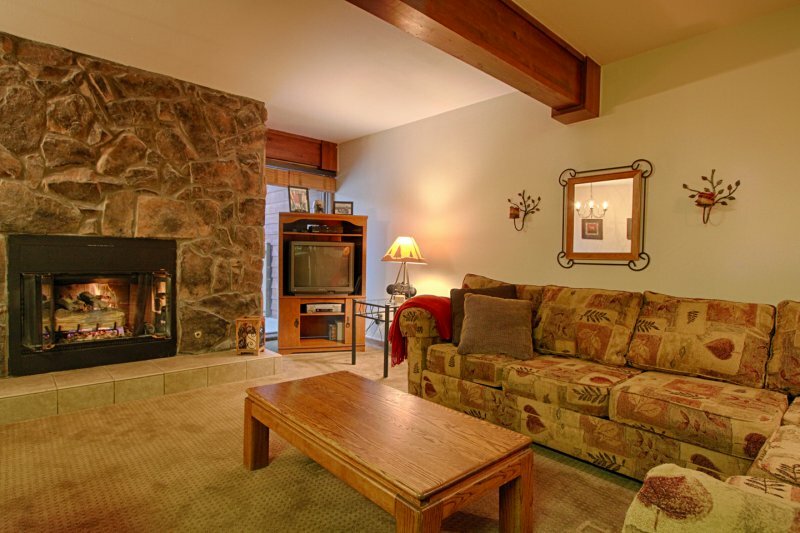 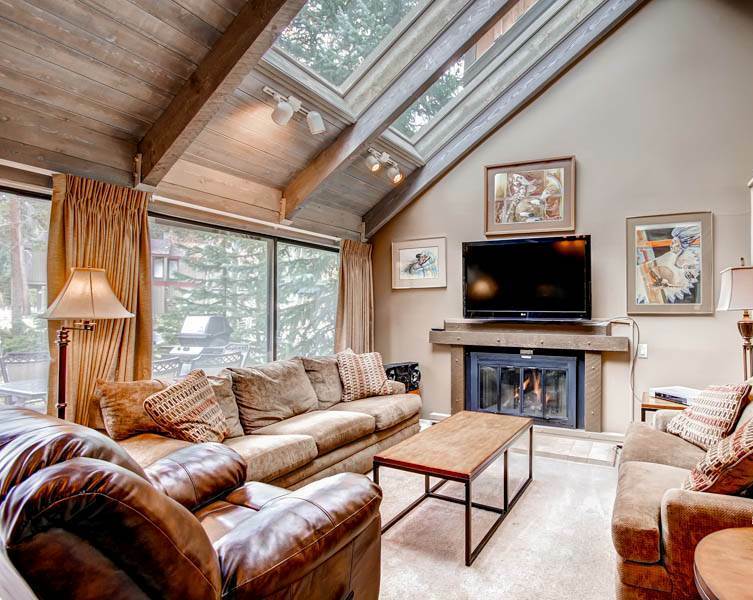 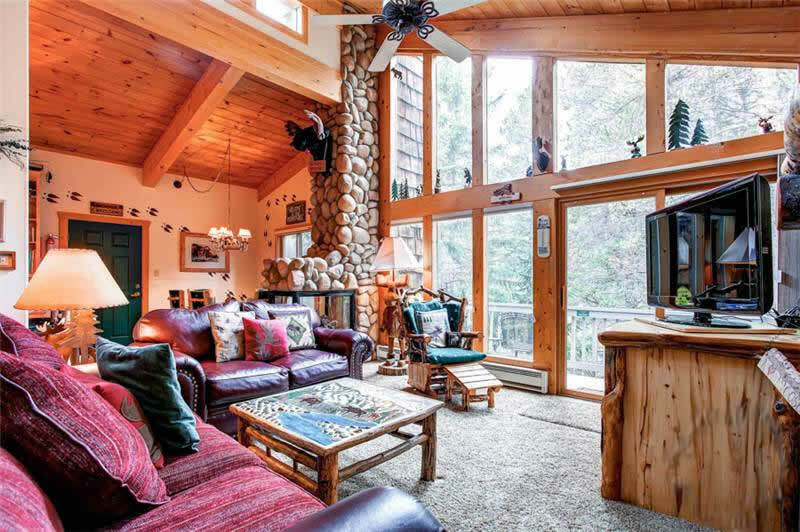 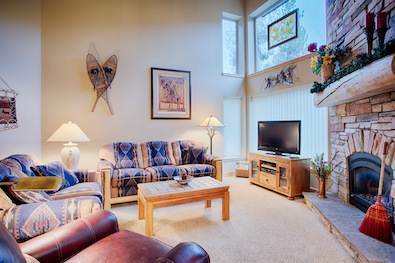 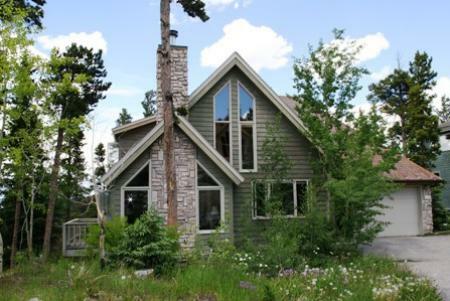 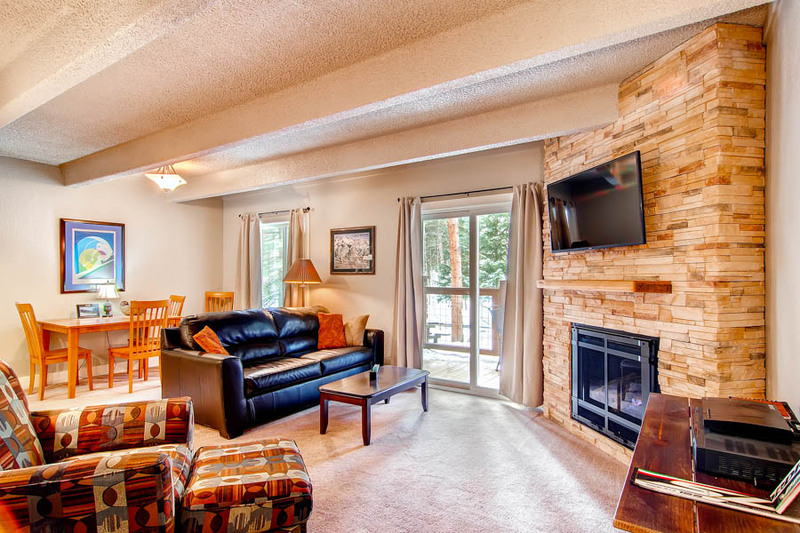 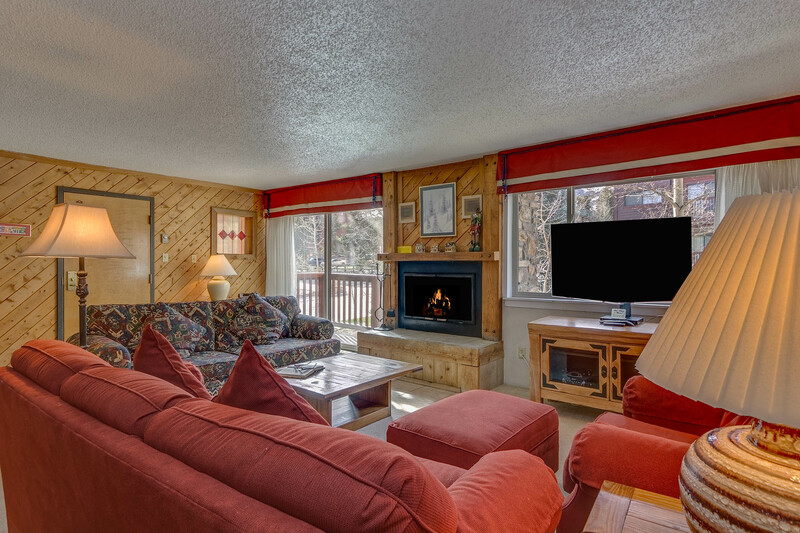 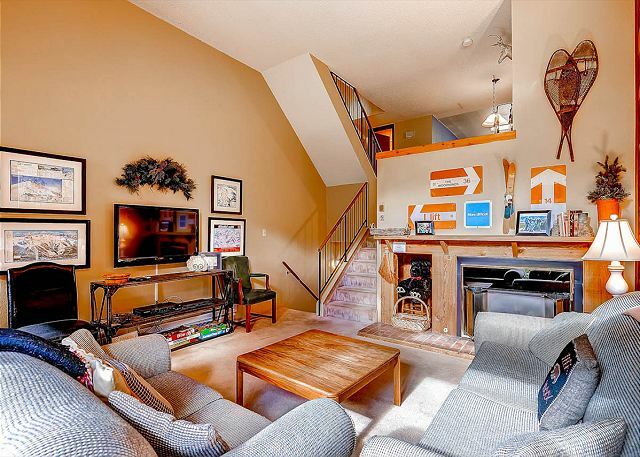 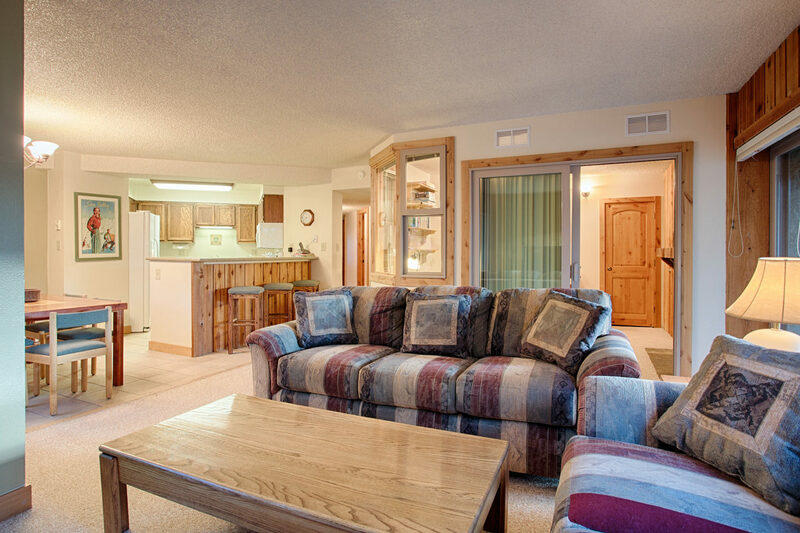 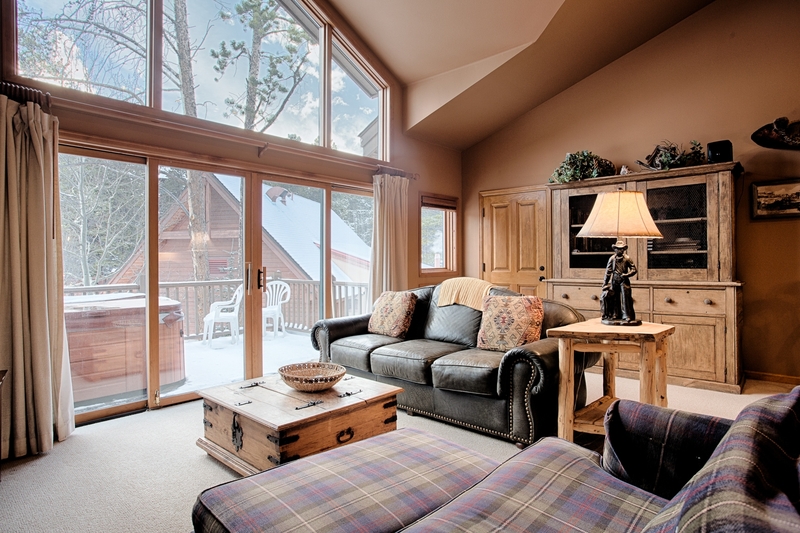 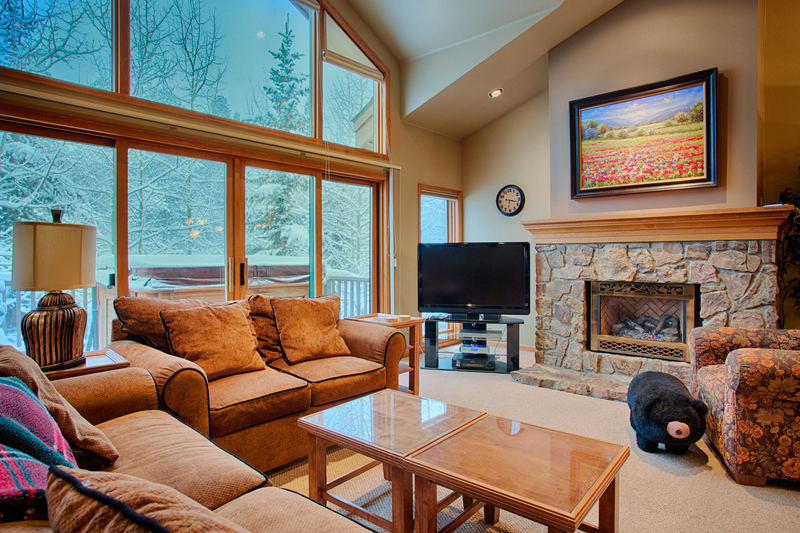 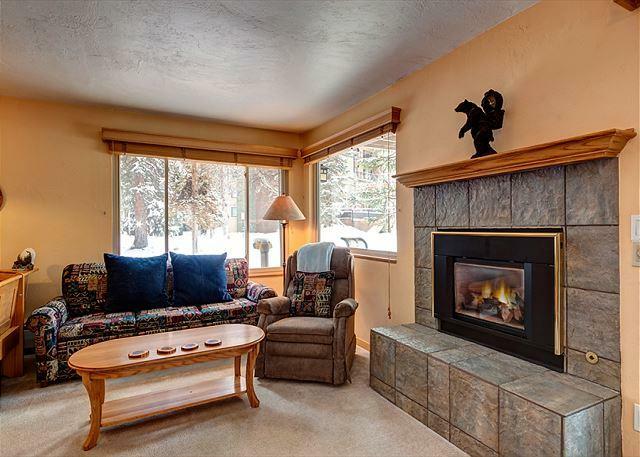 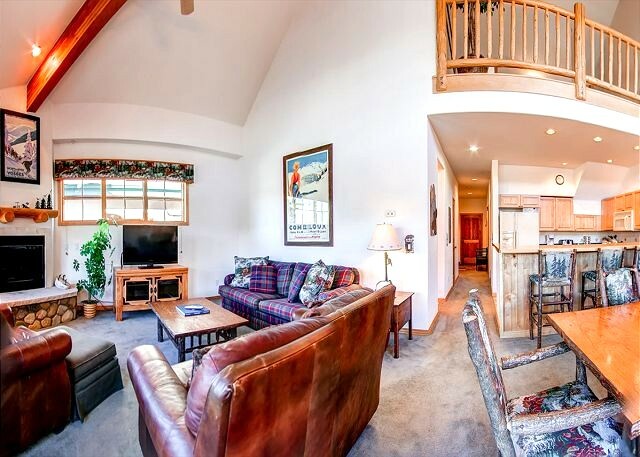 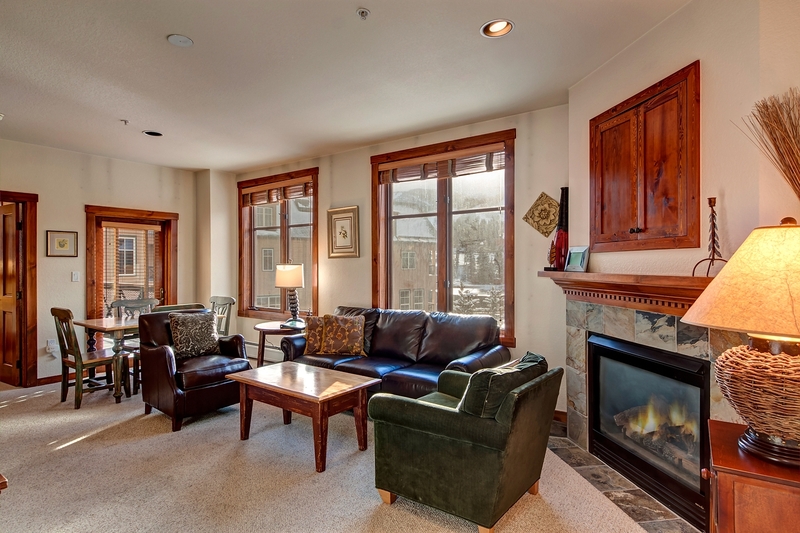 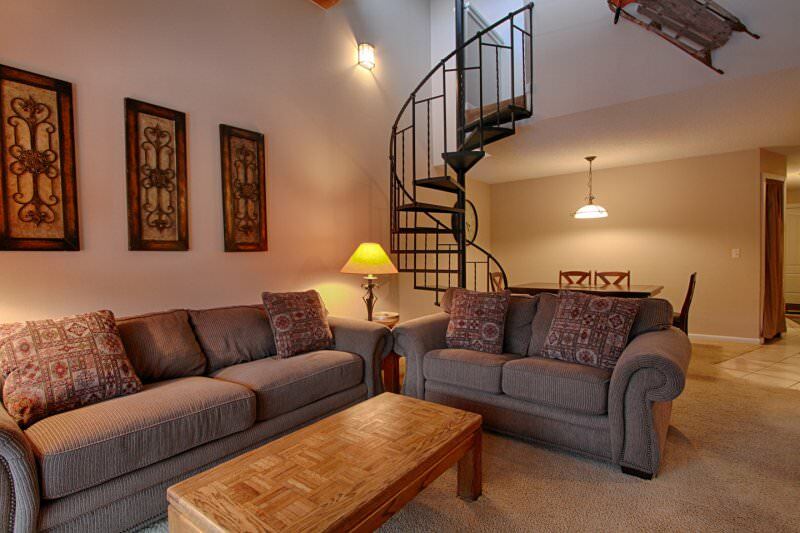 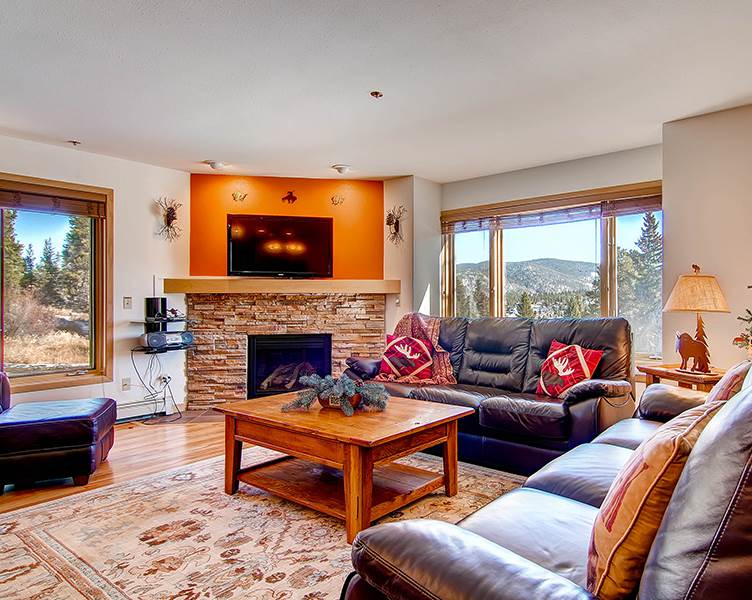 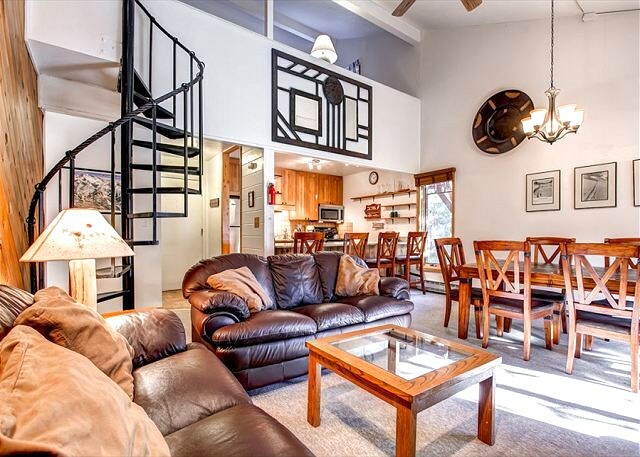 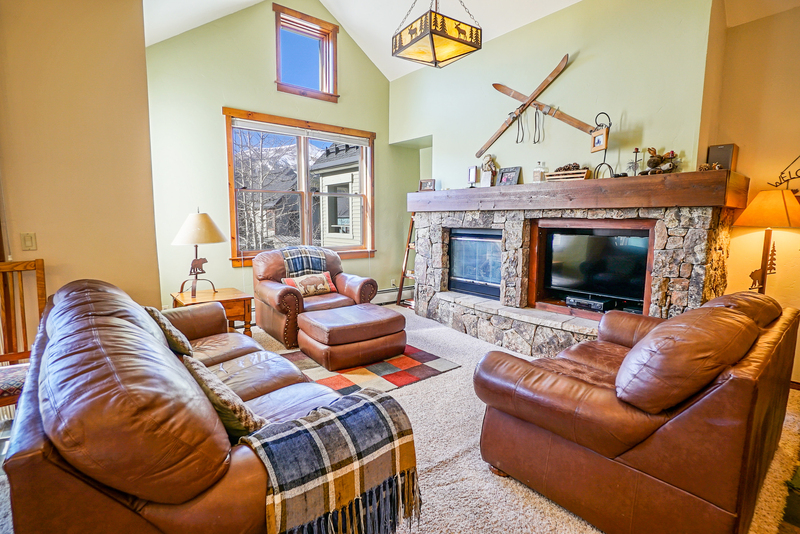 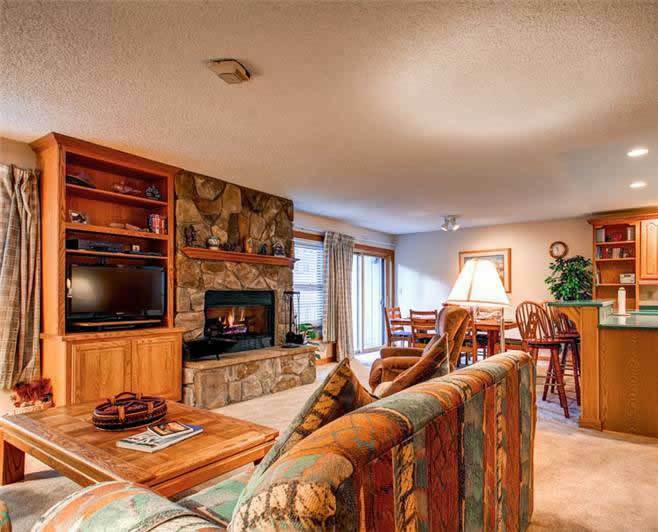 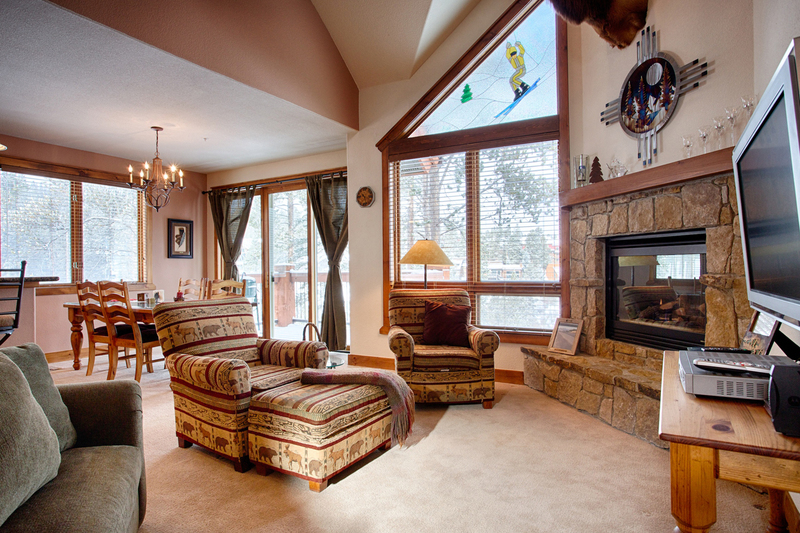 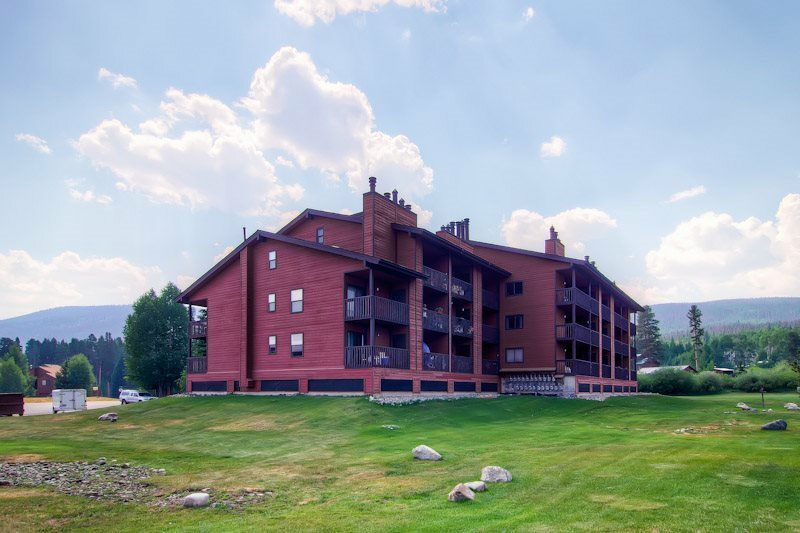 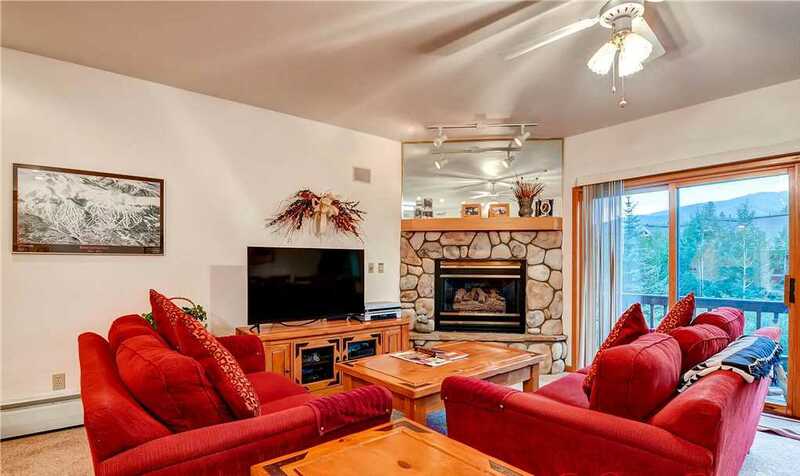 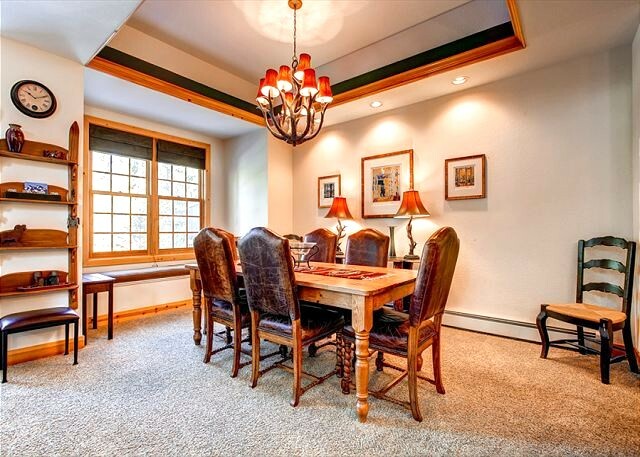 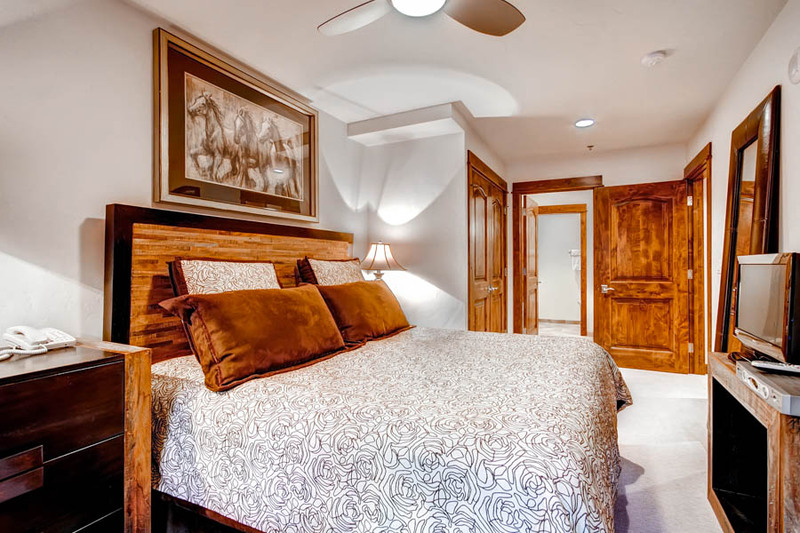 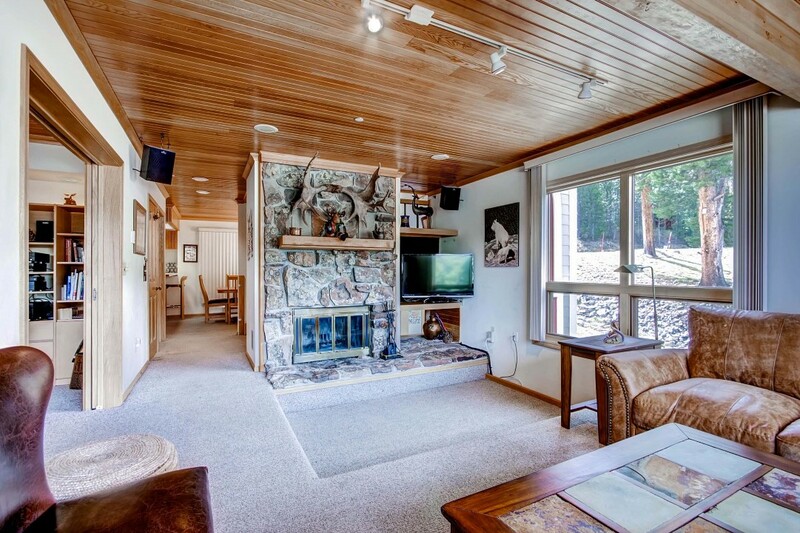 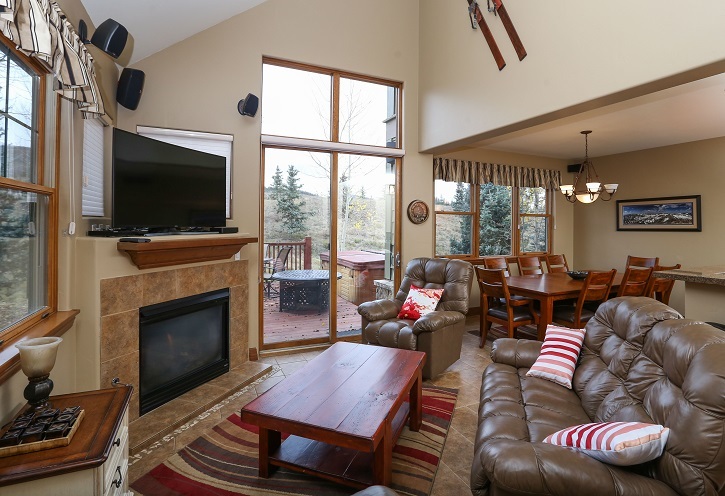 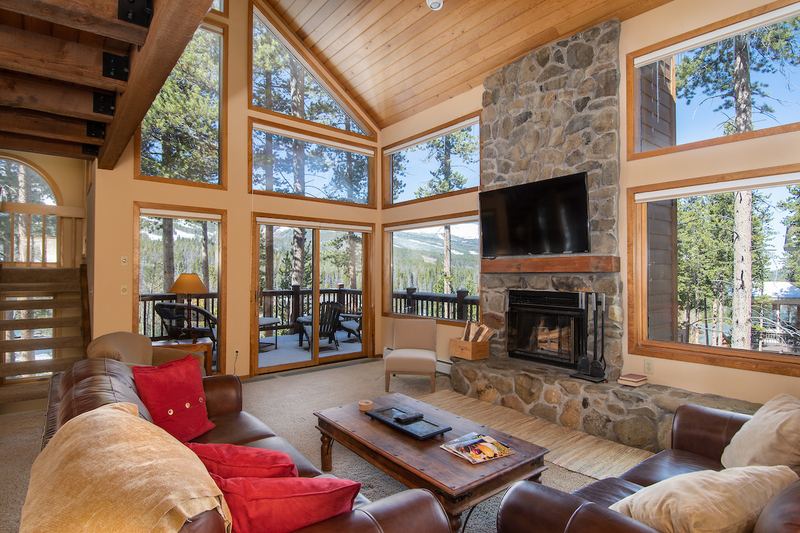 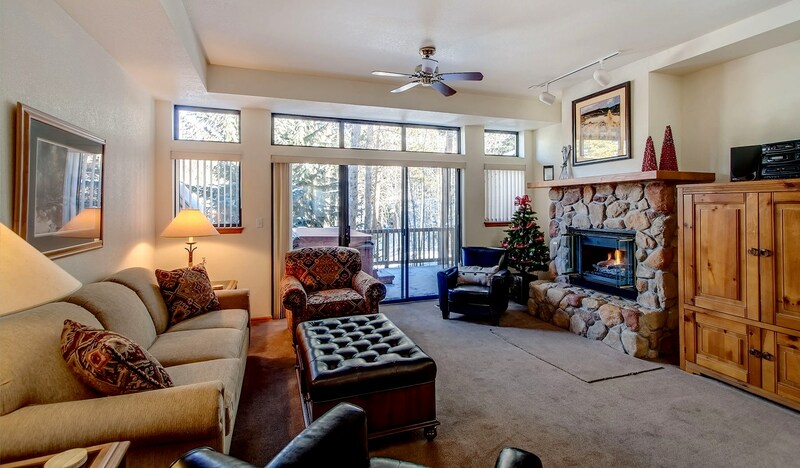 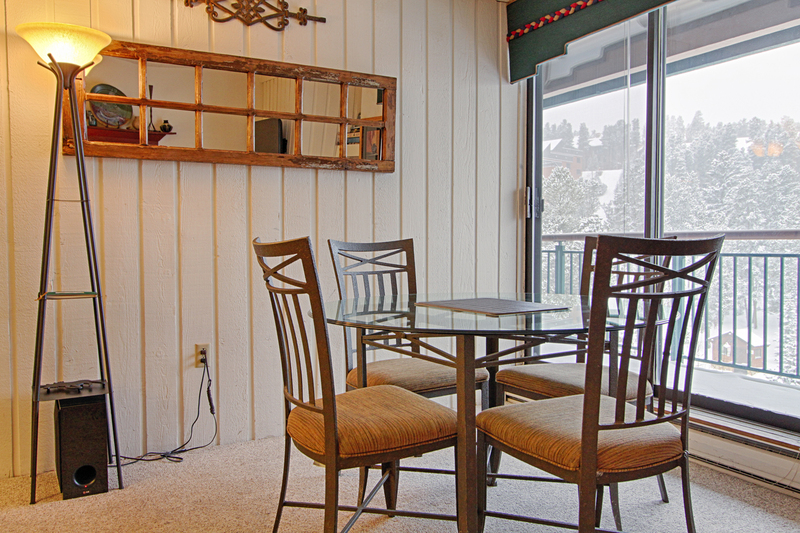 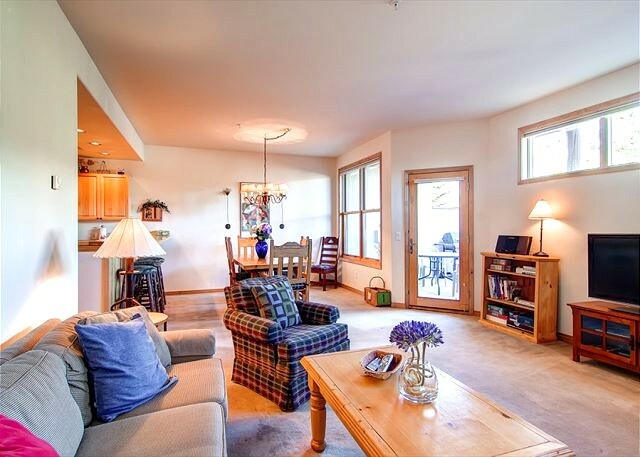 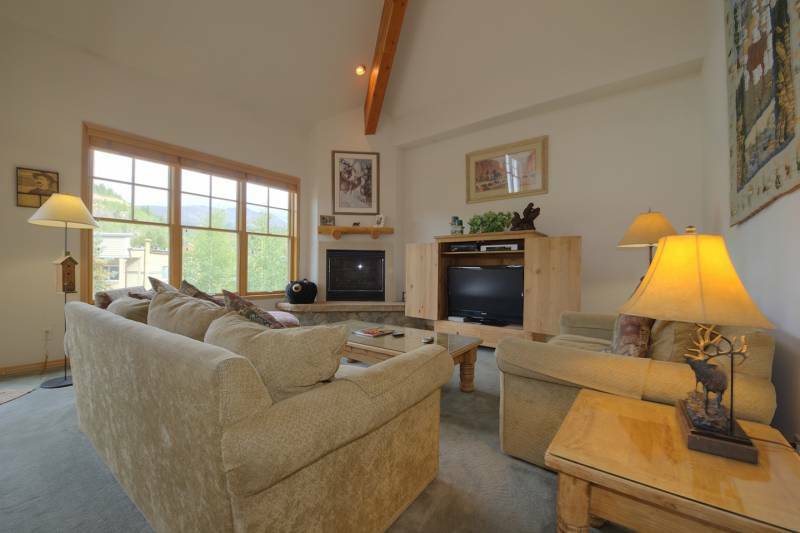 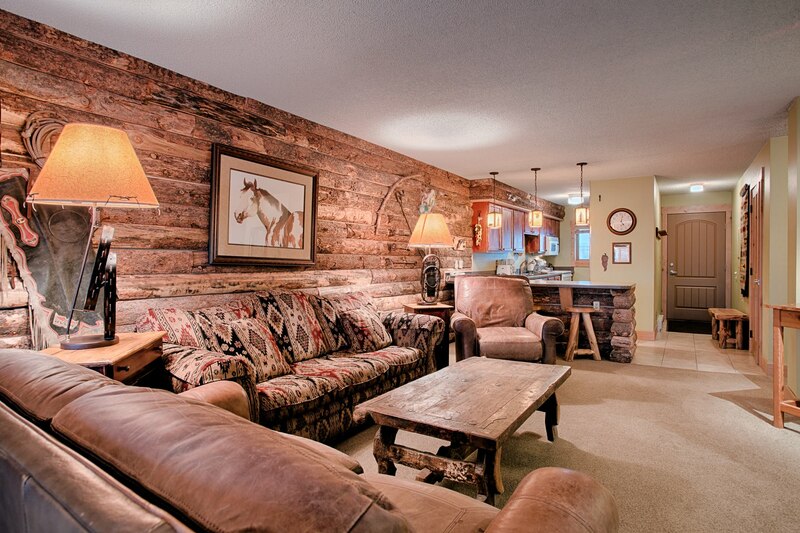 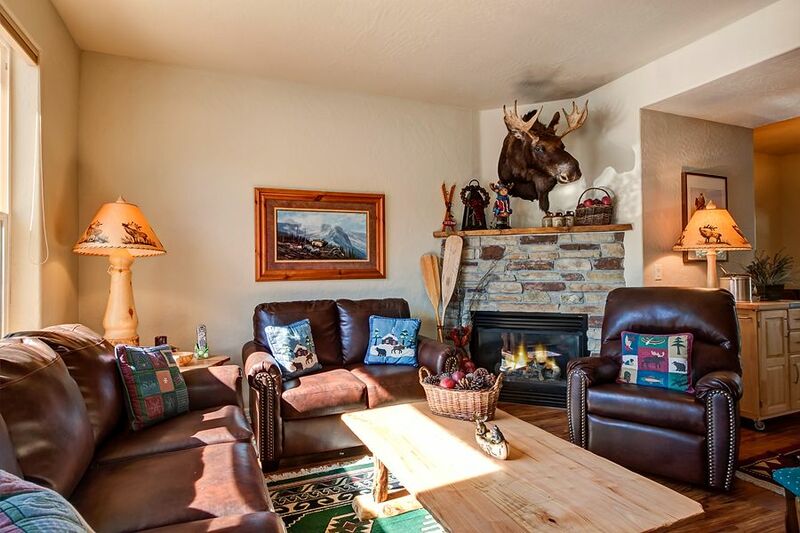 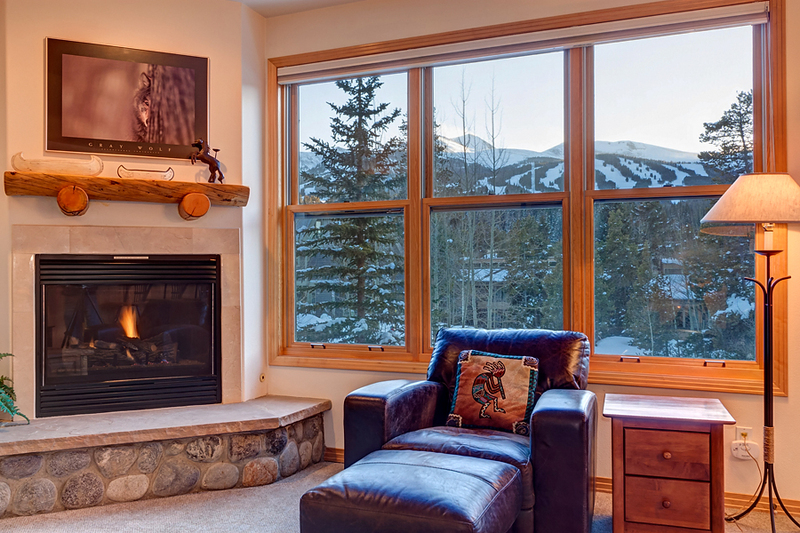 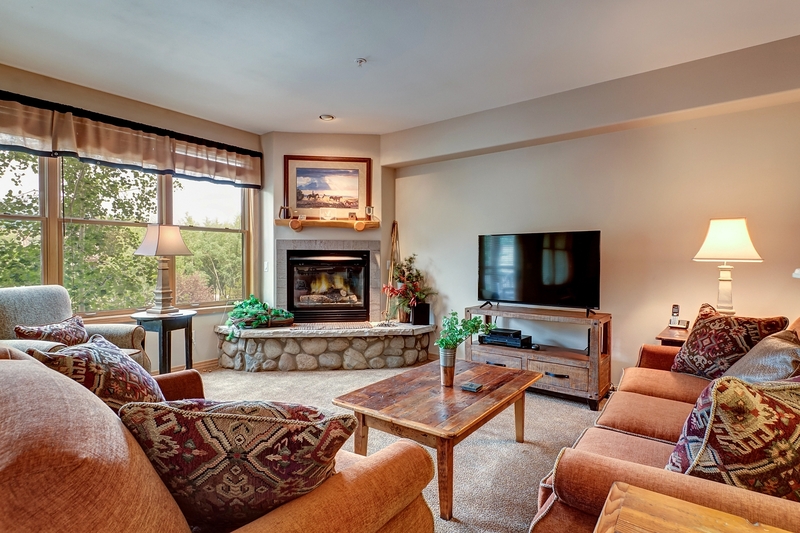 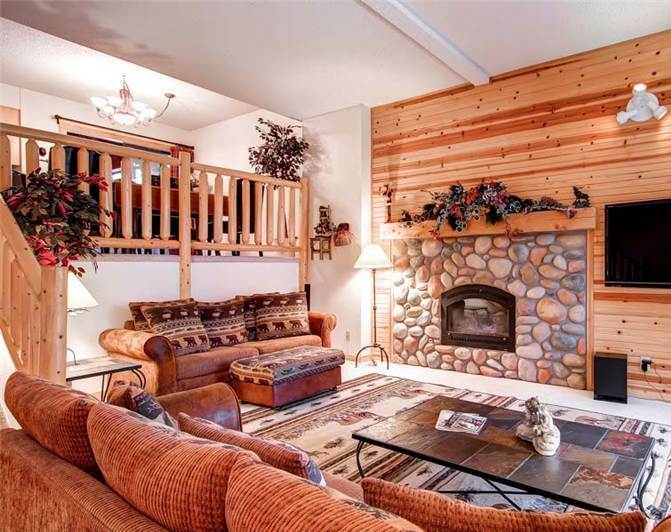 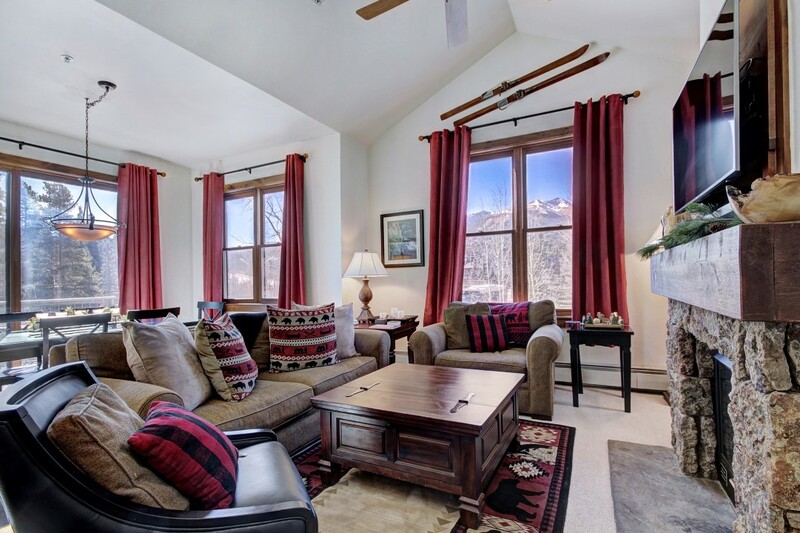 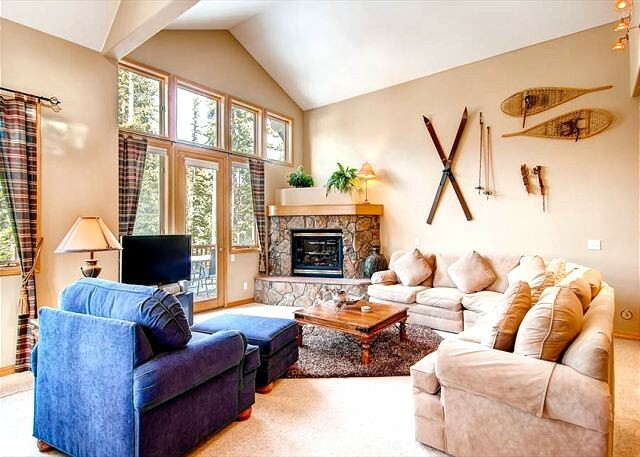 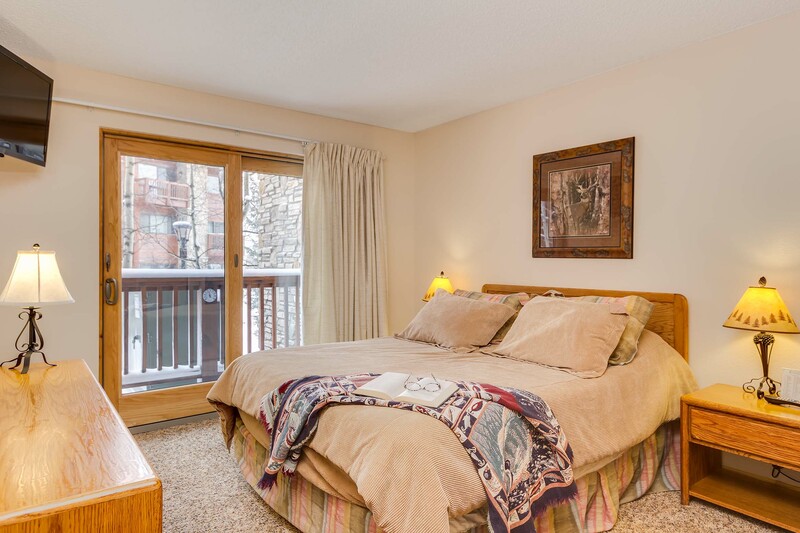 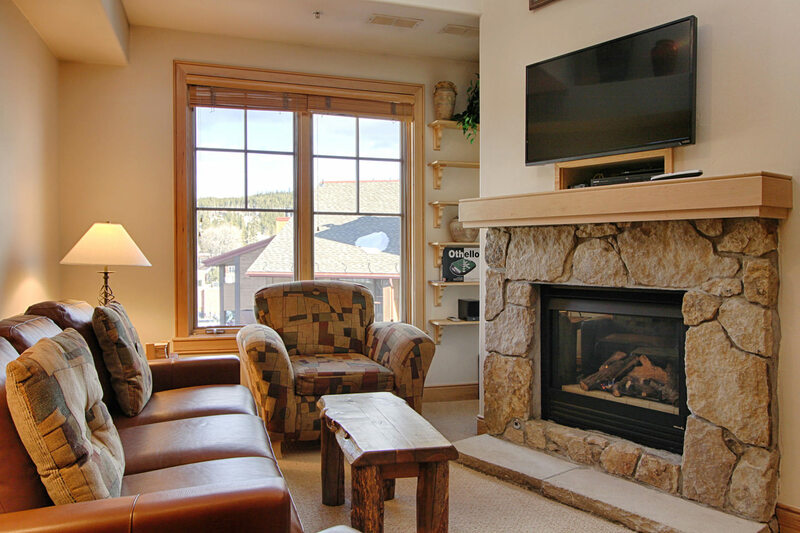 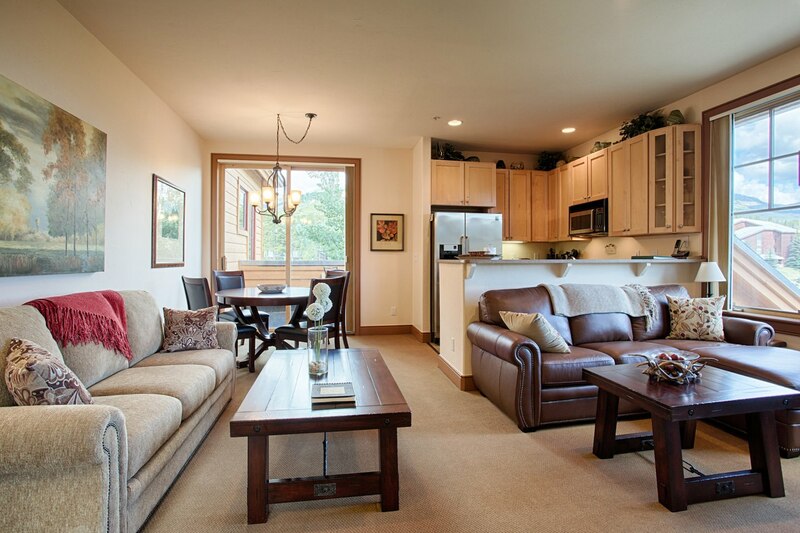 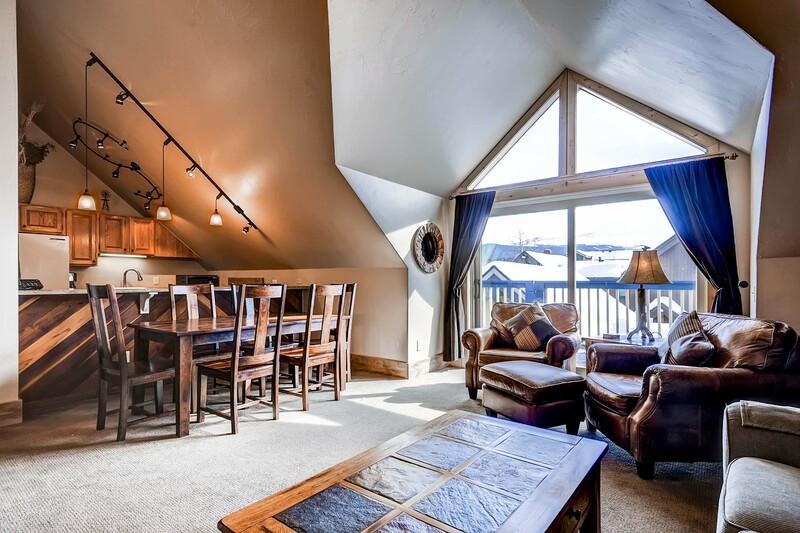 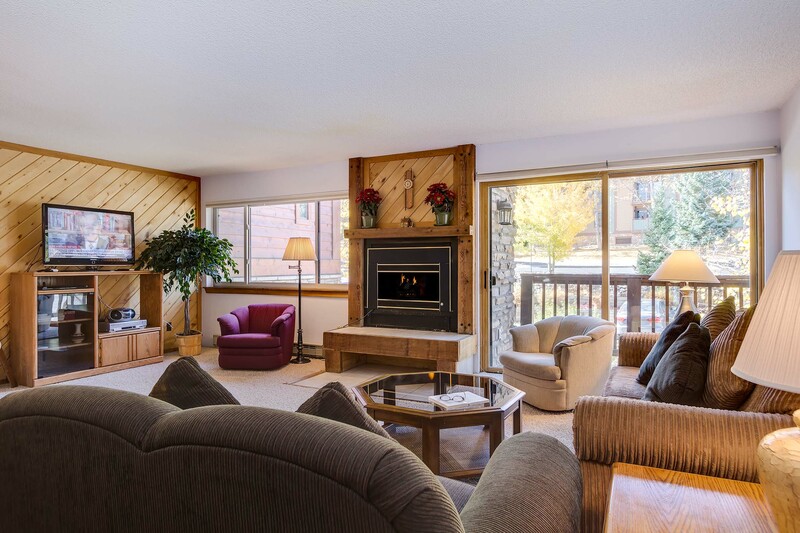 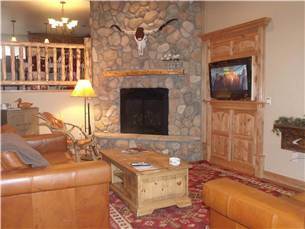 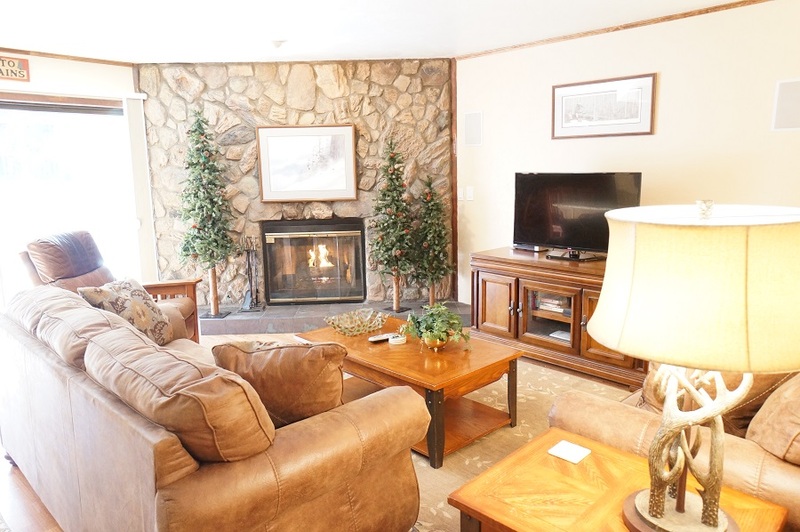 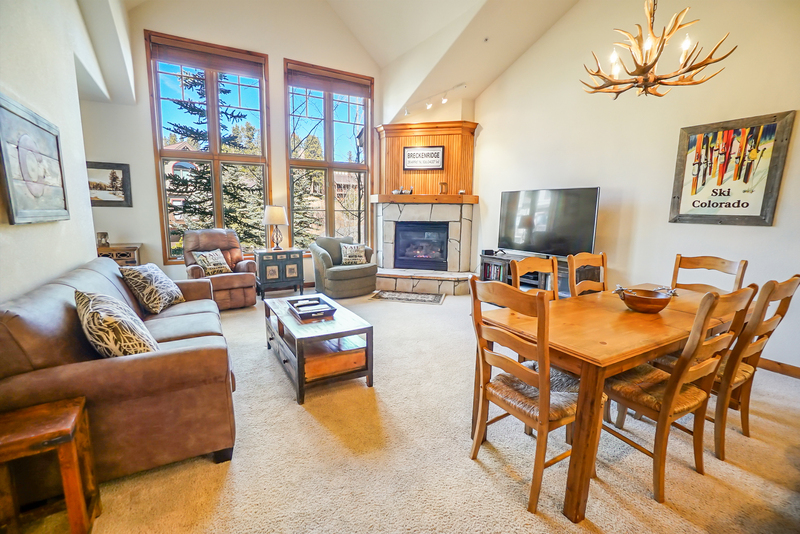 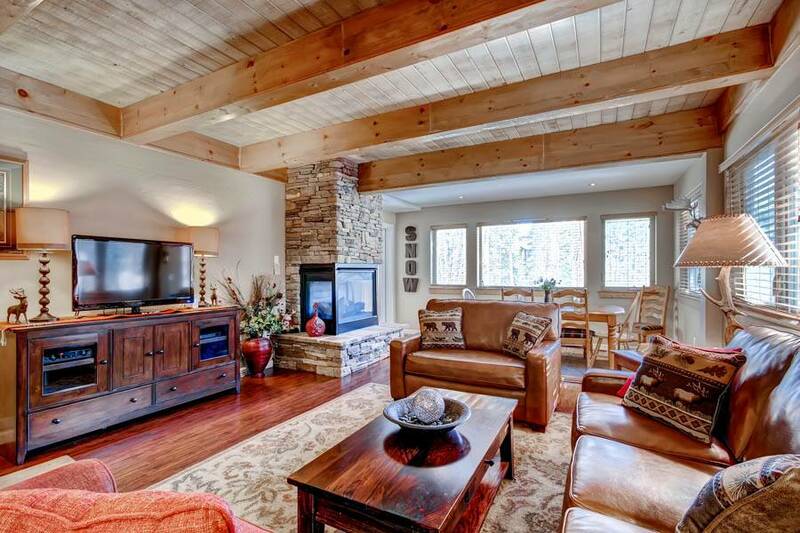 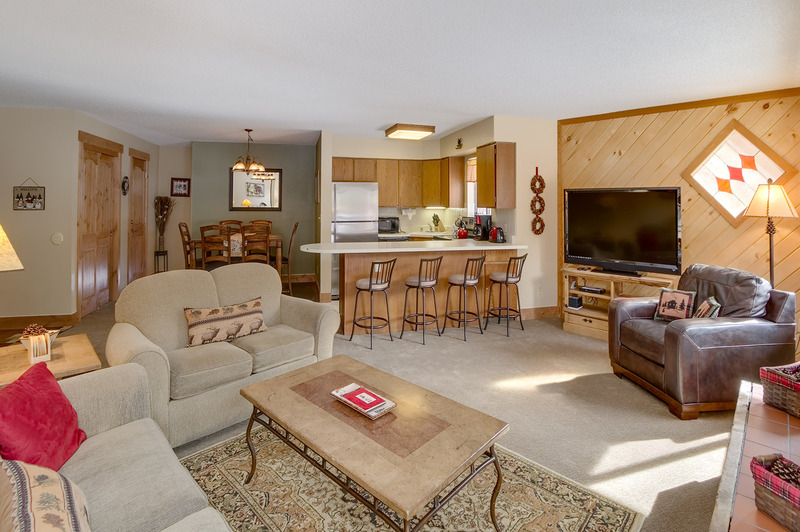 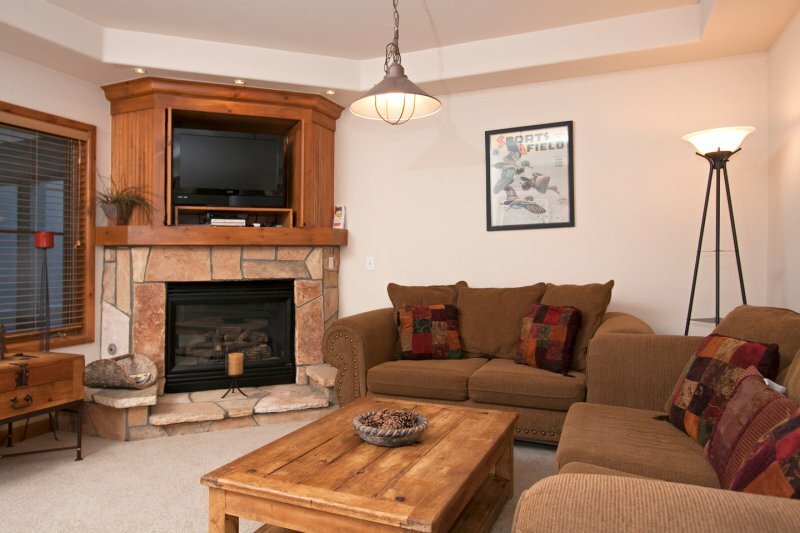 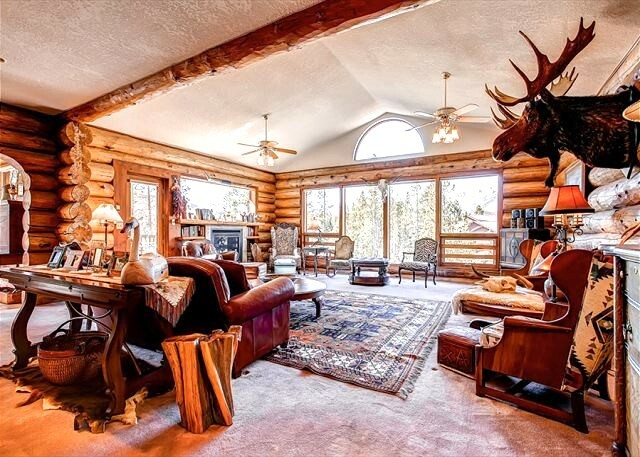 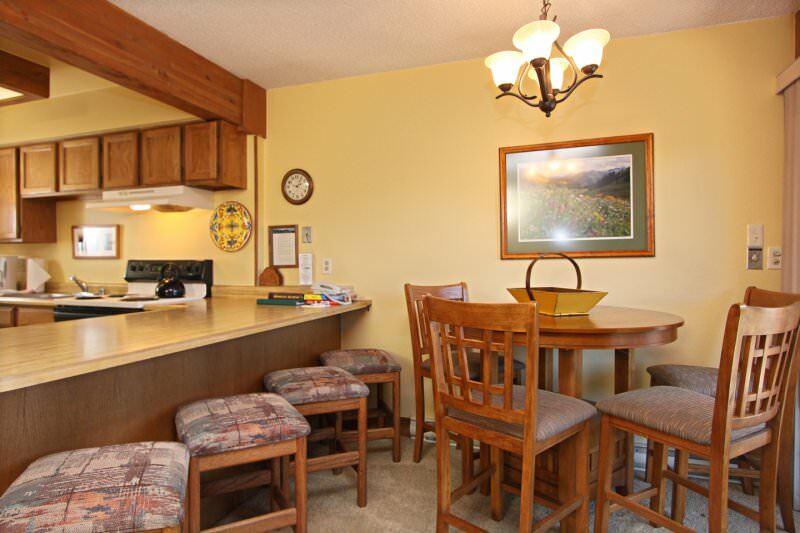 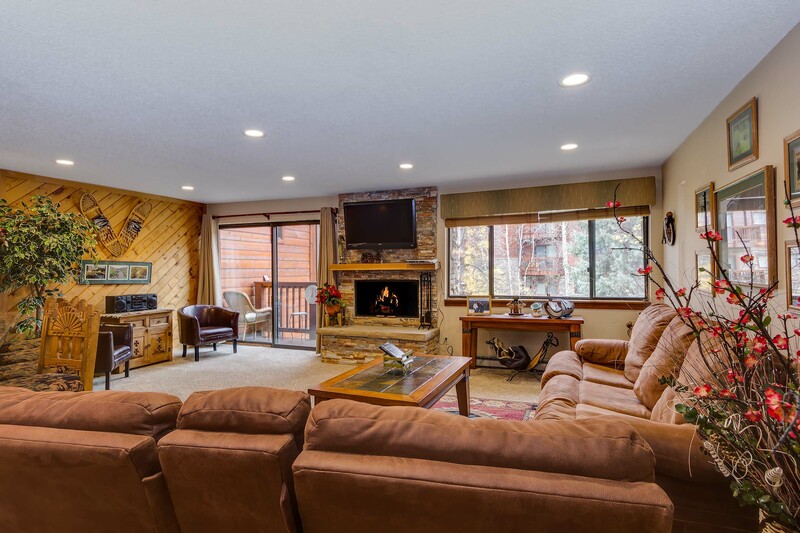 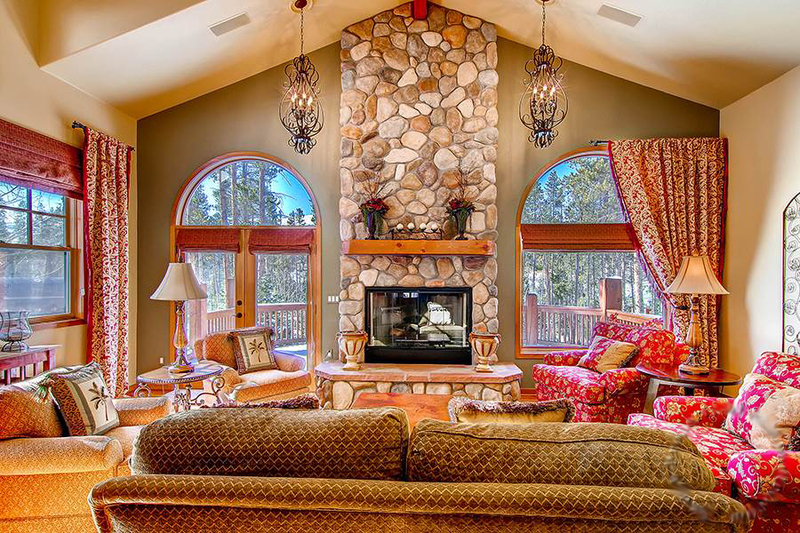 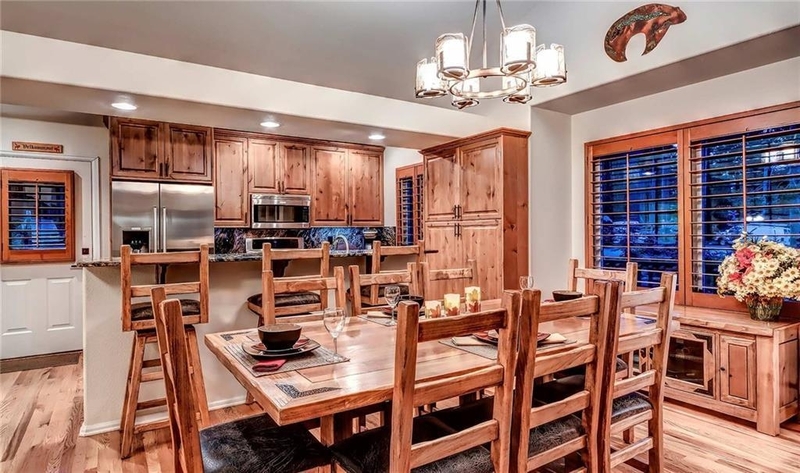 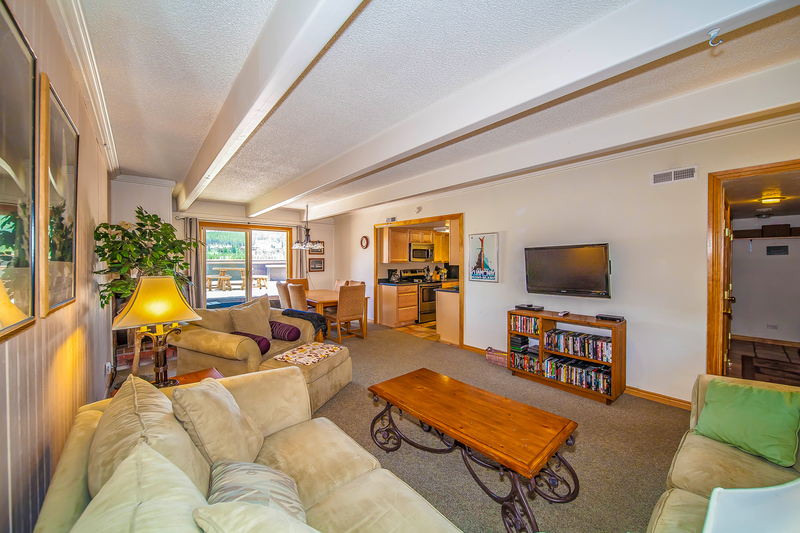 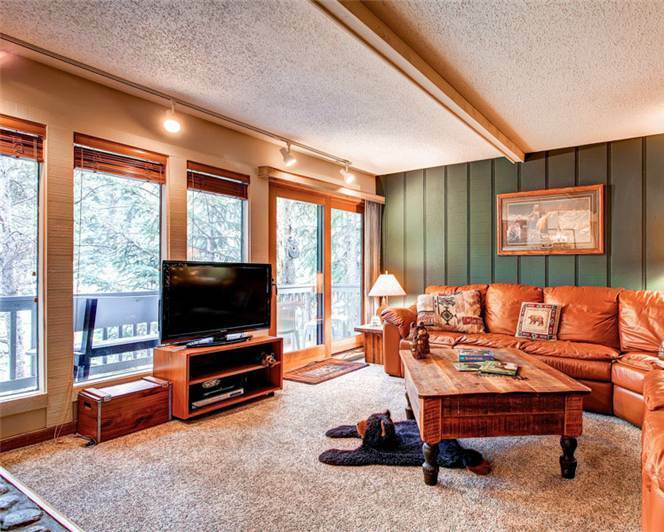 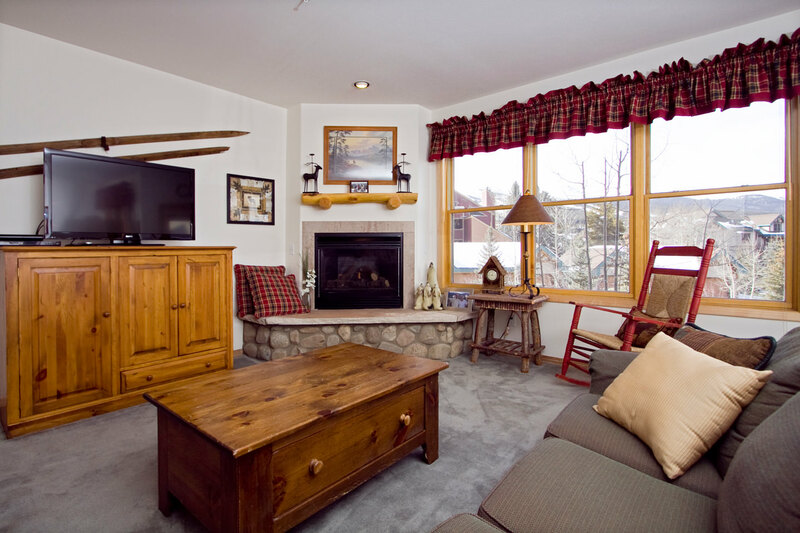 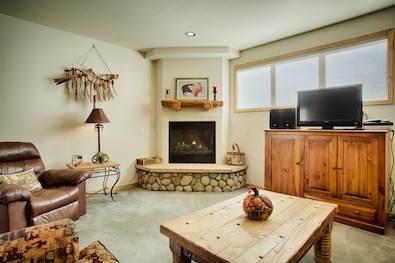 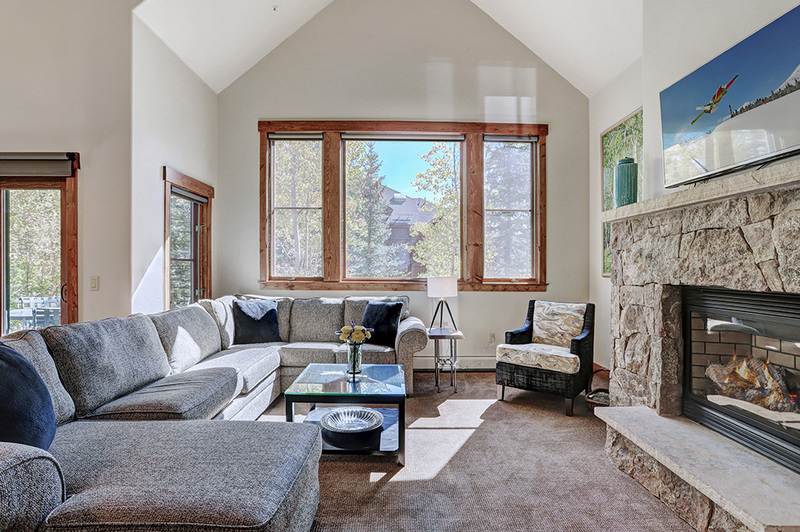 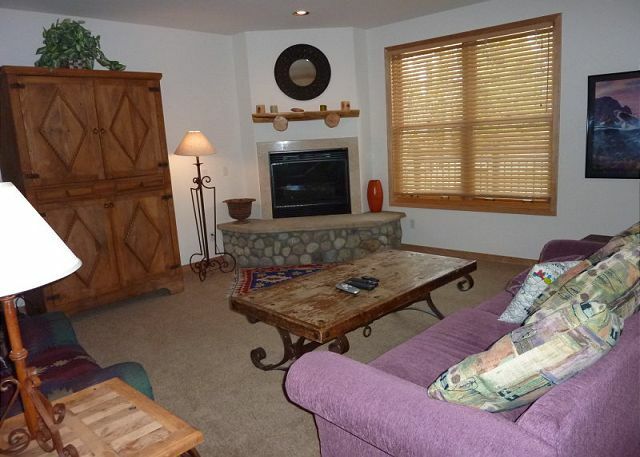 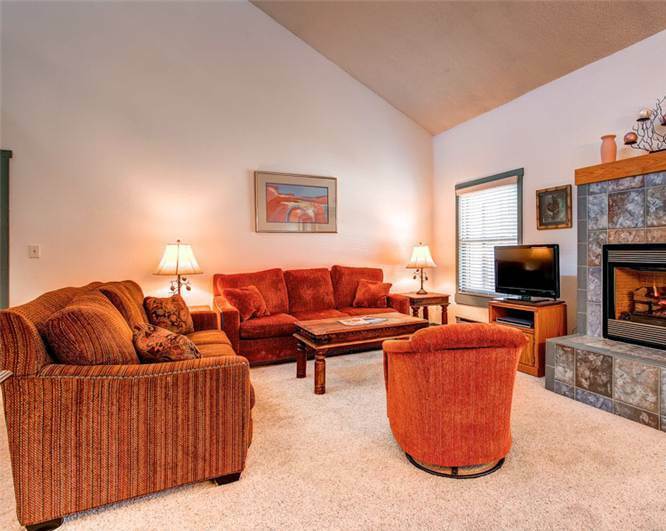 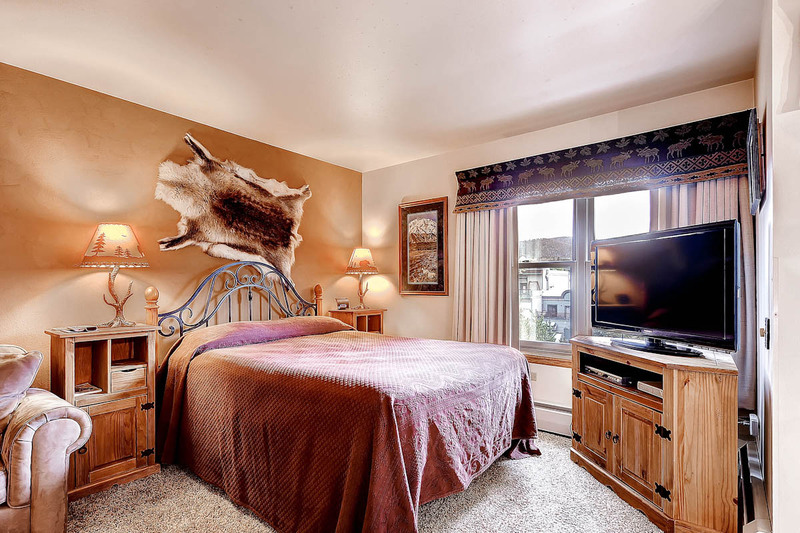 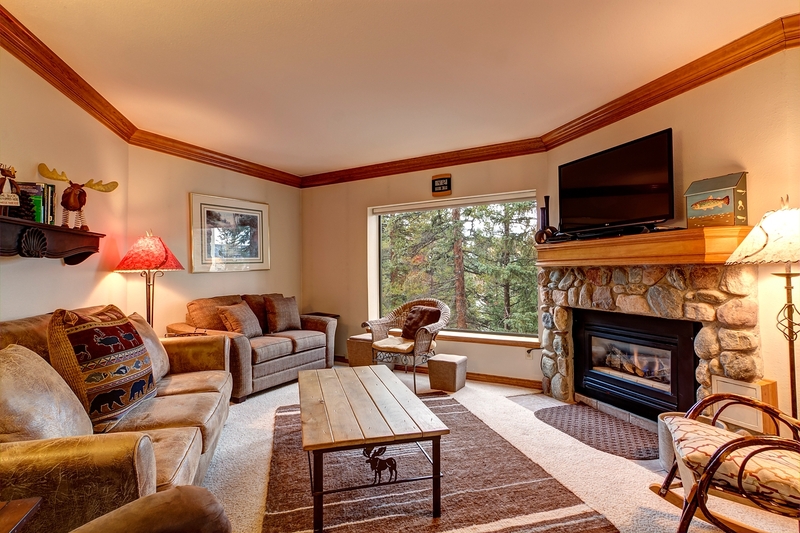 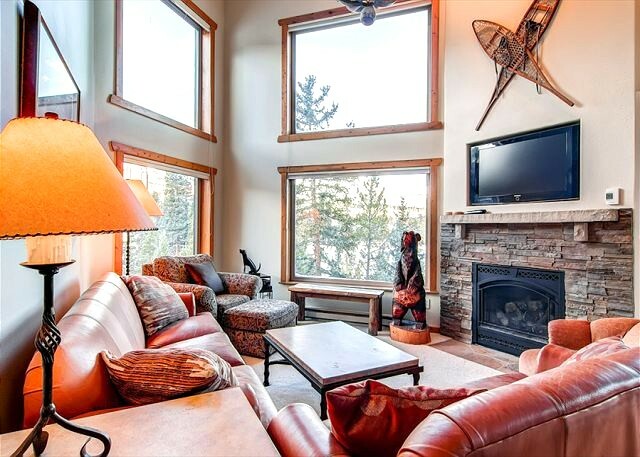 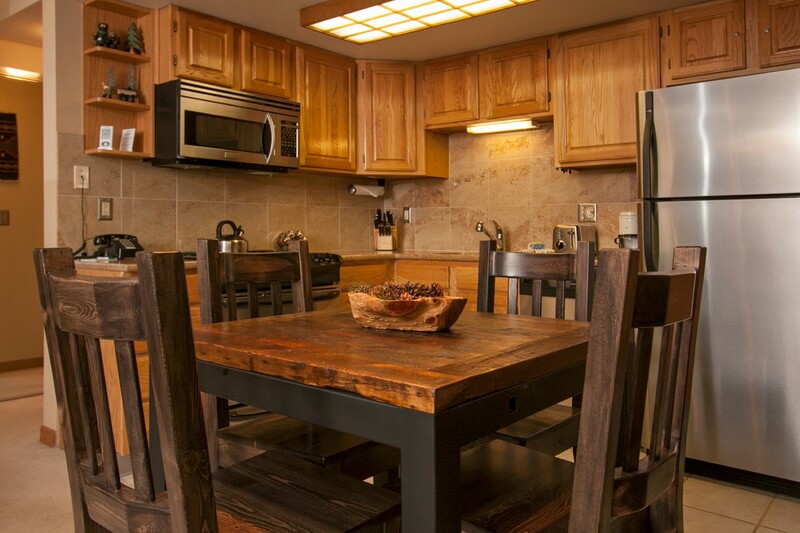 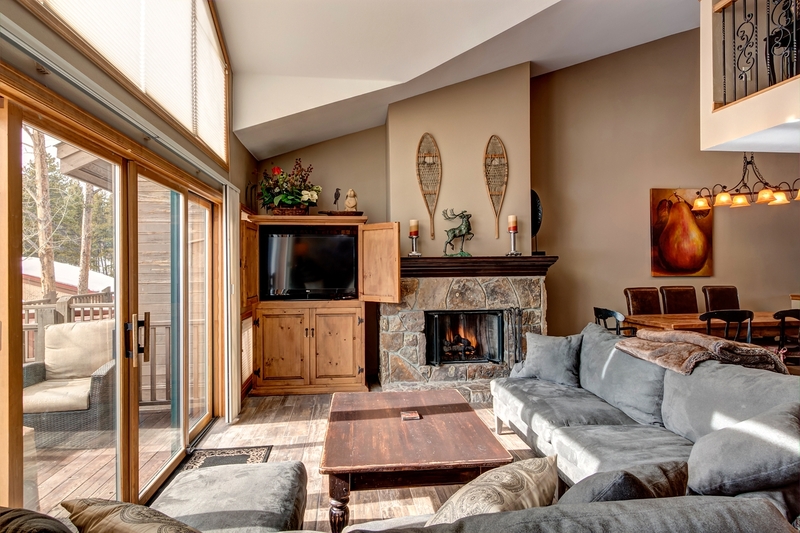 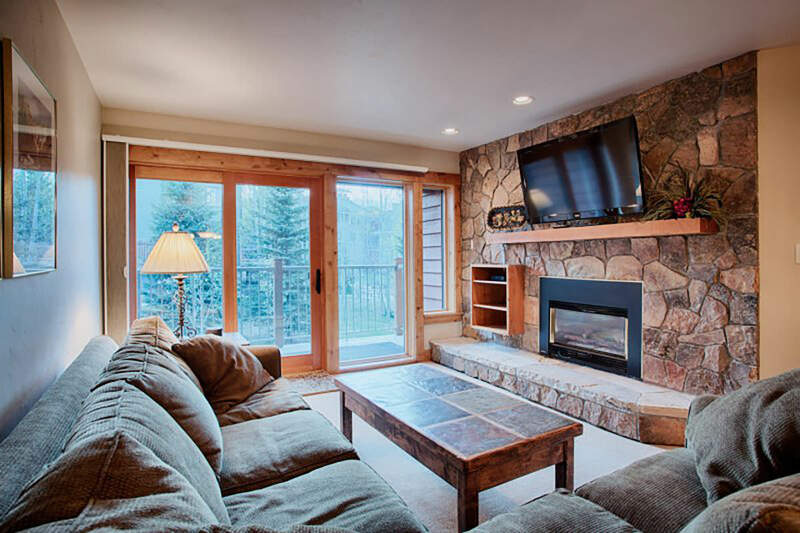 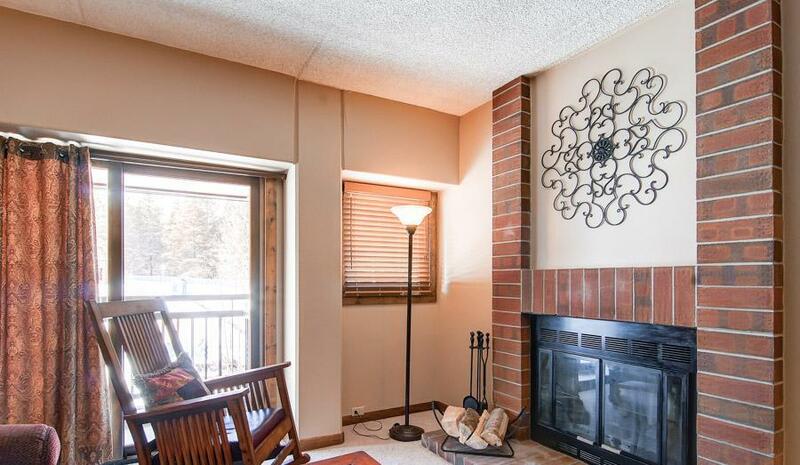 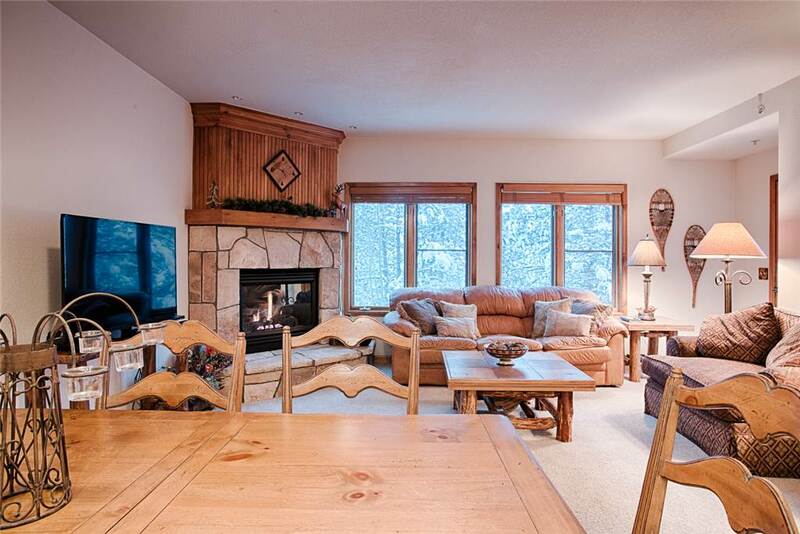 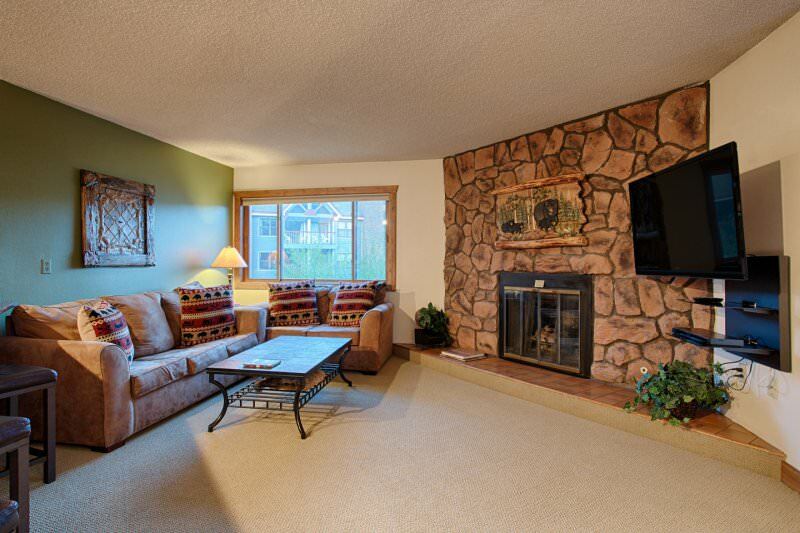 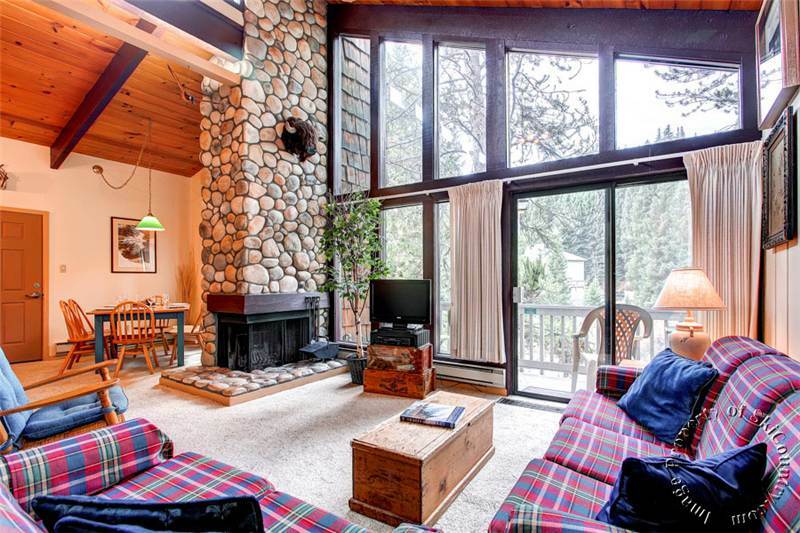 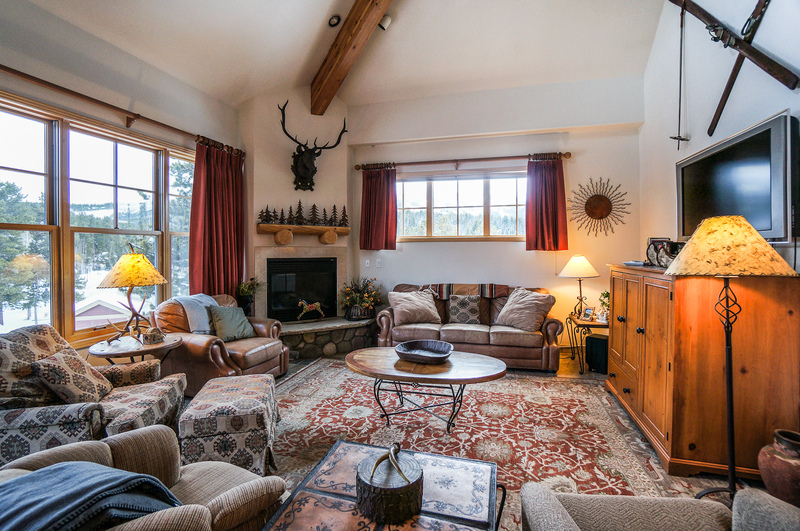 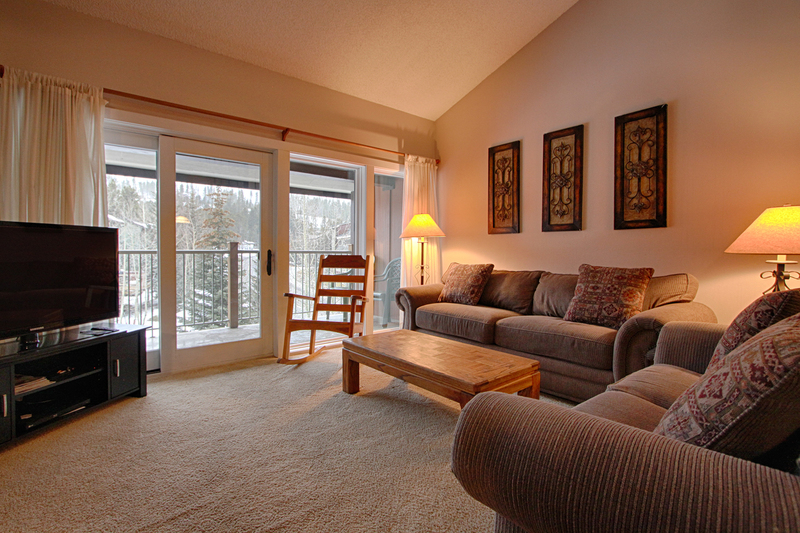 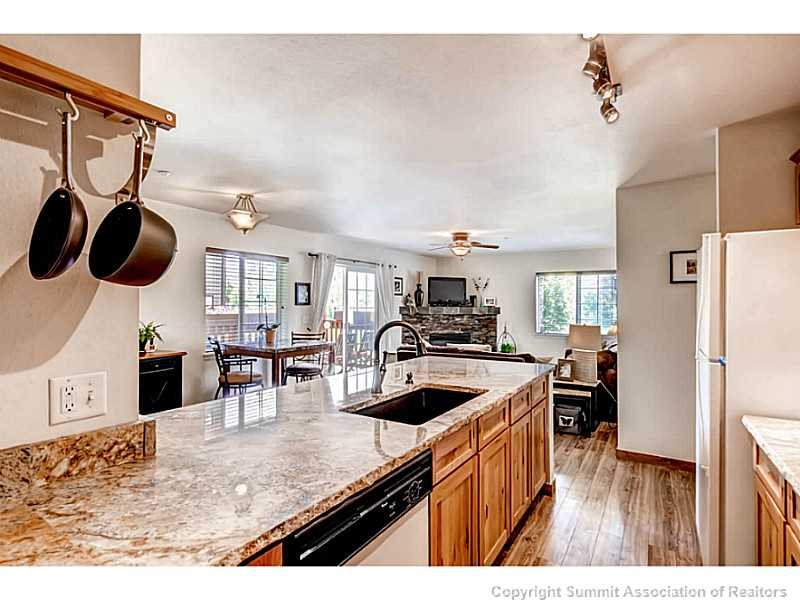 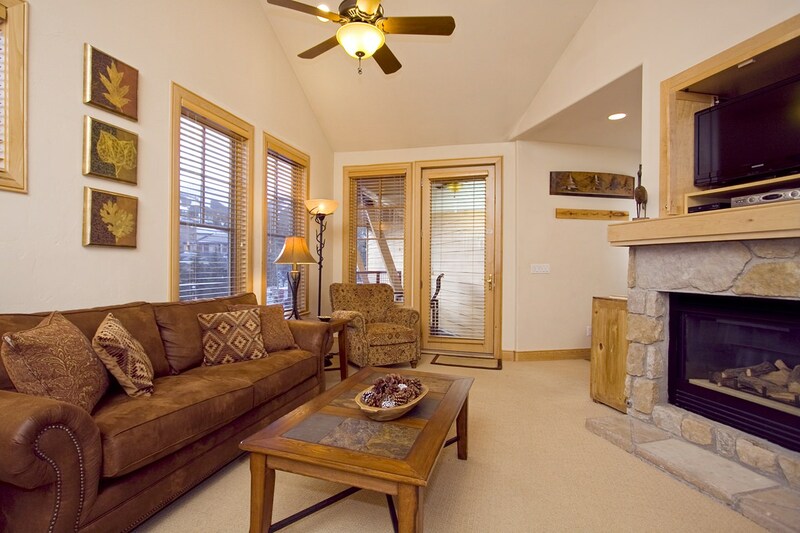 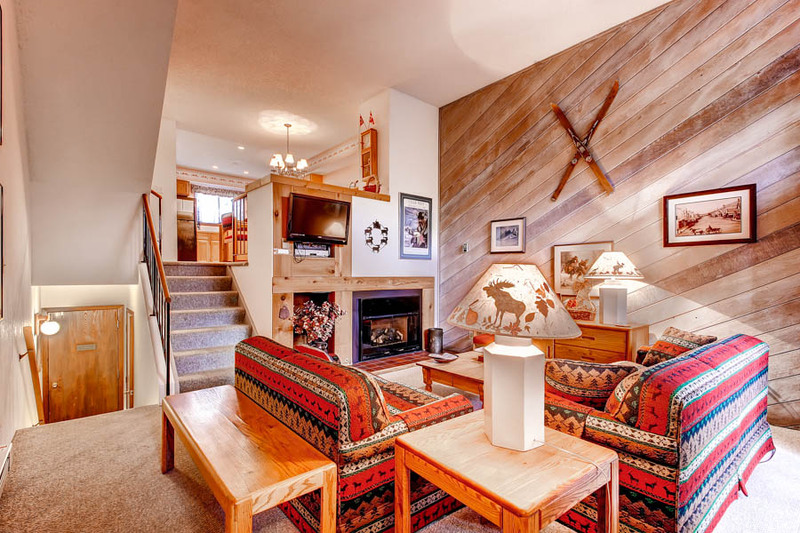 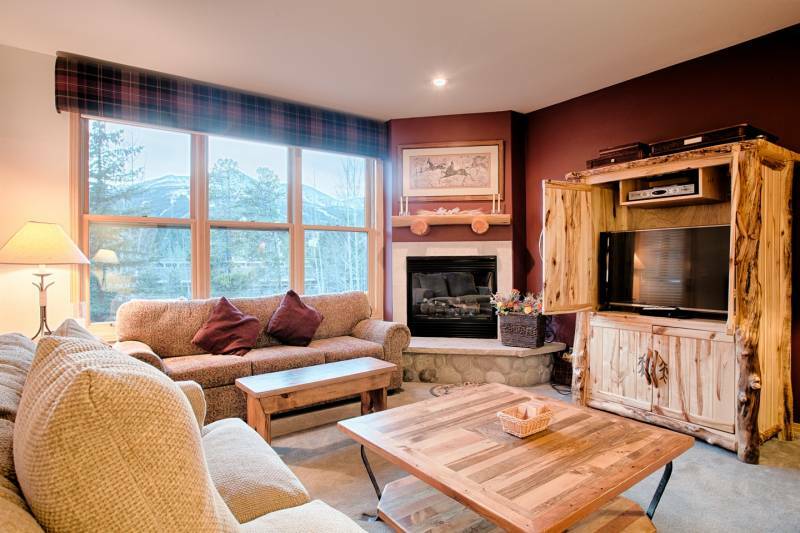 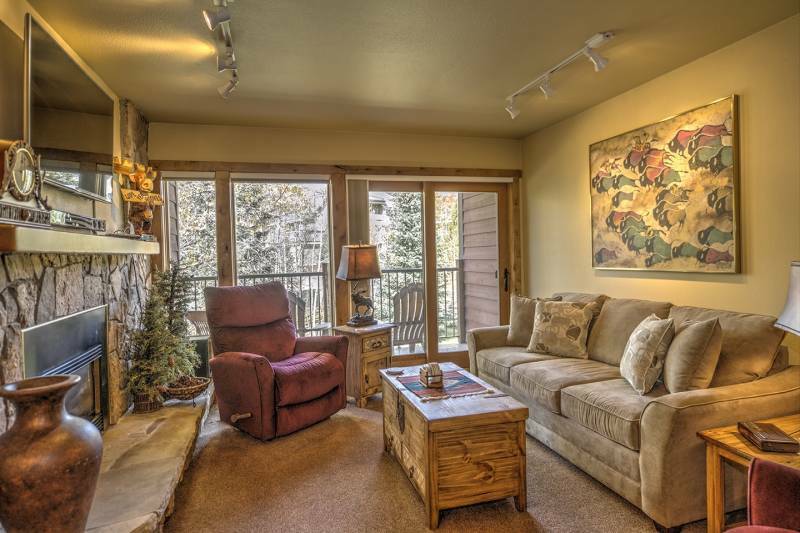 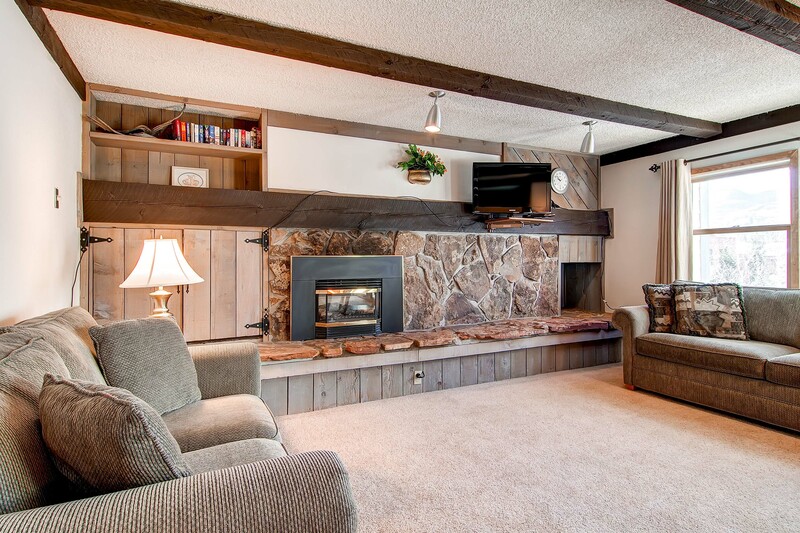 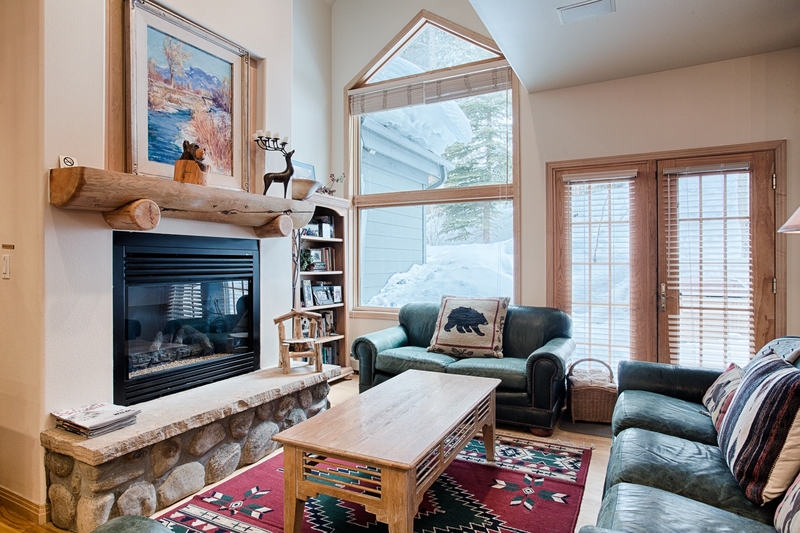 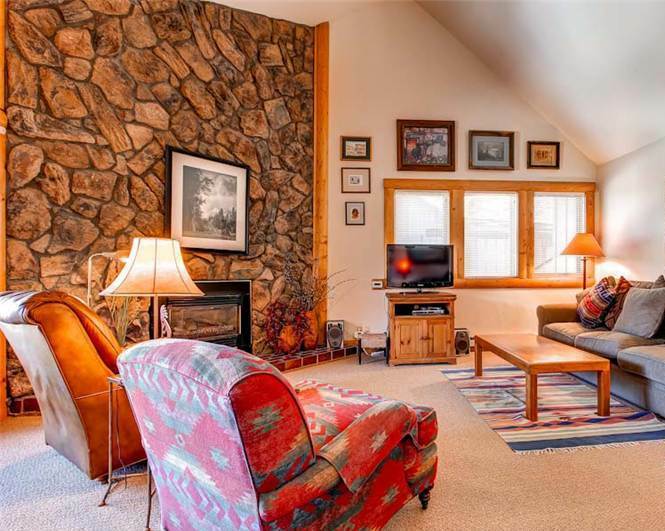 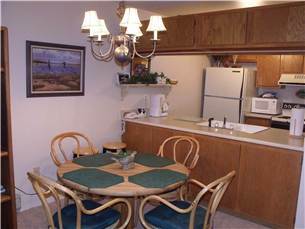 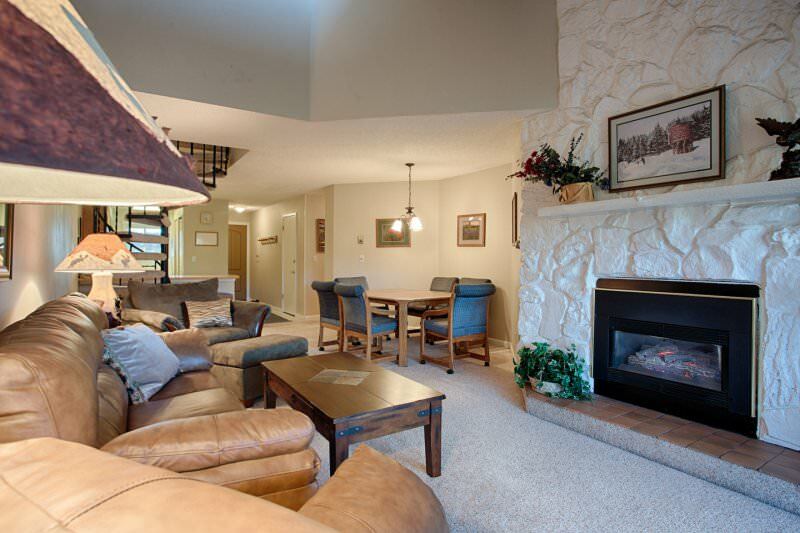 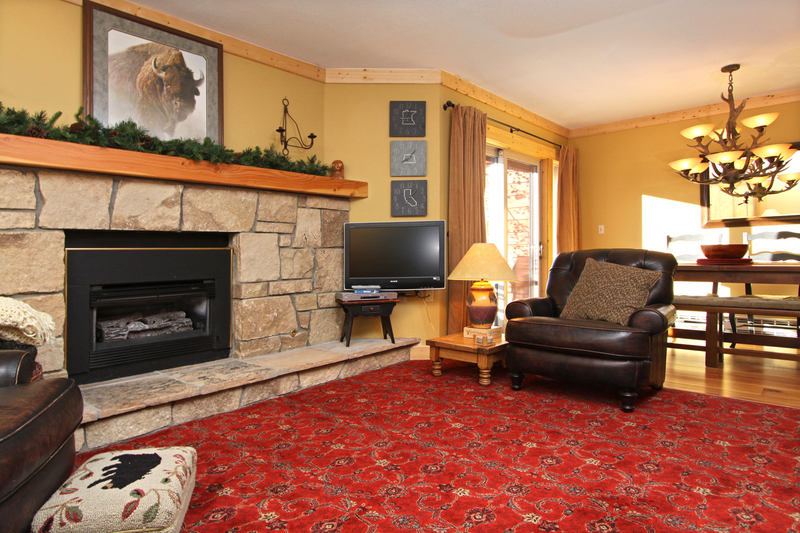 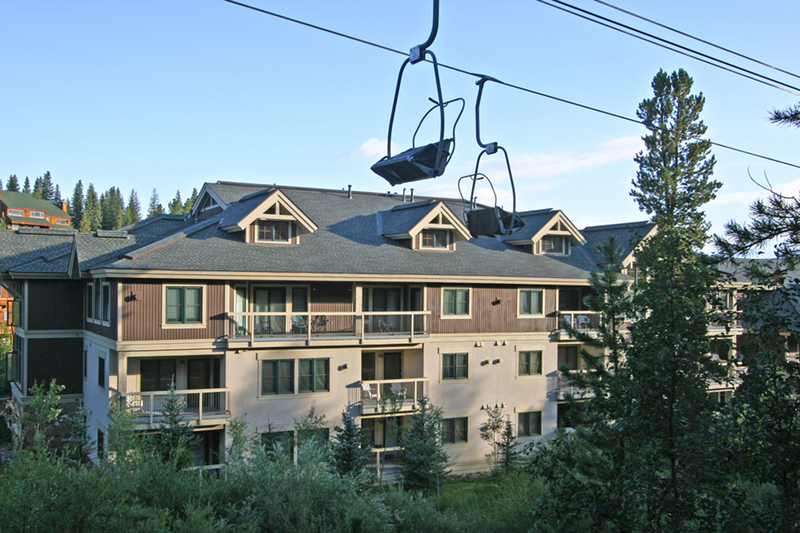 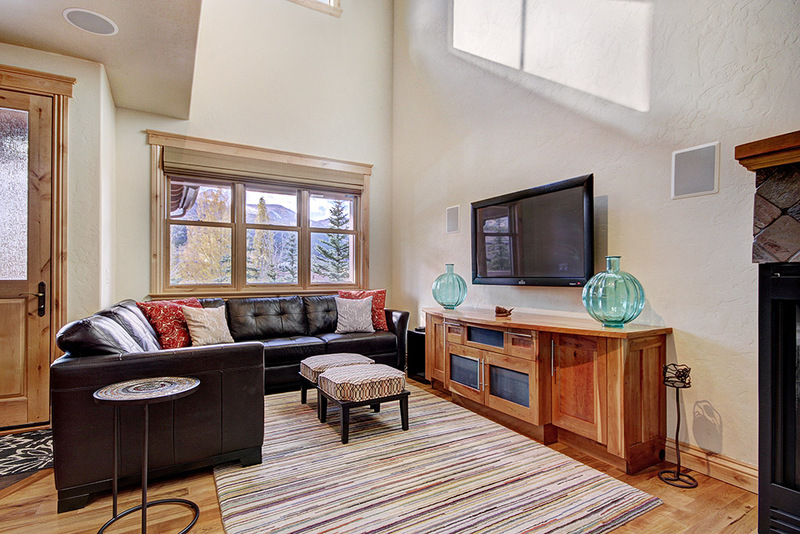 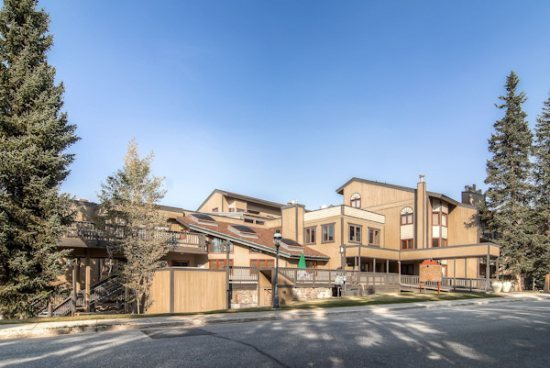 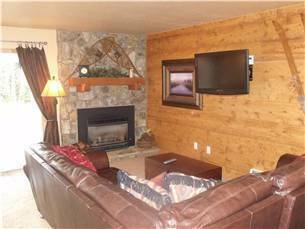 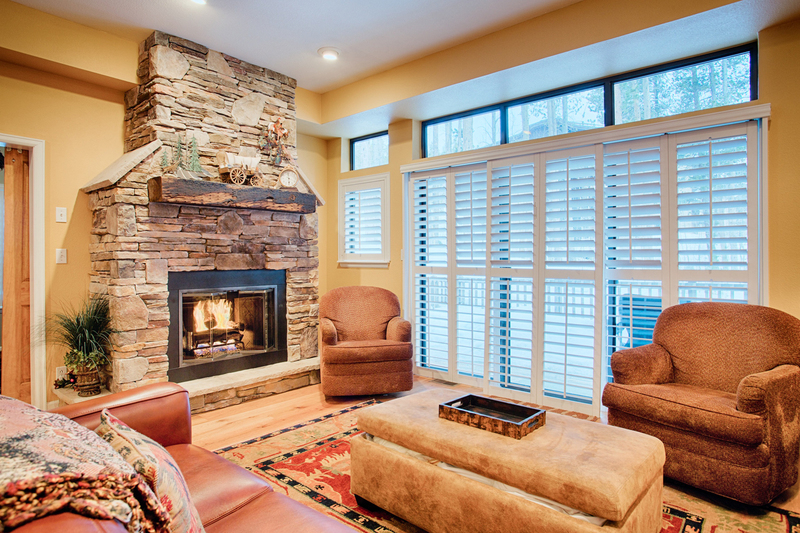 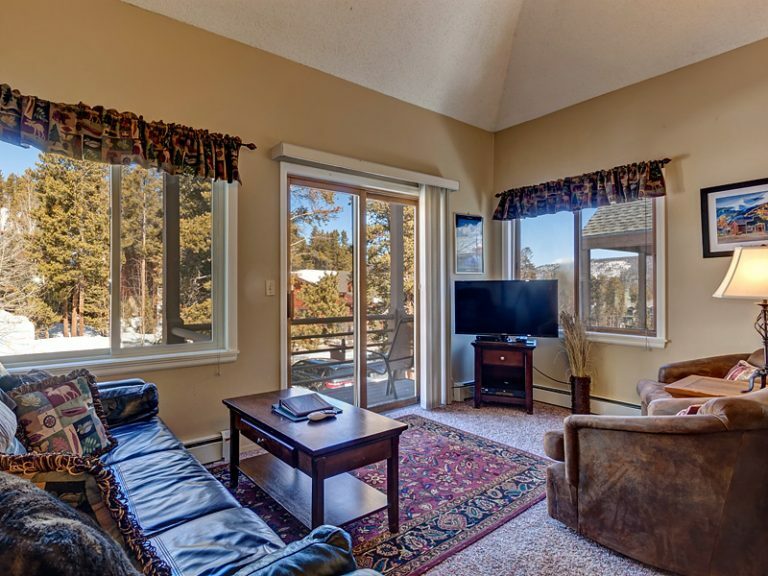 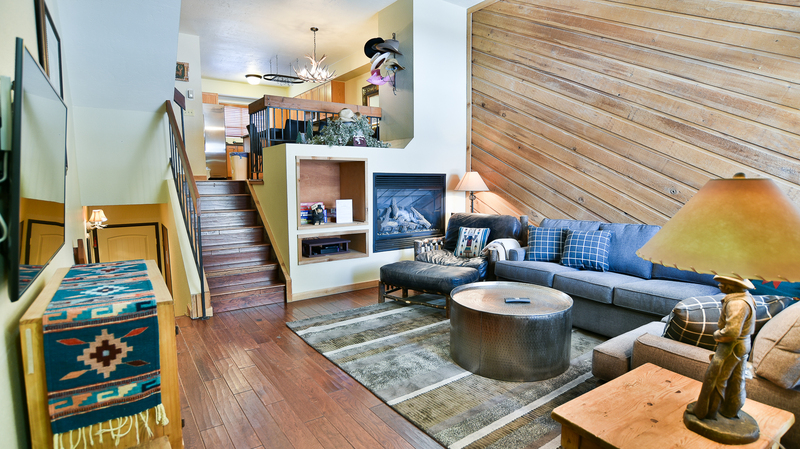 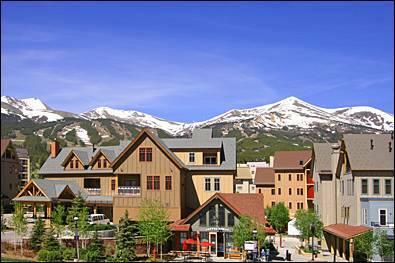 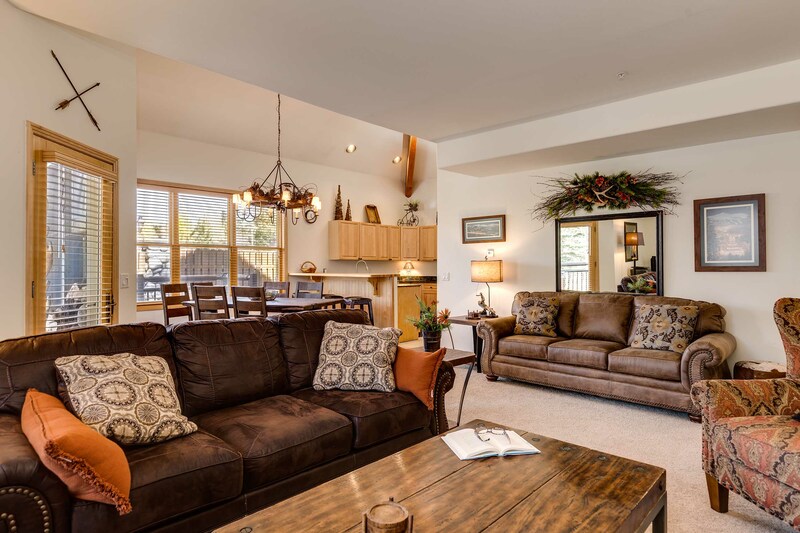 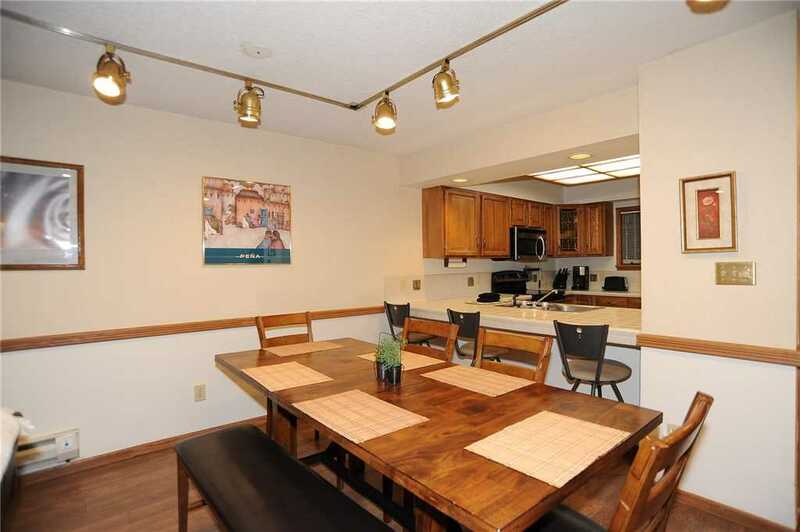 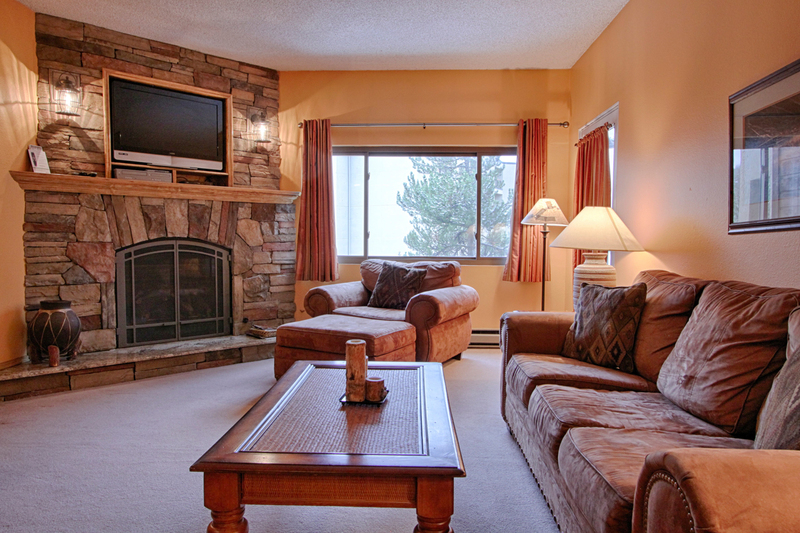 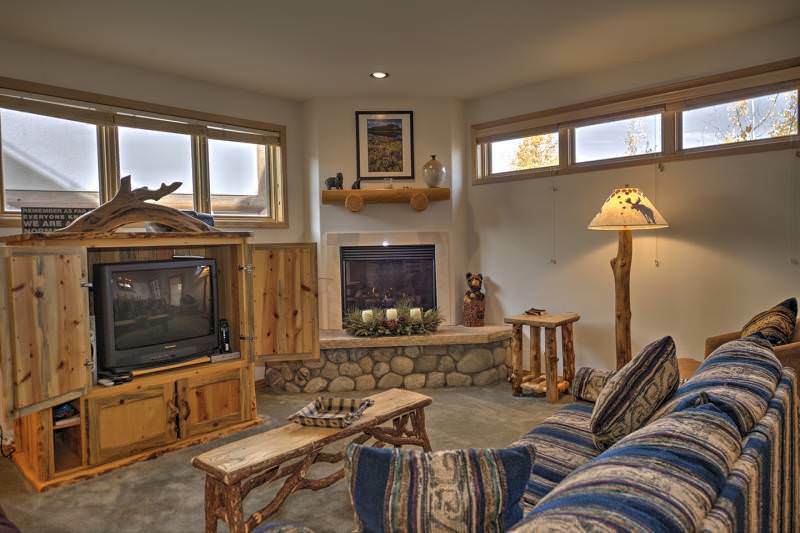 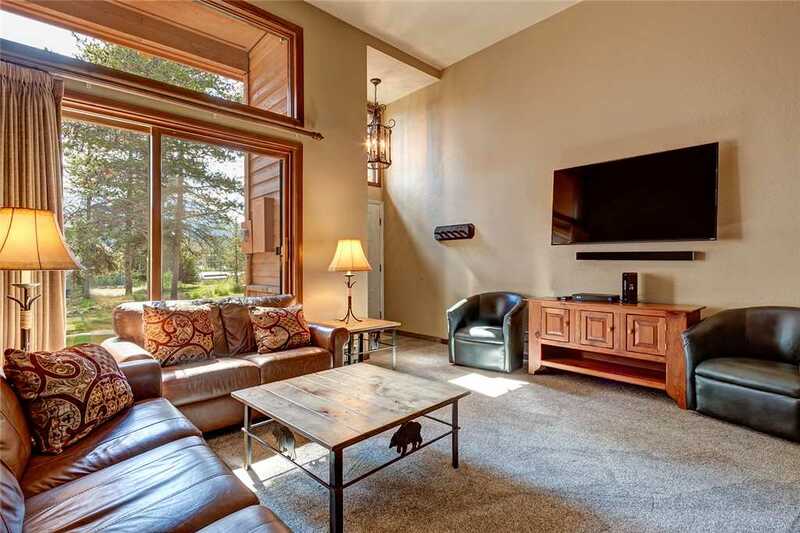 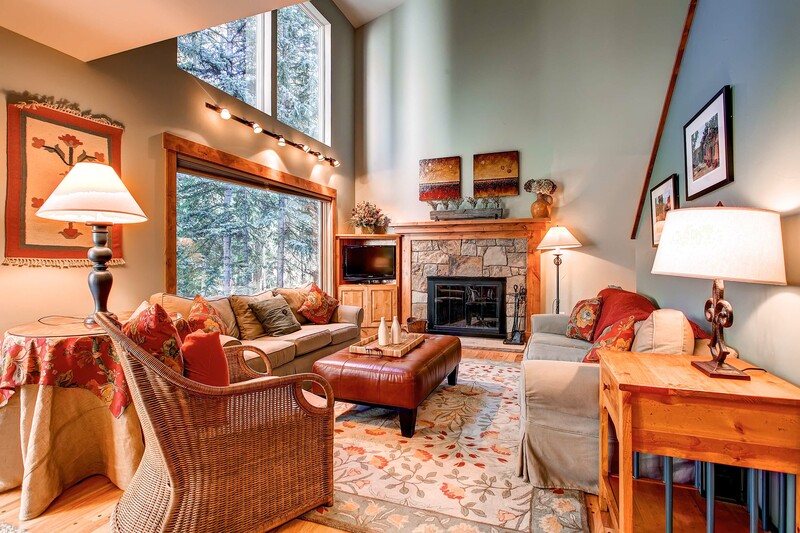 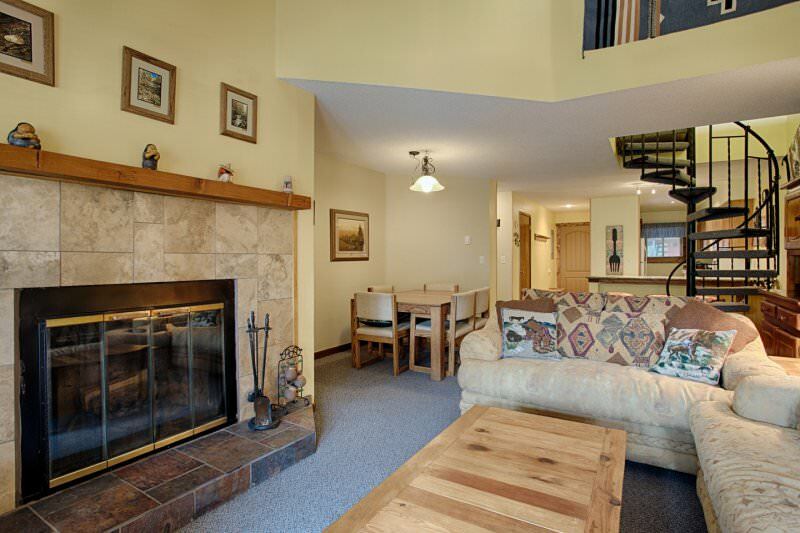 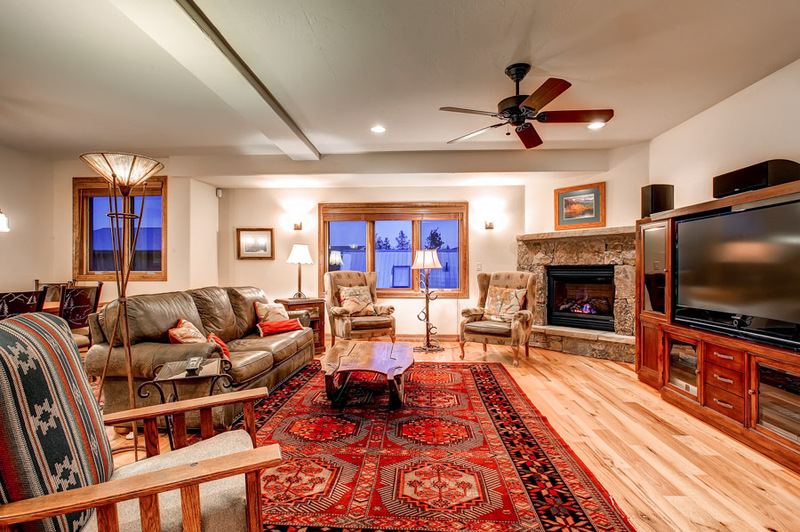 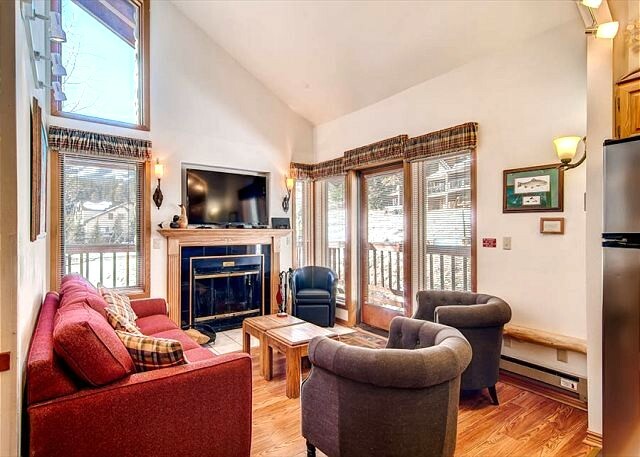 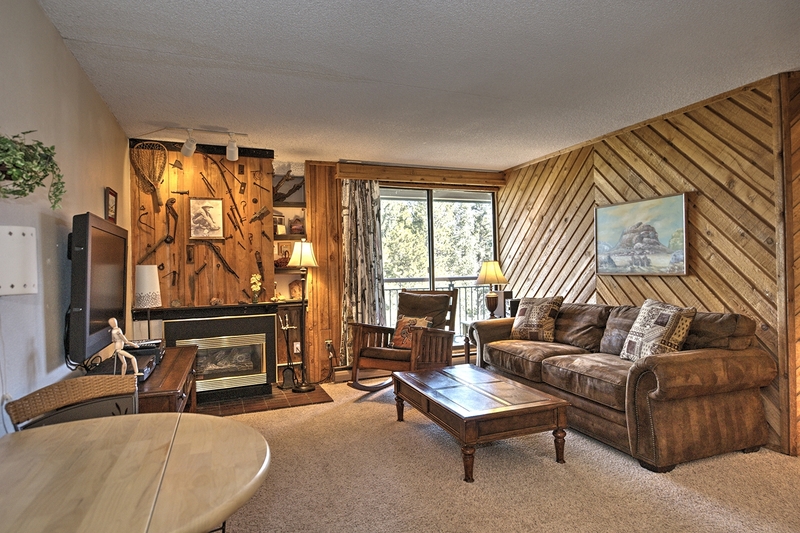 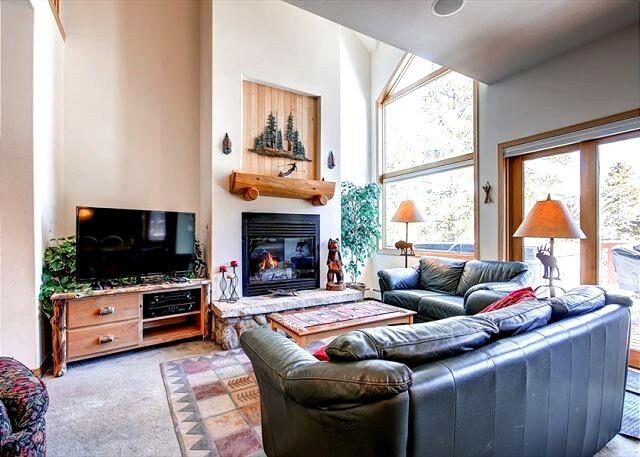 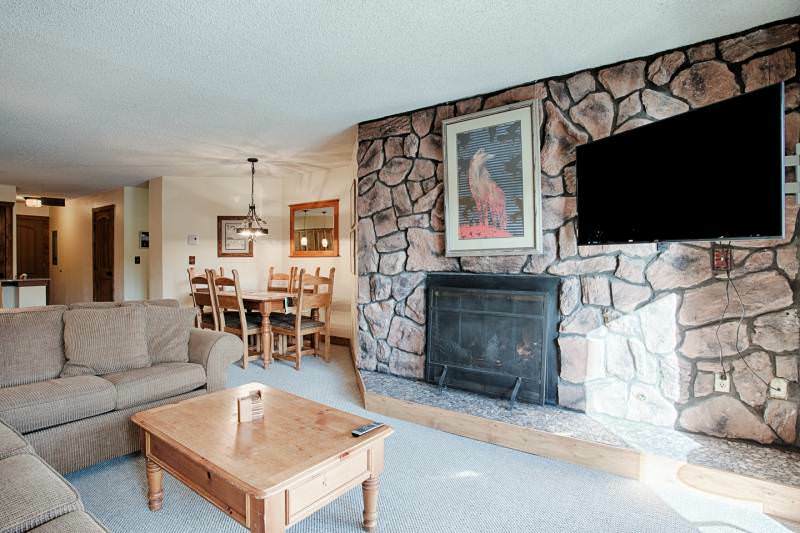 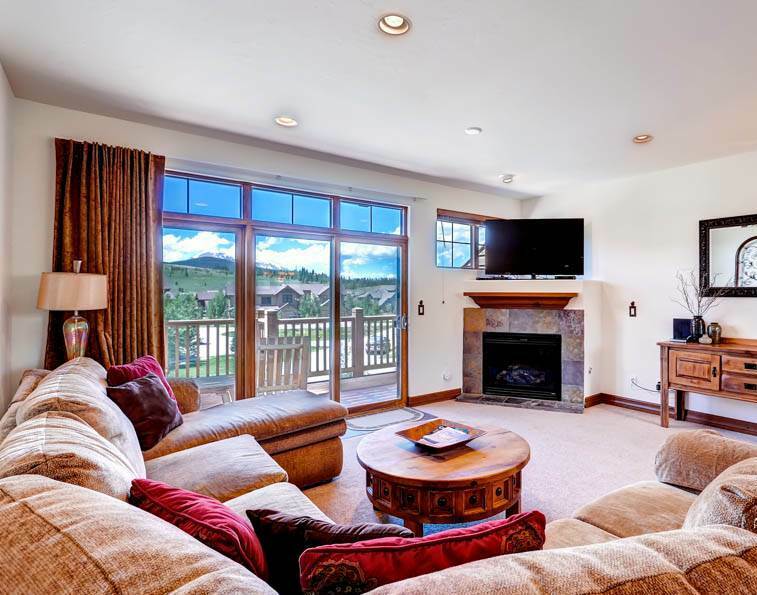 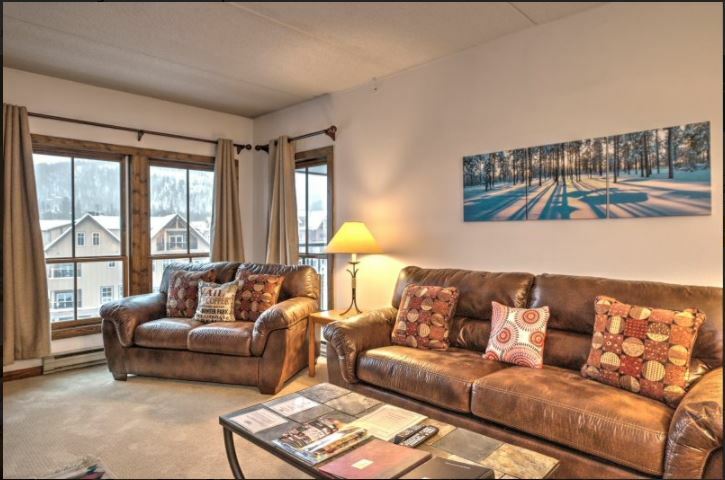 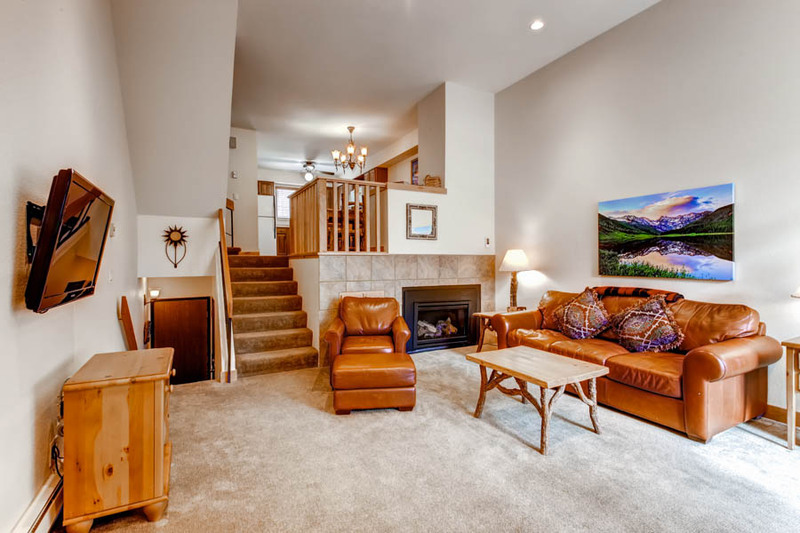 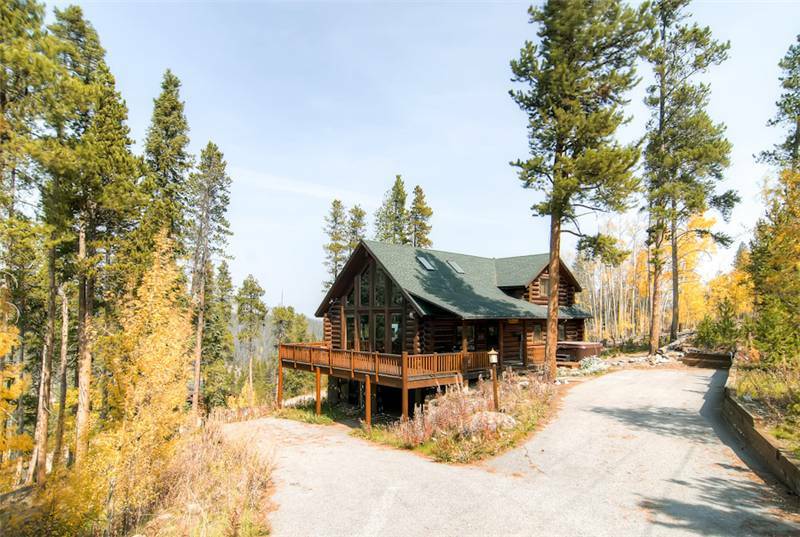 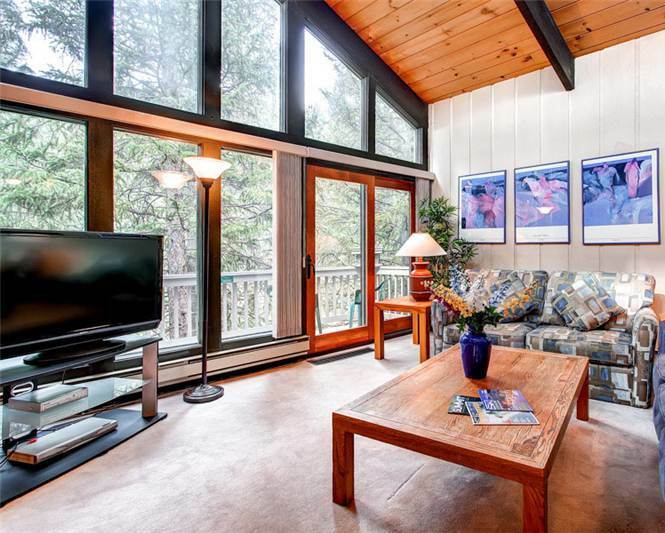 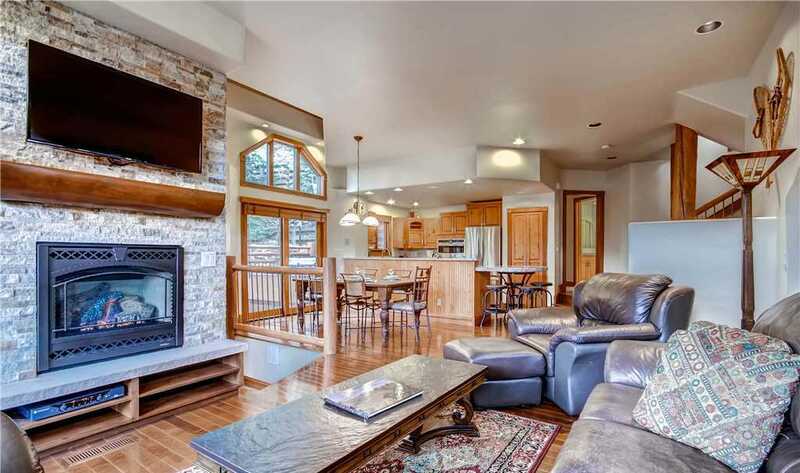 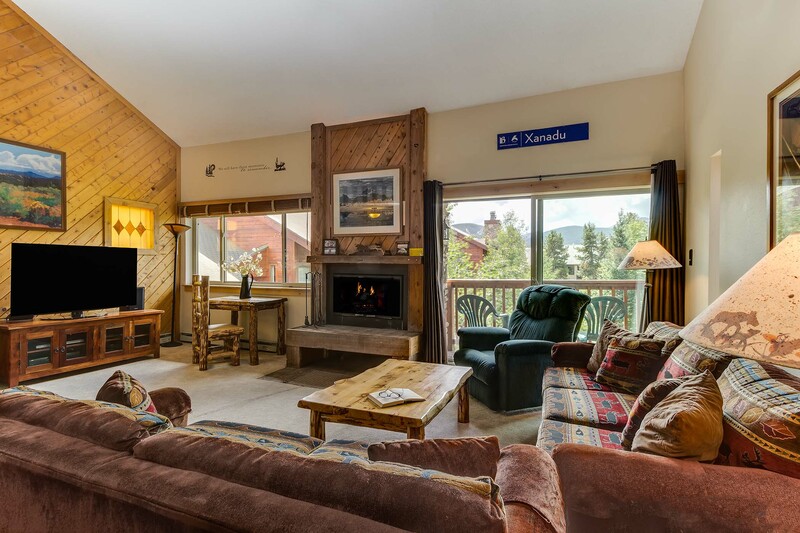 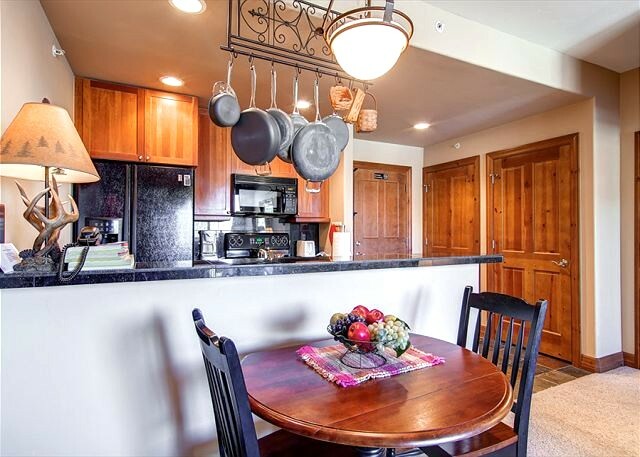 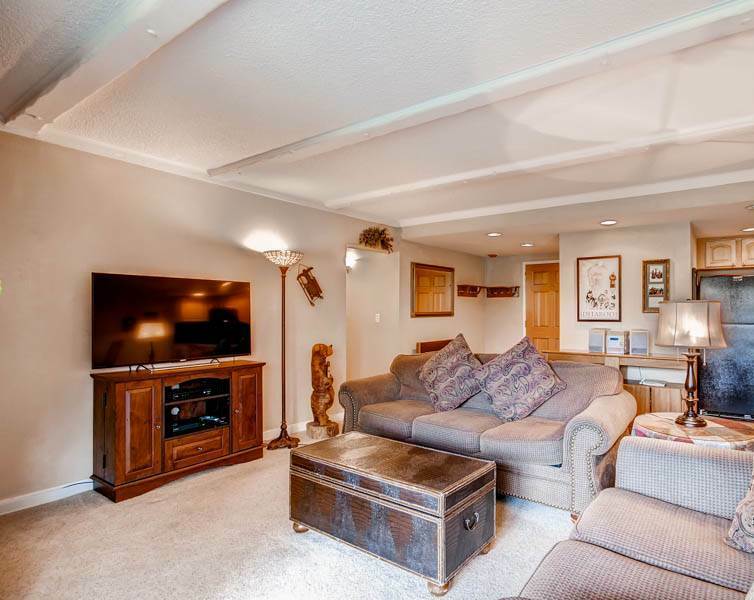 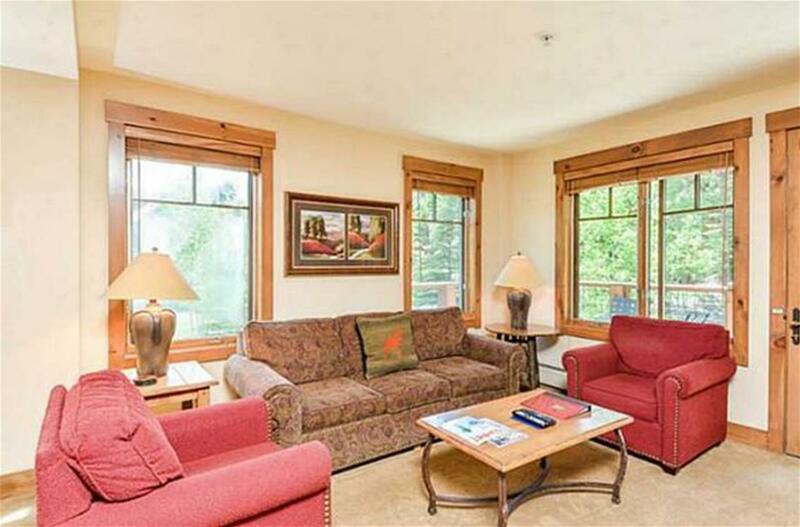 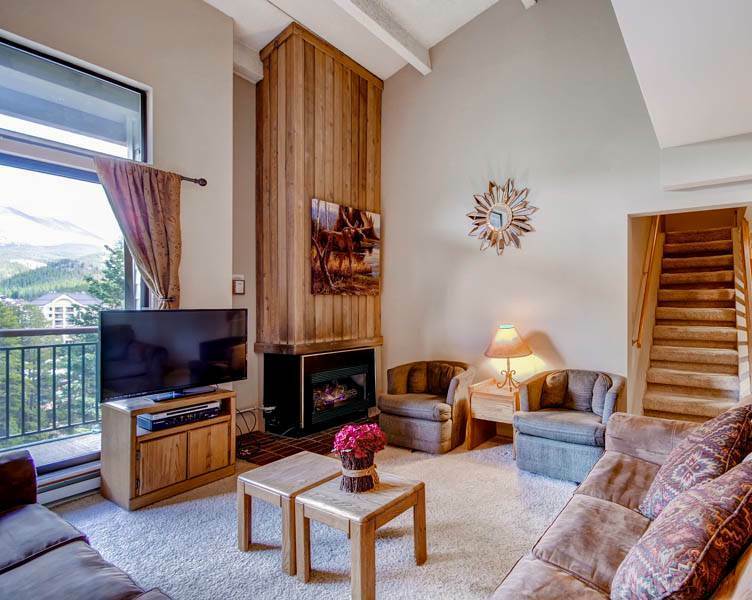 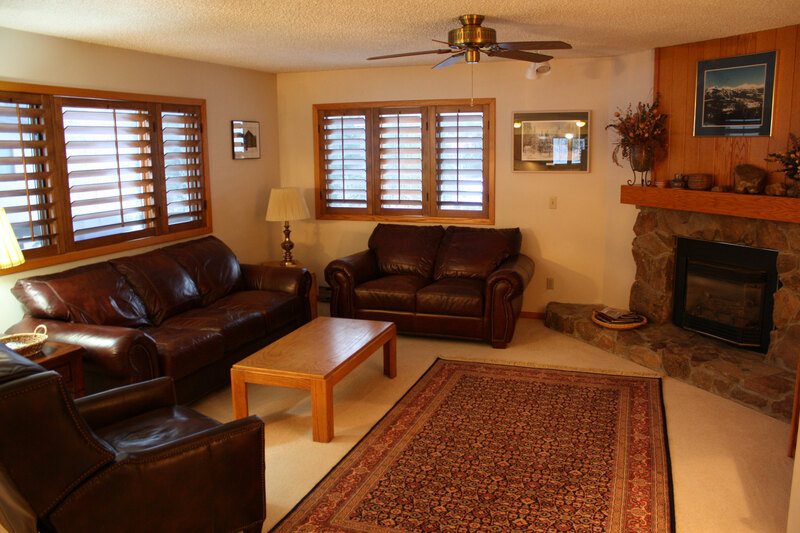 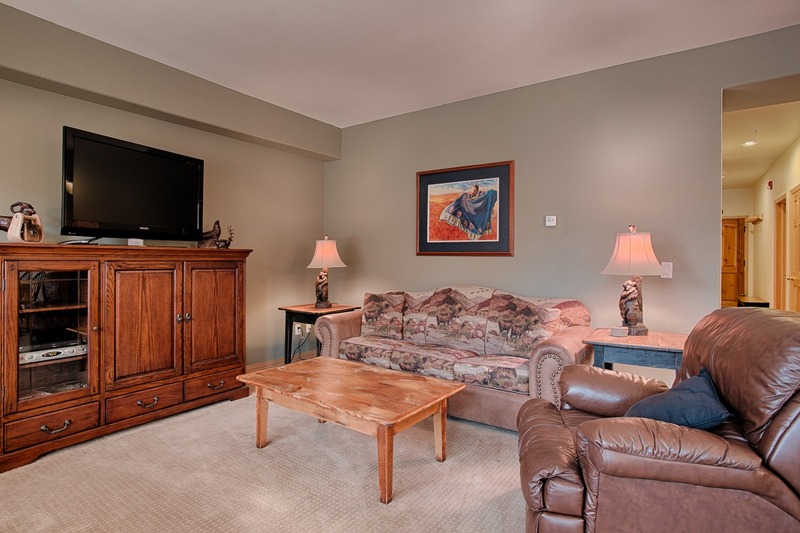 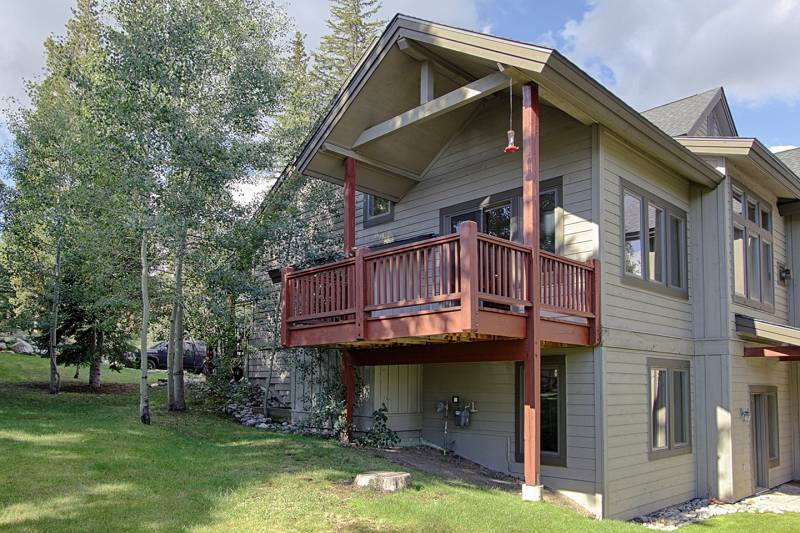 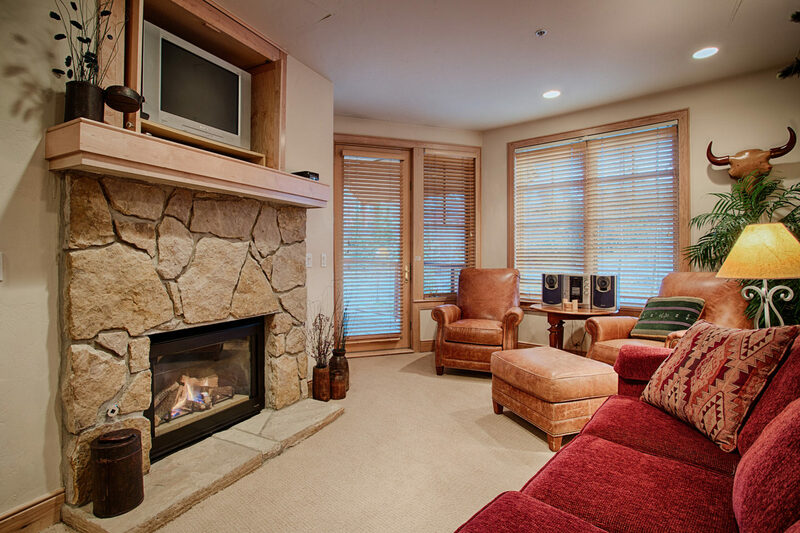 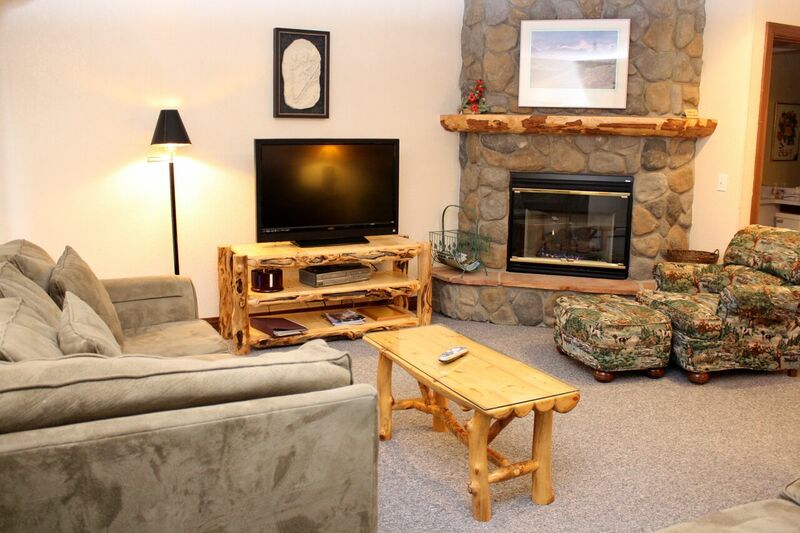 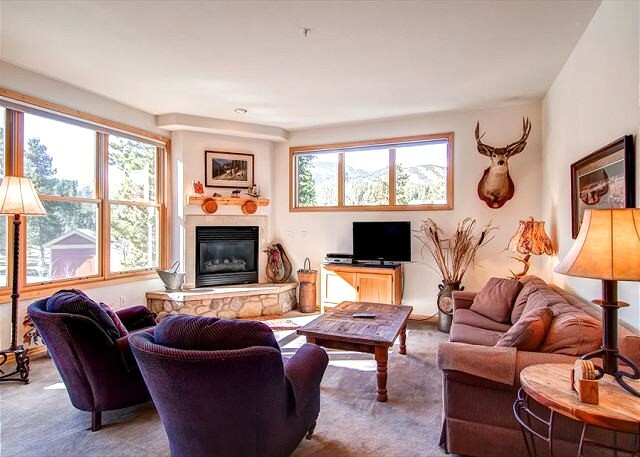 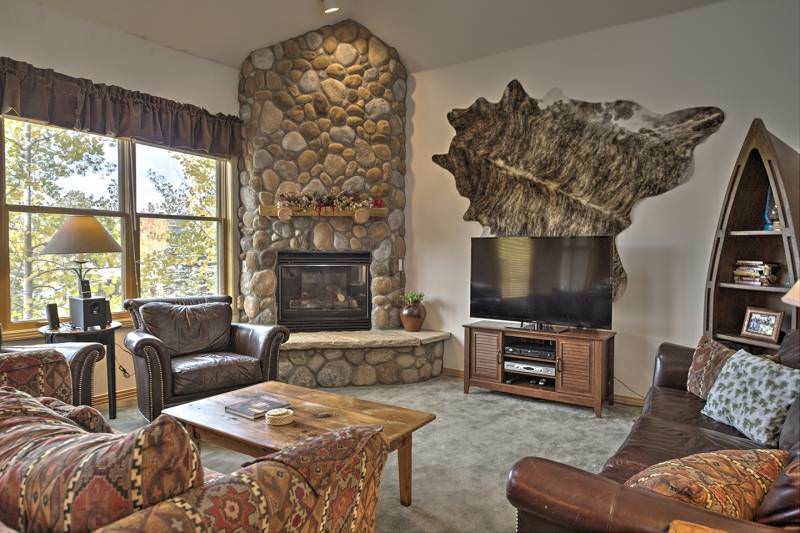 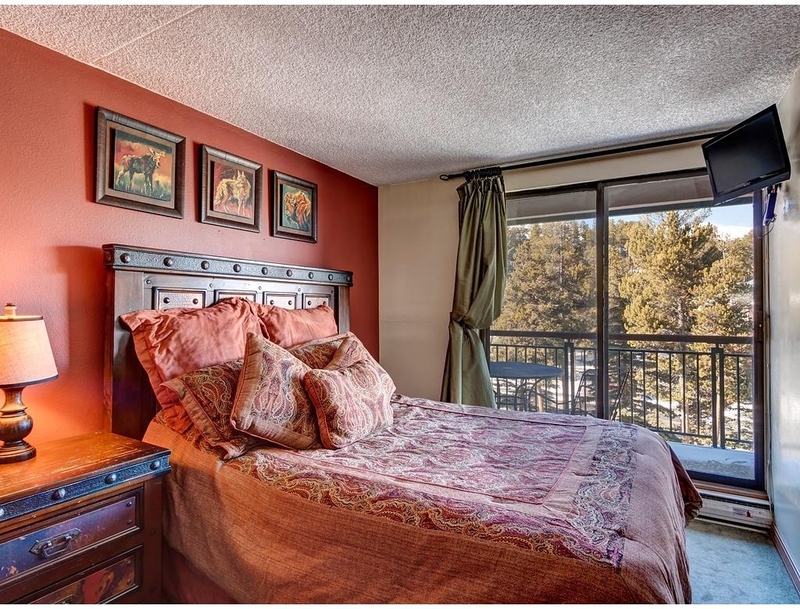 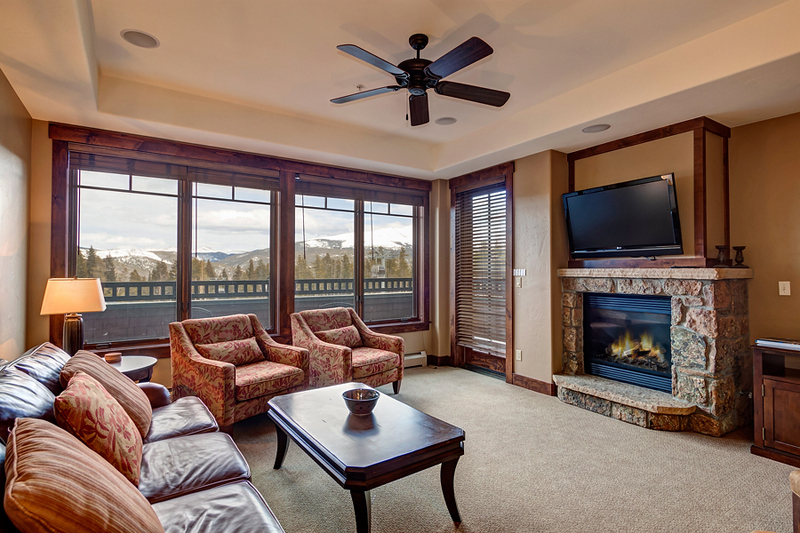 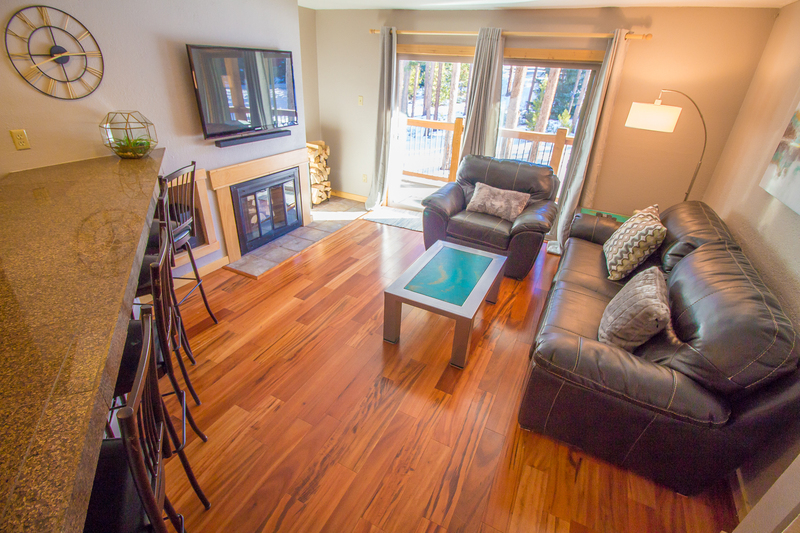 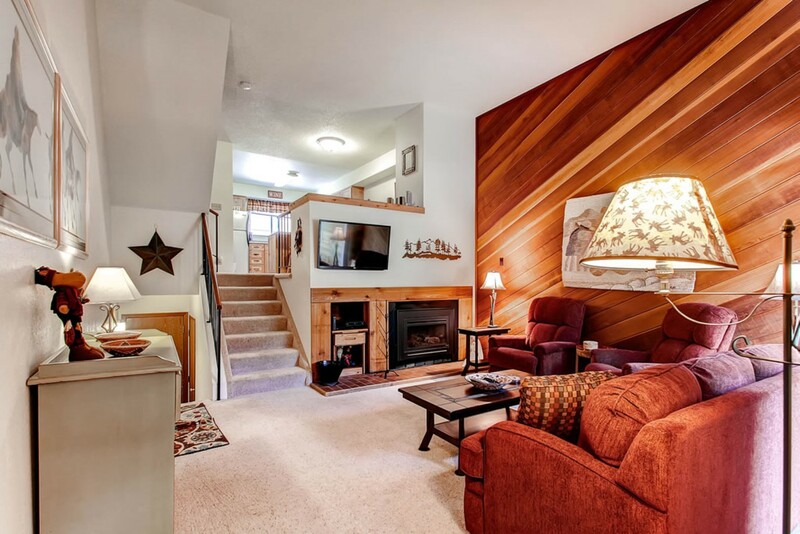 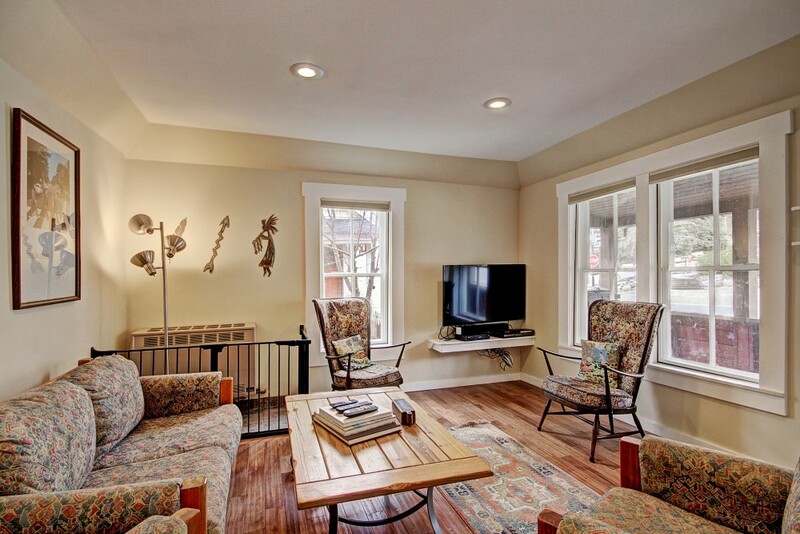 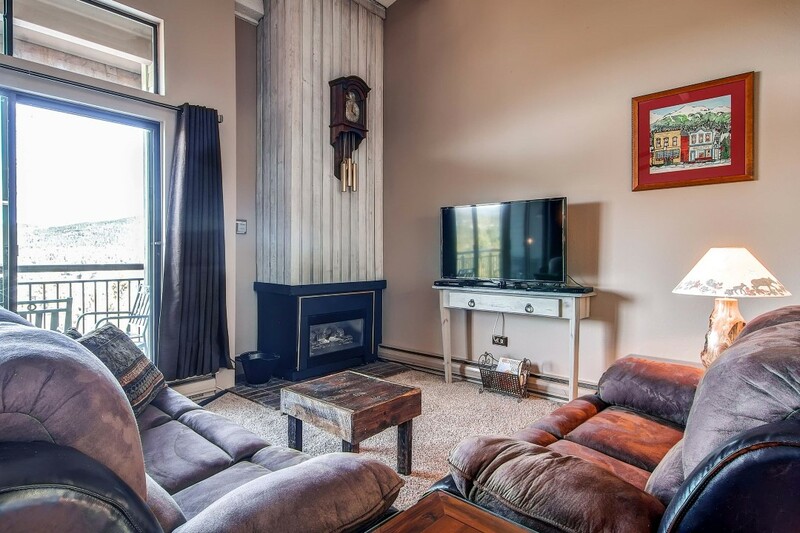 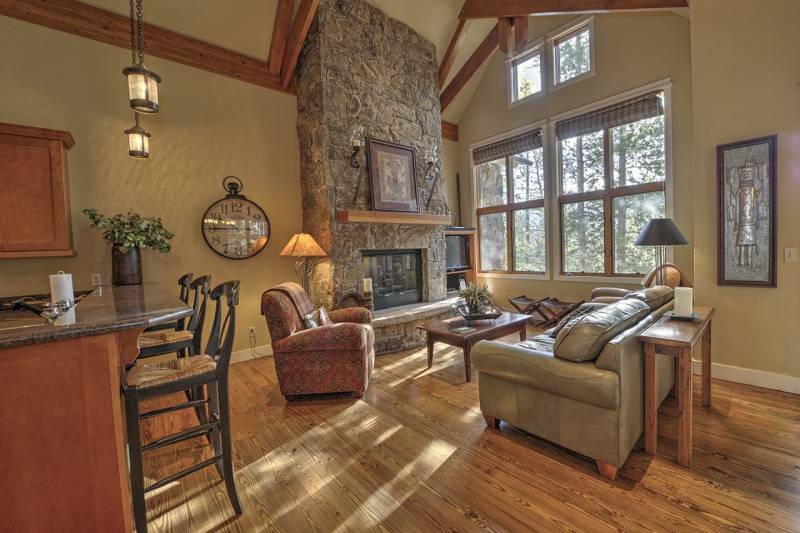 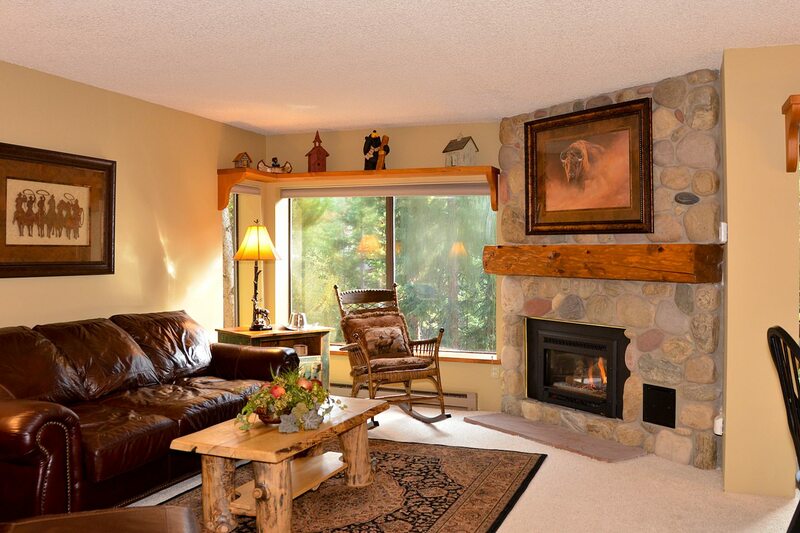 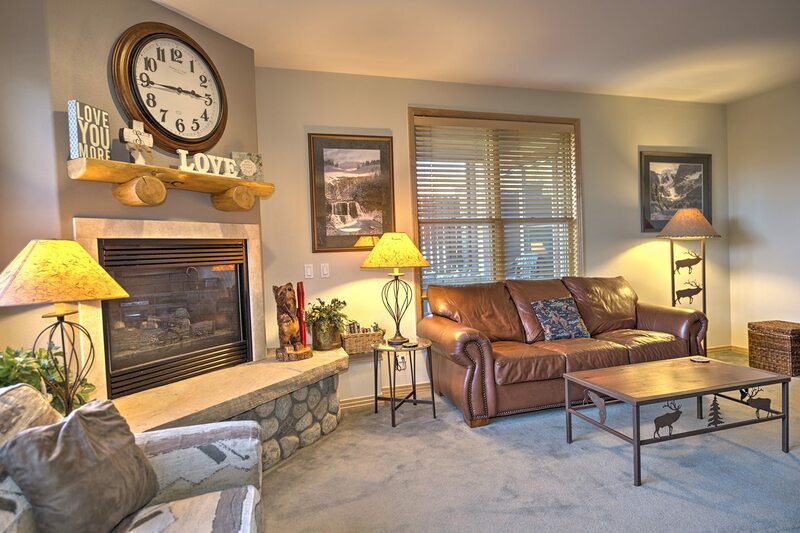 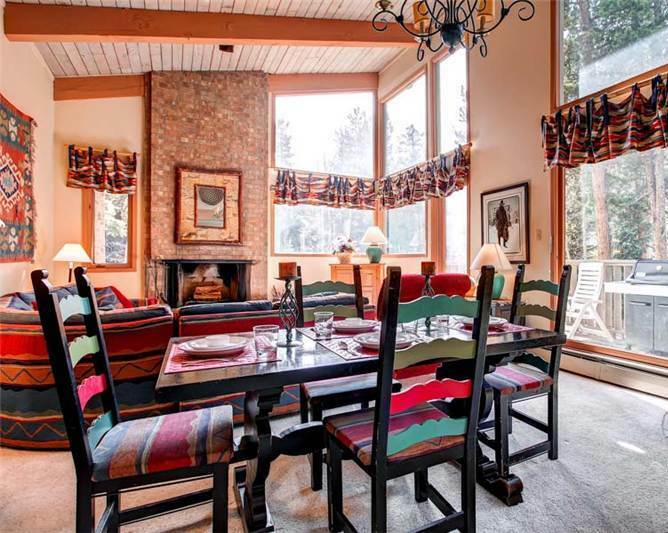 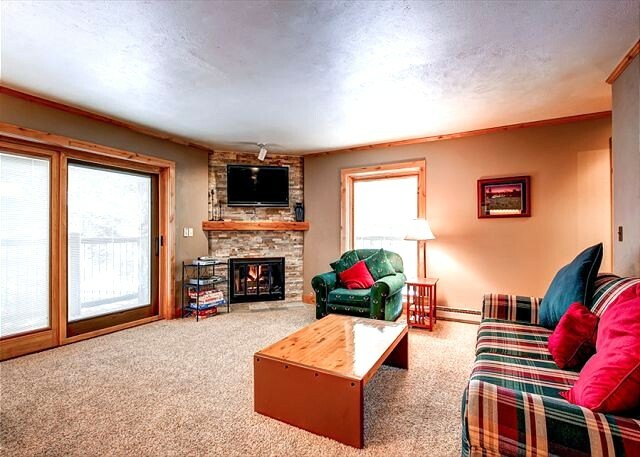 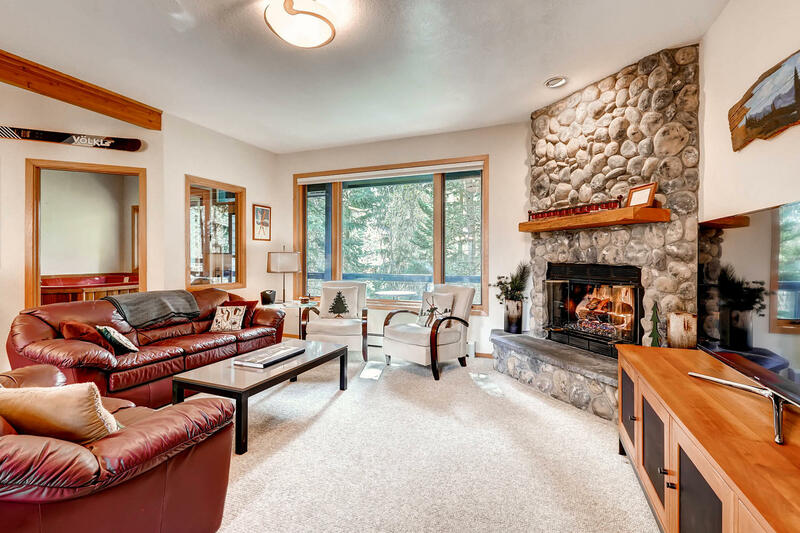 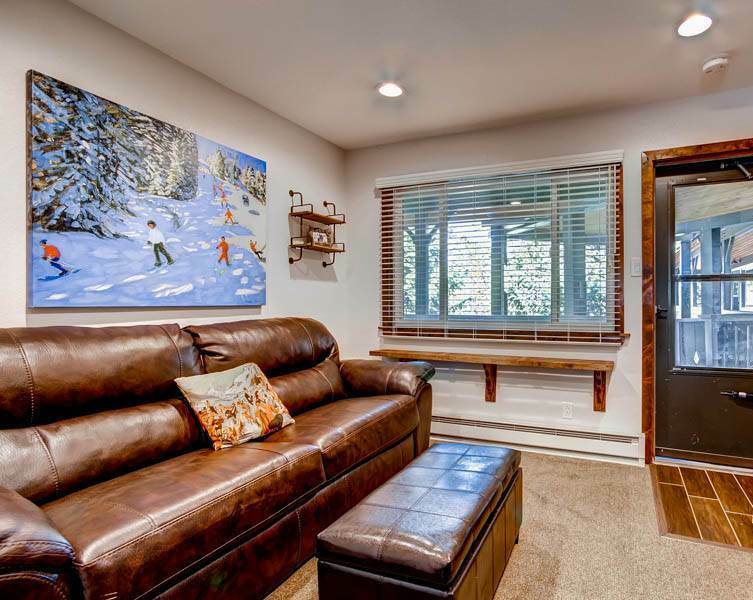 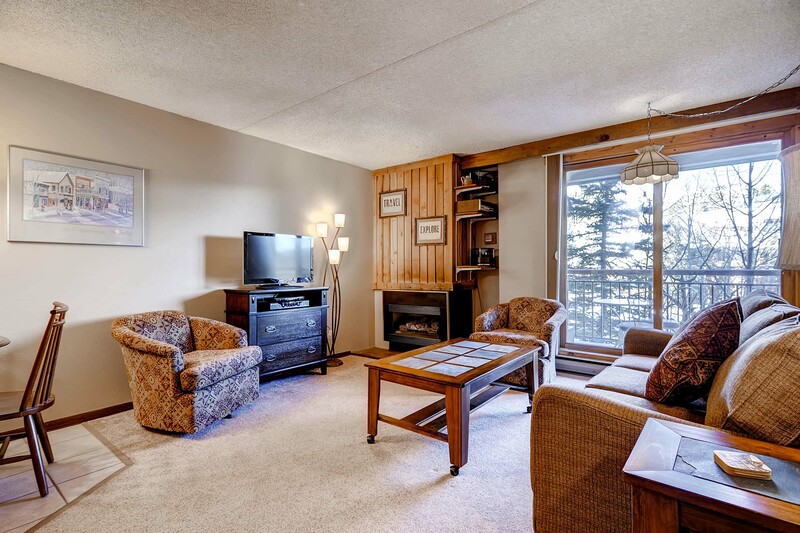 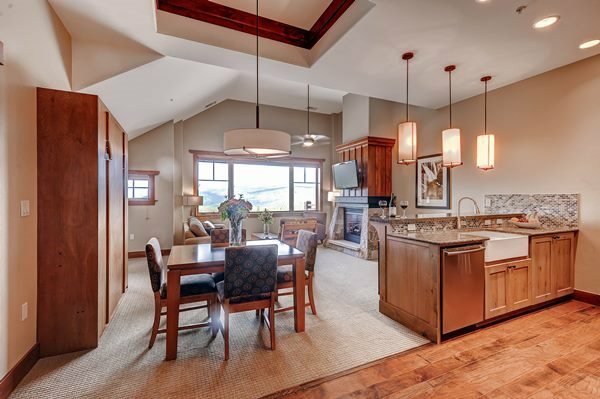 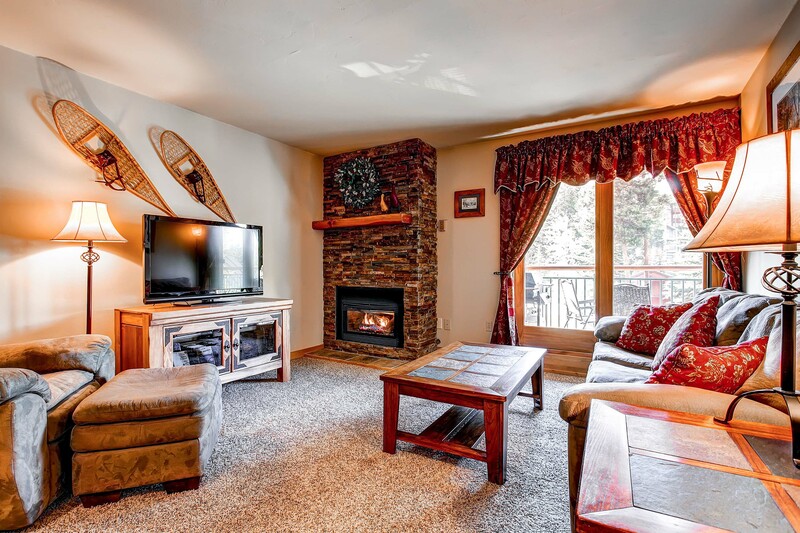 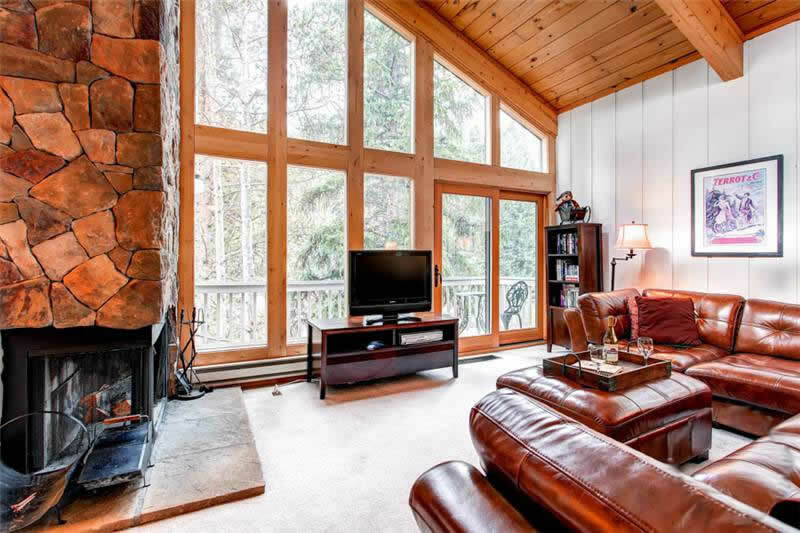 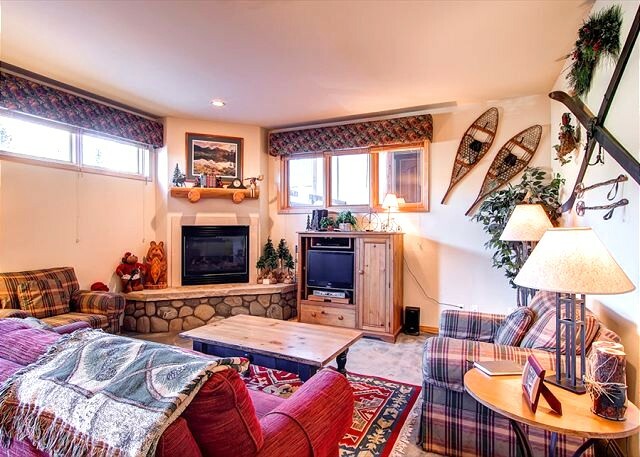 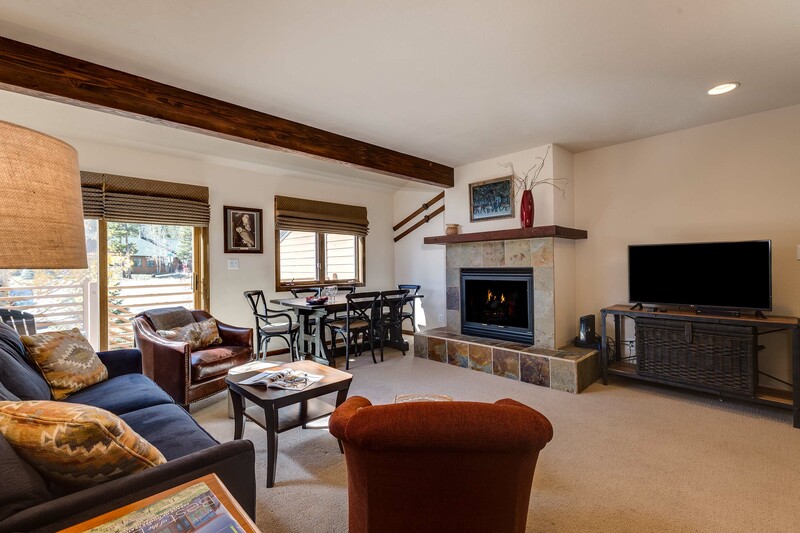 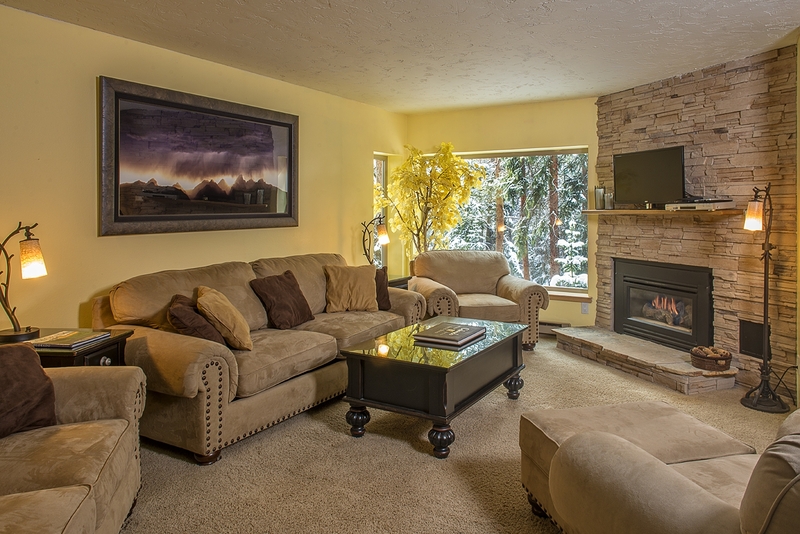 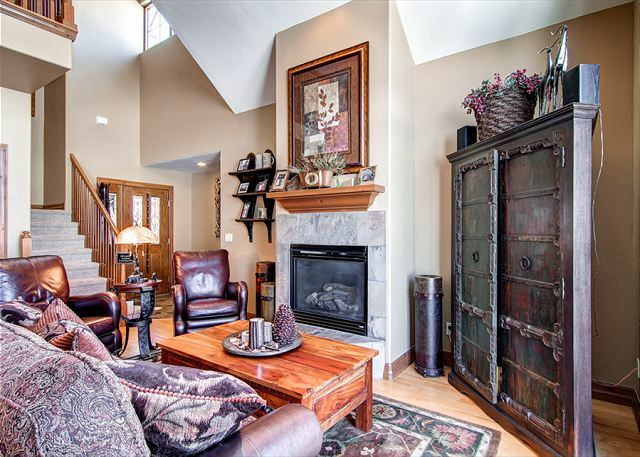 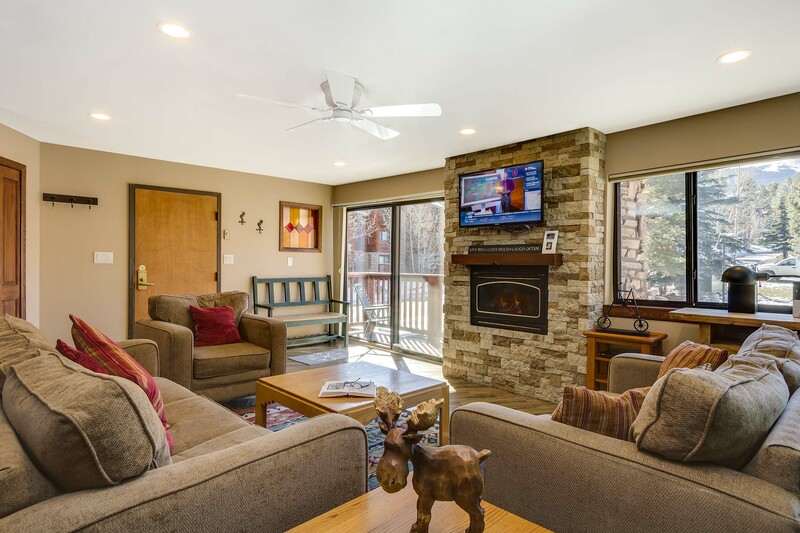 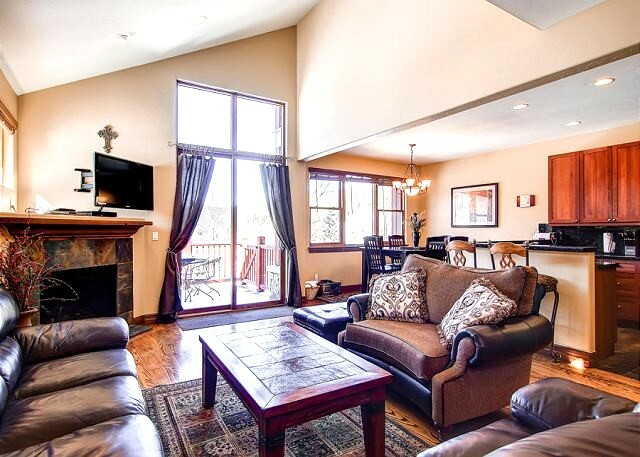 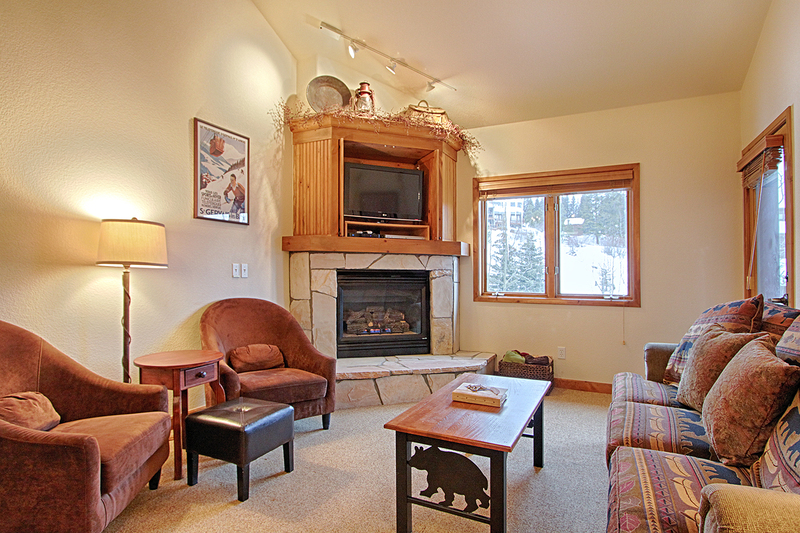 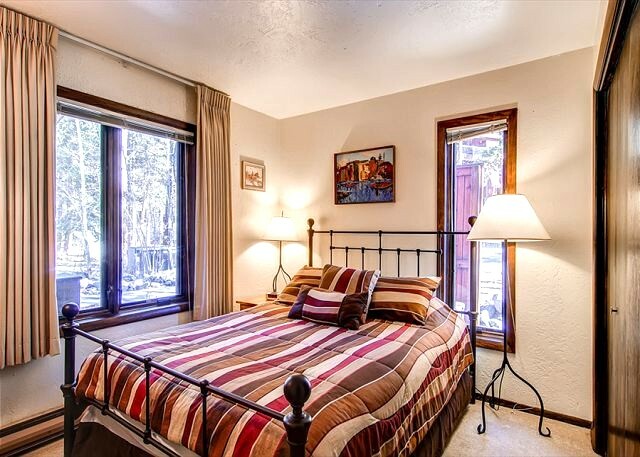 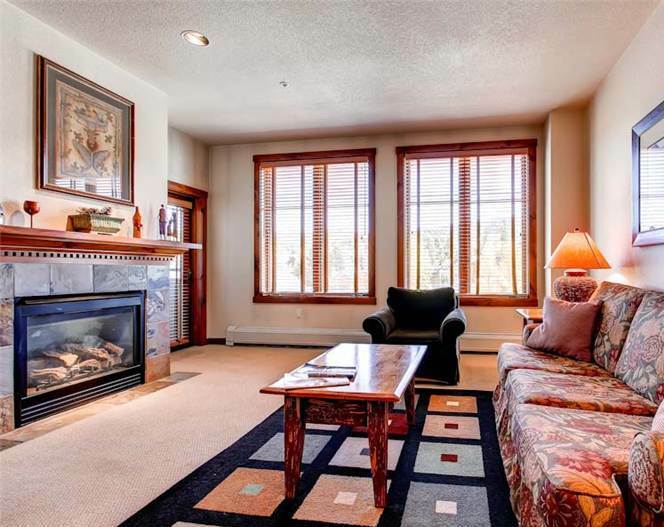 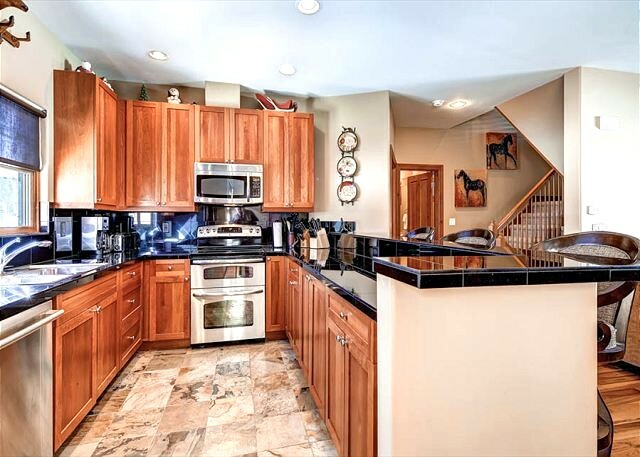 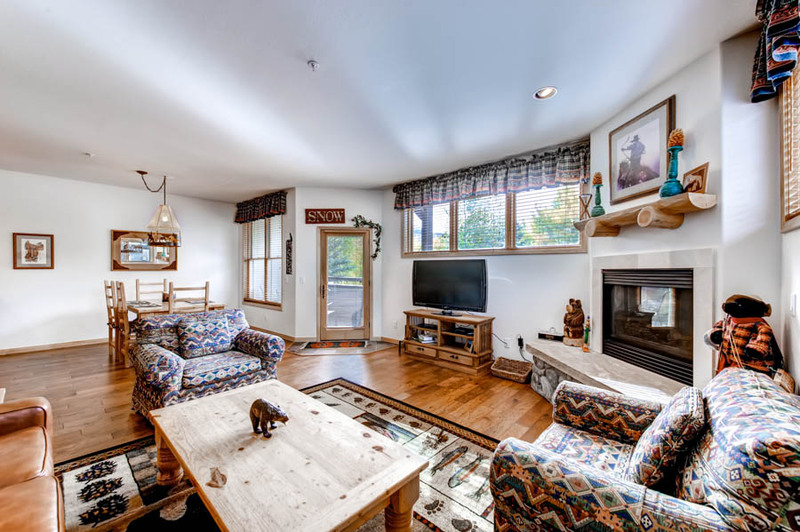 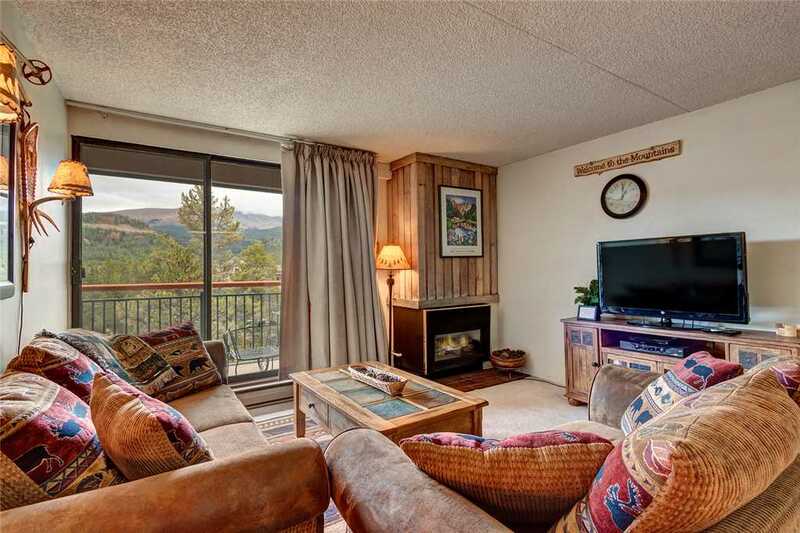 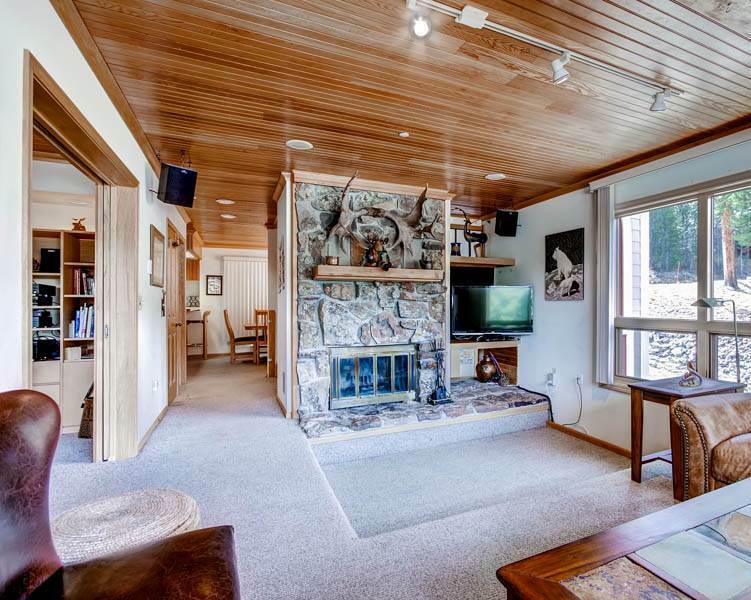 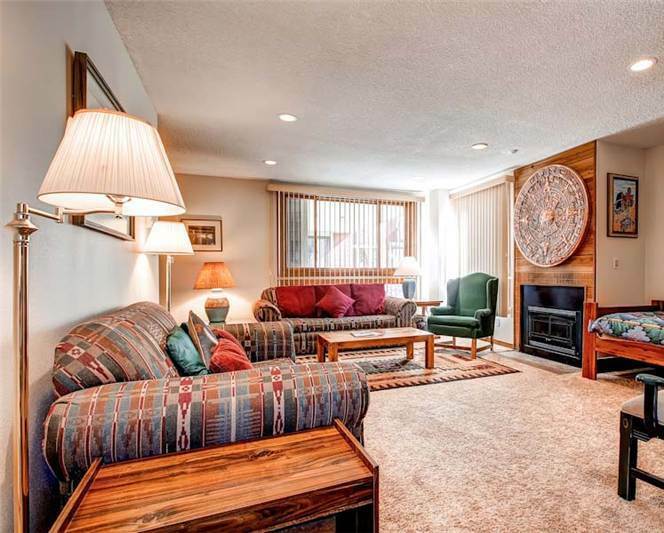 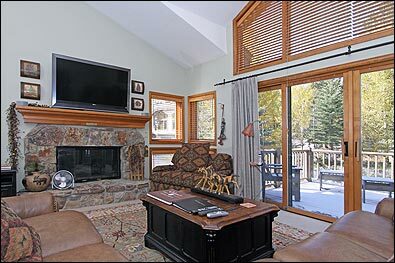 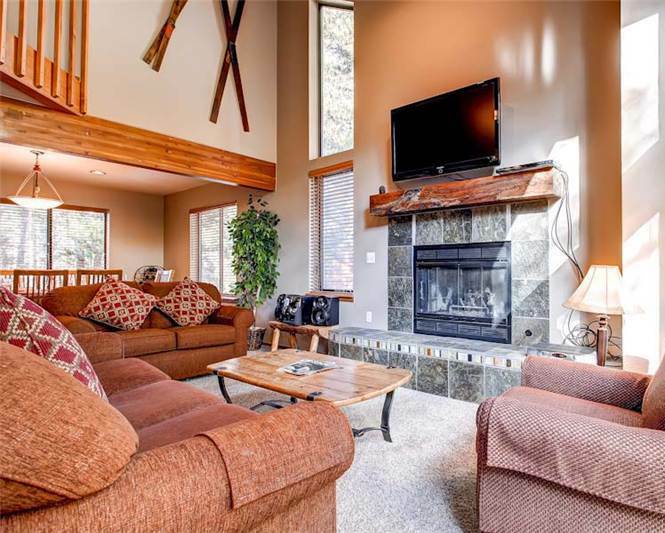 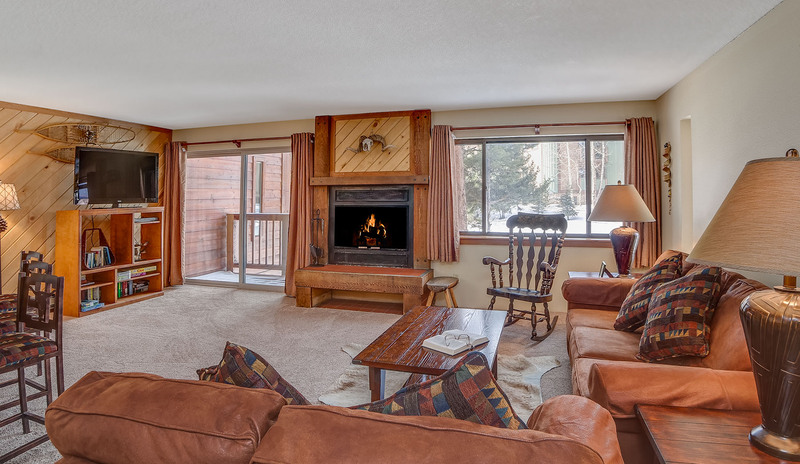 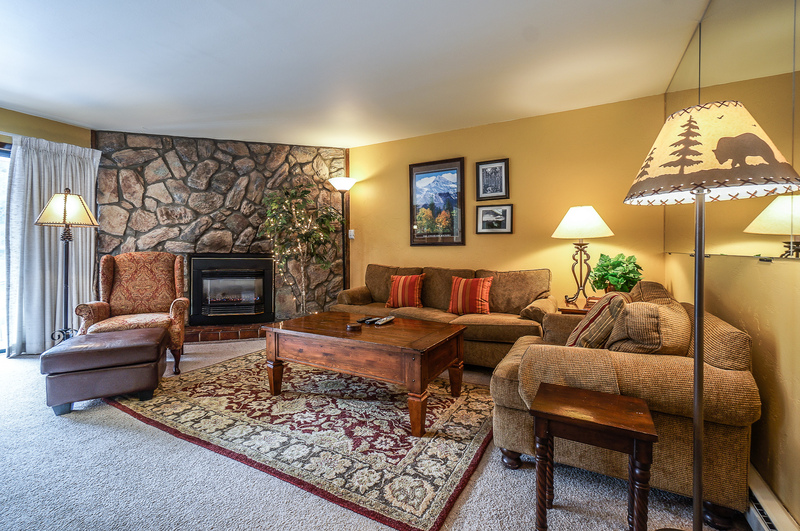 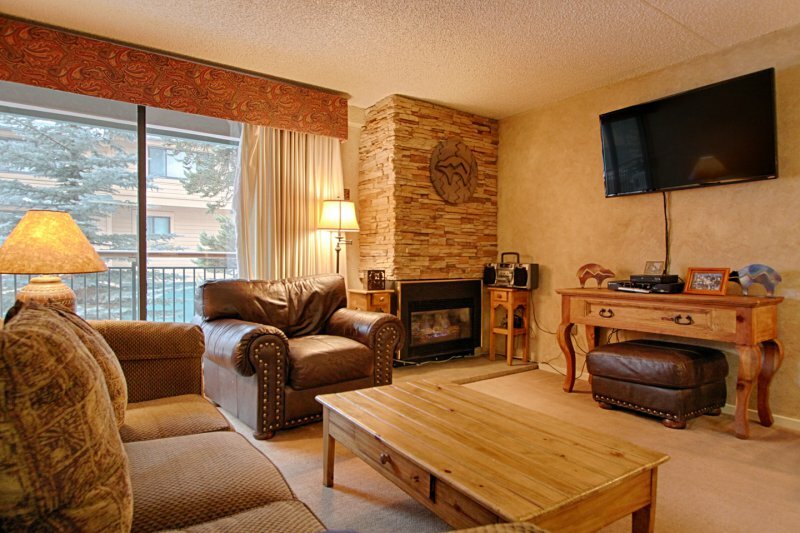 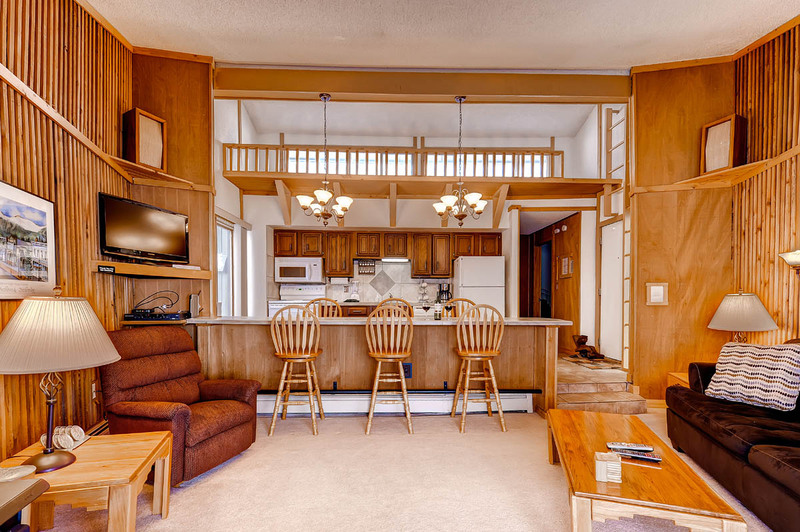 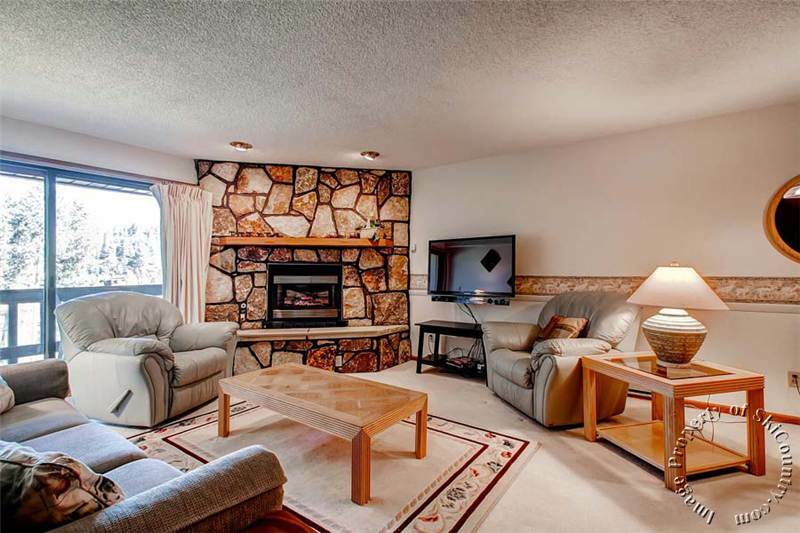 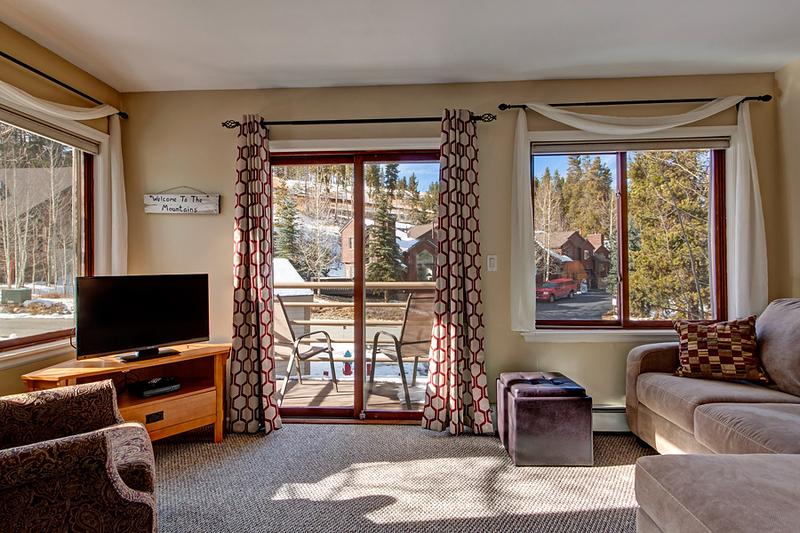 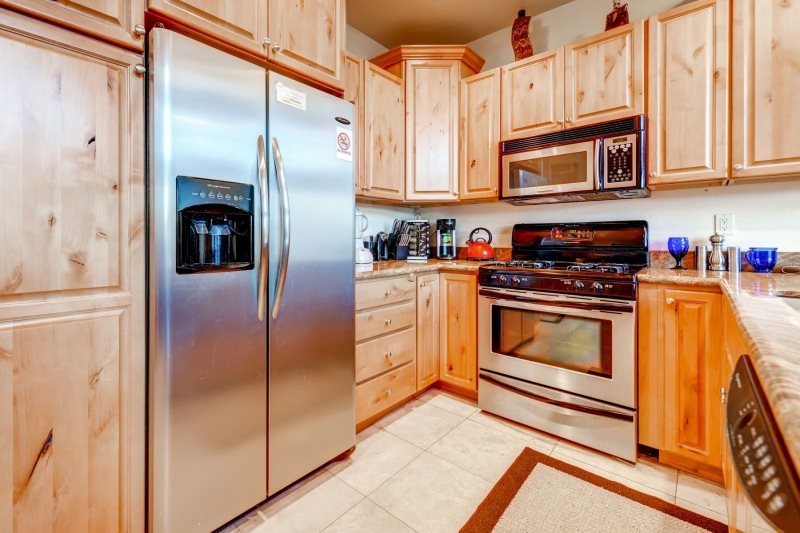 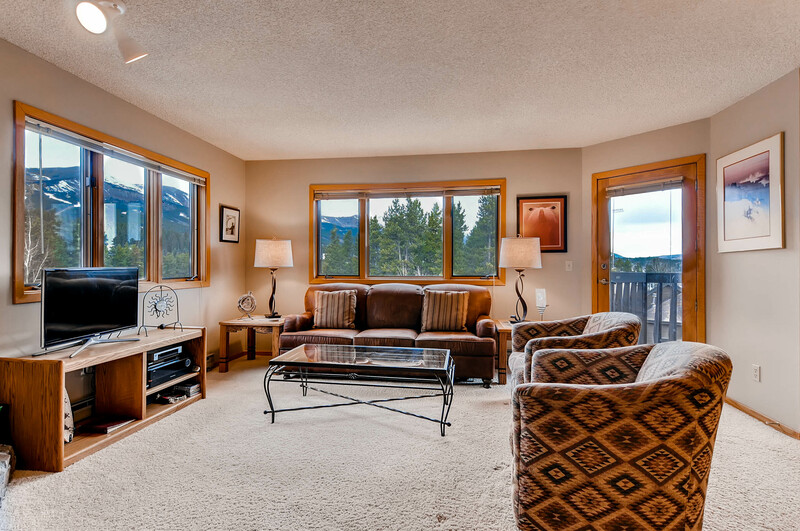 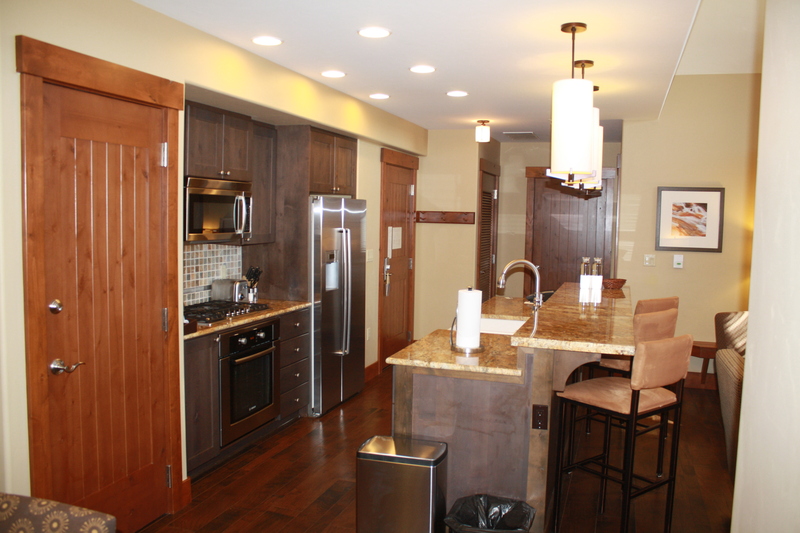 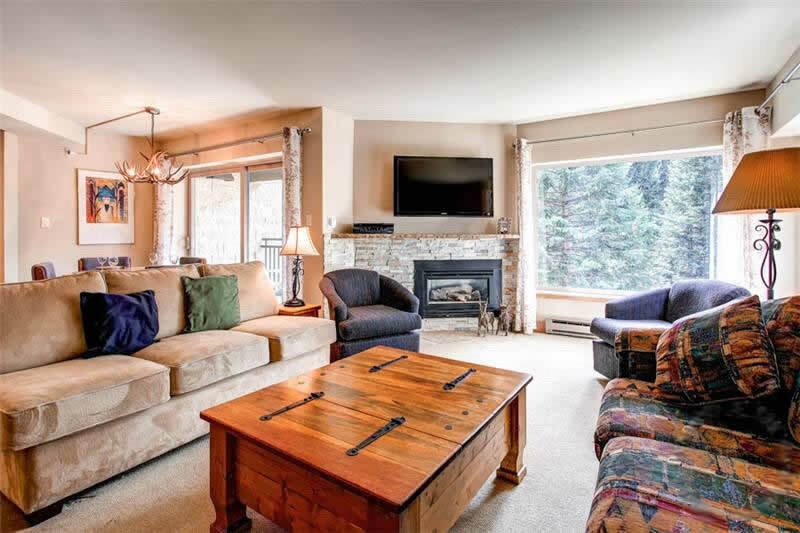 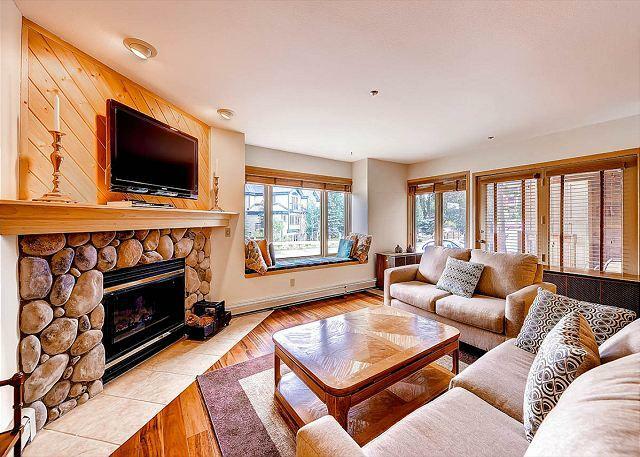 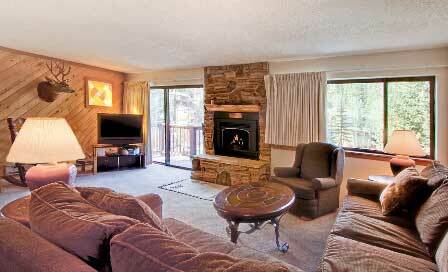 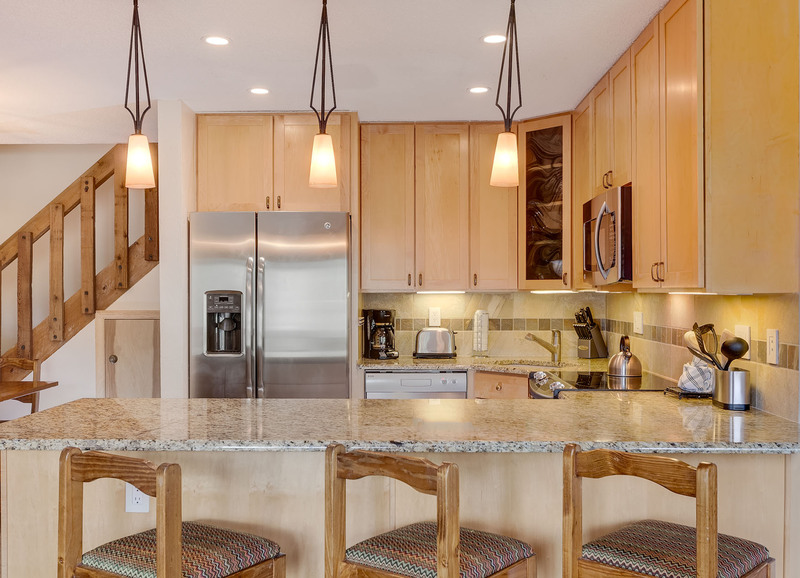 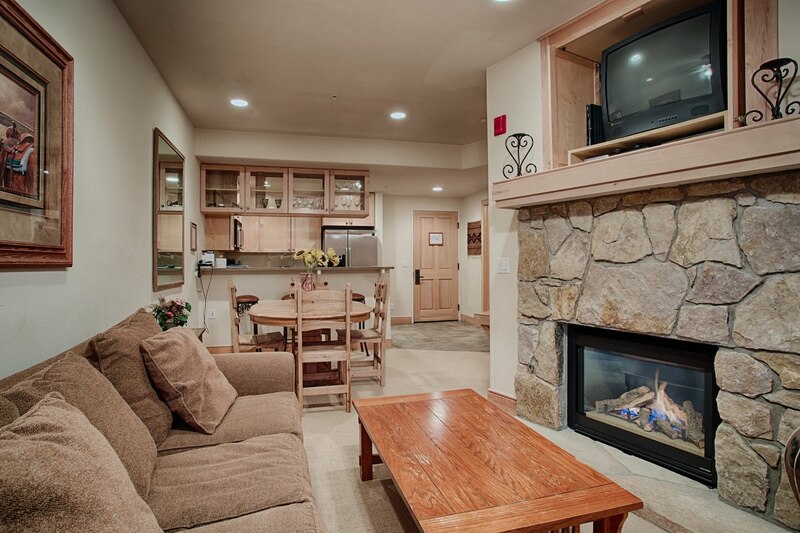 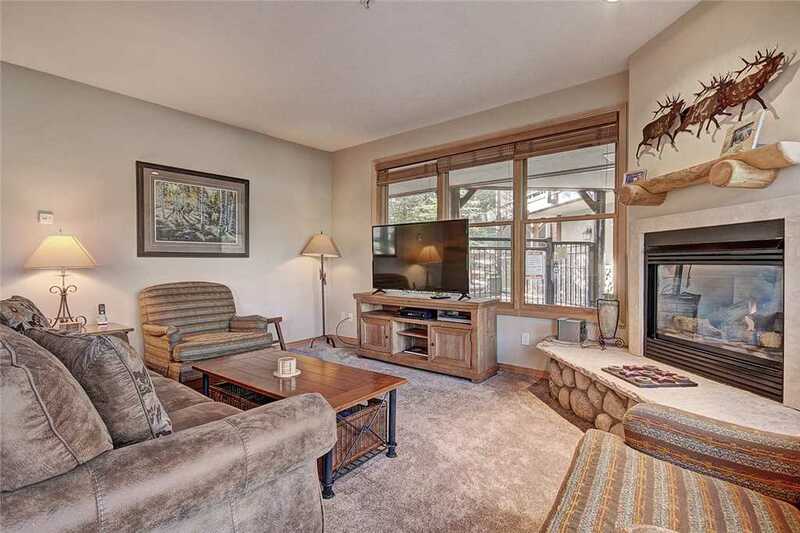 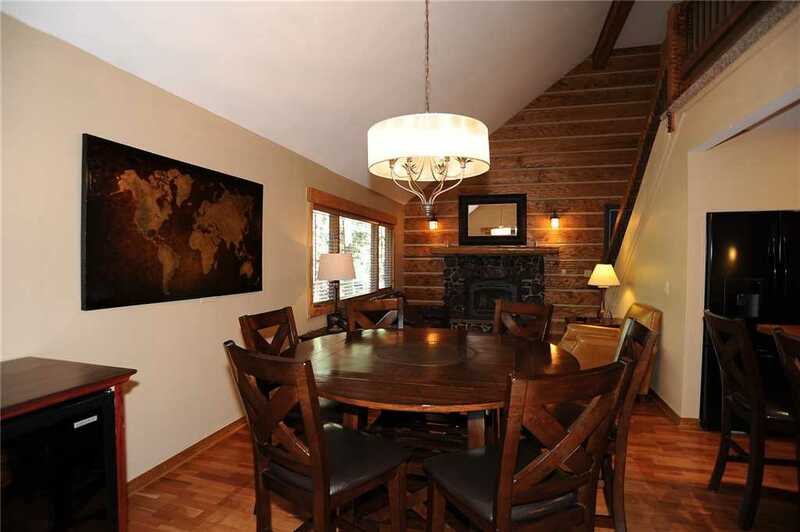 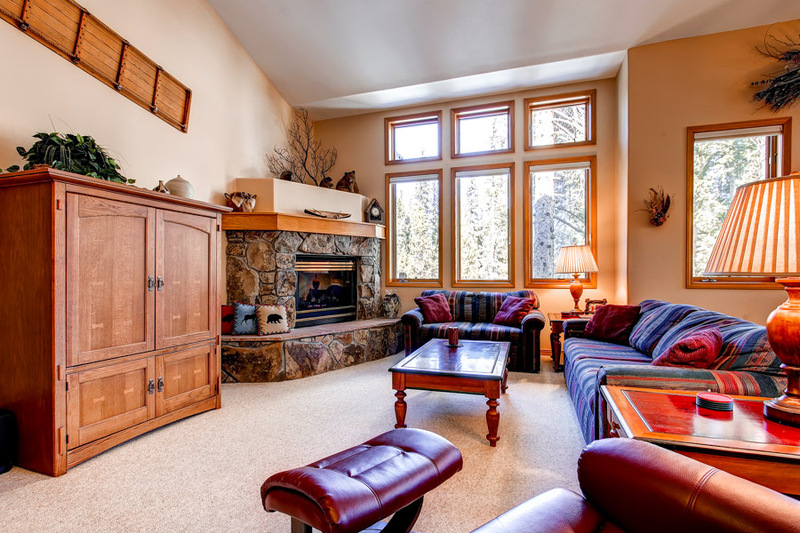 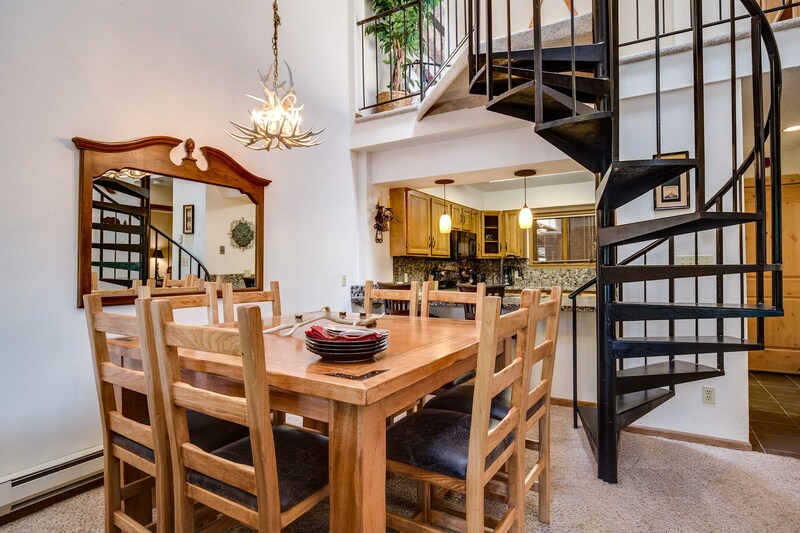 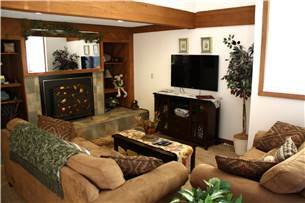 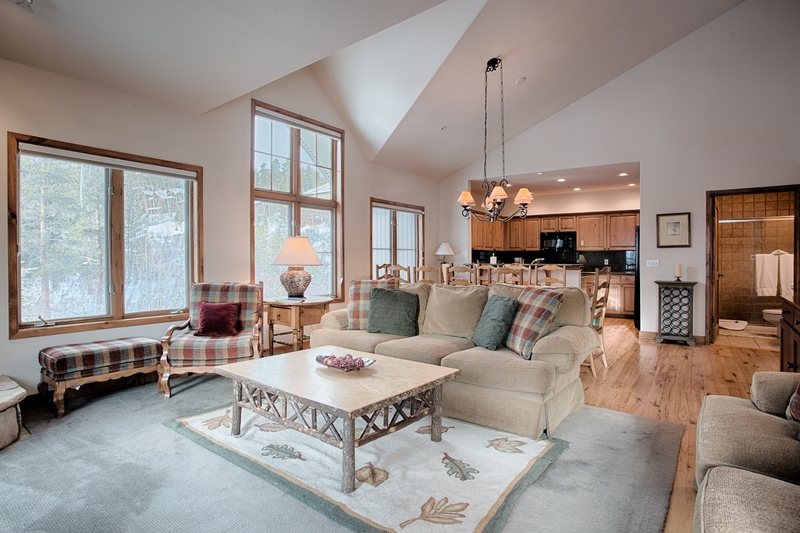 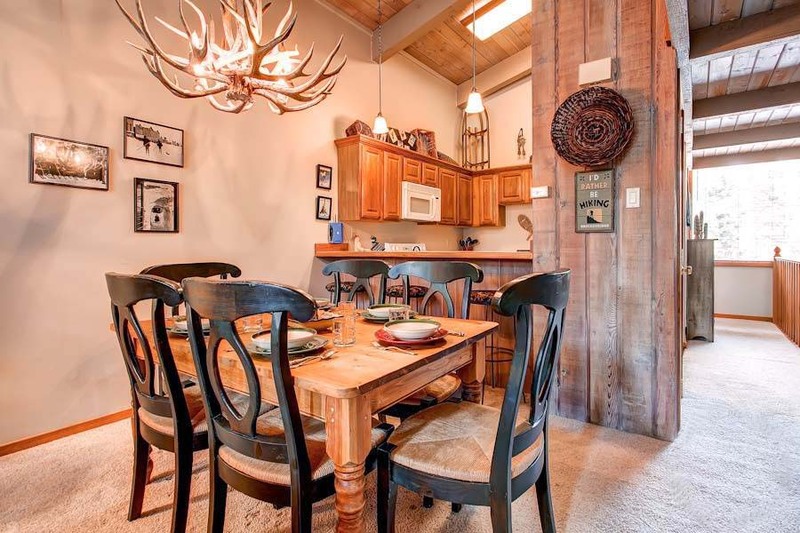 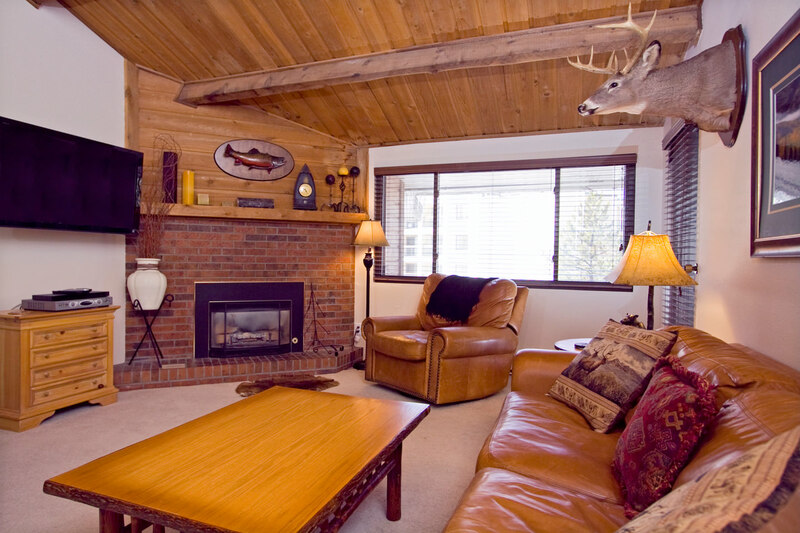 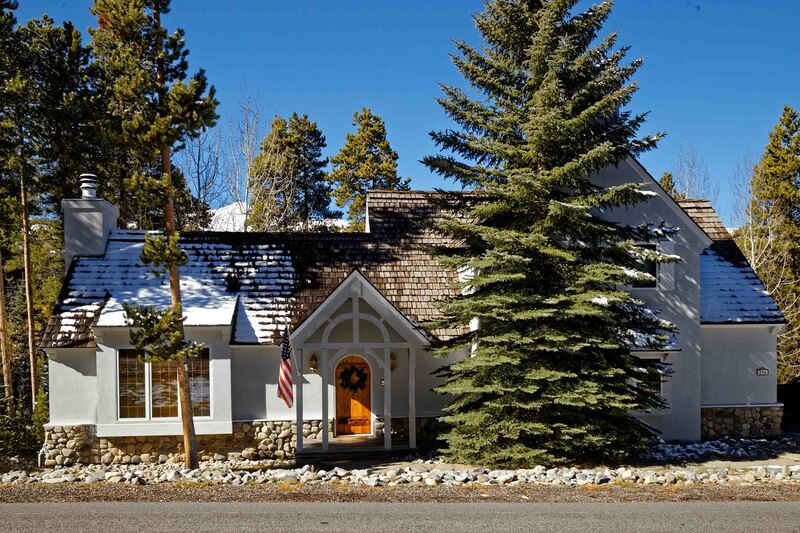 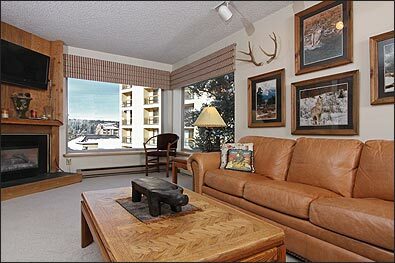 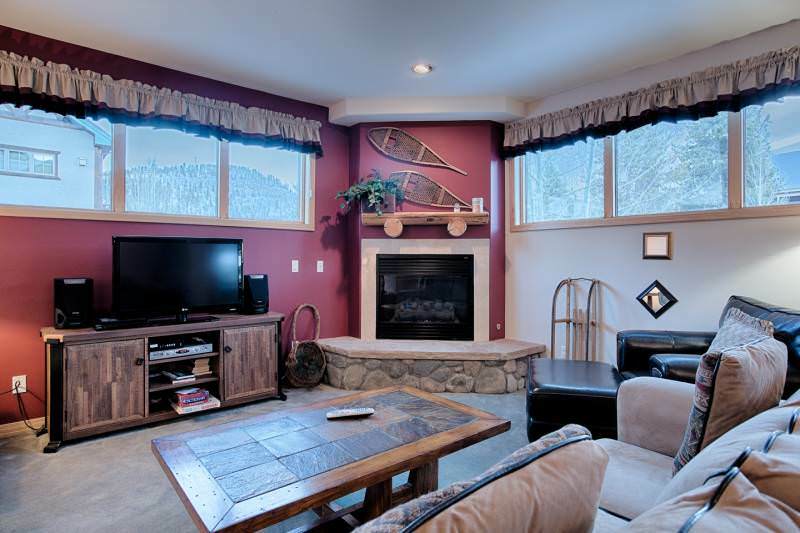 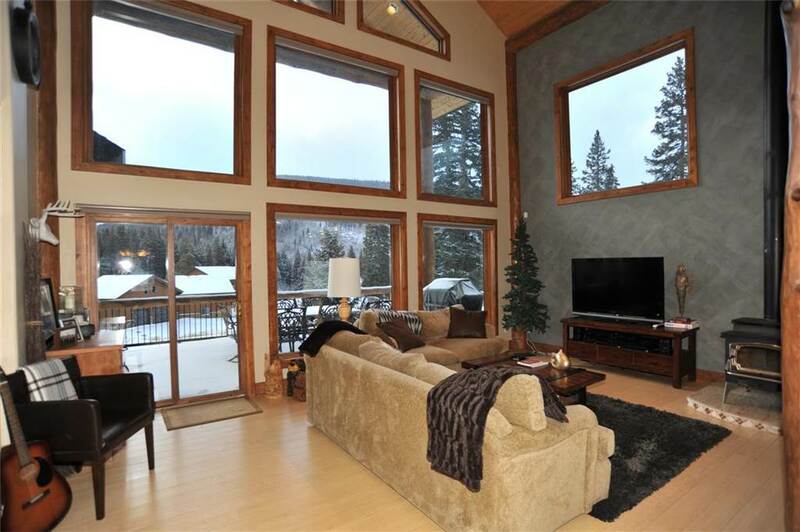 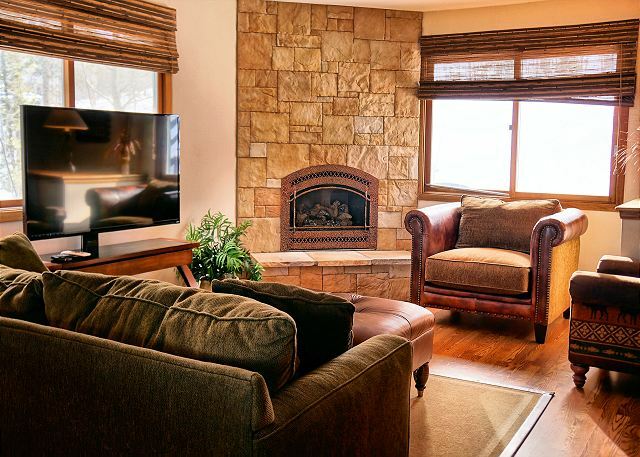 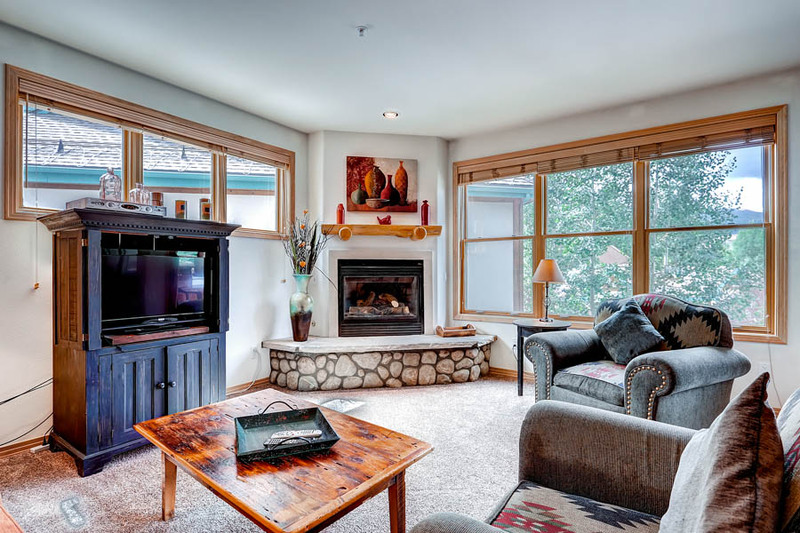 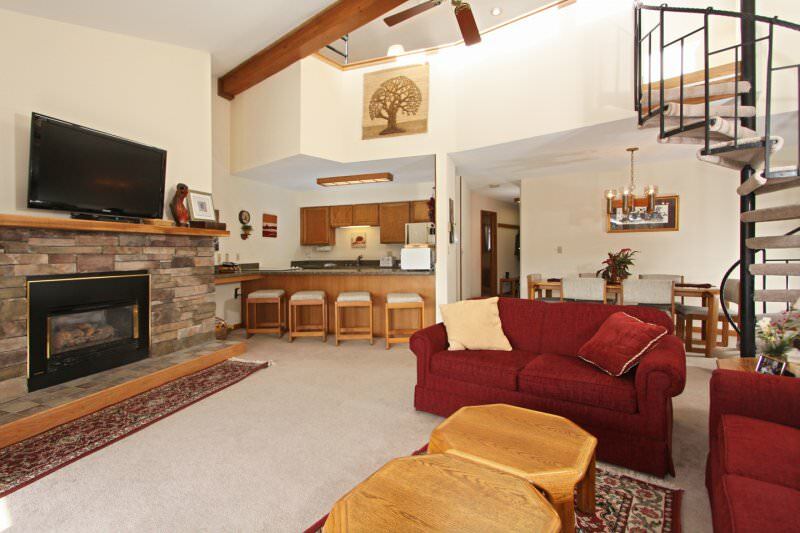 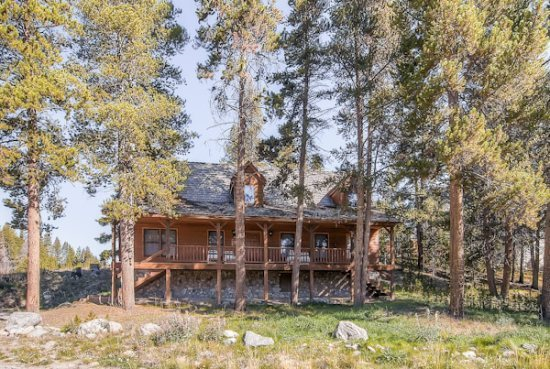 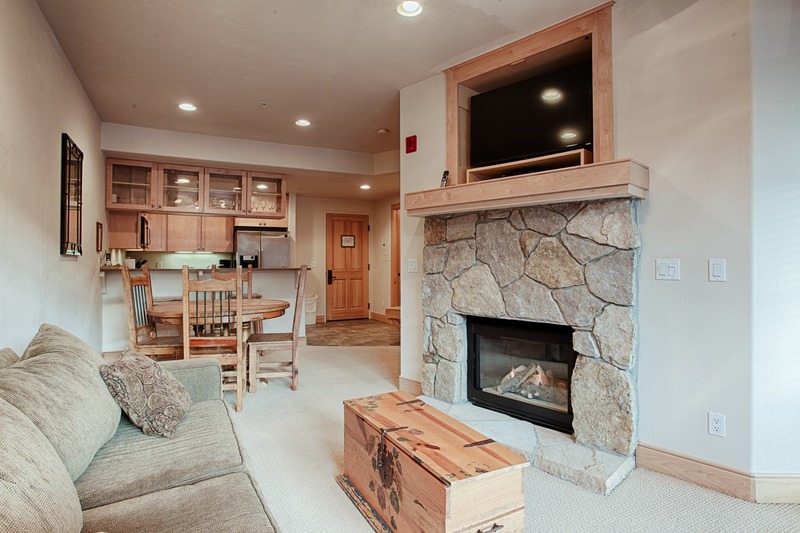 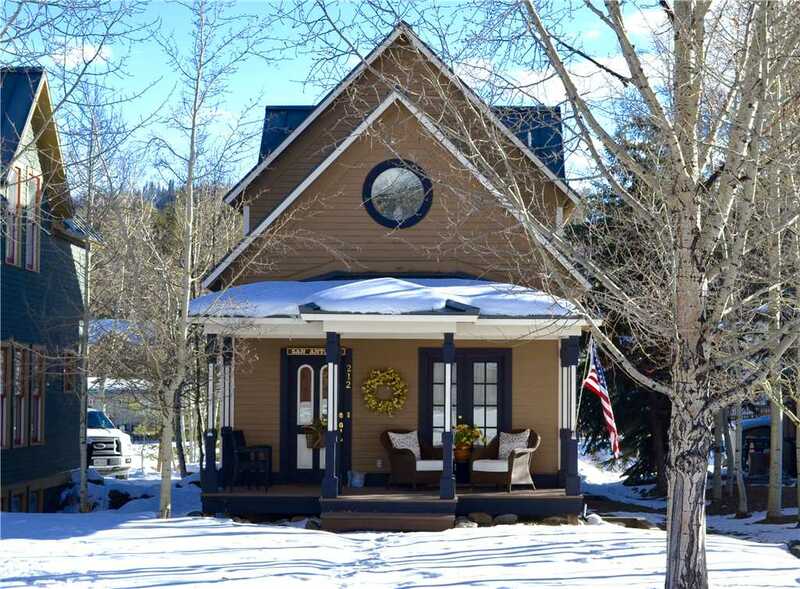 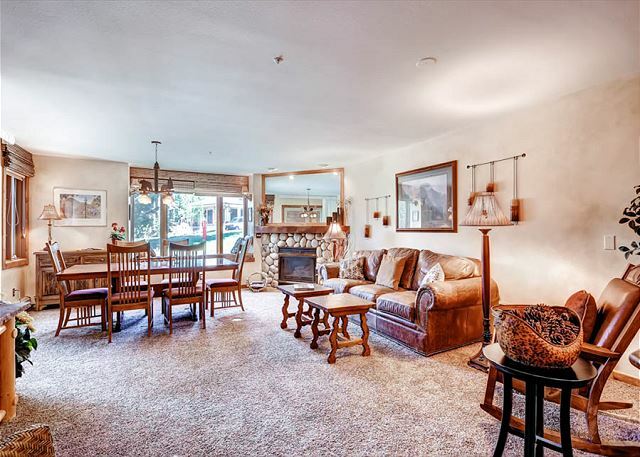 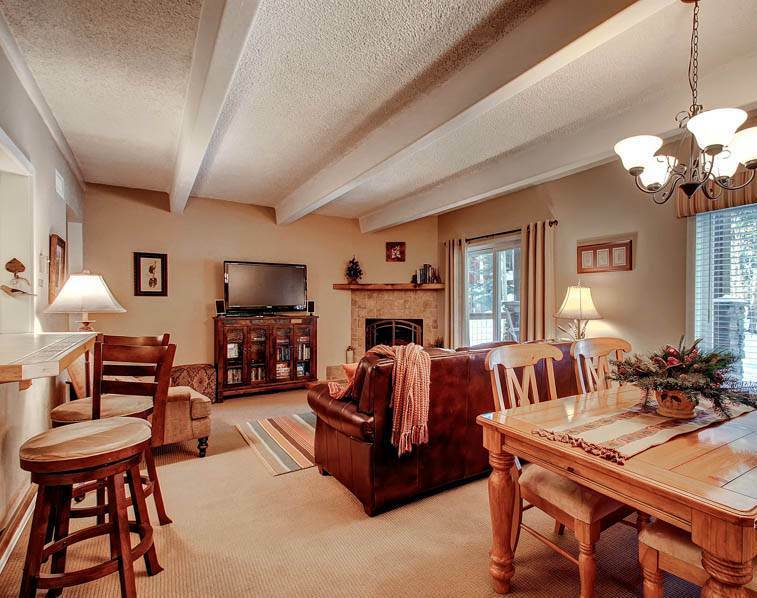 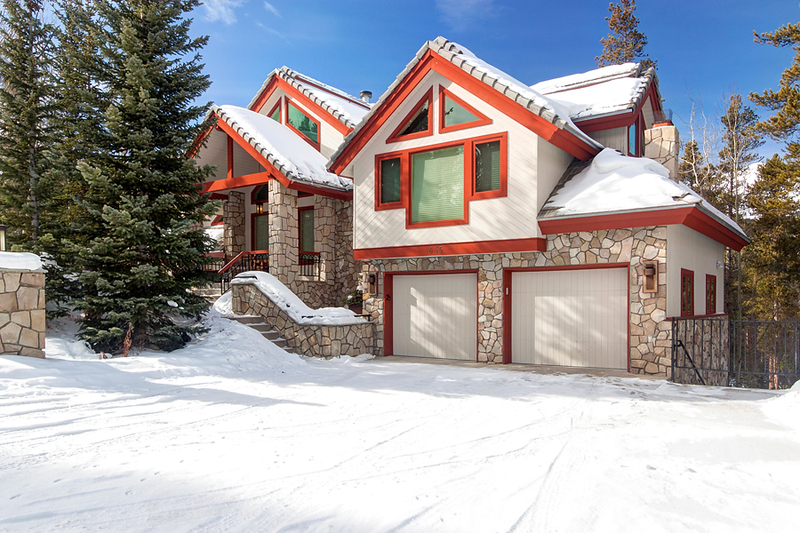 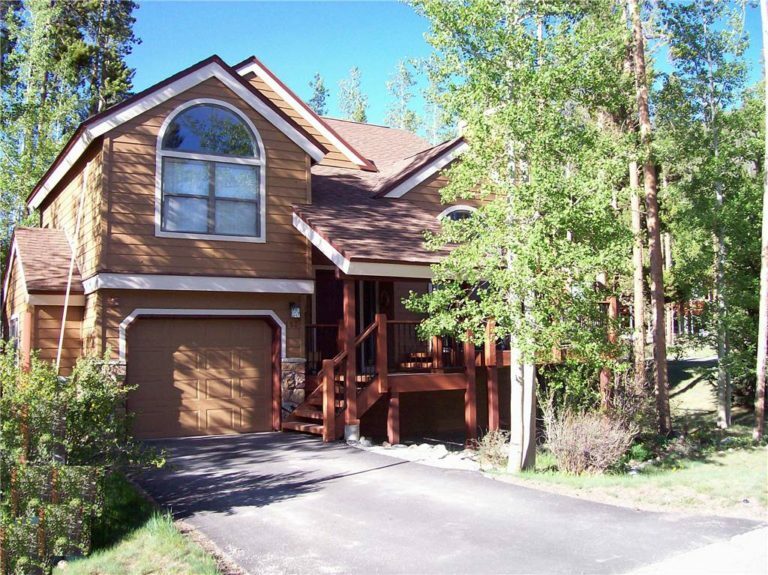 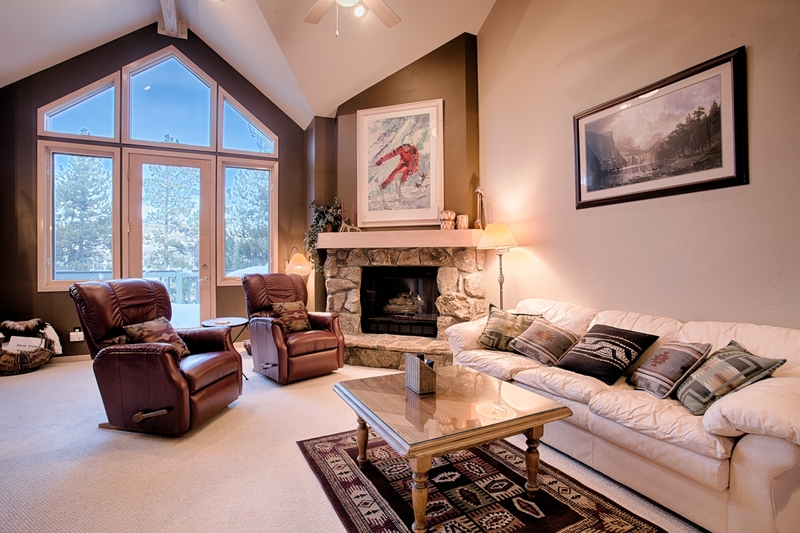 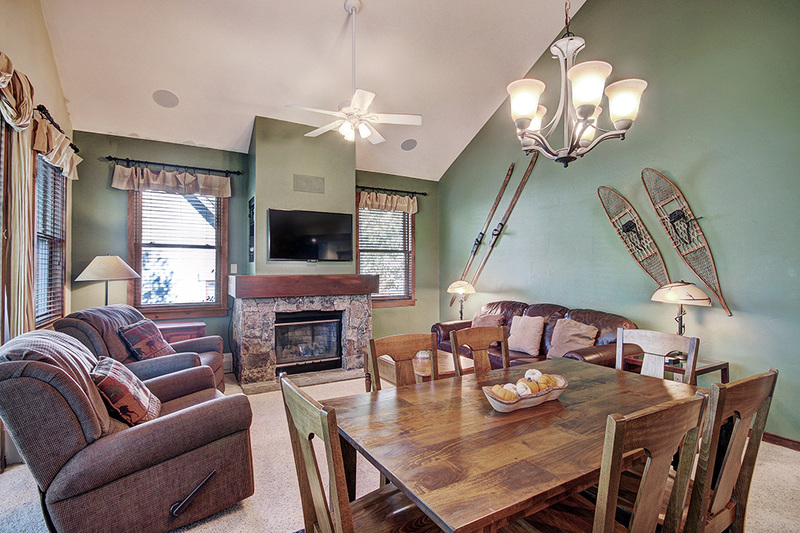 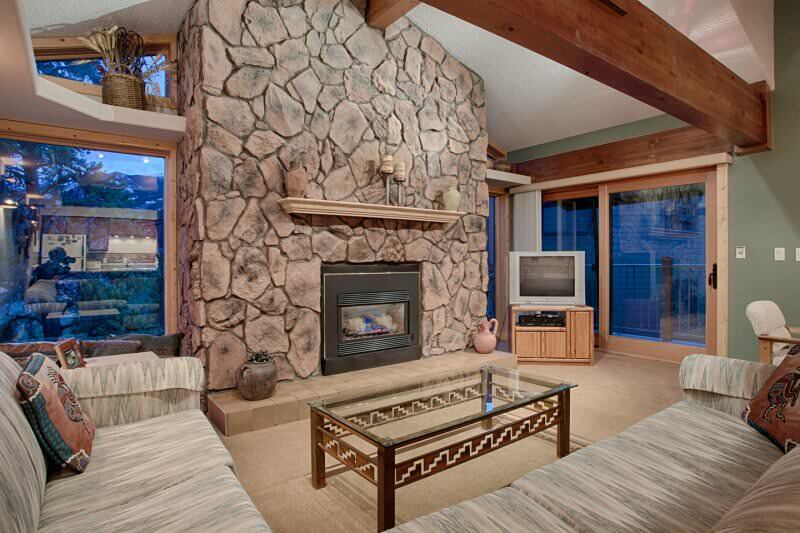 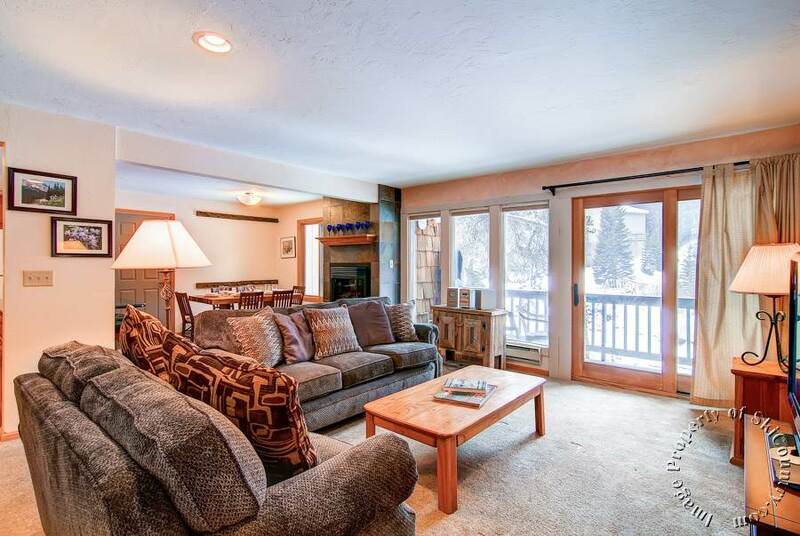 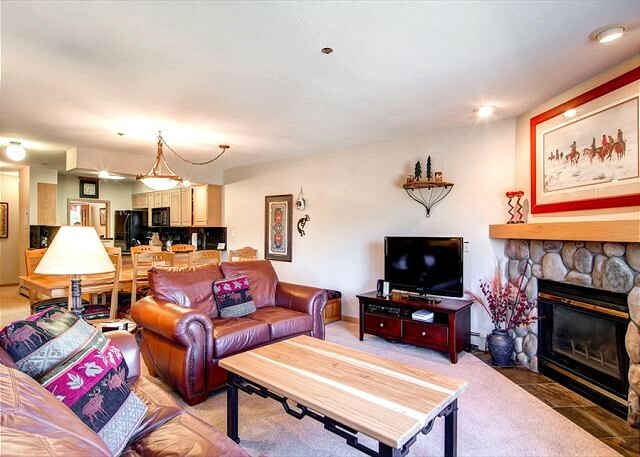 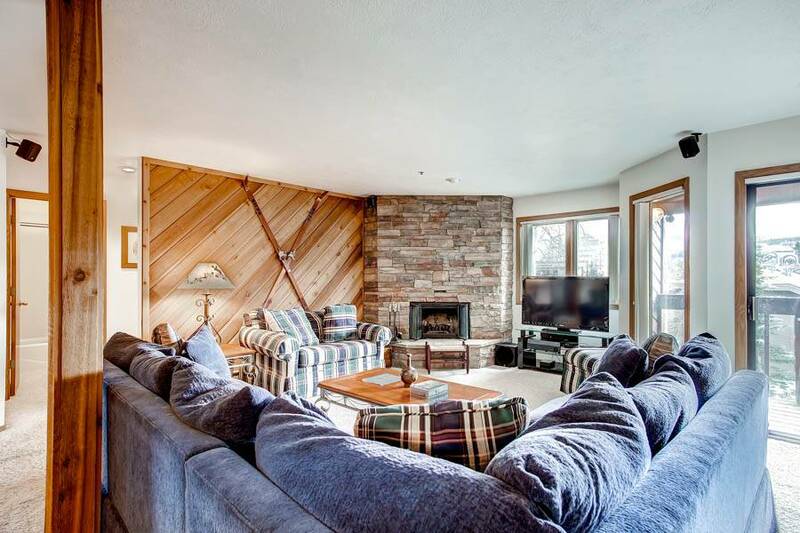 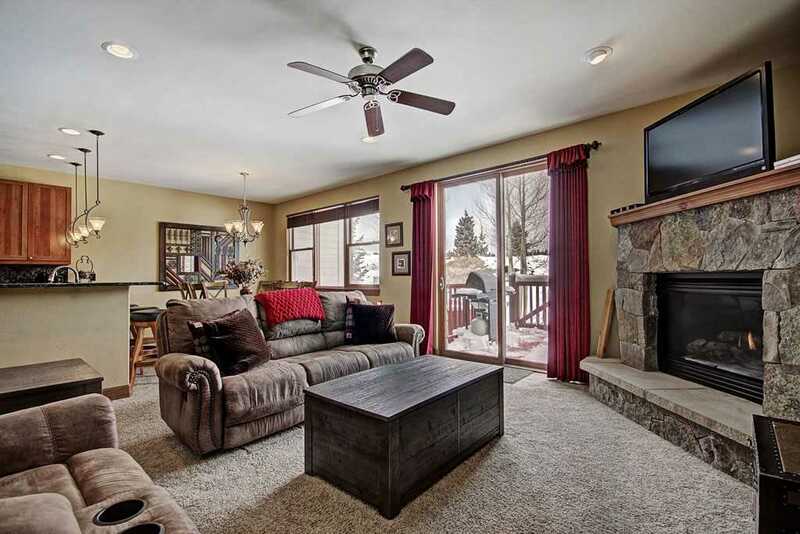 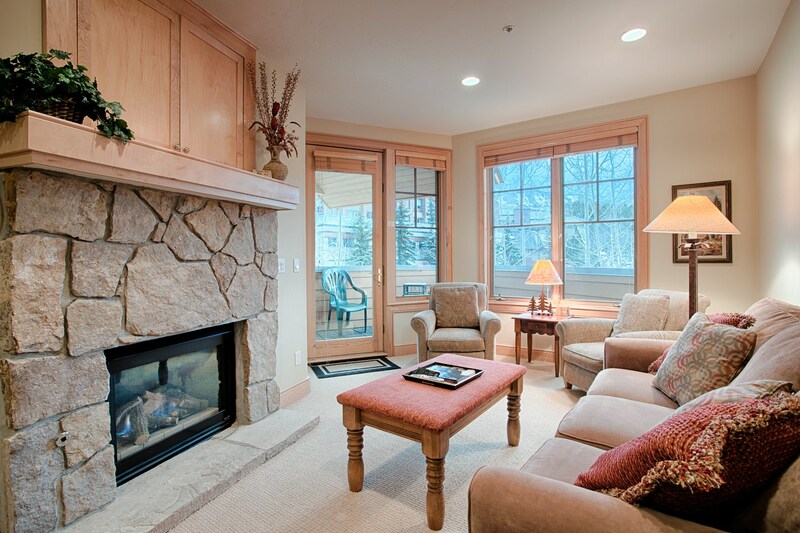 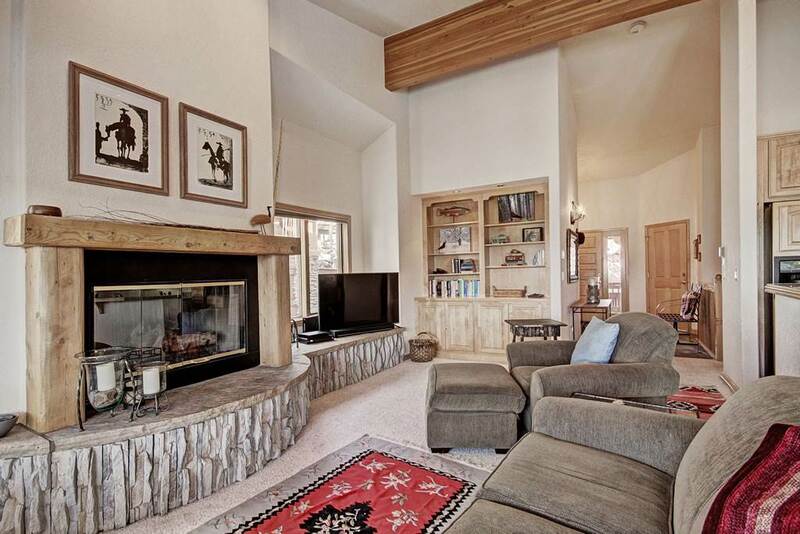 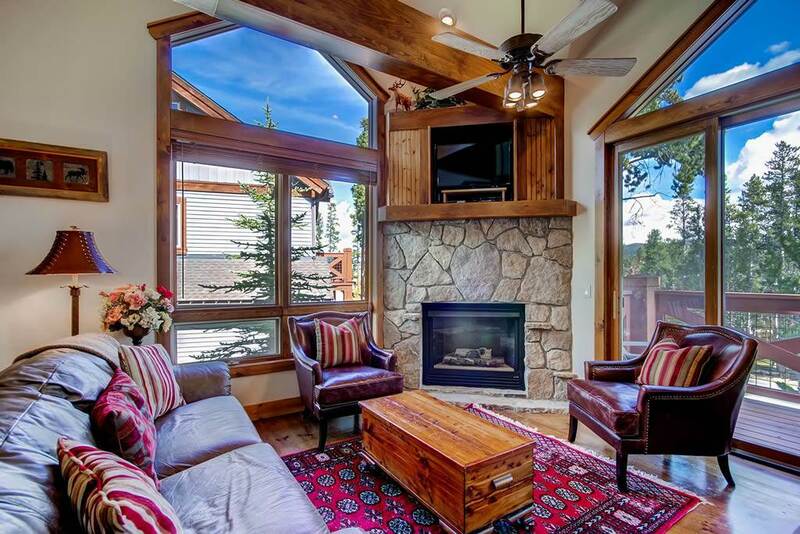 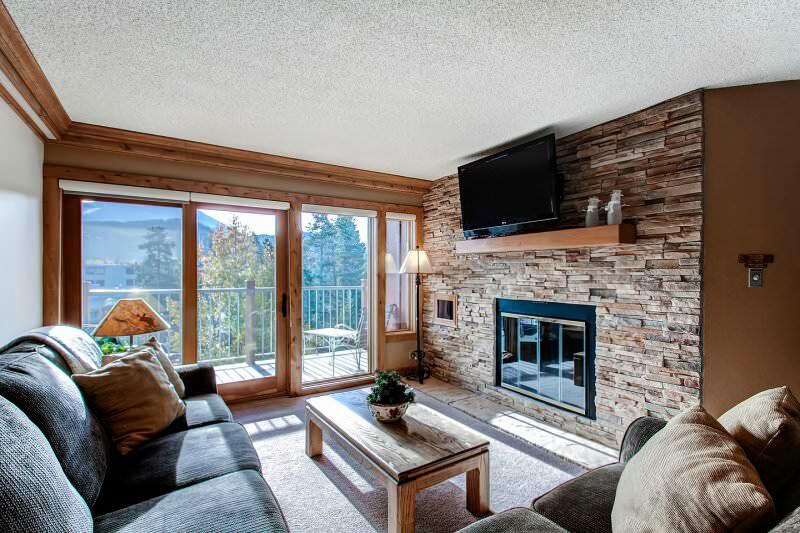 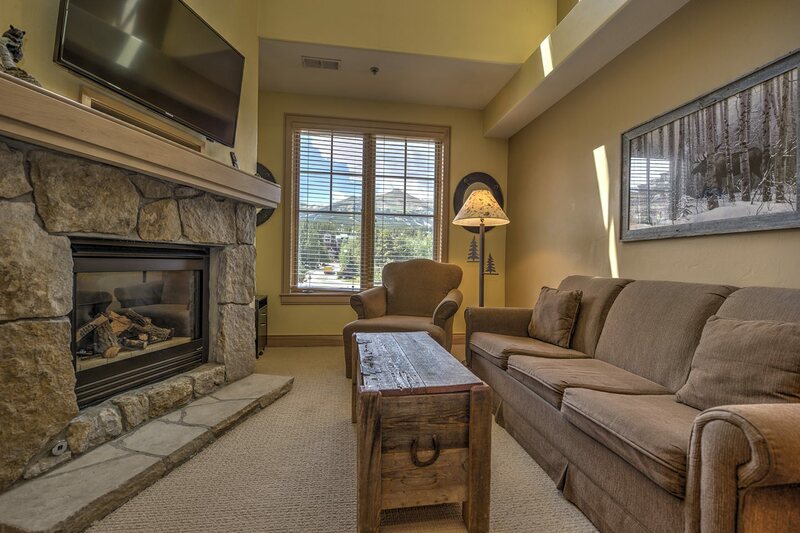 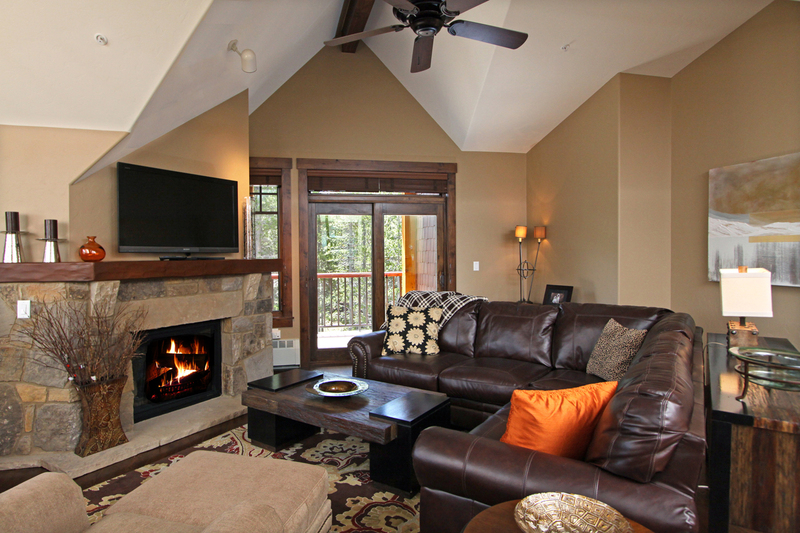 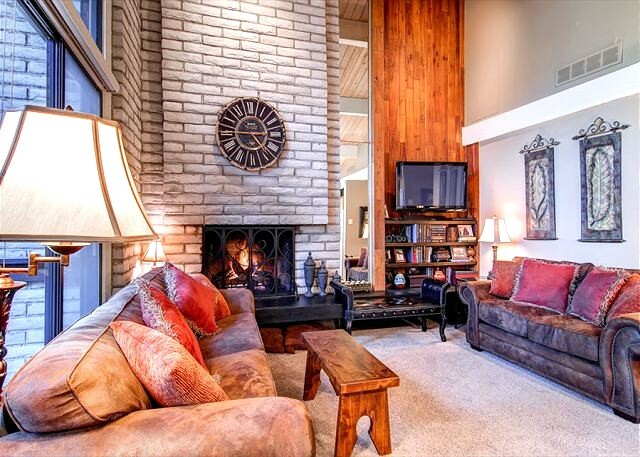 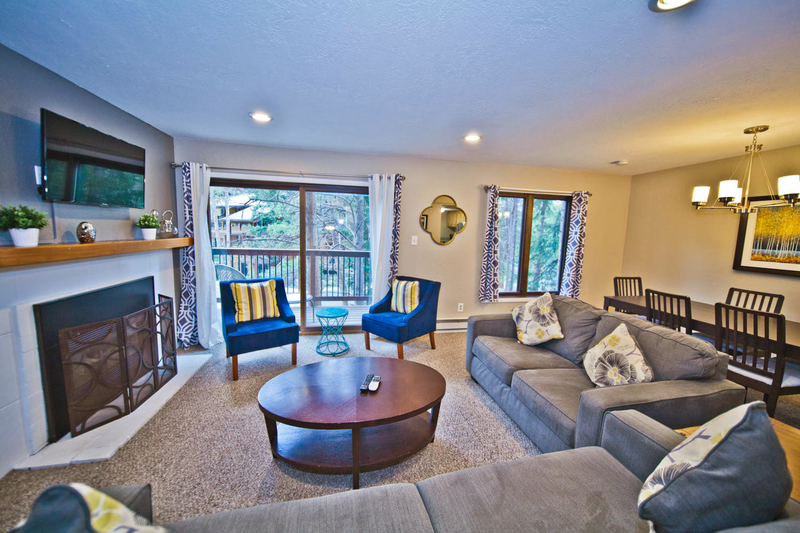 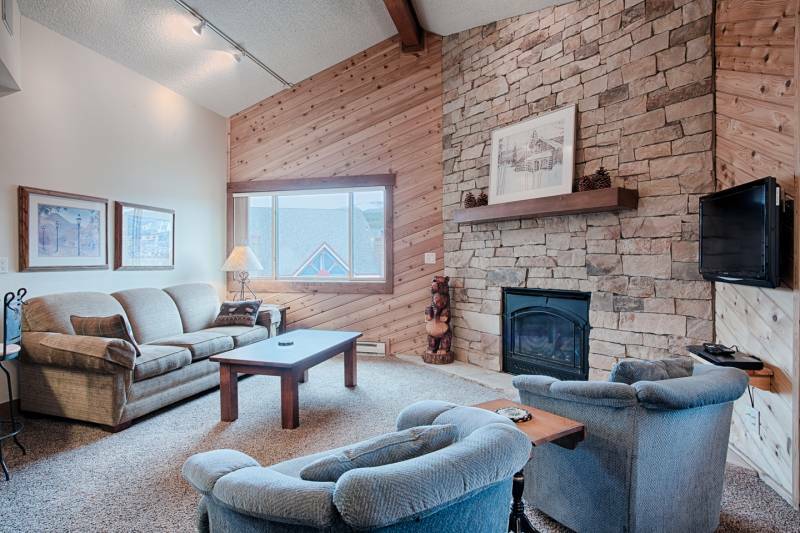 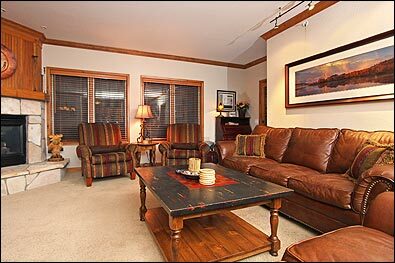 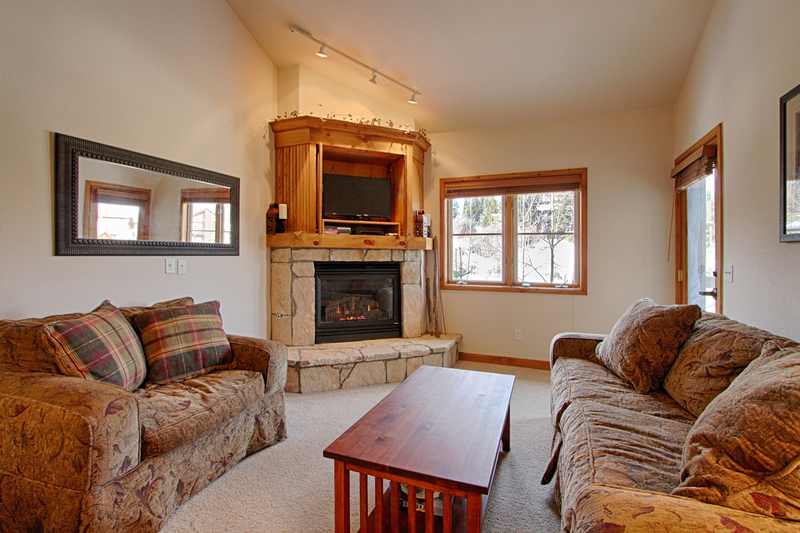 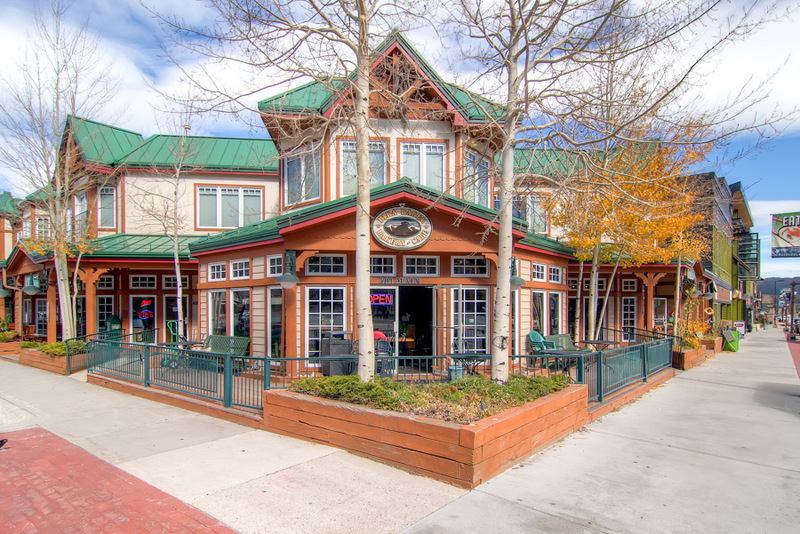 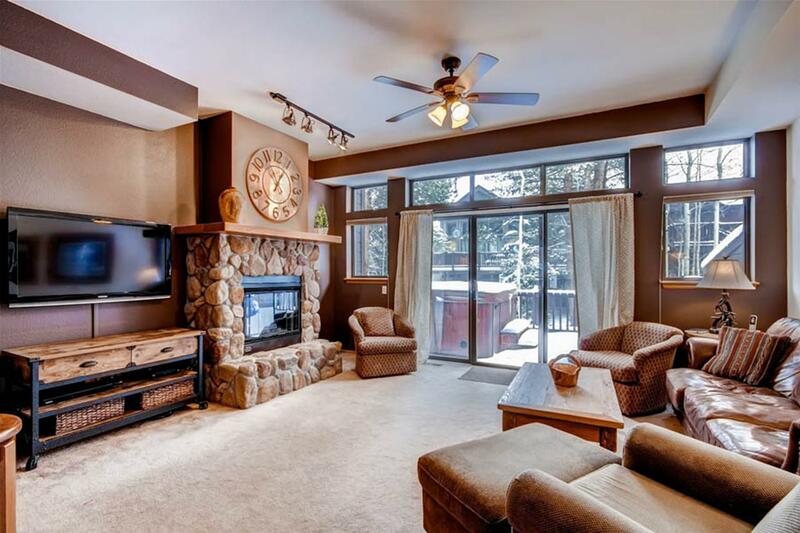 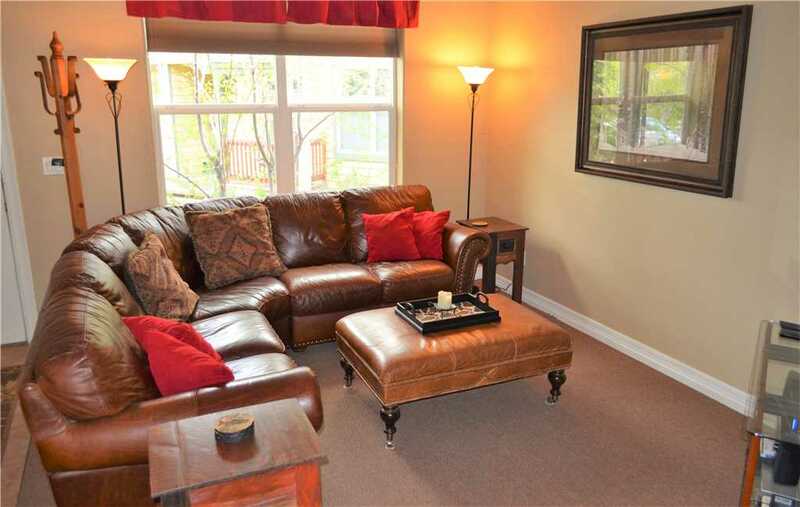 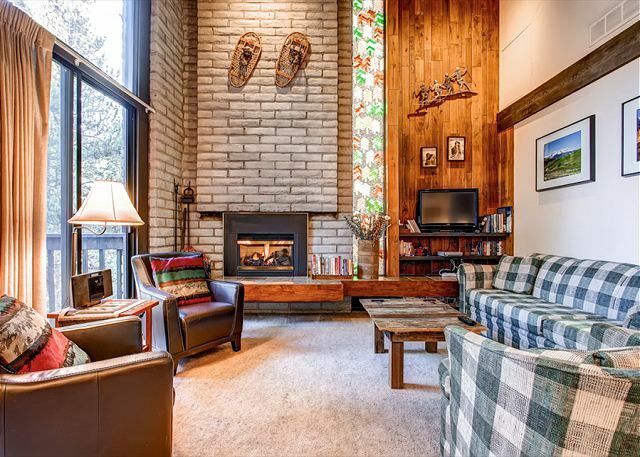 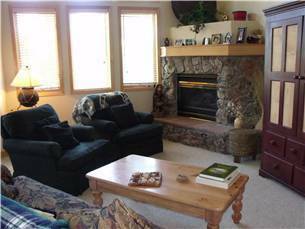 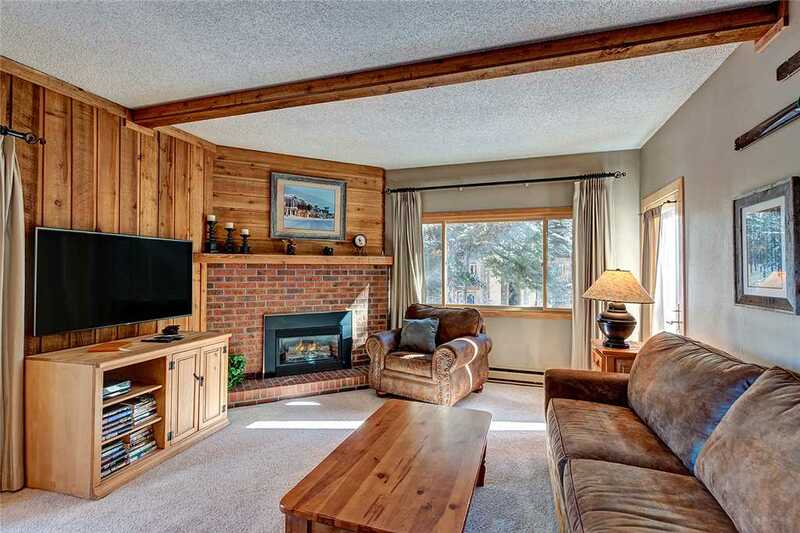 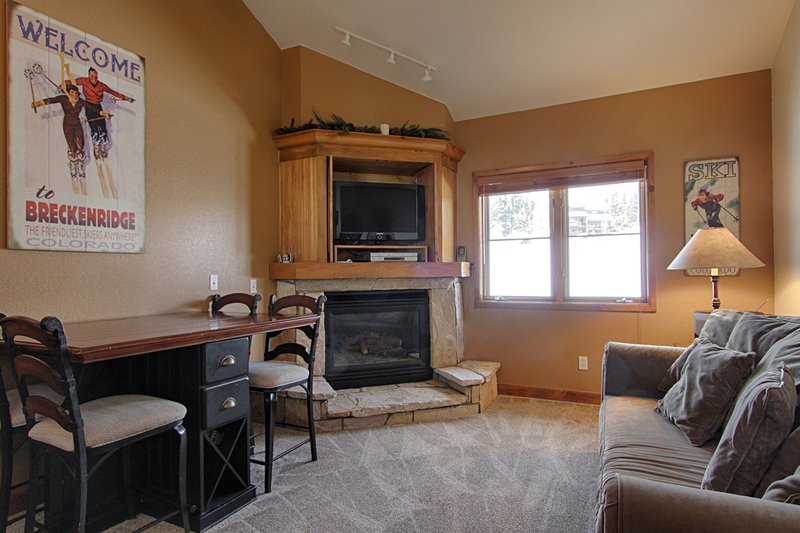 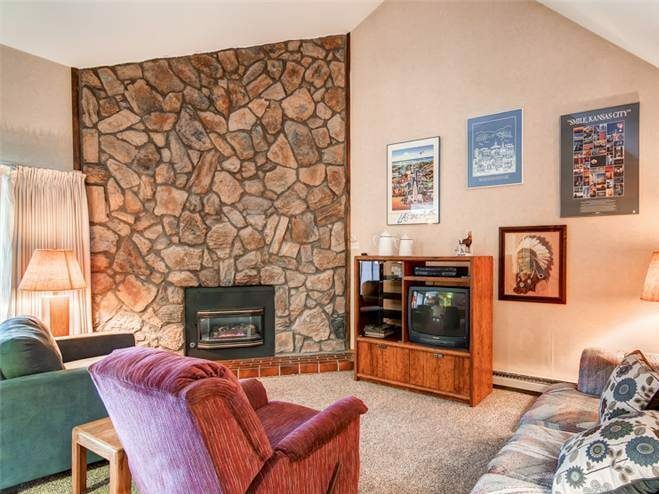 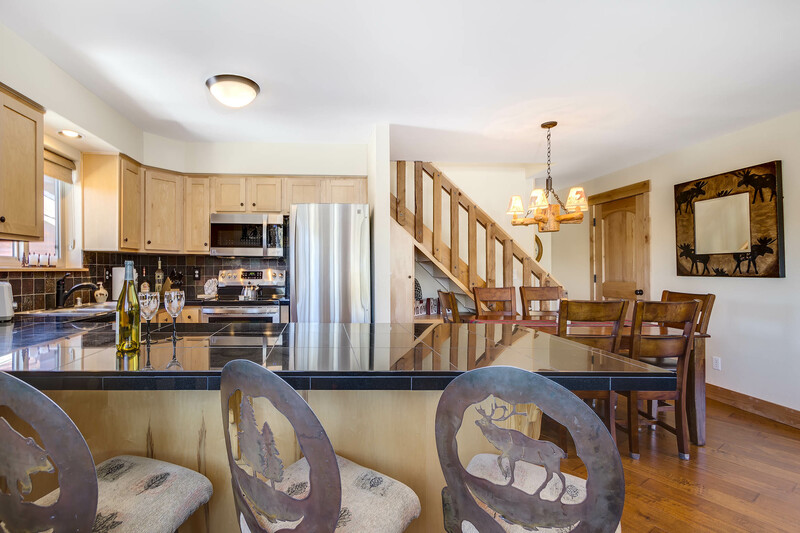 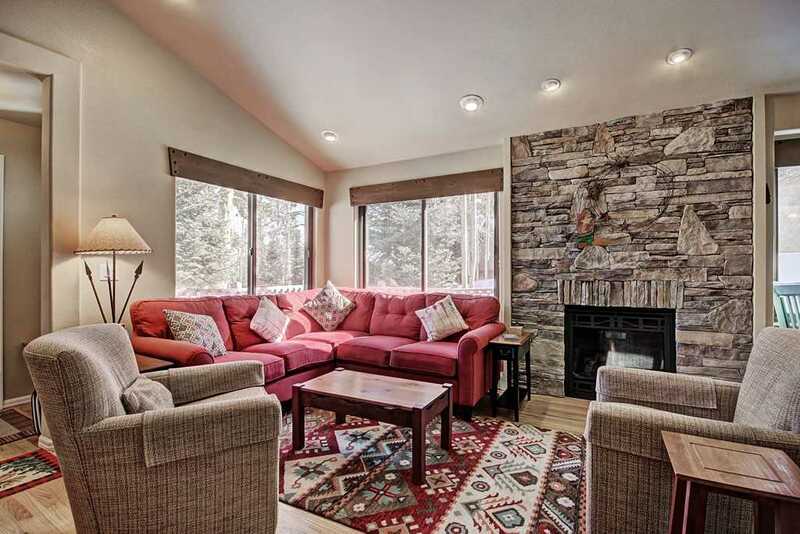 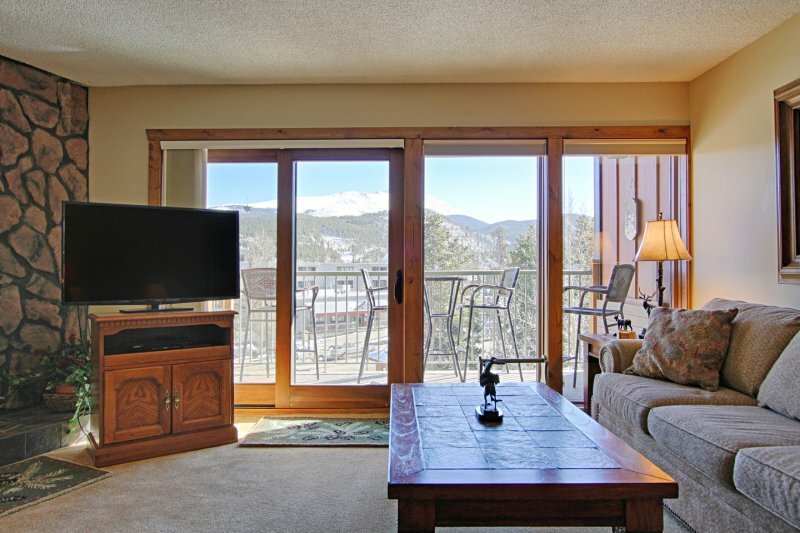 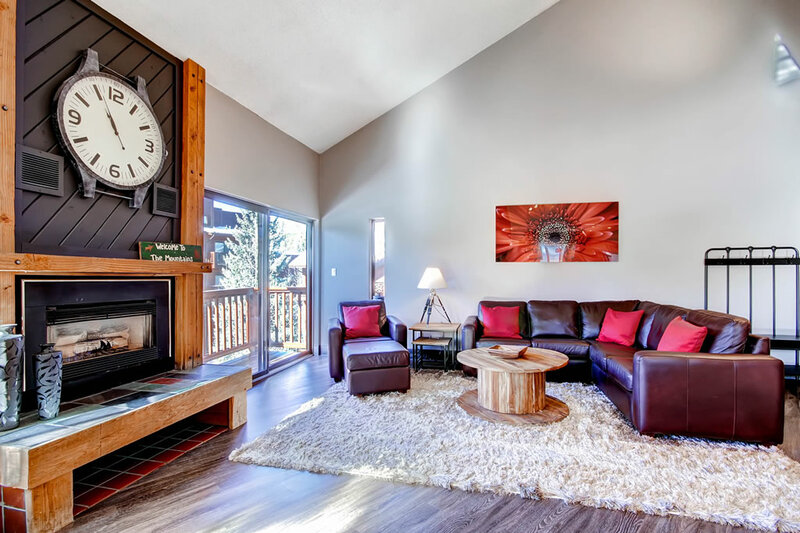 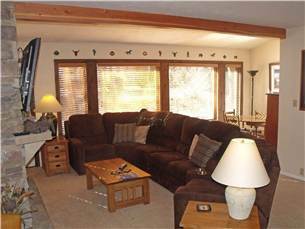 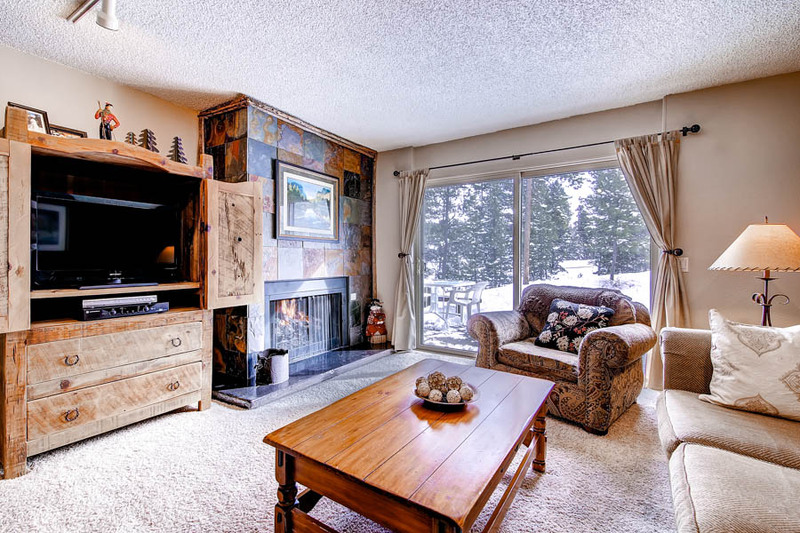 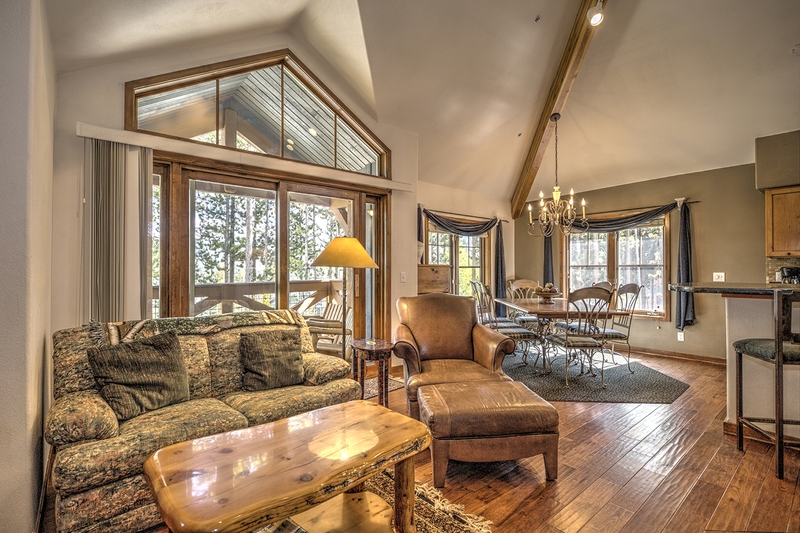 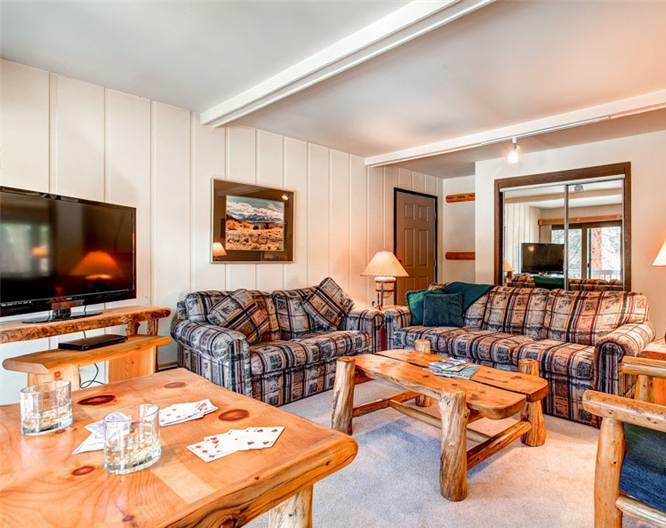 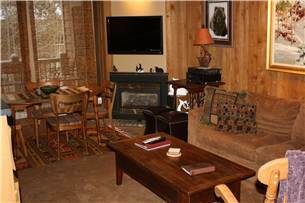 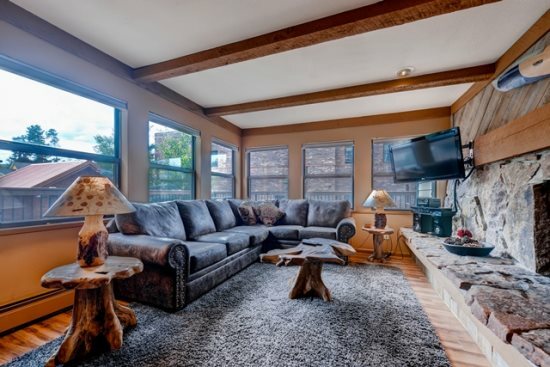 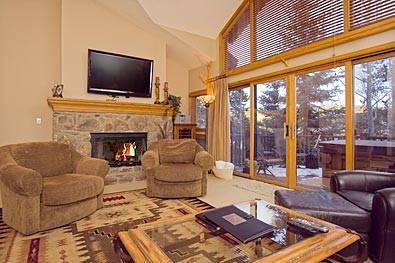 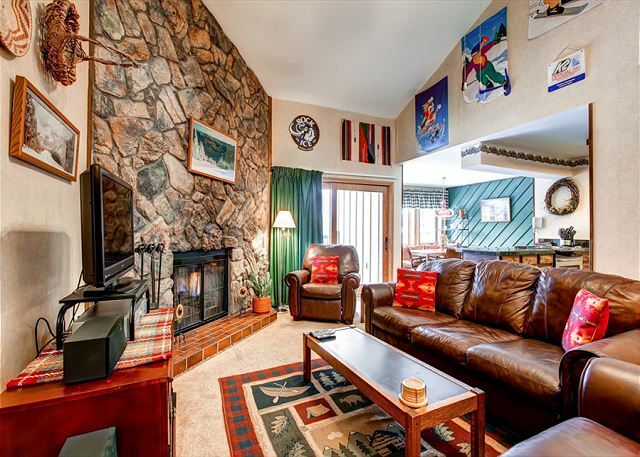 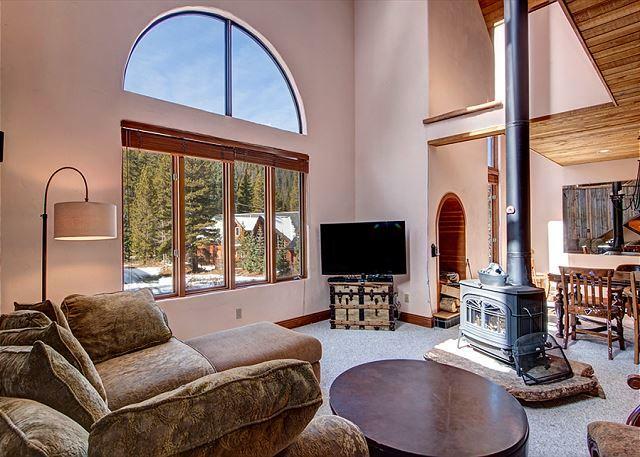 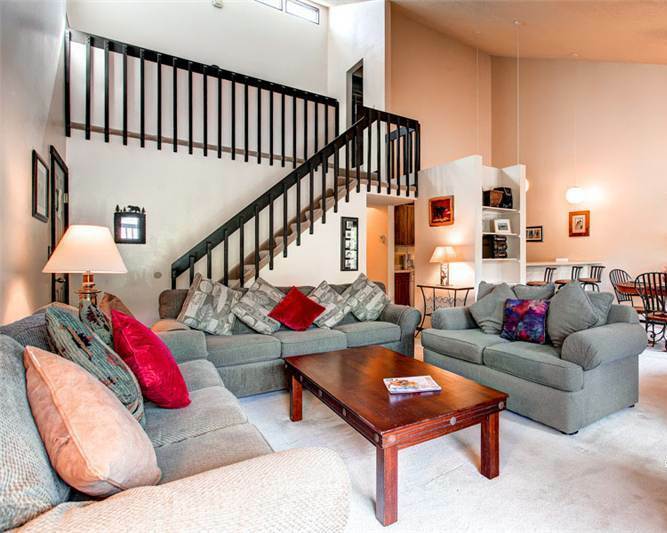 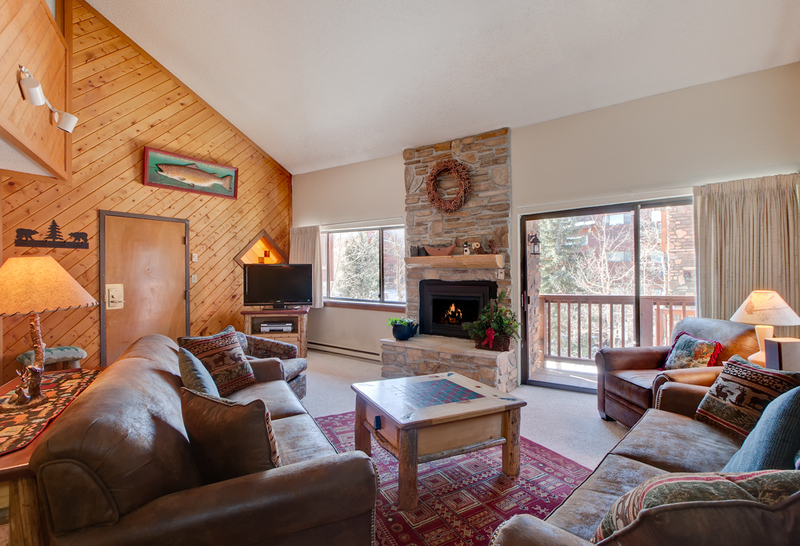 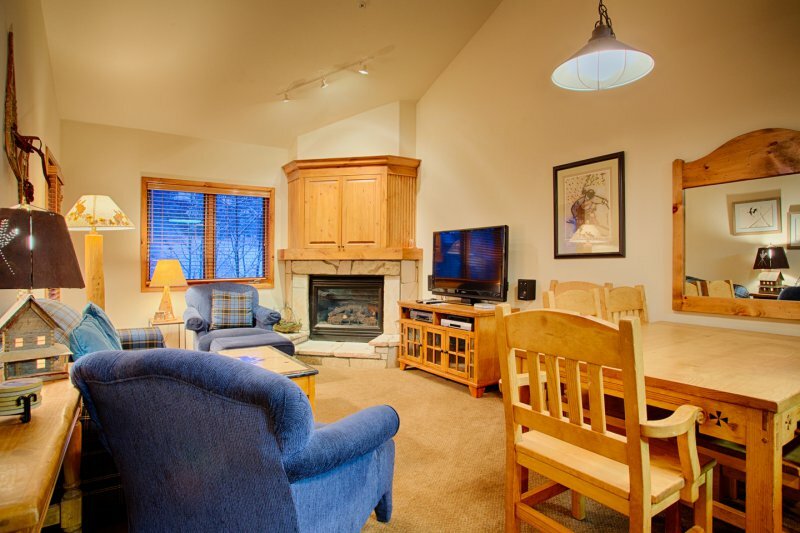 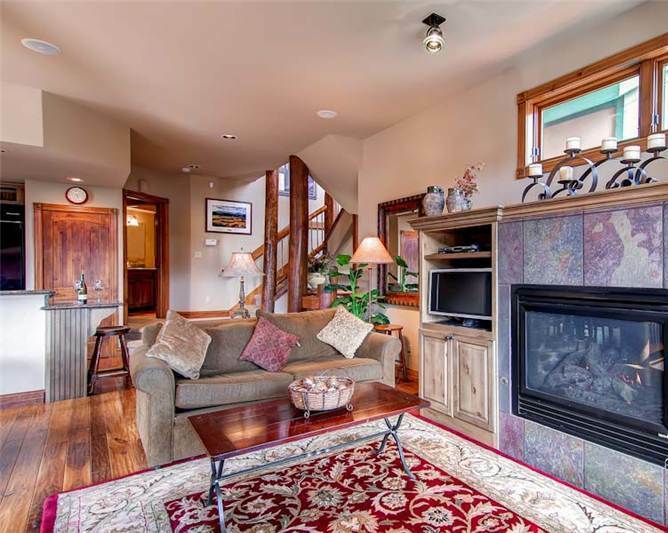 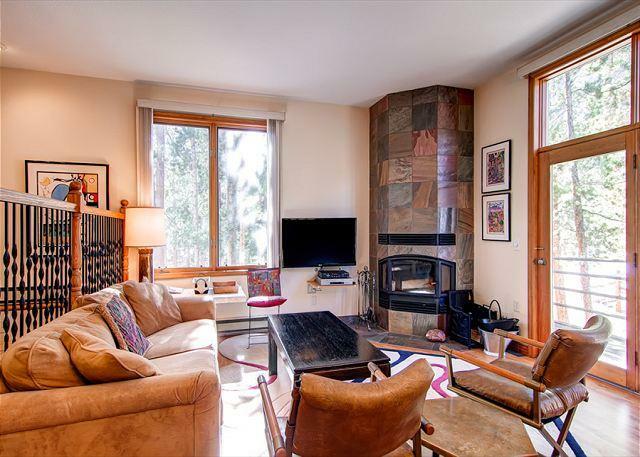 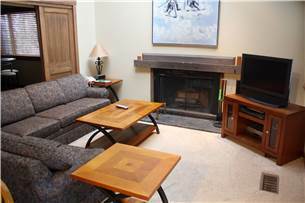 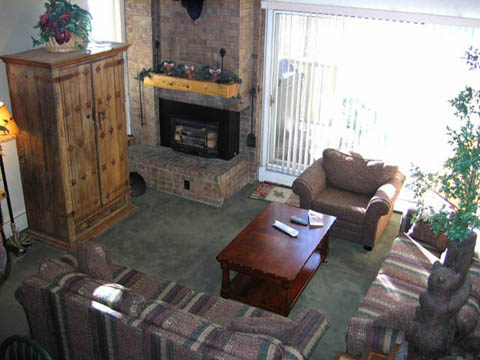 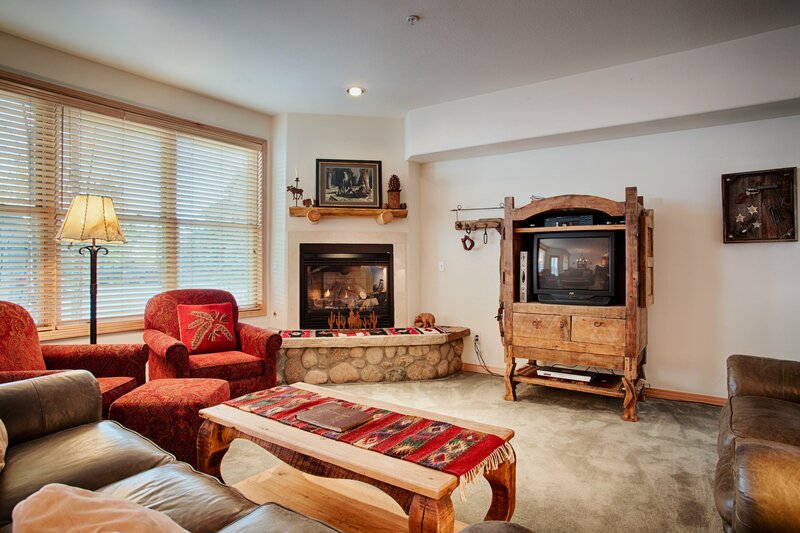 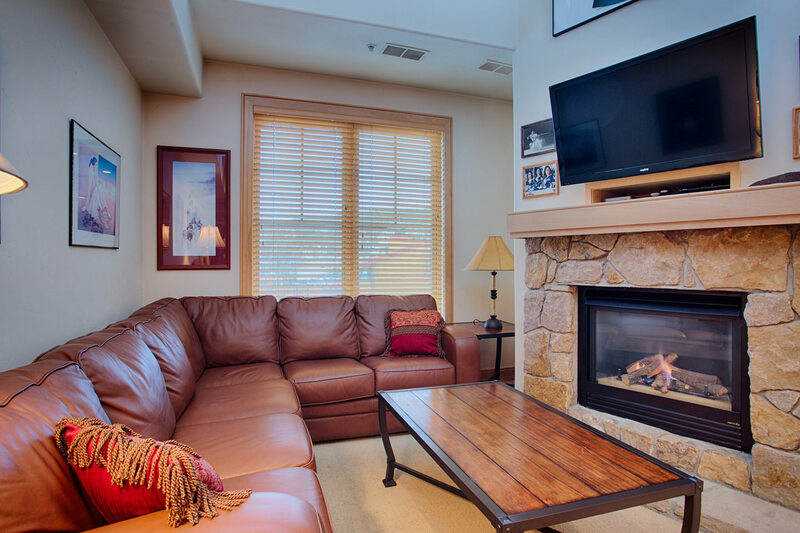 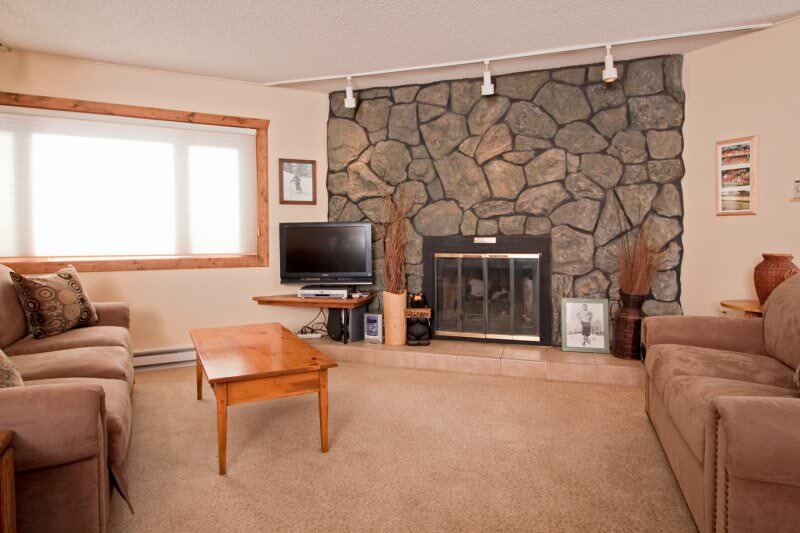 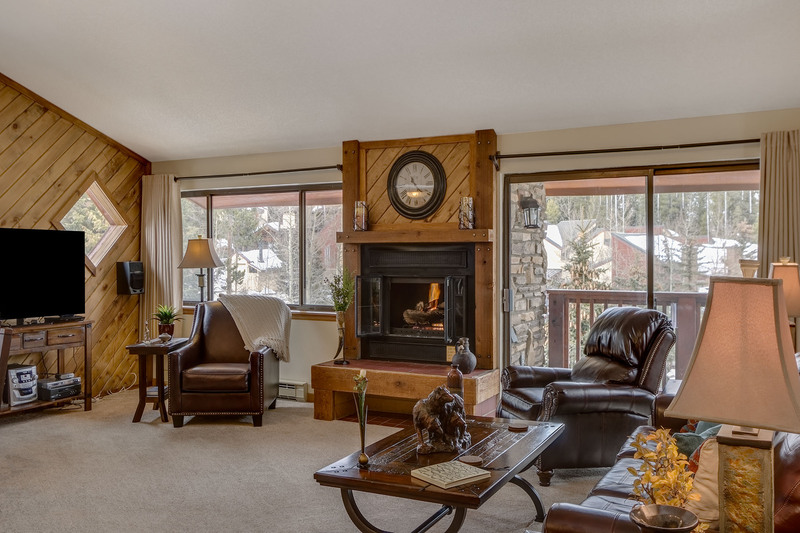 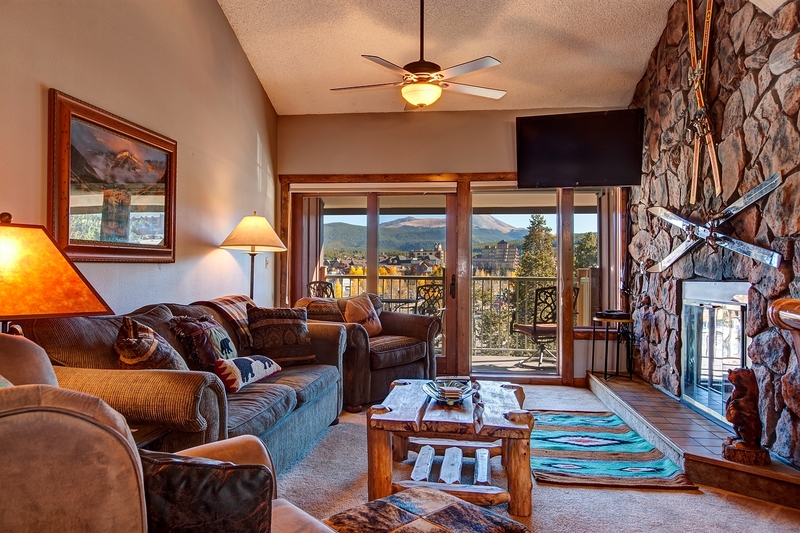 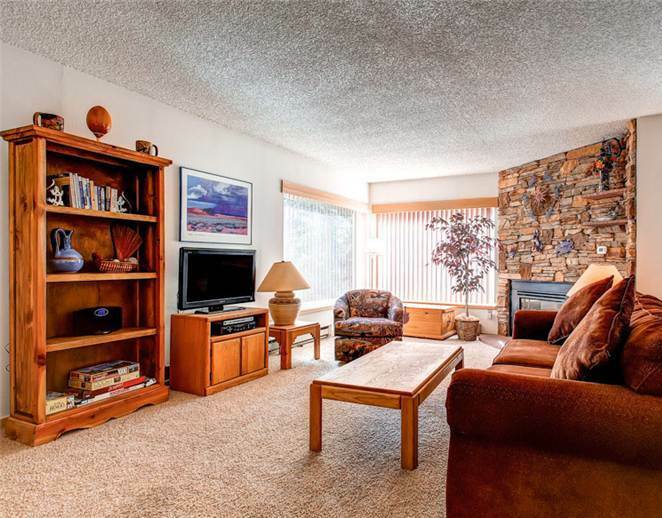 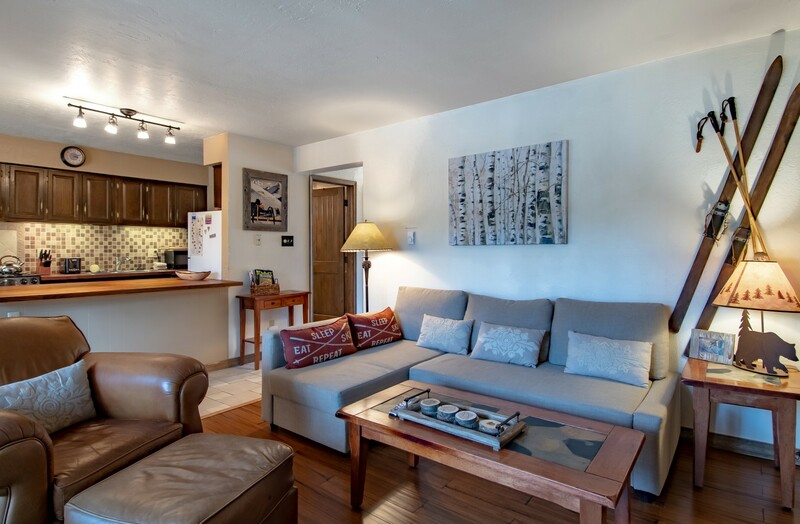 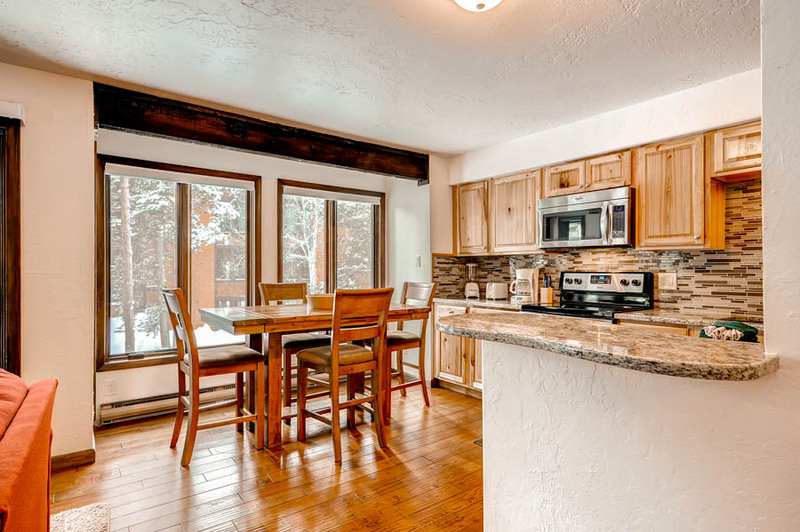 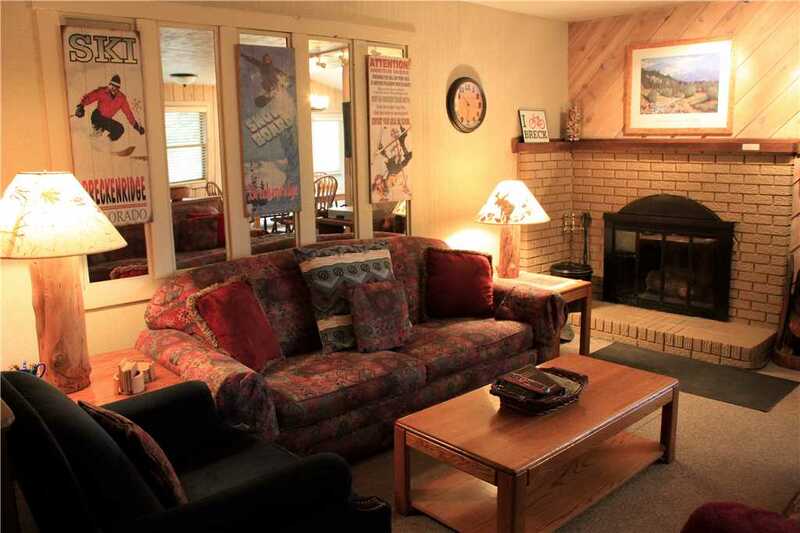 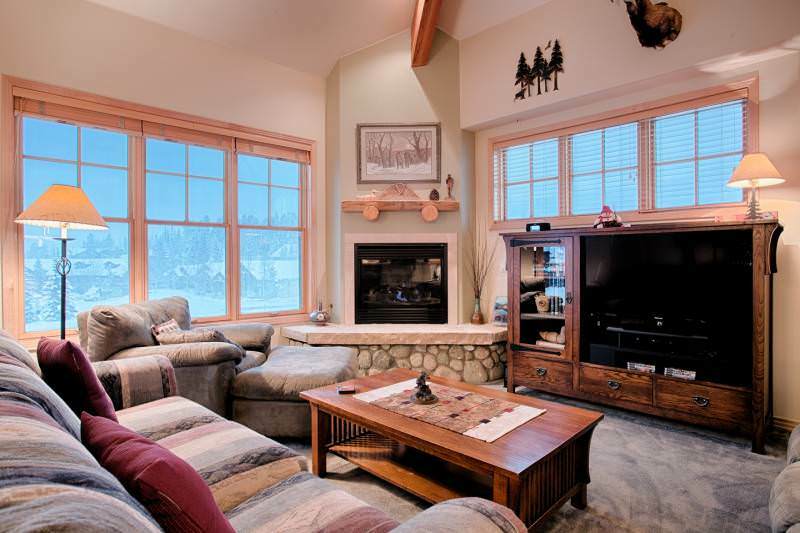 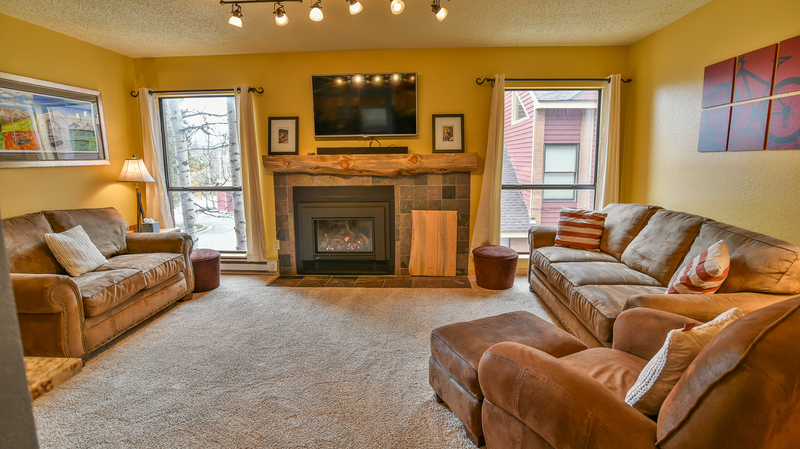 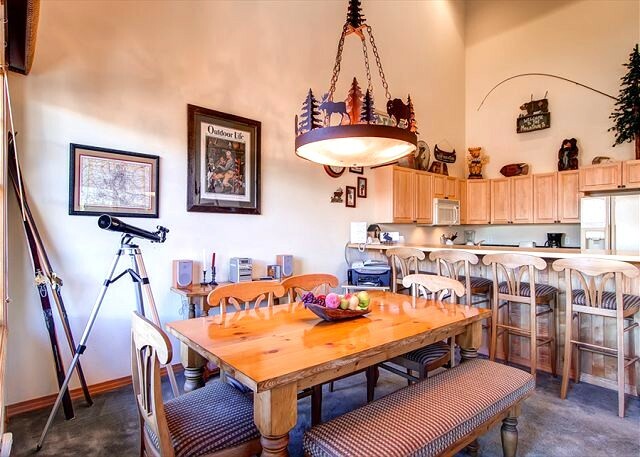 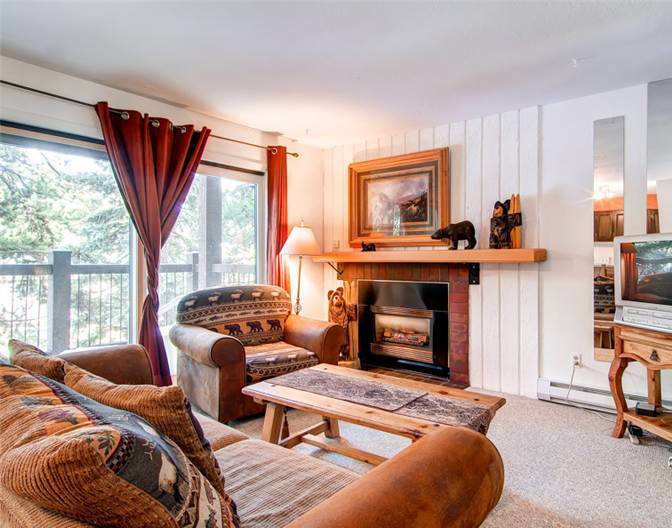 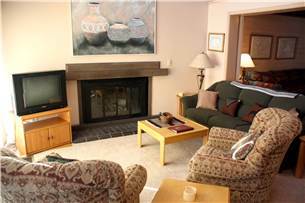 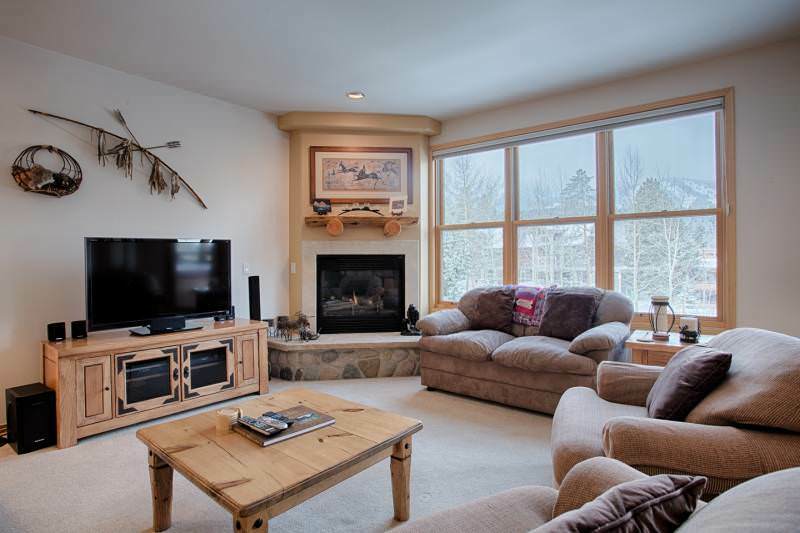 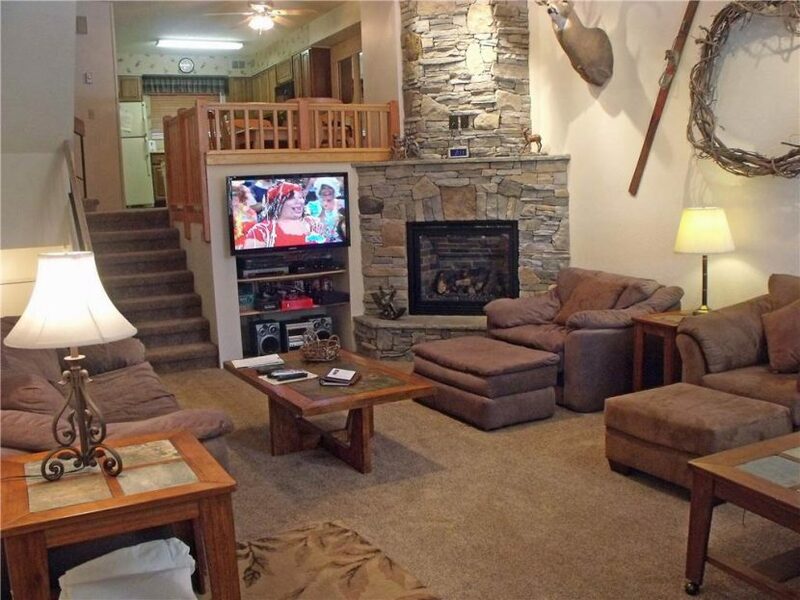 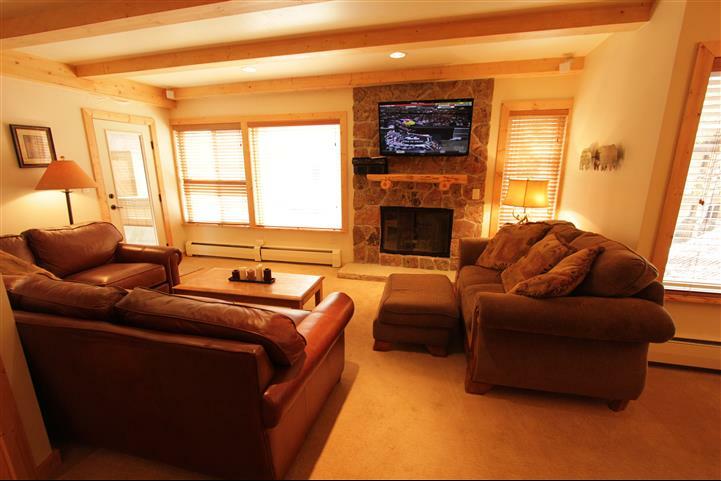 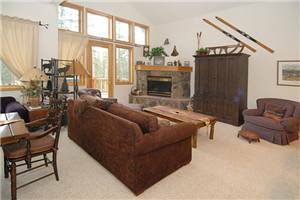 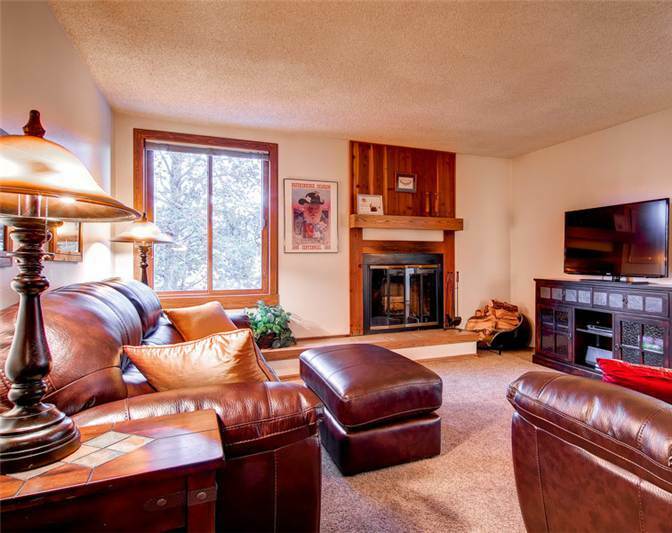 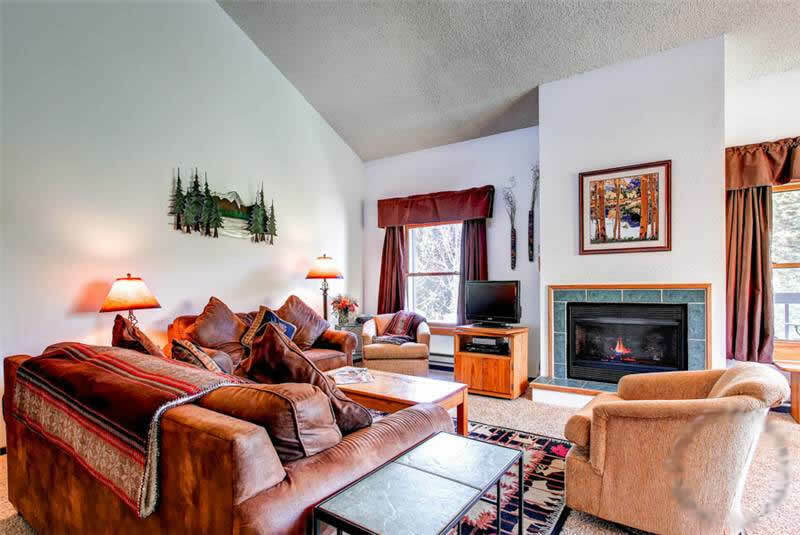 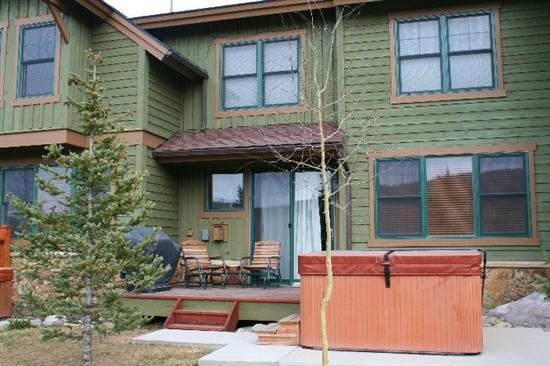 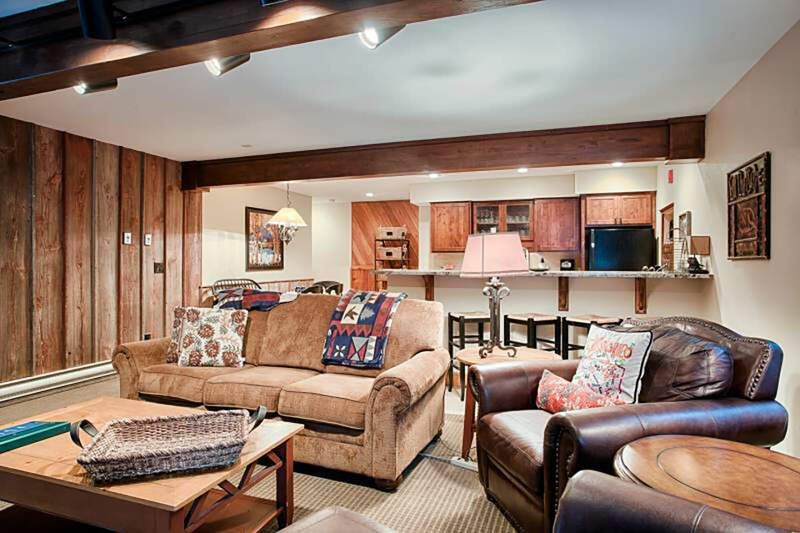 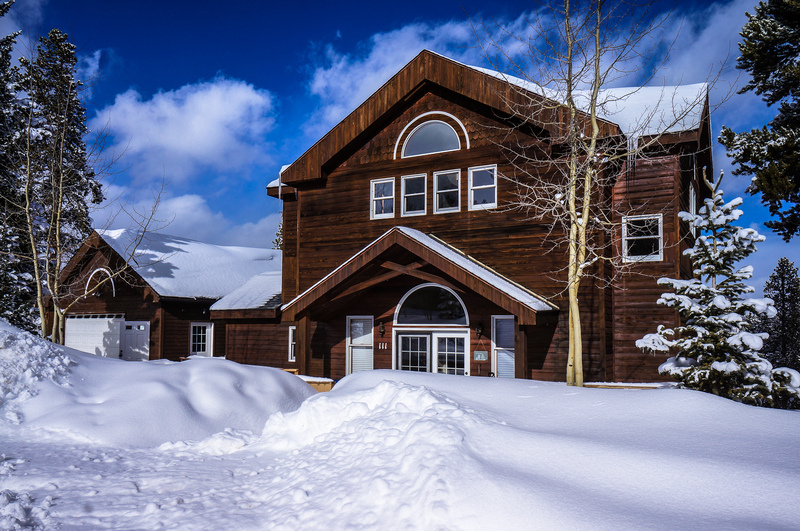 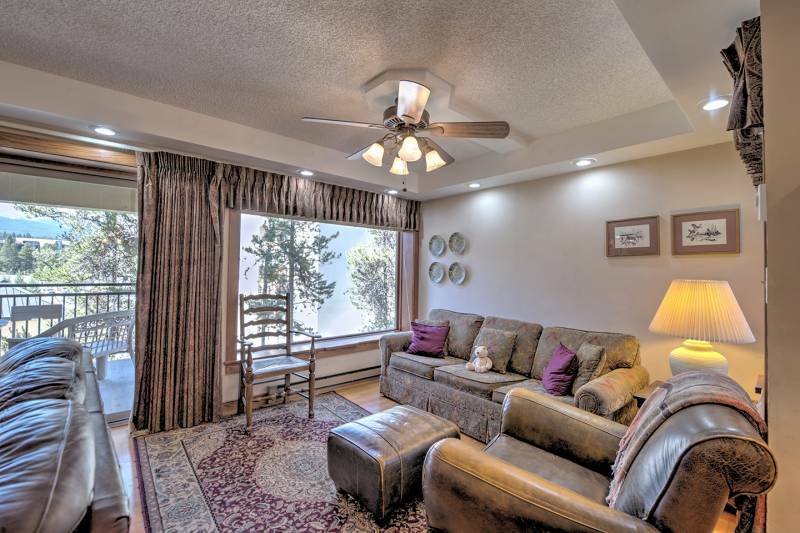 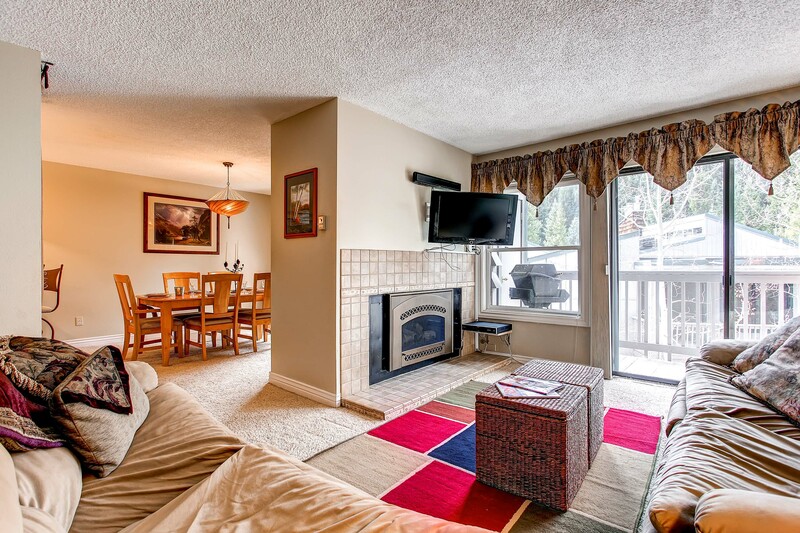 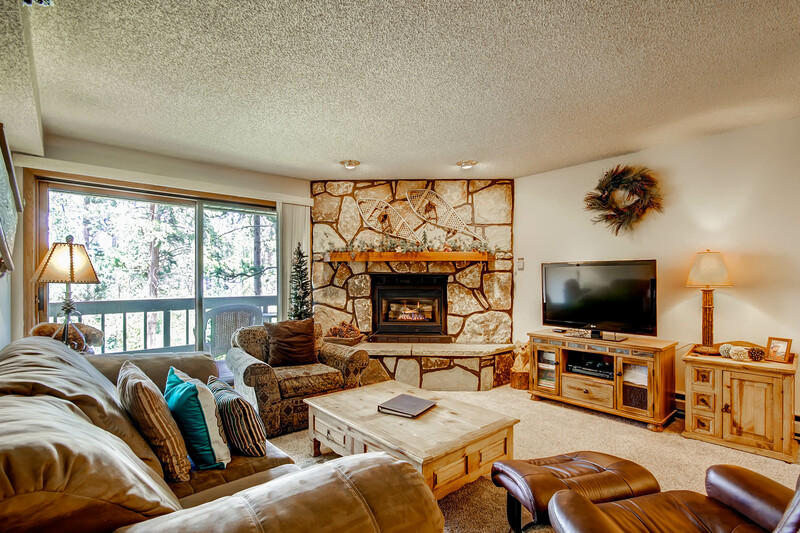 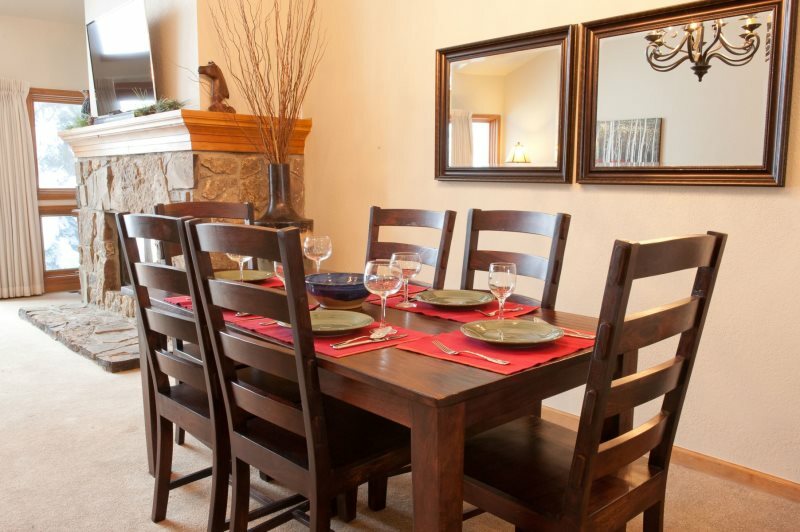 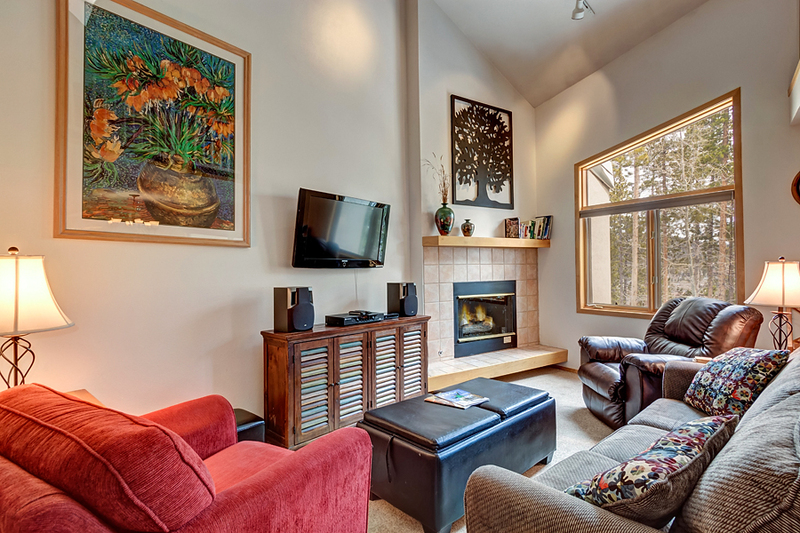 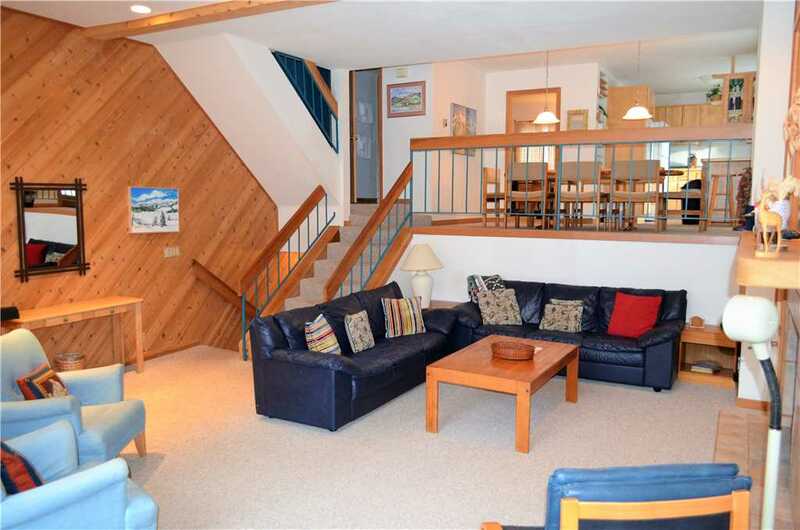 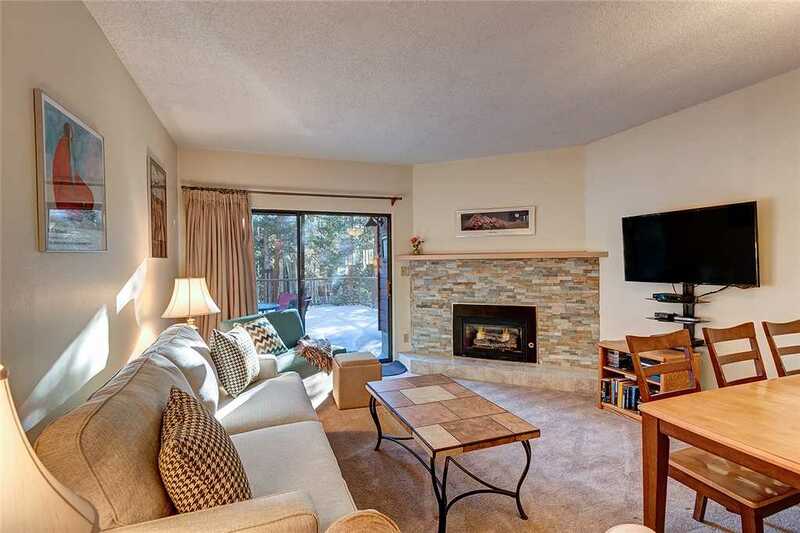 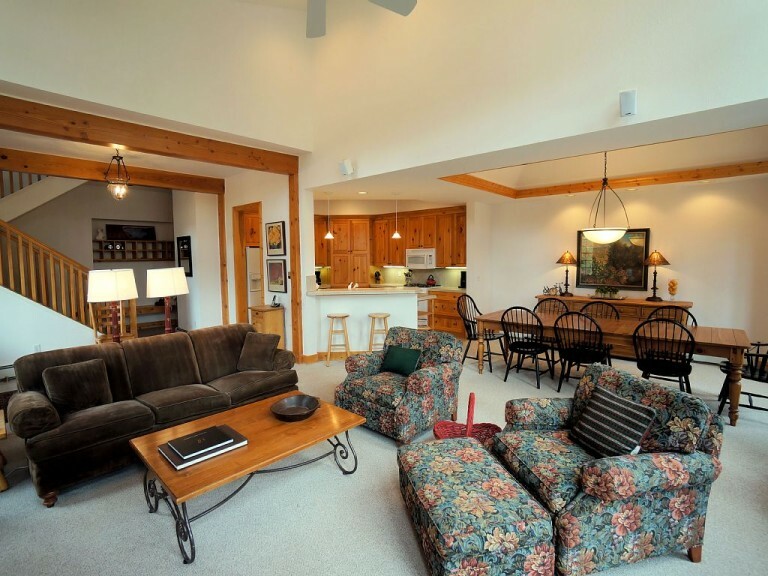 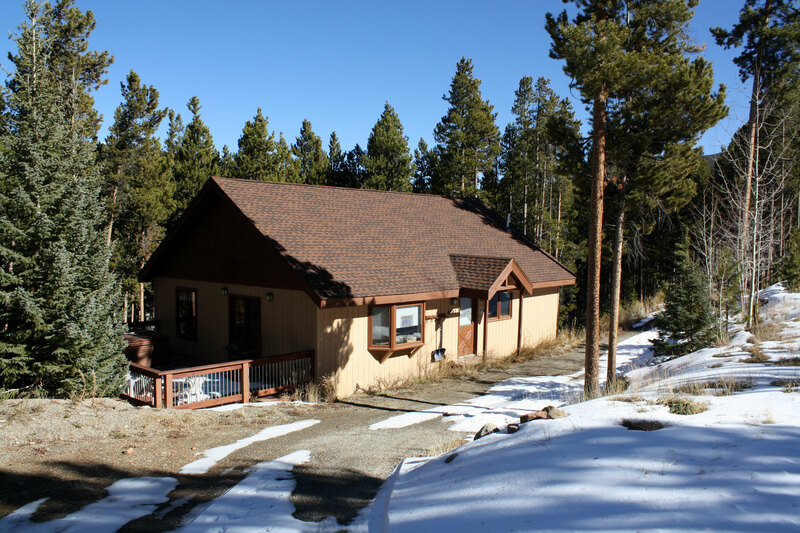 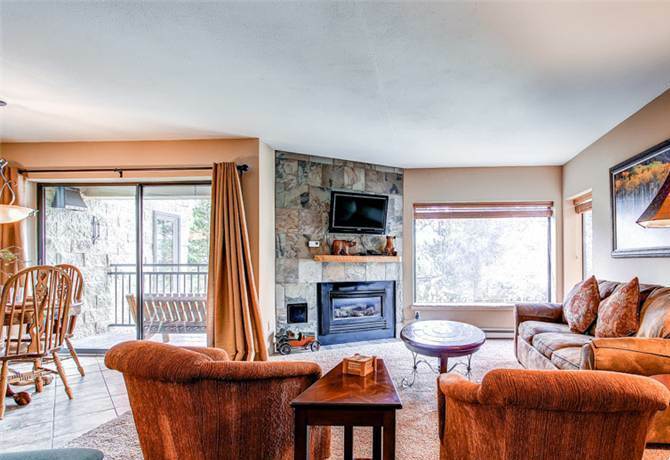 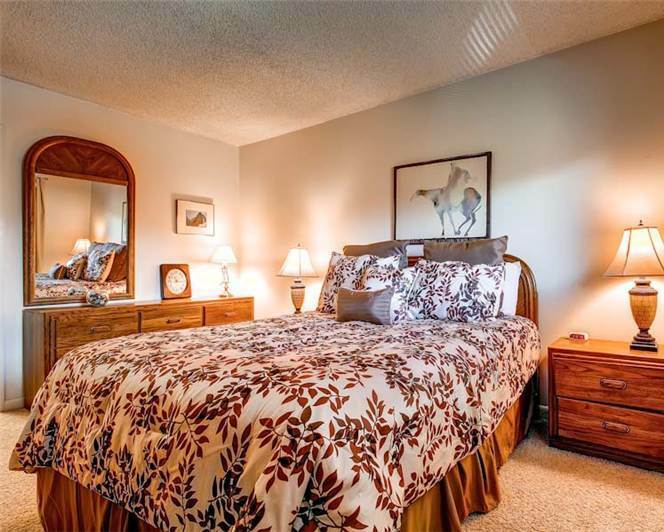 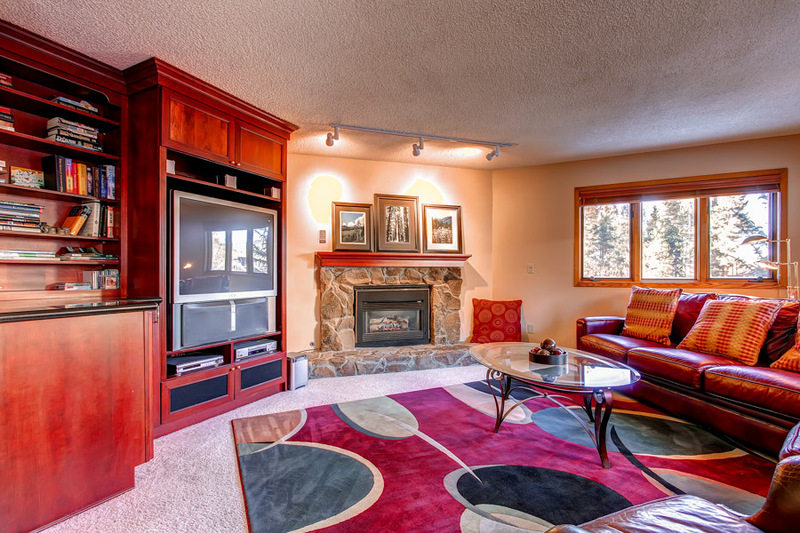 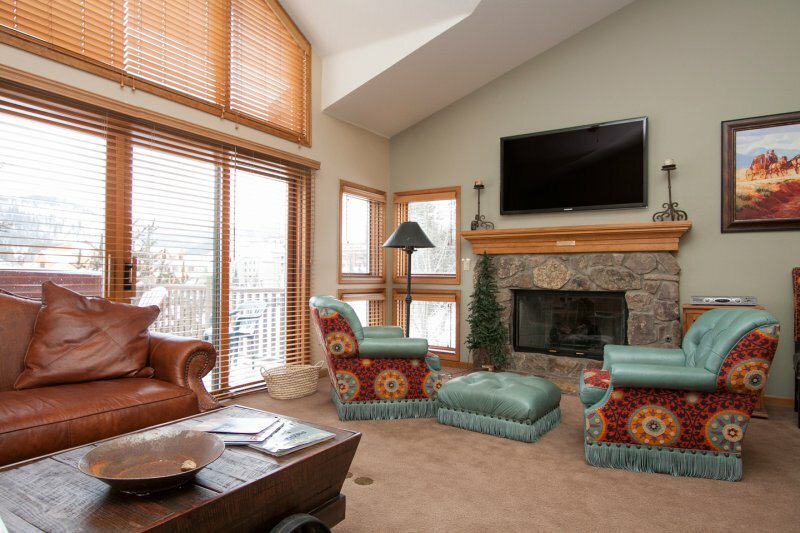 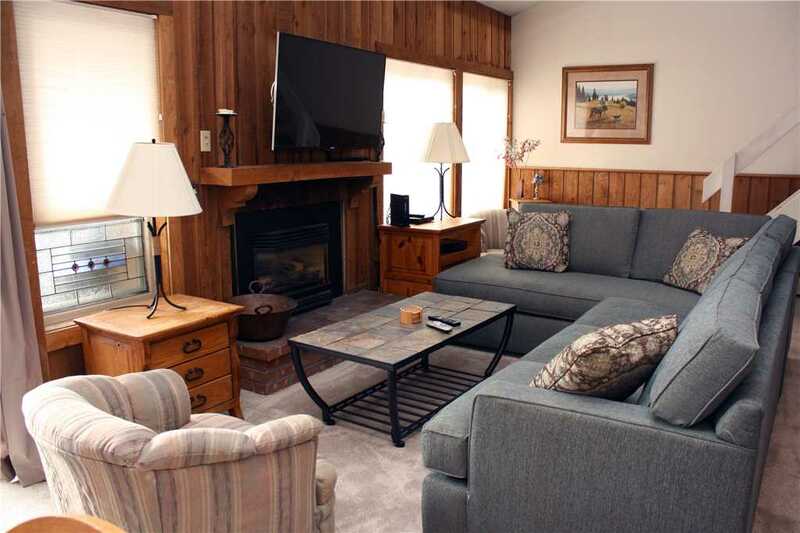 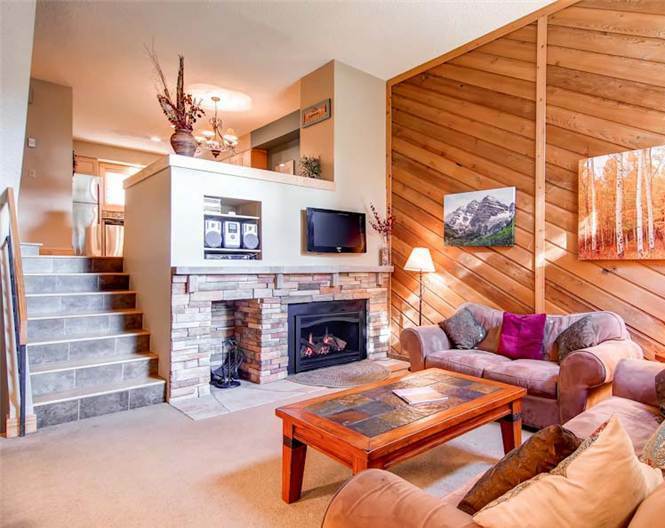 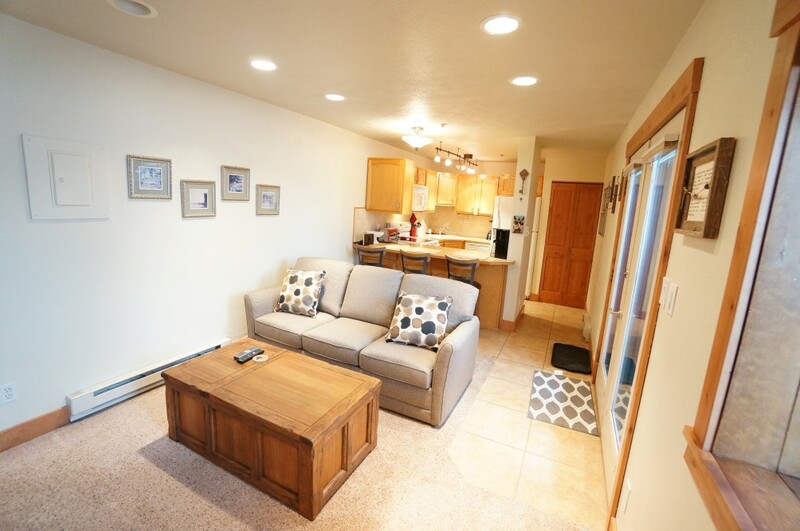 This is a fabulous condo with breathtaking panoramic views of the Breckenridge Ski Resort. 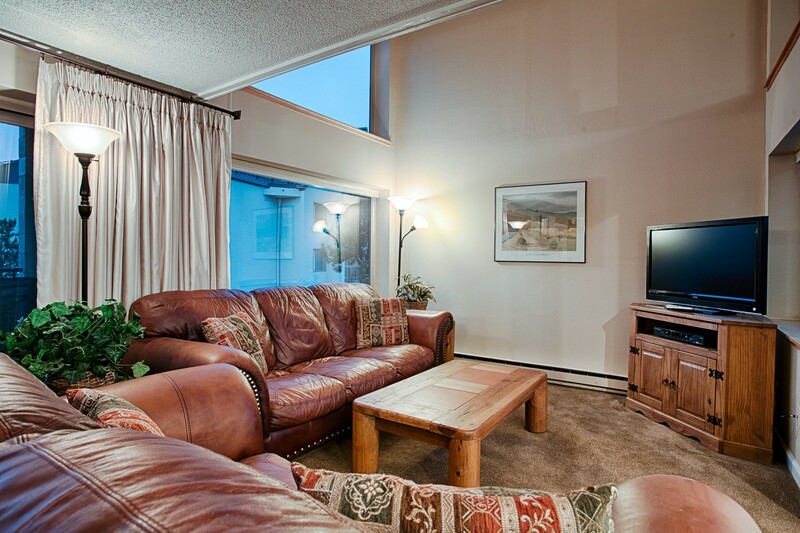 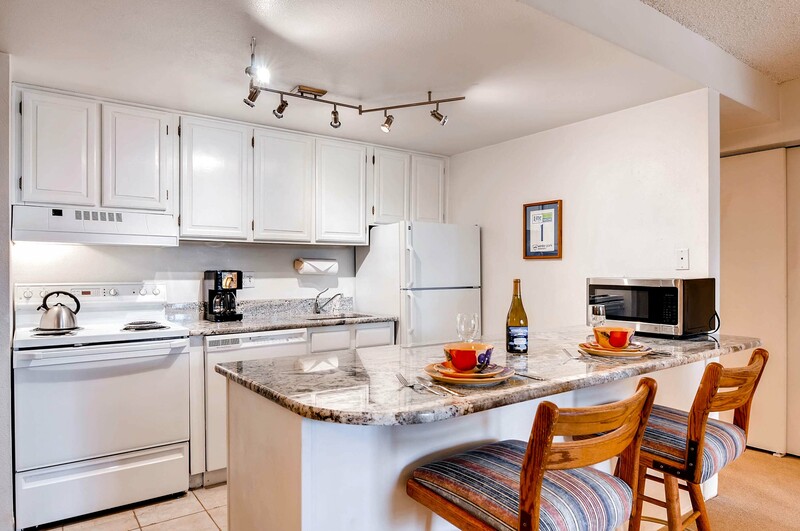 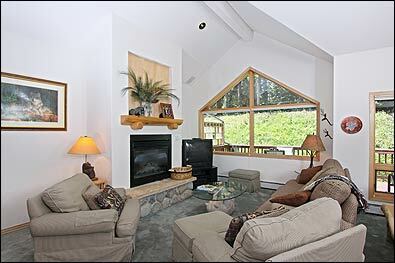 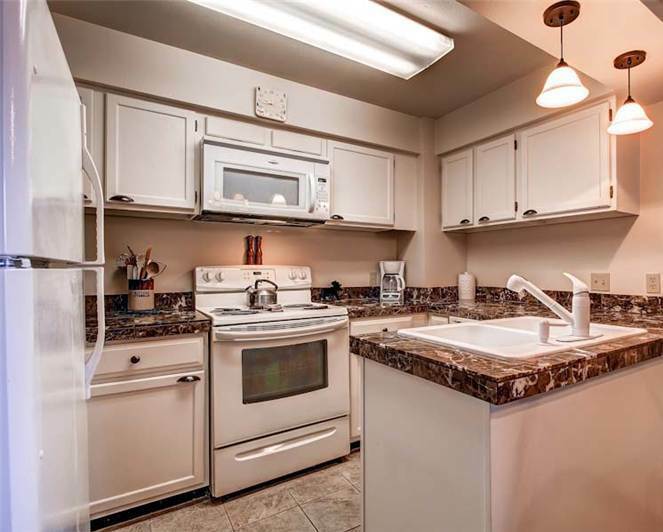 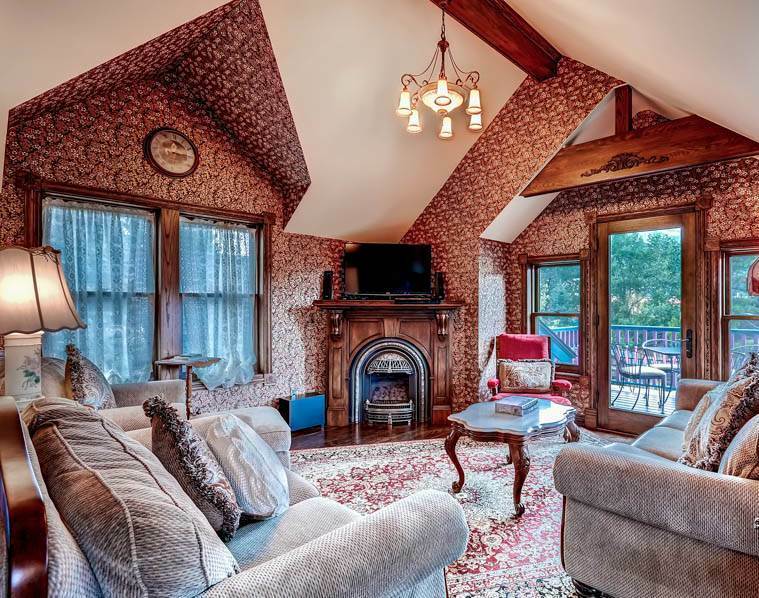 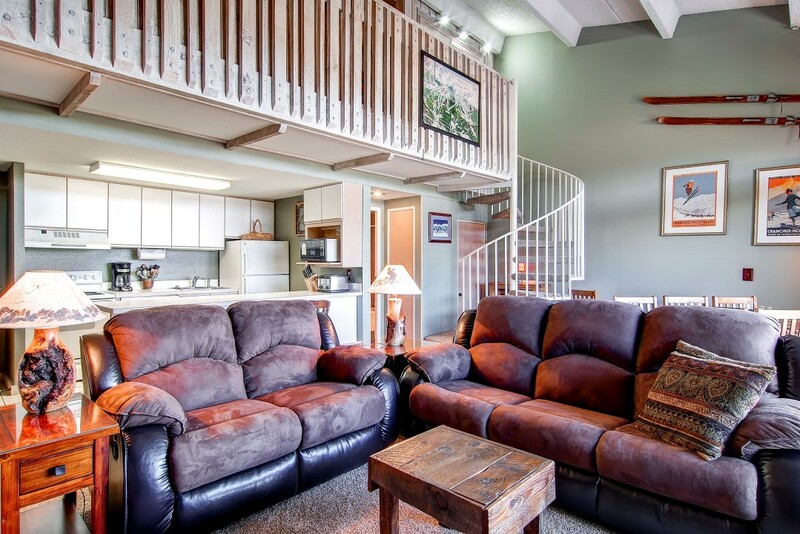 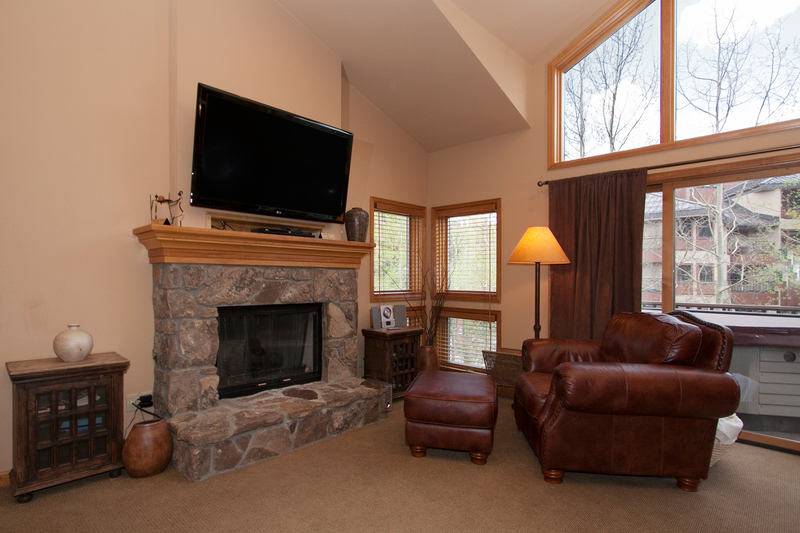 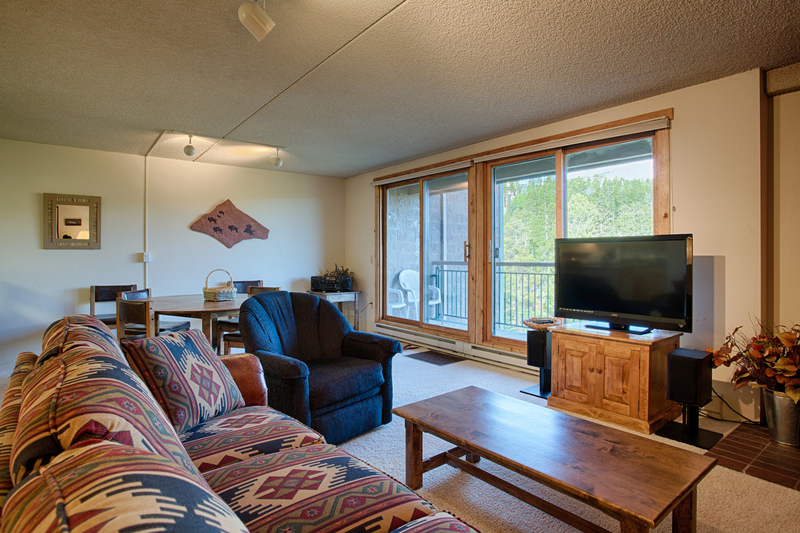 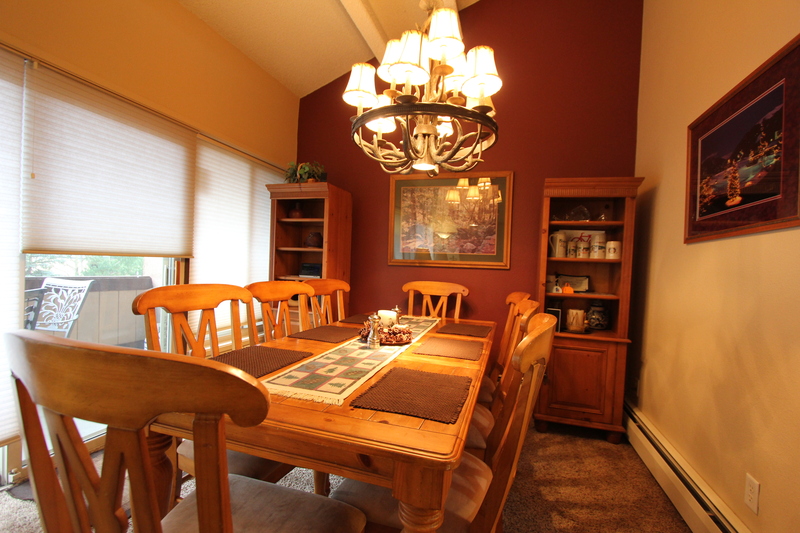 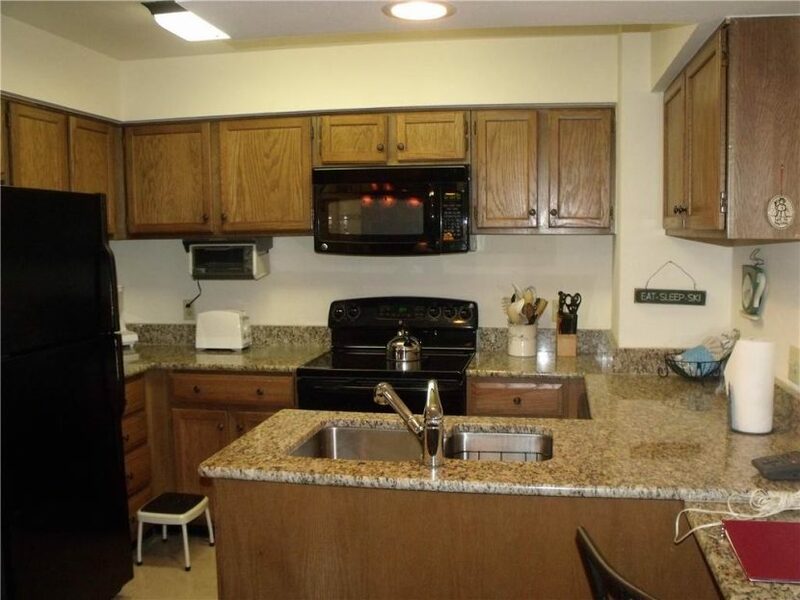 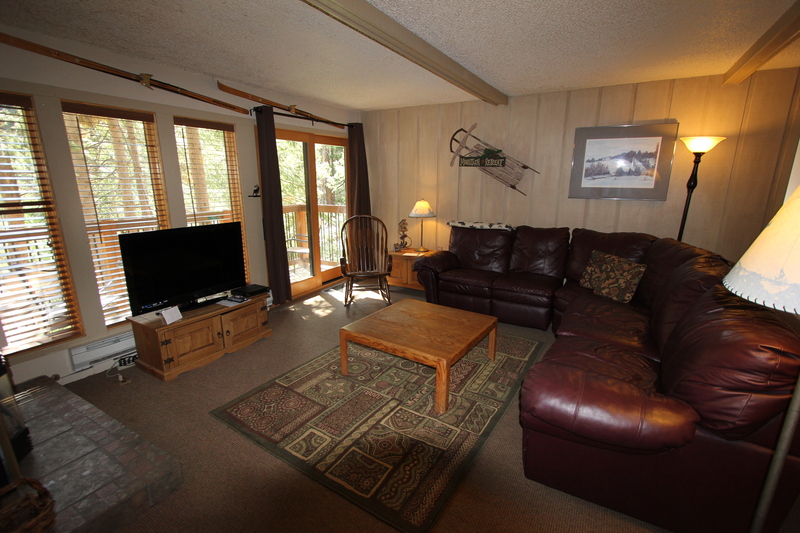 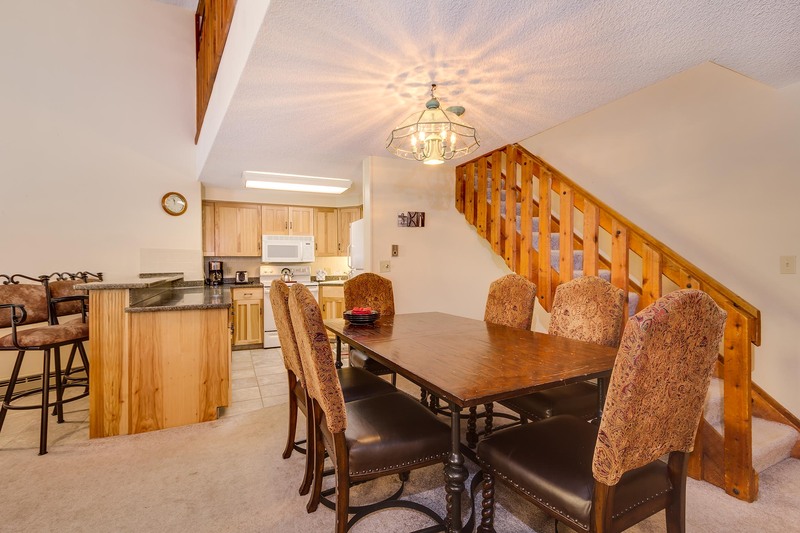 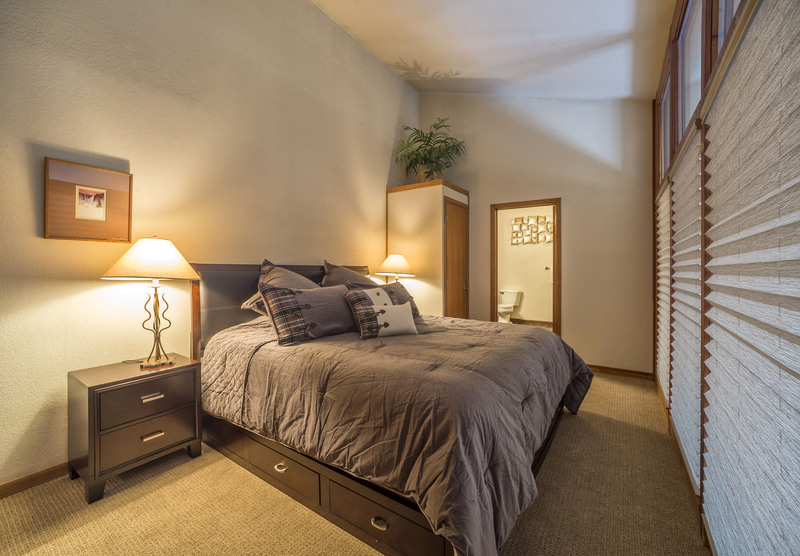 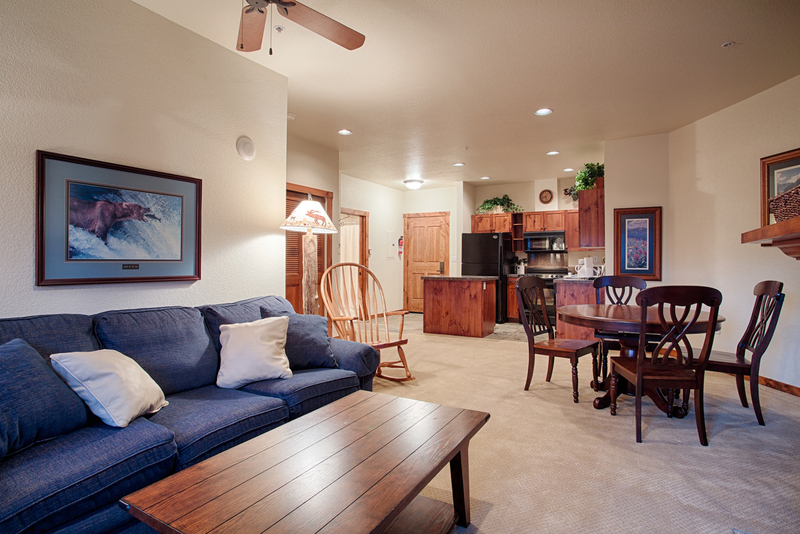 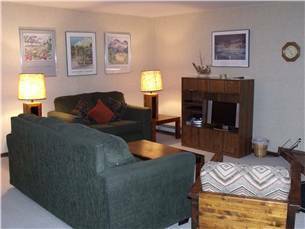 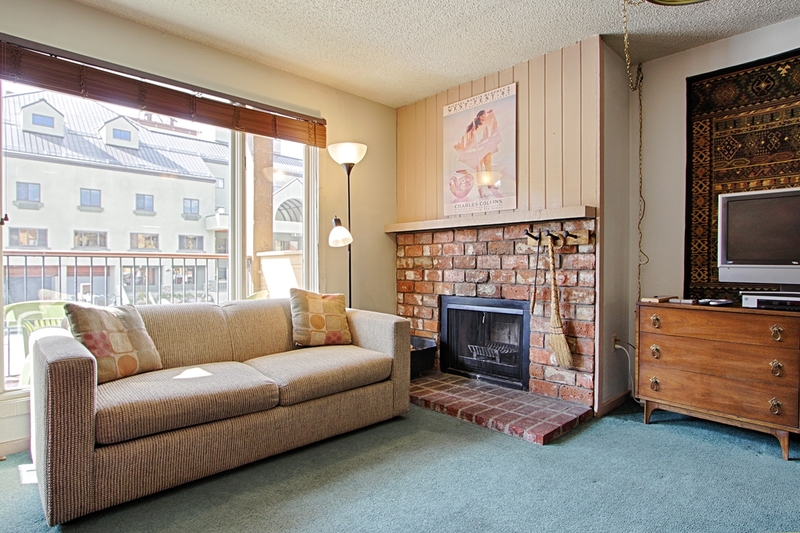 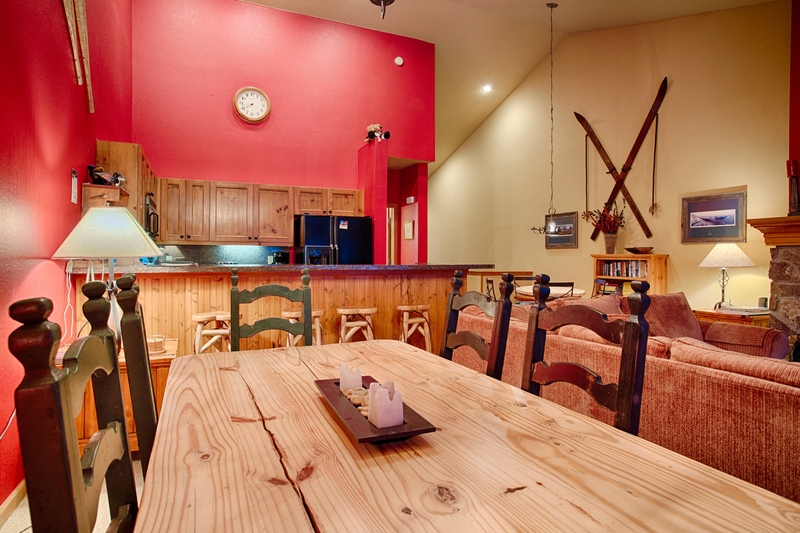 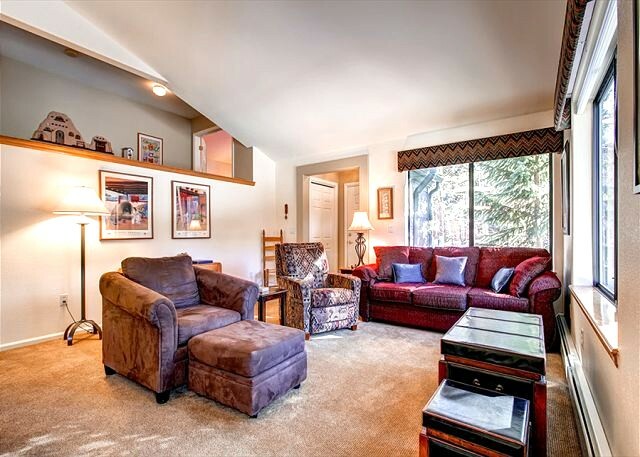 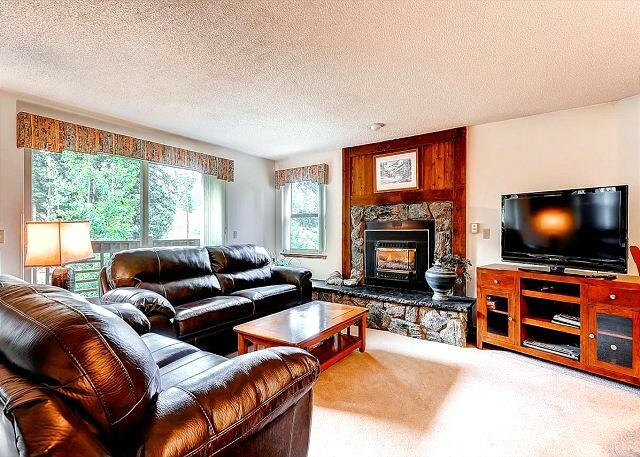 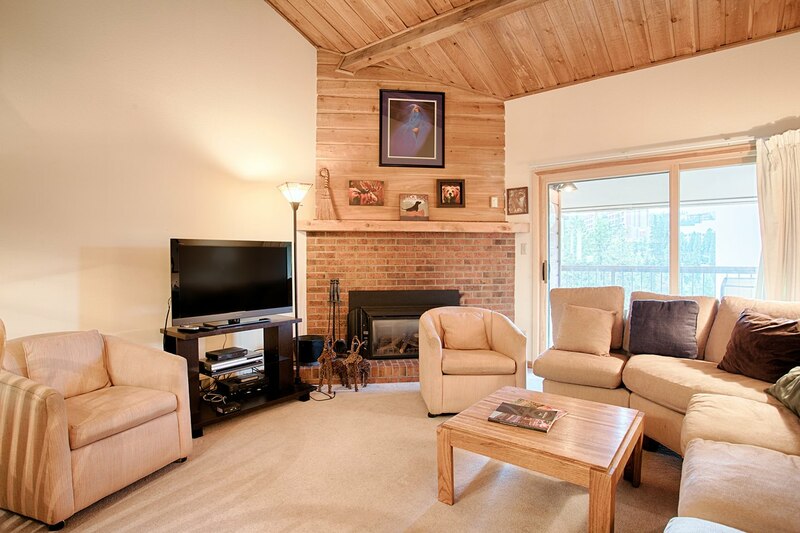 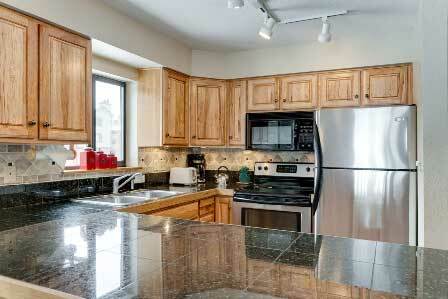 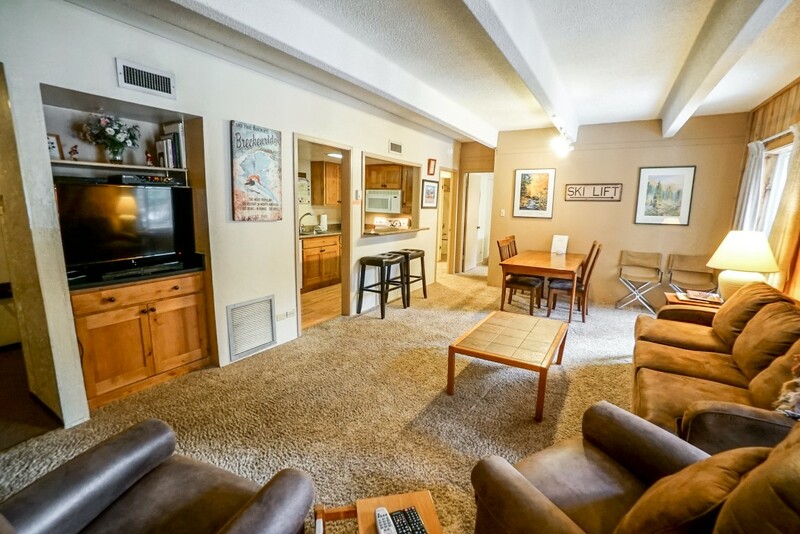 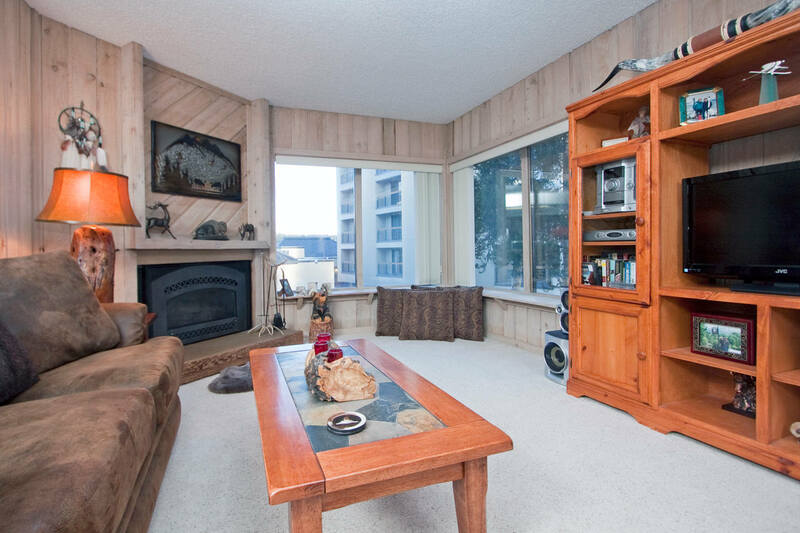 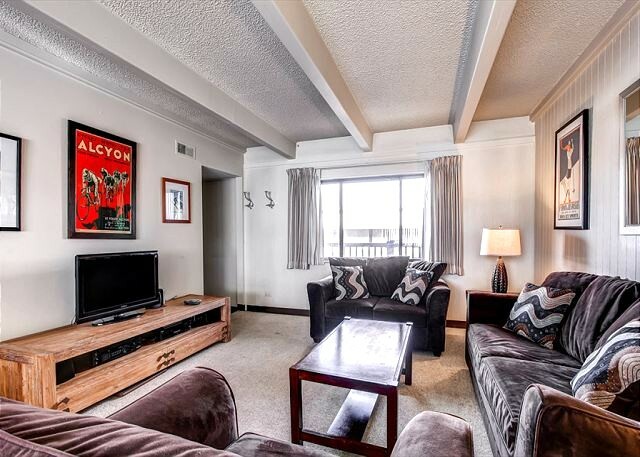 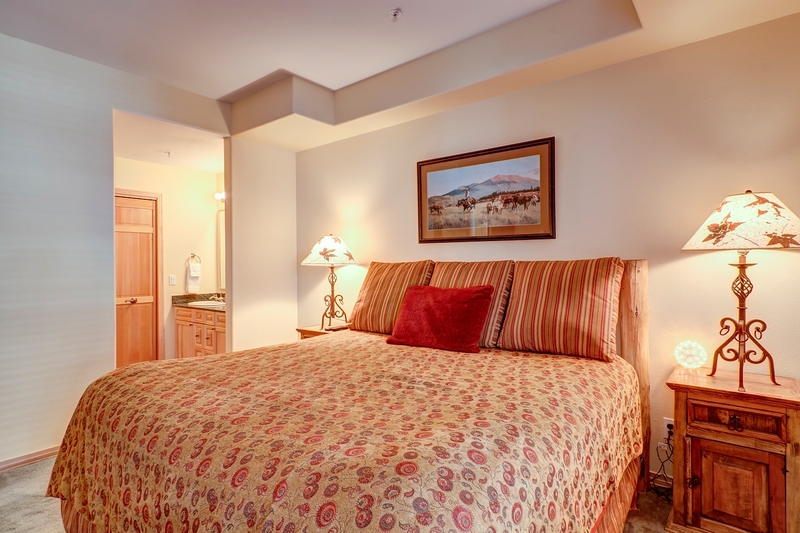 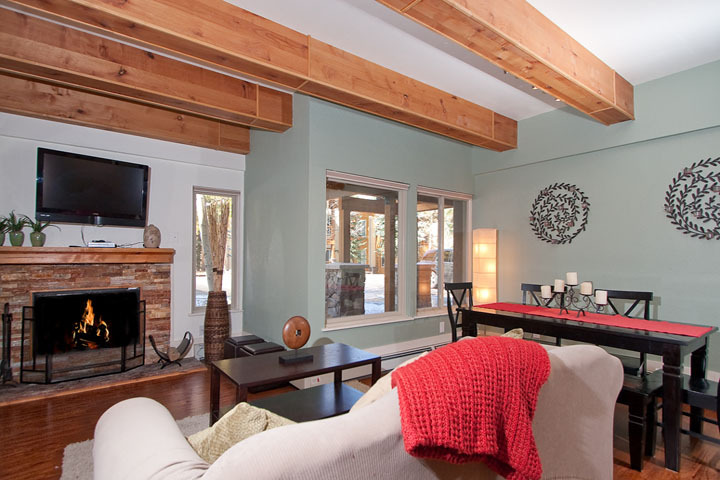 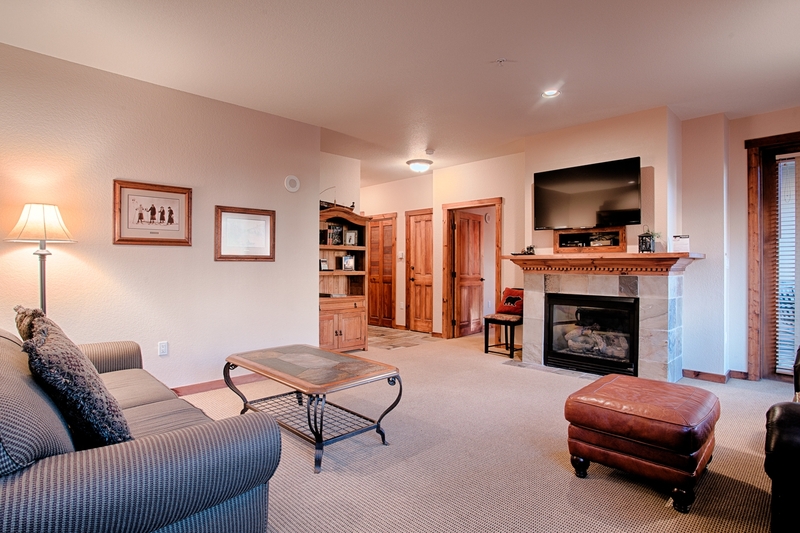 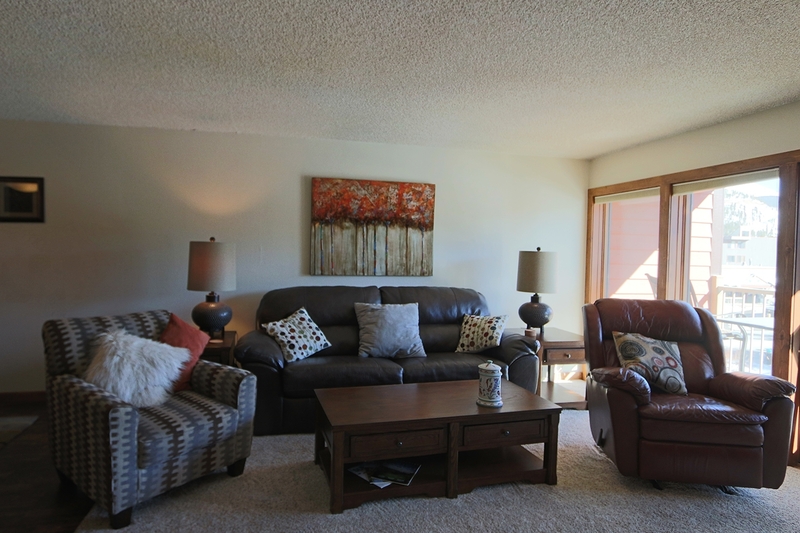 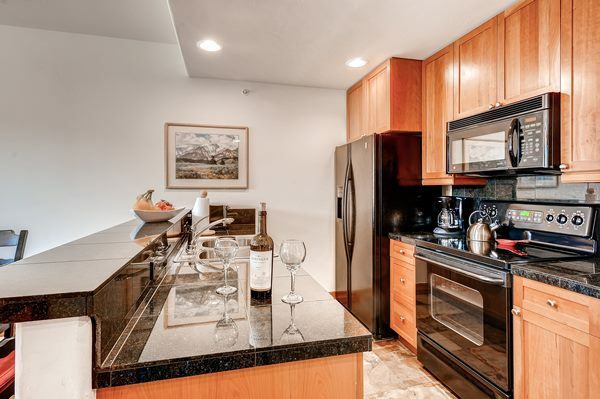 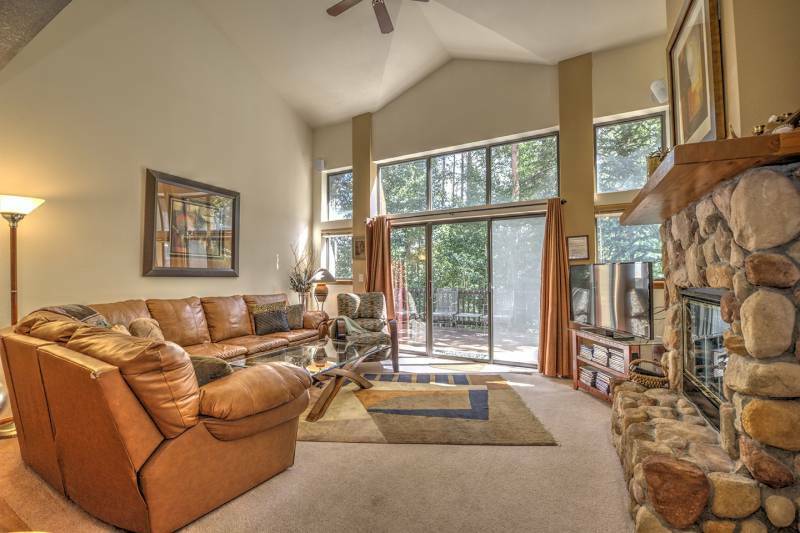 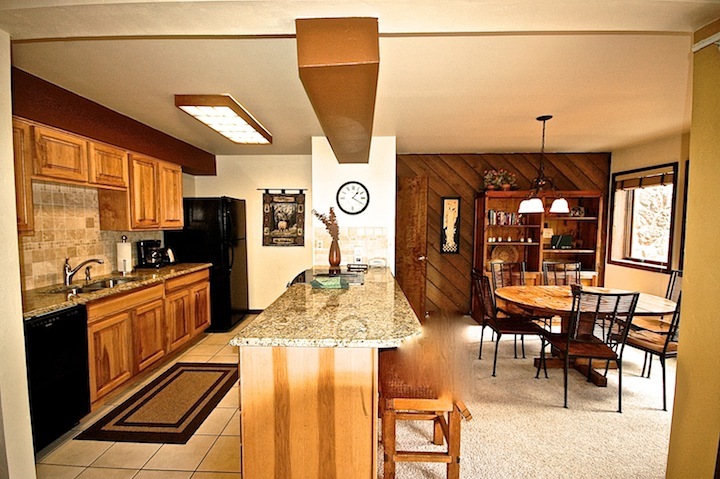 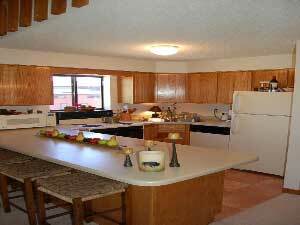 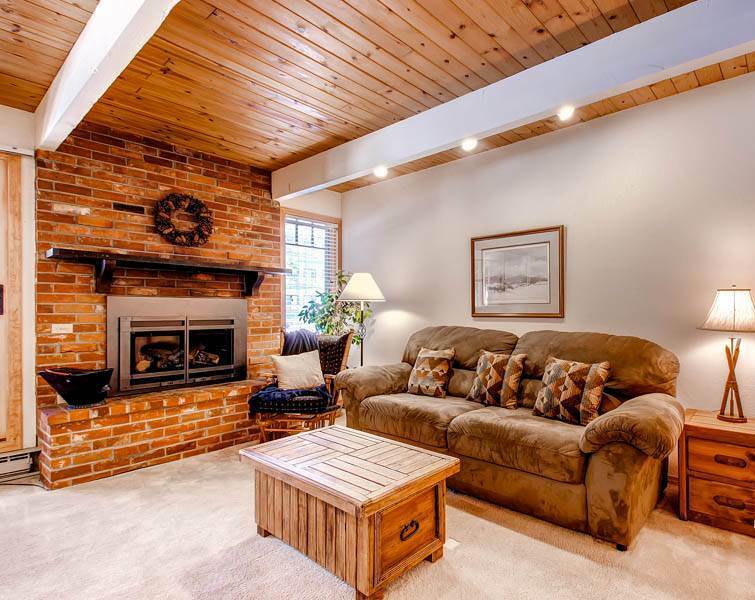 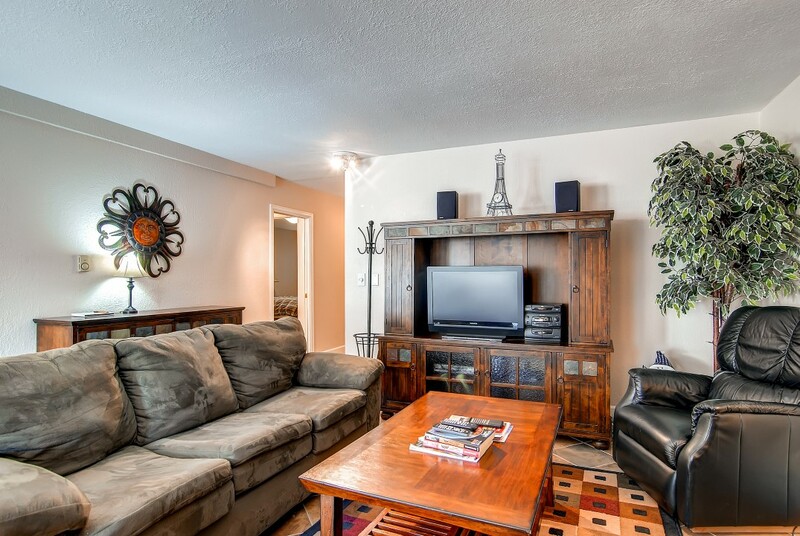 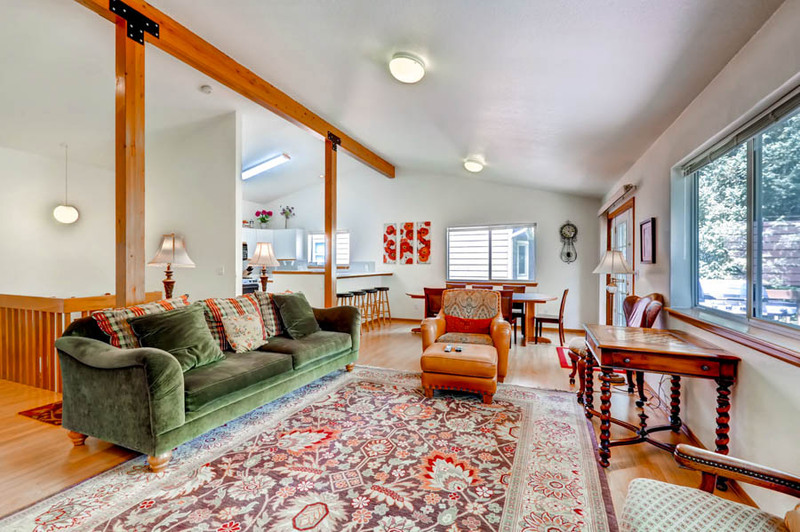 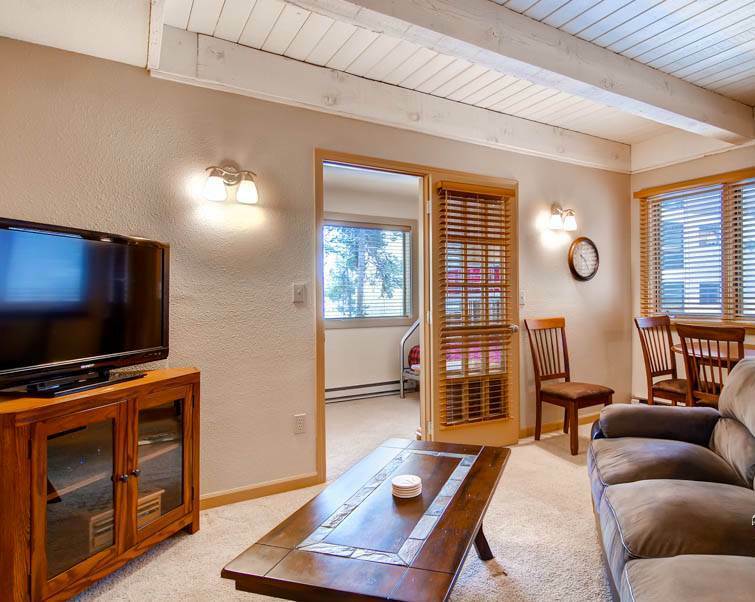 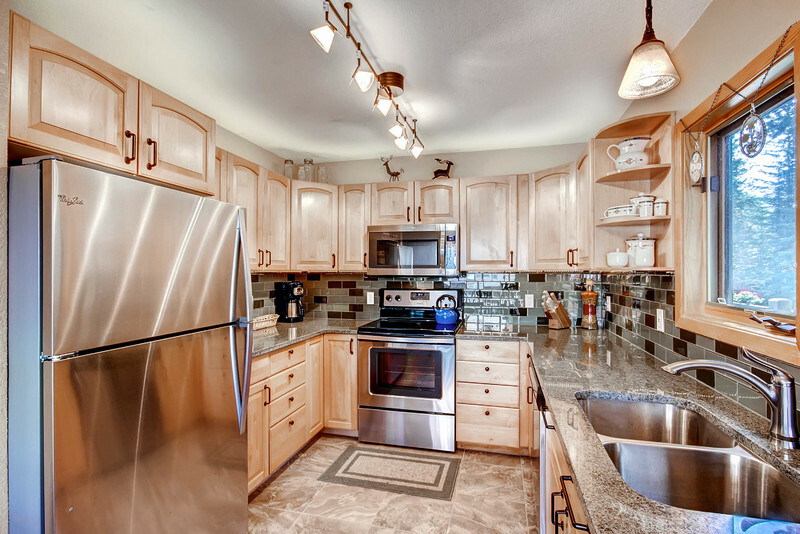 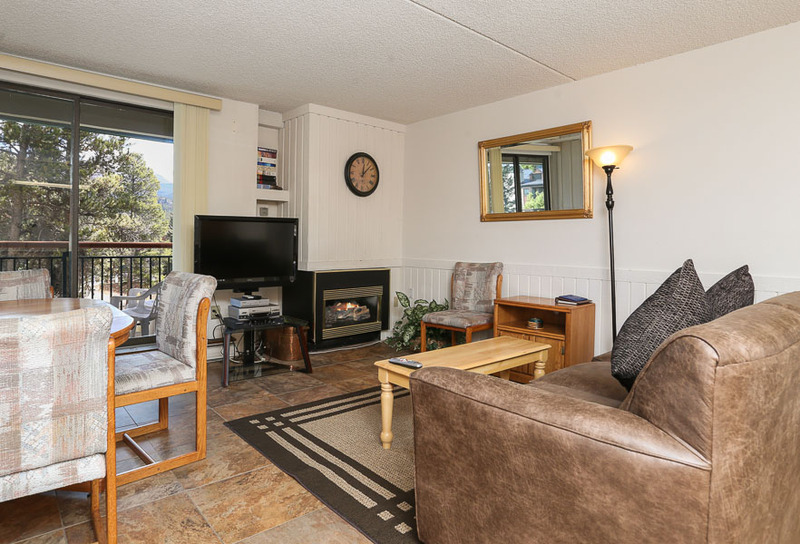 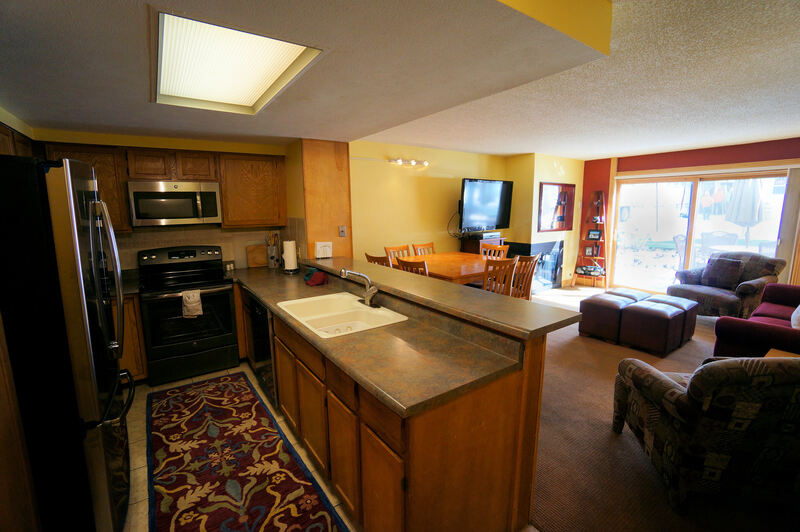 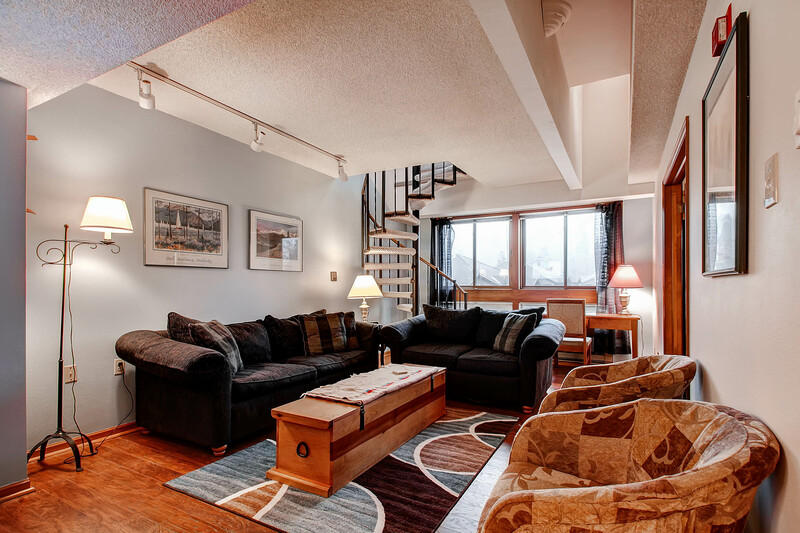 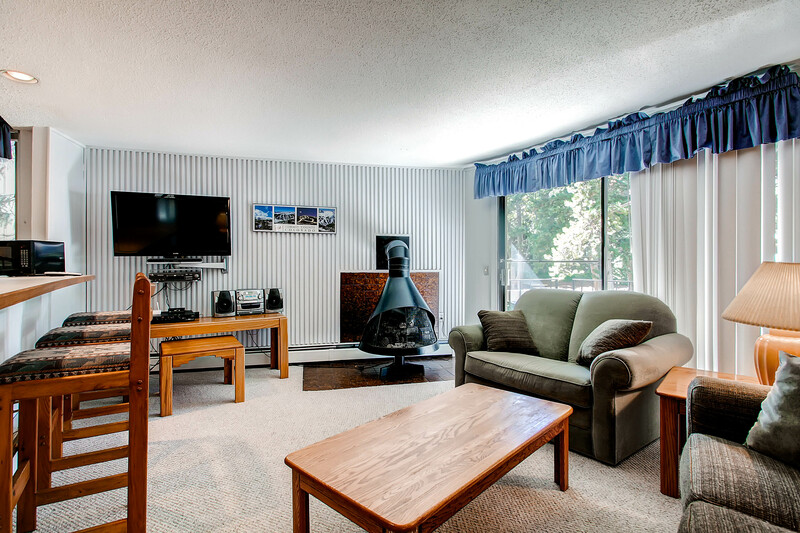 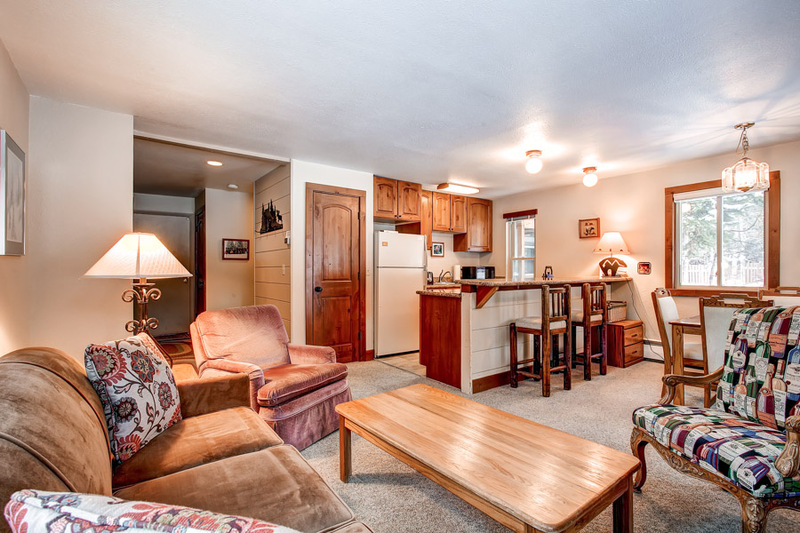 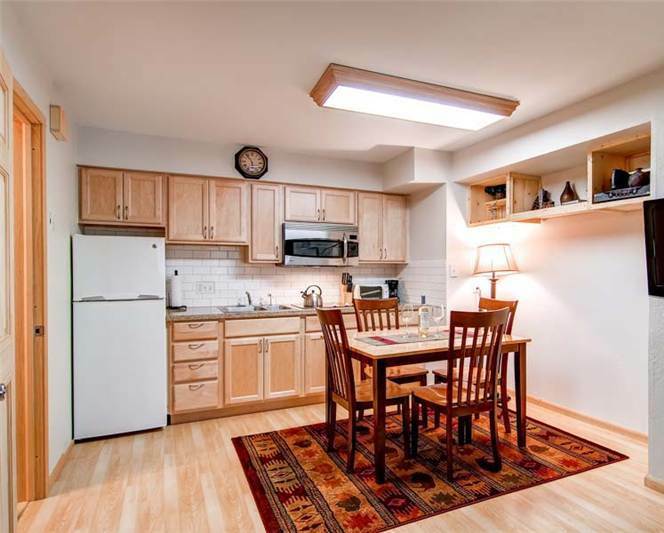 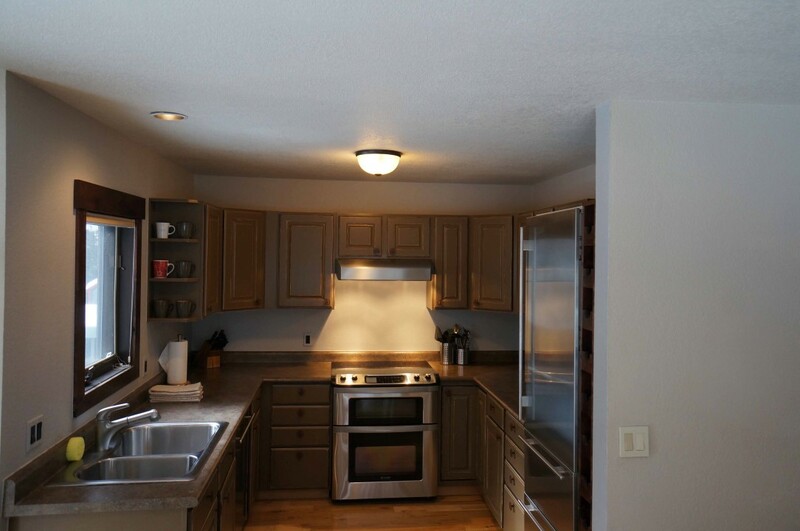 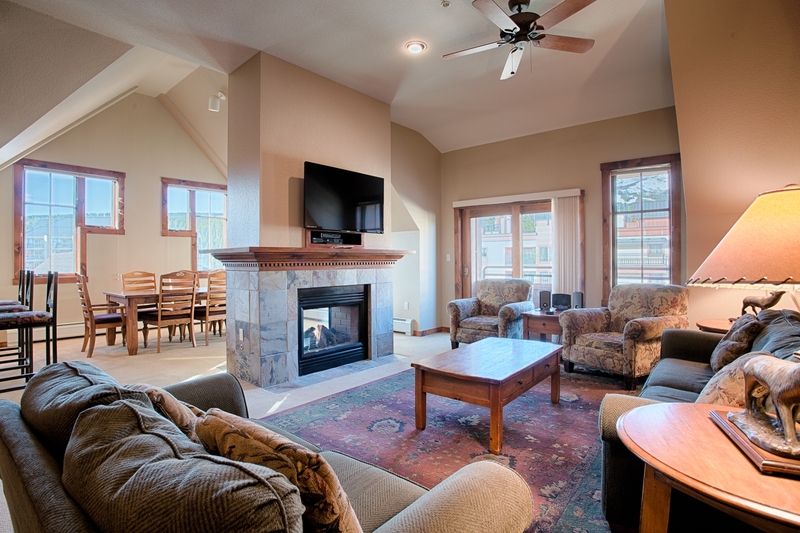 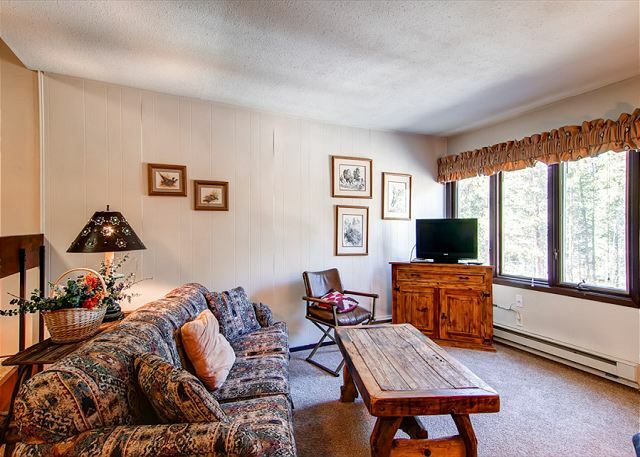 It is located on the 3rd floor of the Lift Complex and the unit has vaulted ceilings throughout. 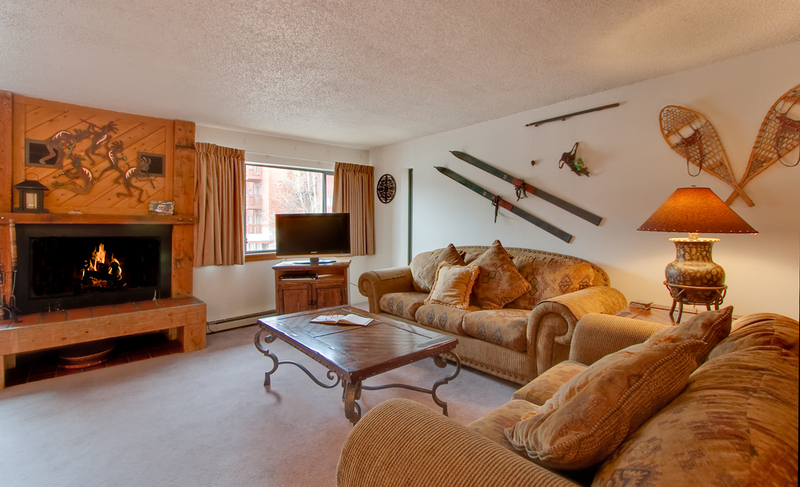 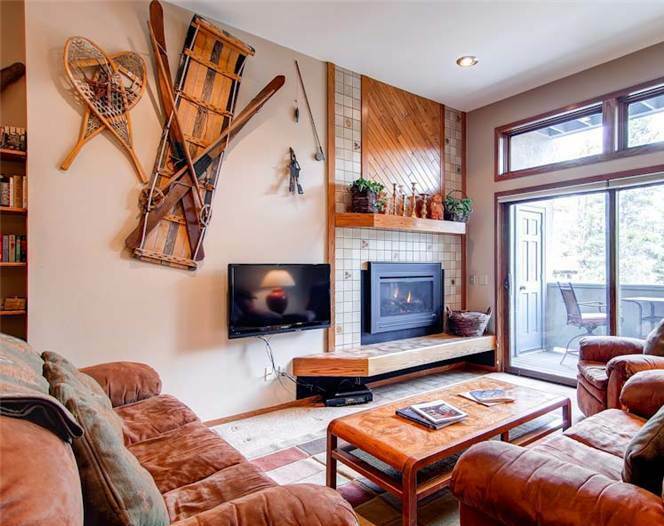 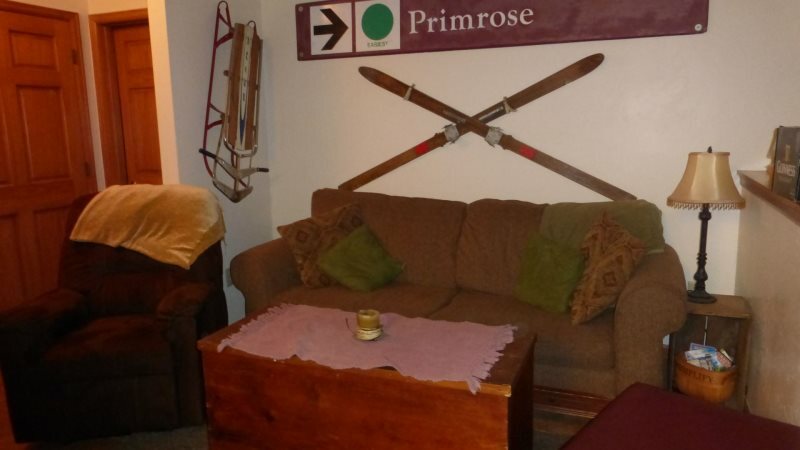 When you enter the condo you are greeted with vintage ski equipment displayed in the entryway with ski racks for your skis. 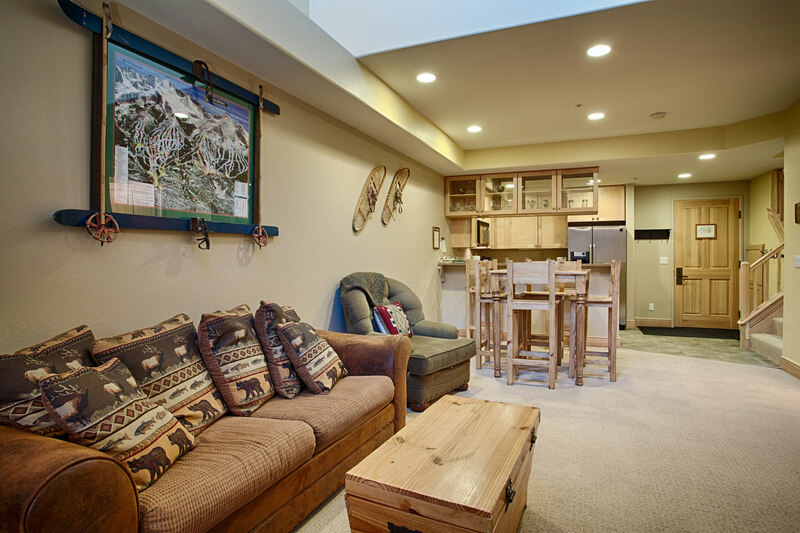 Most guests however enjoy the convenience of the ski lockers located at the base of the stairwell in the ski locker. 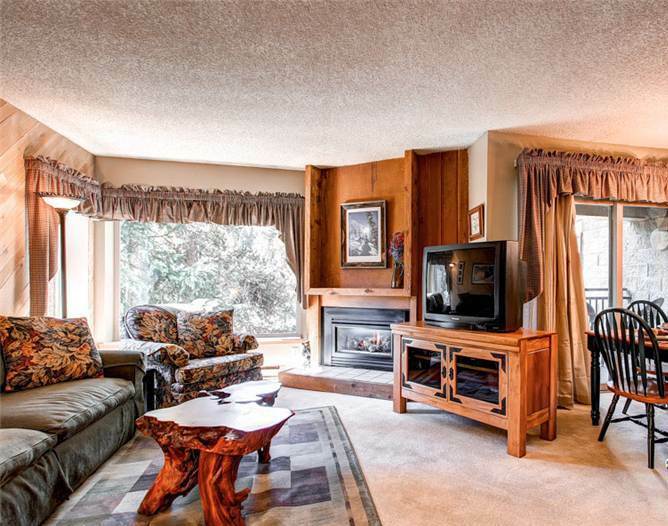 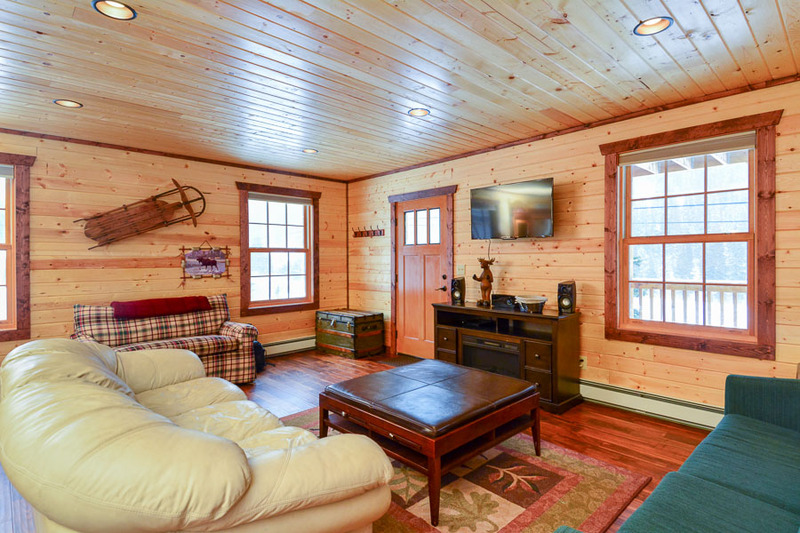 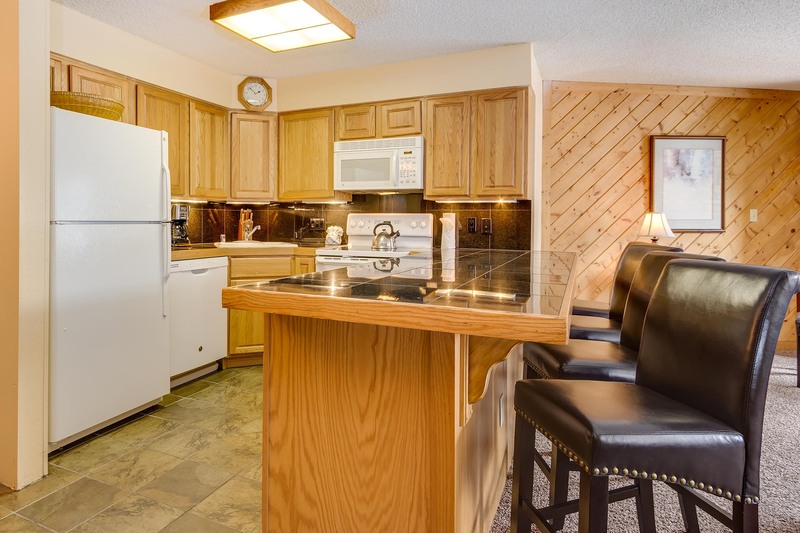 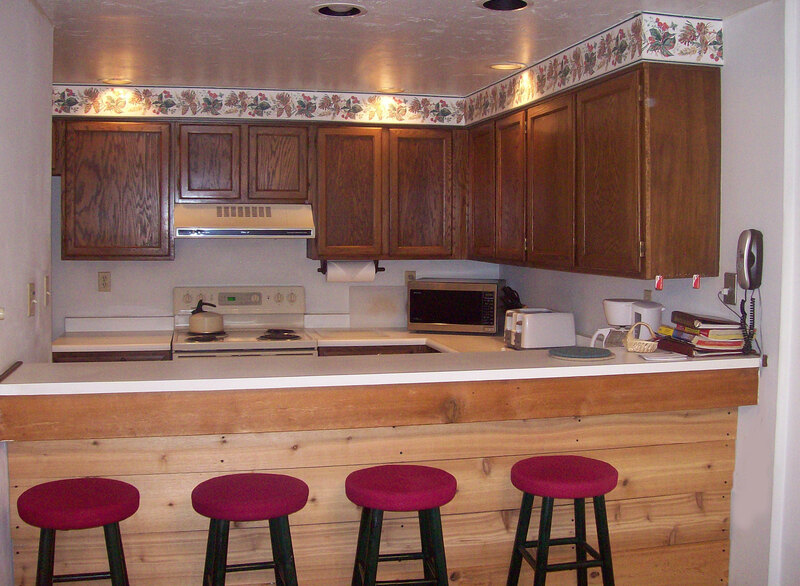 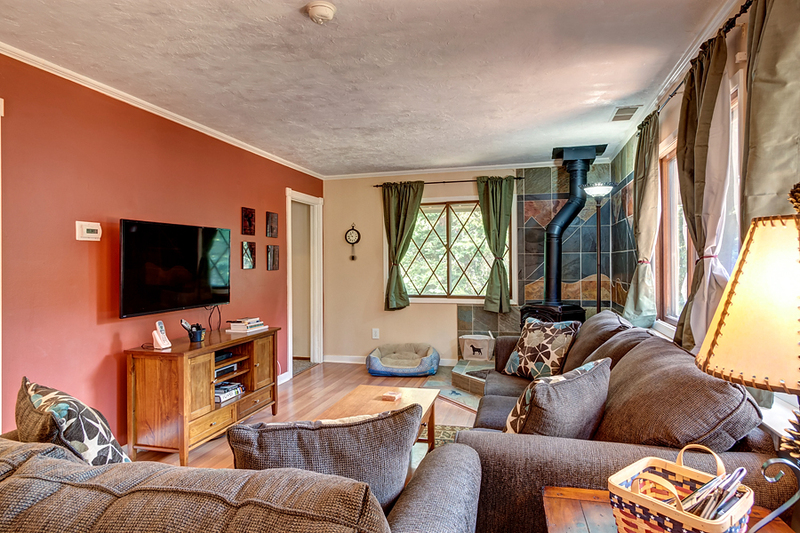 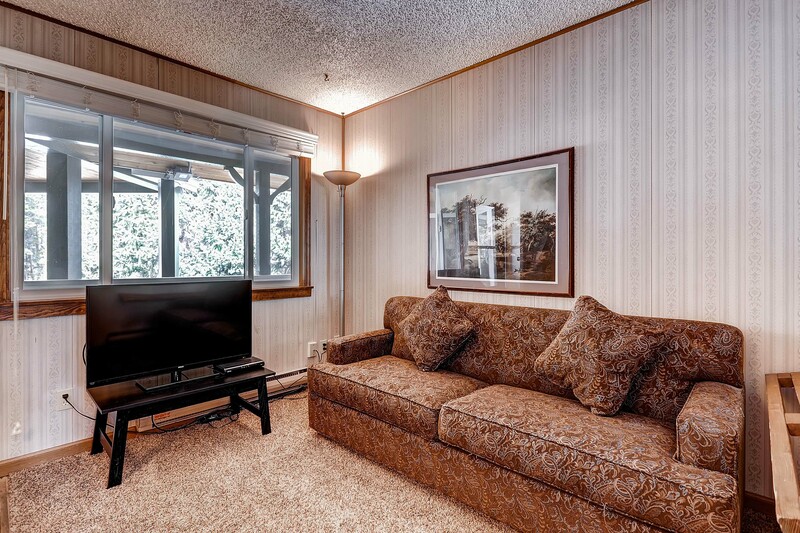 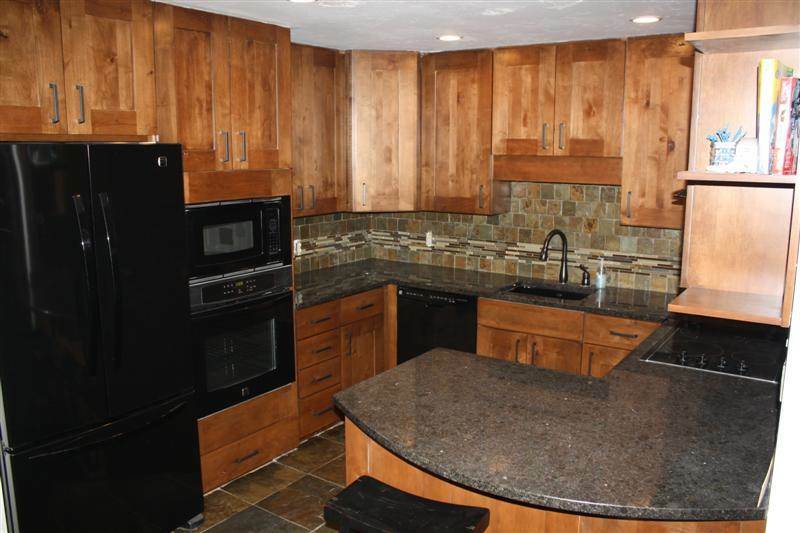 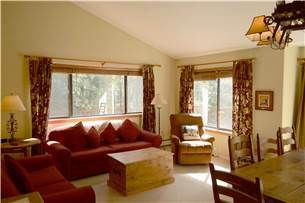 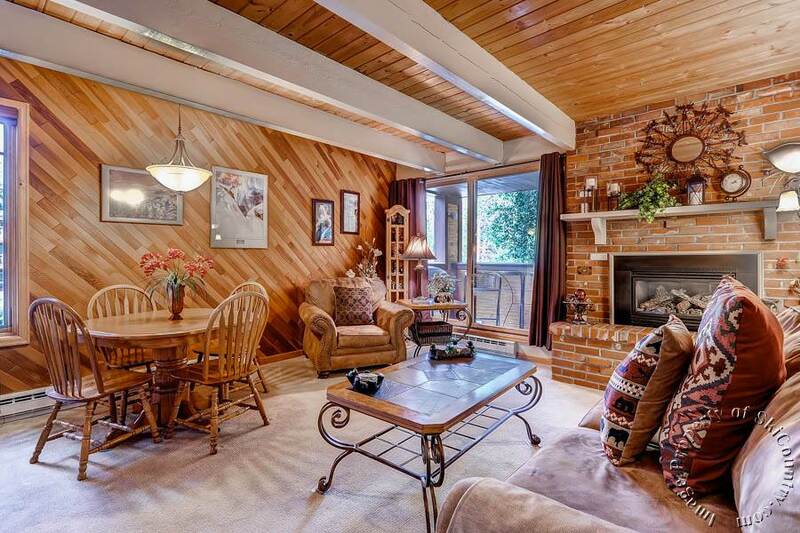 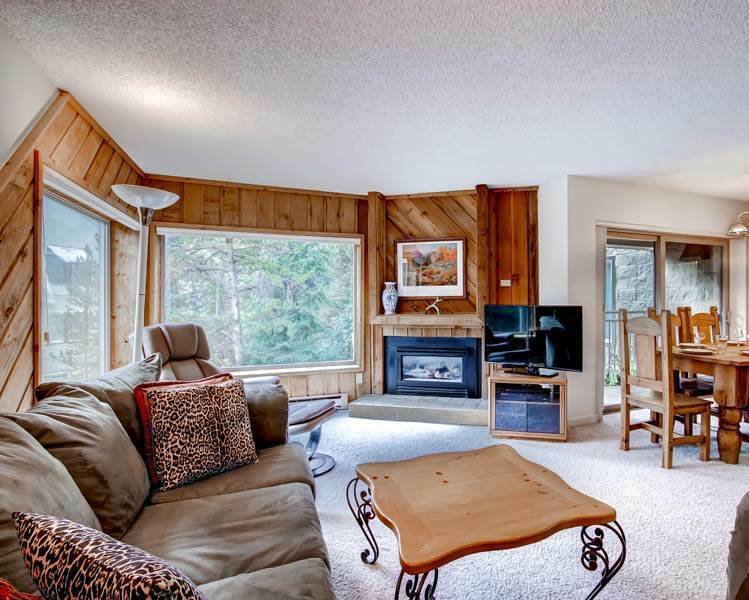 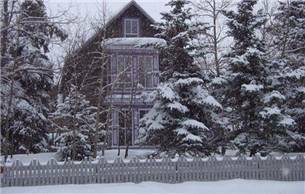 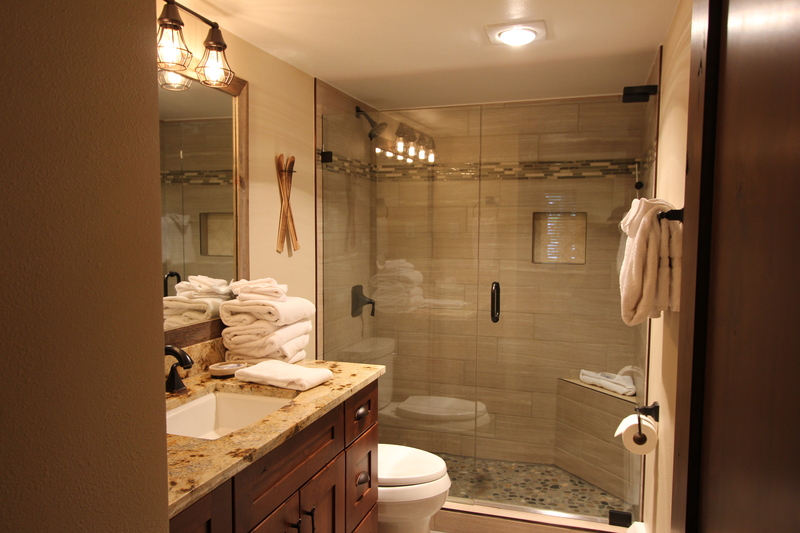 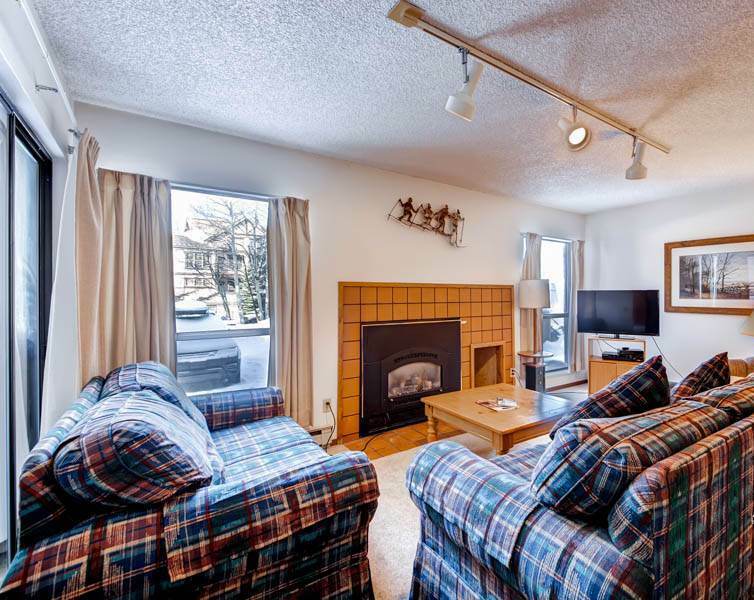 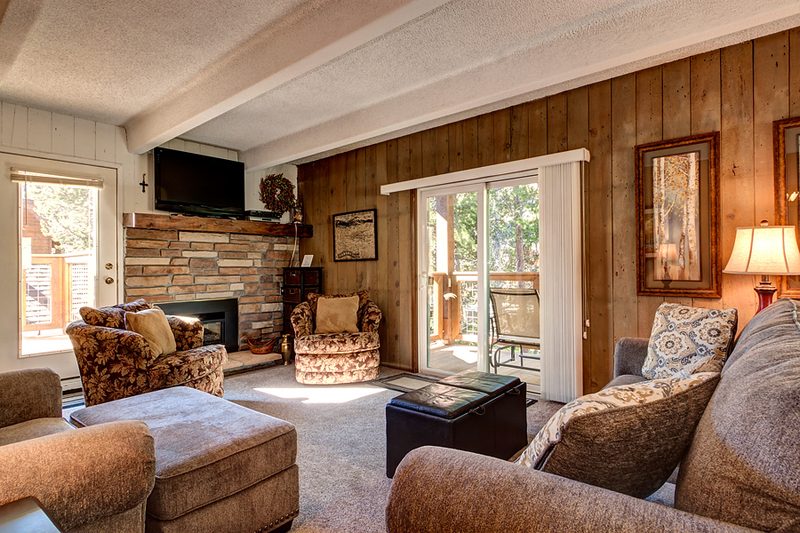 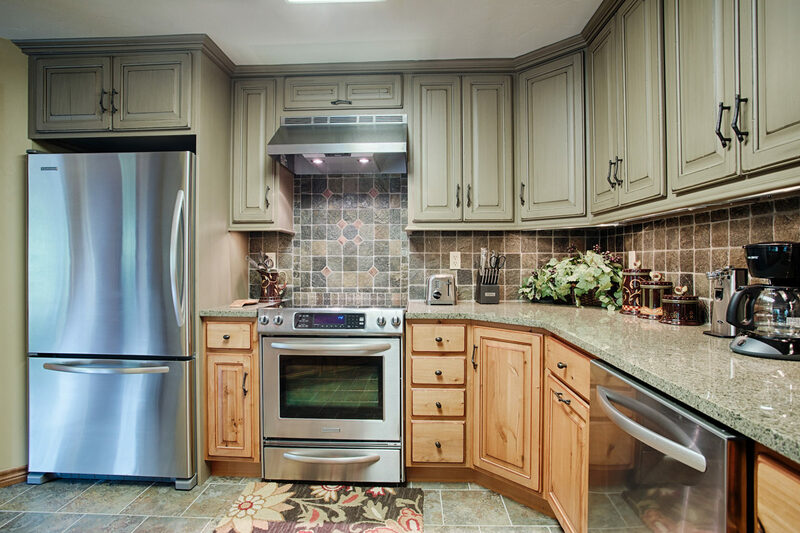 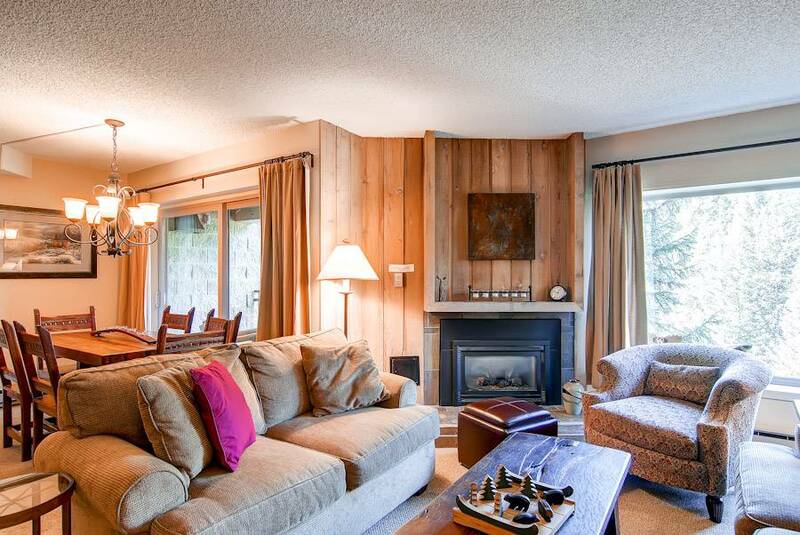 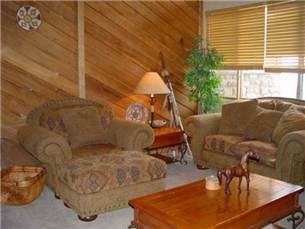 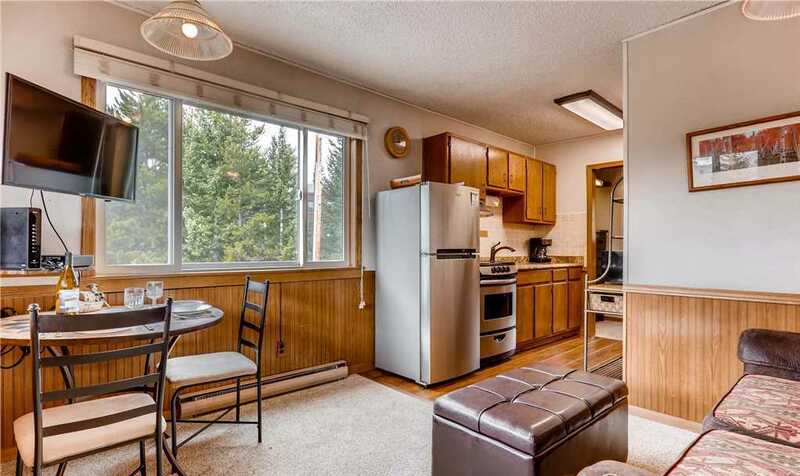 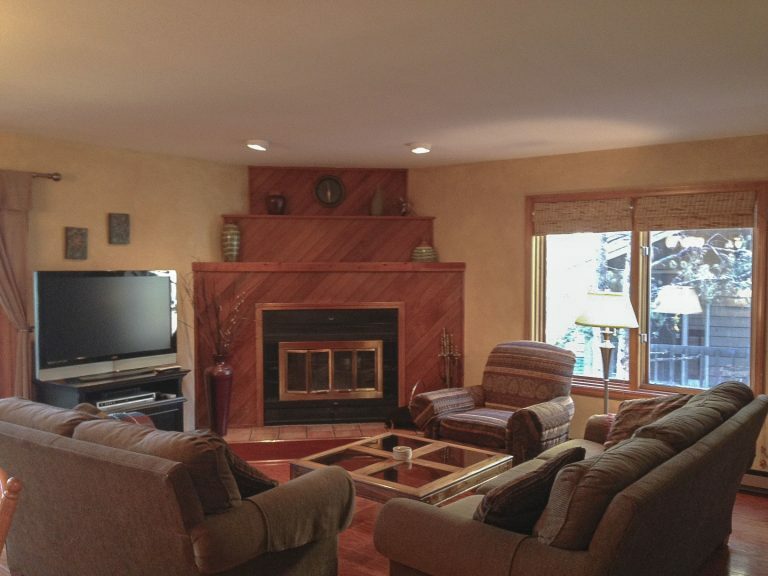 The unit has solid knotty pine doors and woodwork throughout. 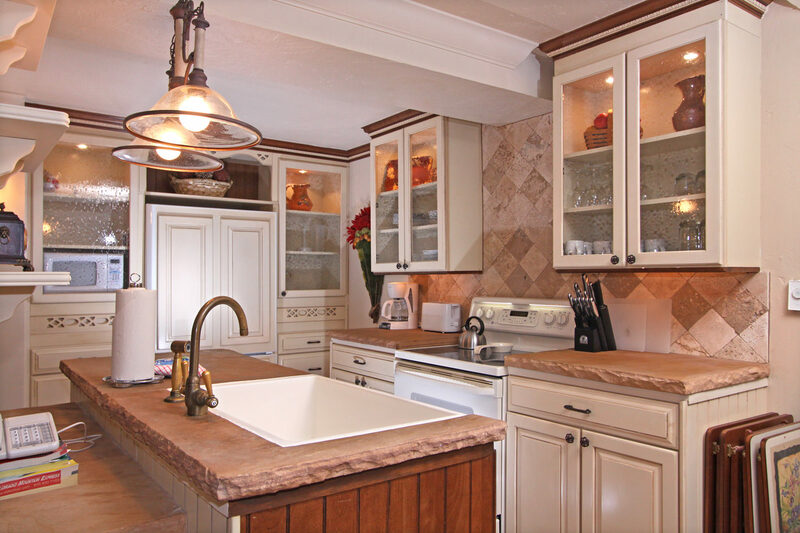 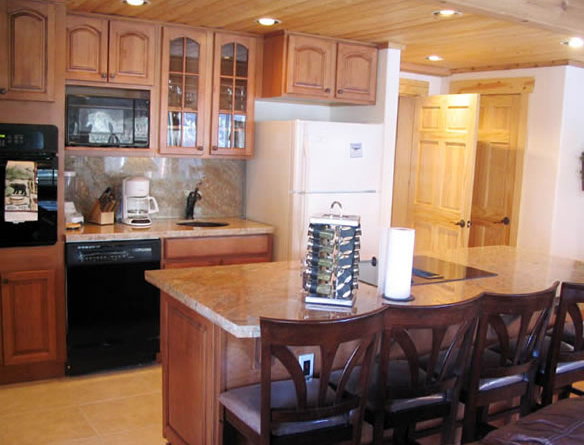 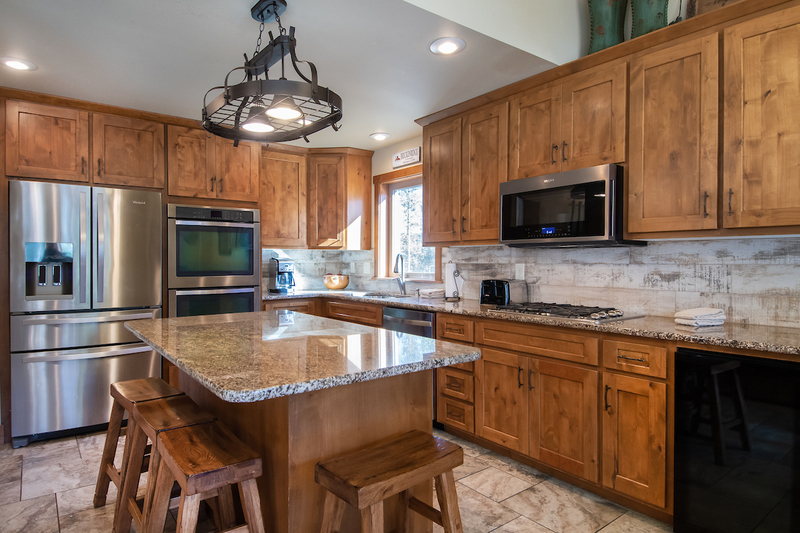 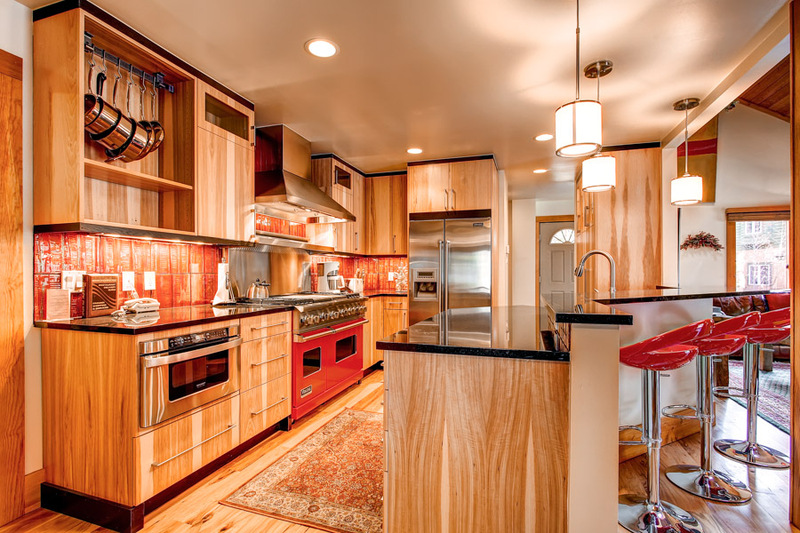 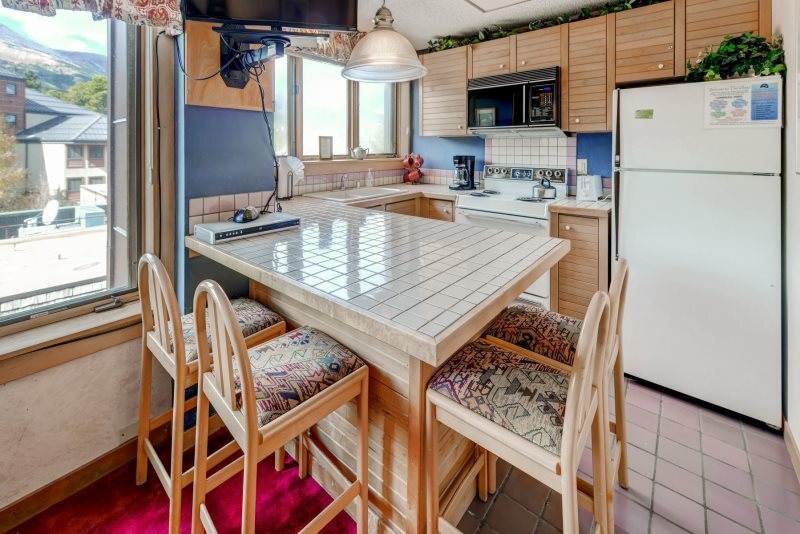 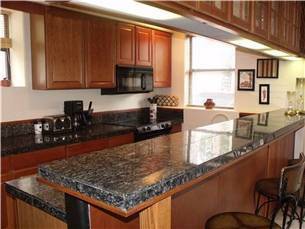 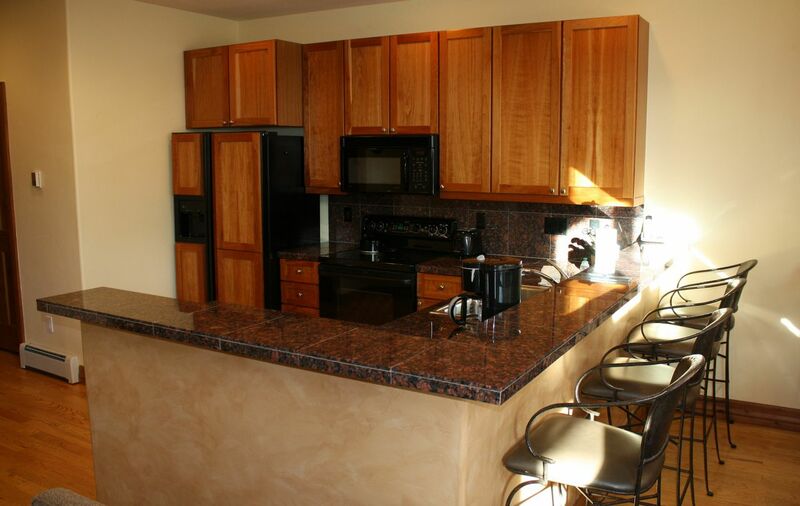 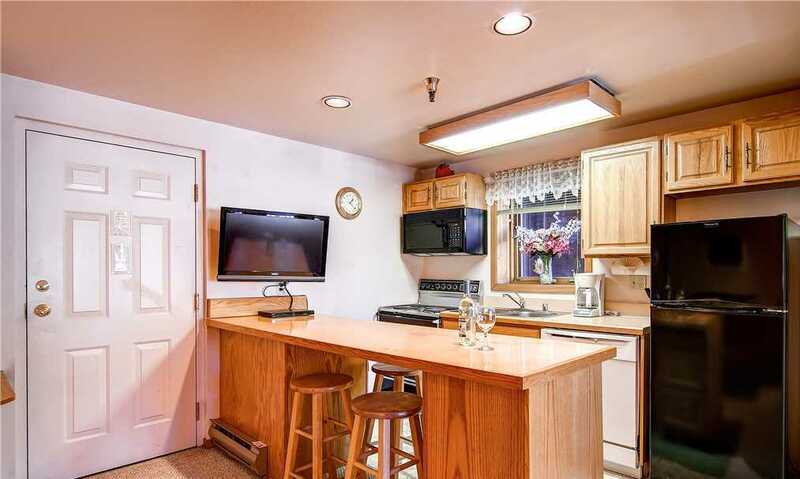 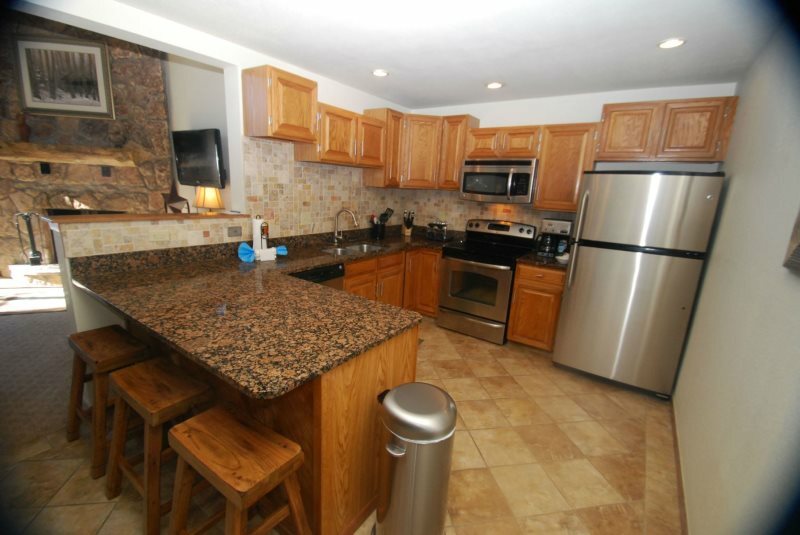 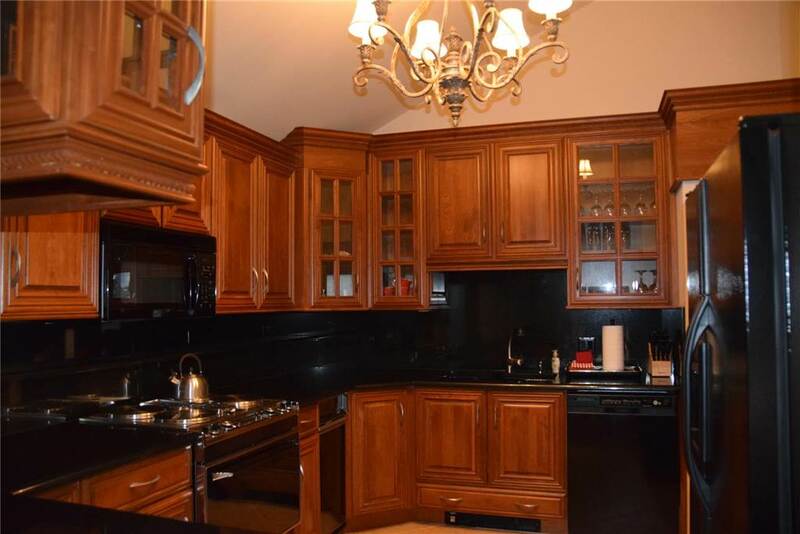 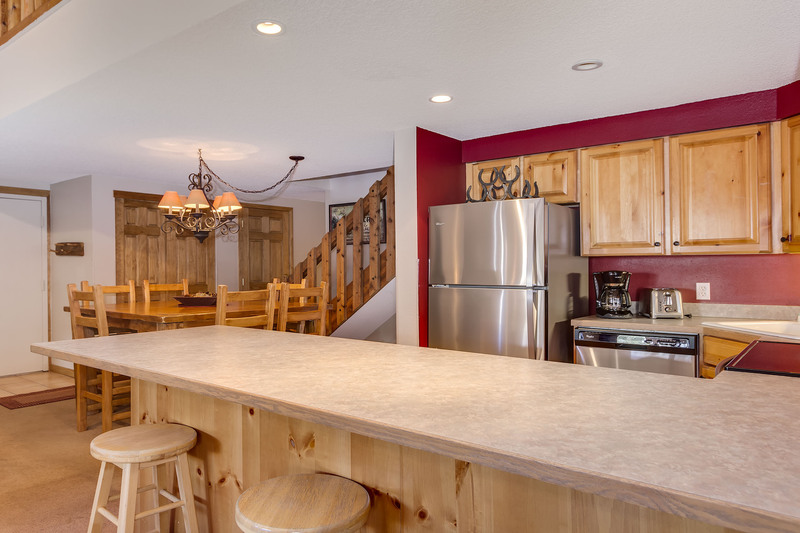 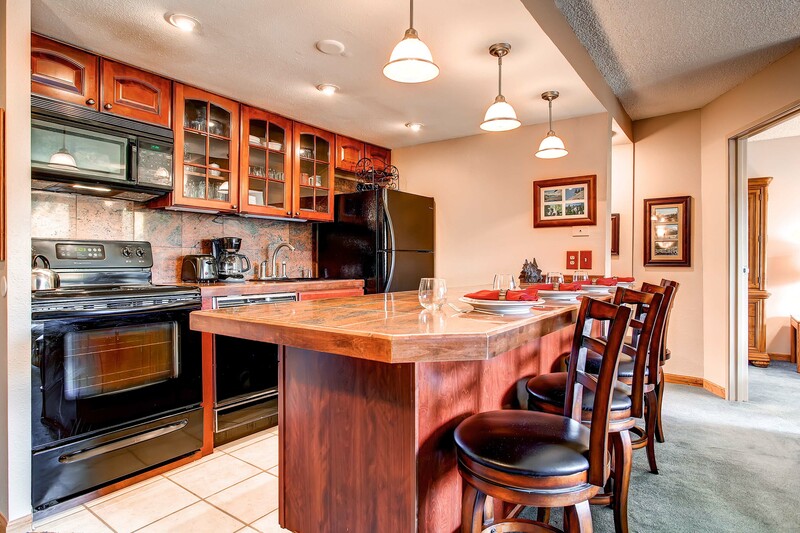 When you enter the kitchen you are greeted by a granite island with 4 barstools. 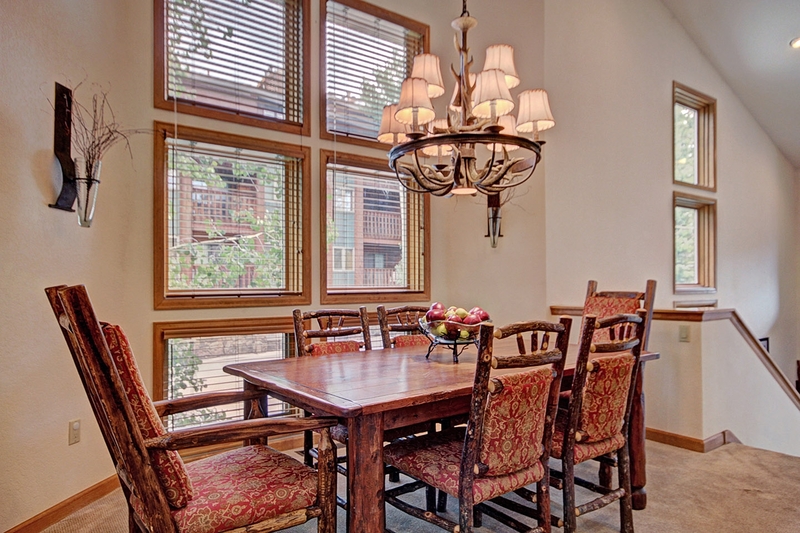 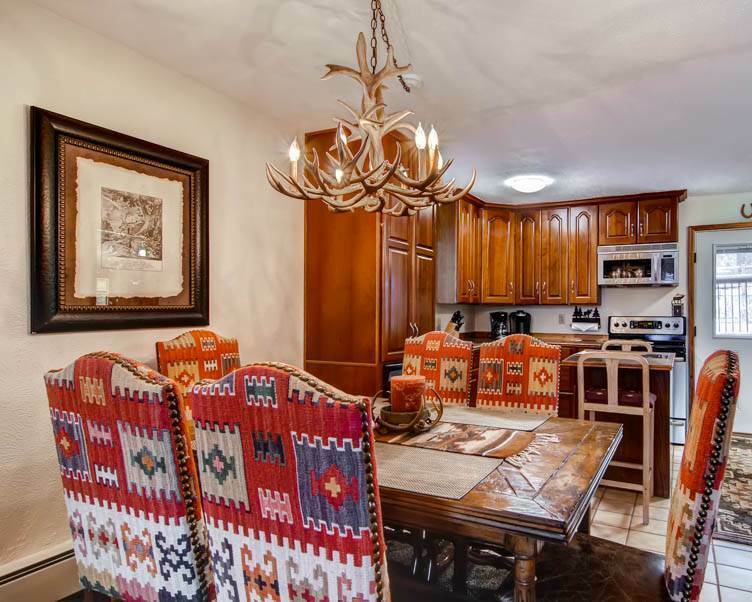 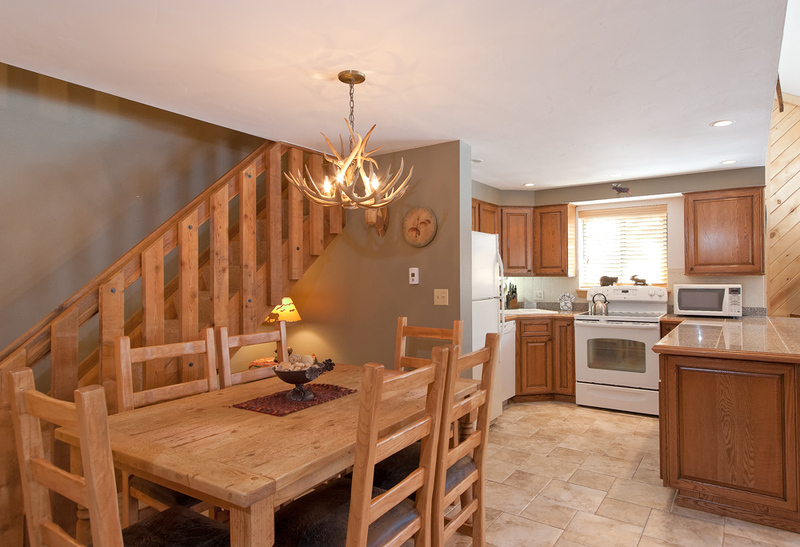 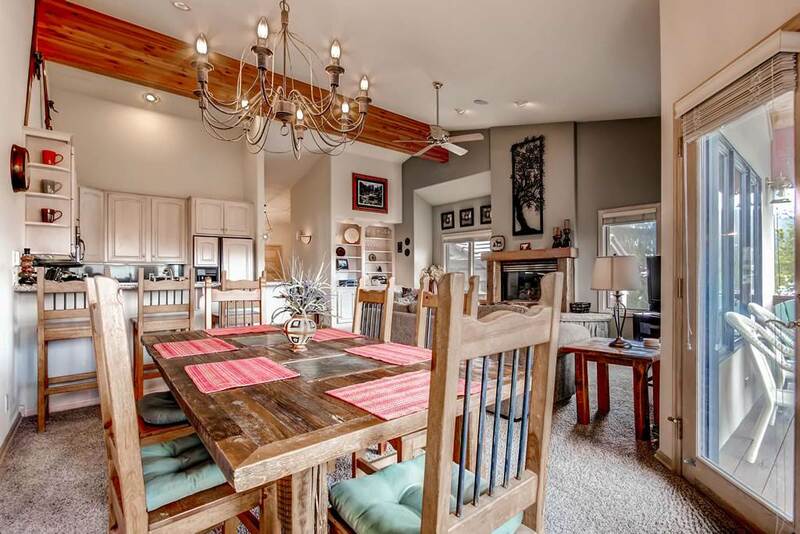 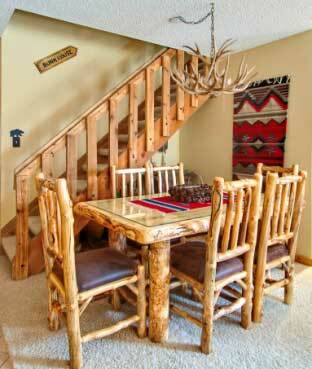 The dining room is lavish with its antler chandelier and table that seats up to 8 people. 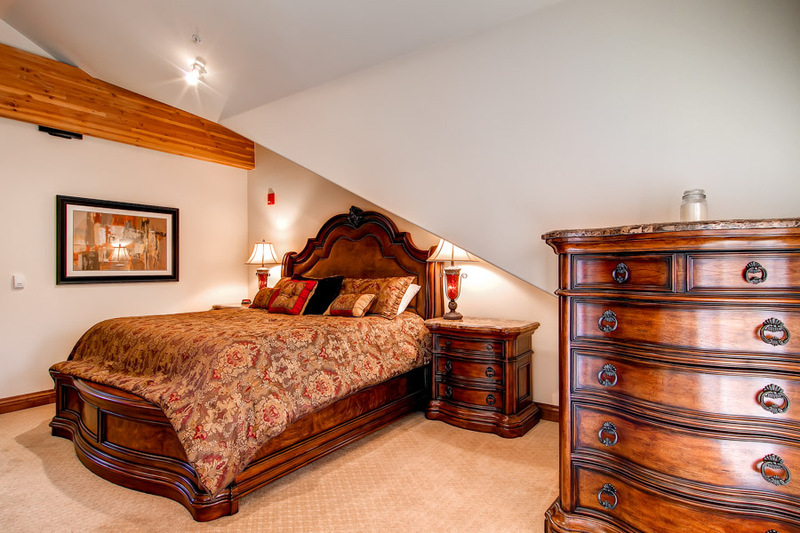 The furnishings in the bedroom have peeled pine bed frames and have comfortable top of the line pillowtop mattresses with independent coil action. 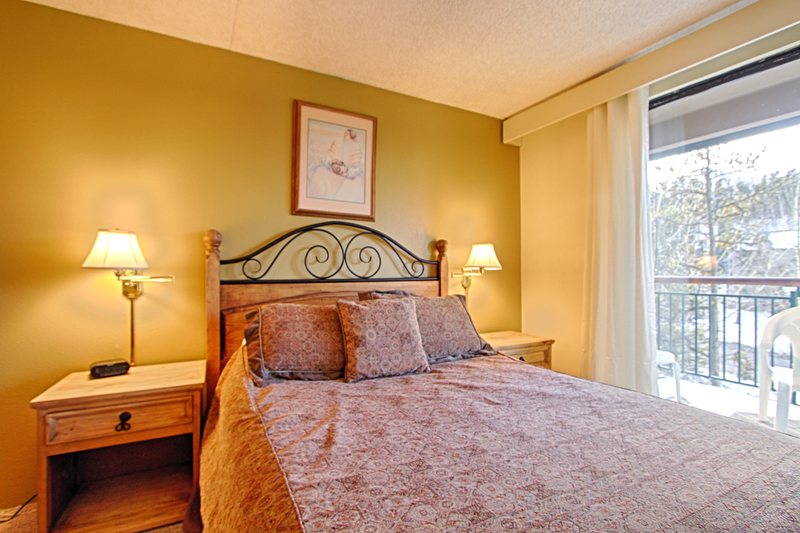 The shams and comforters are all coordinated to give a lush comfortable and inviting feeling. 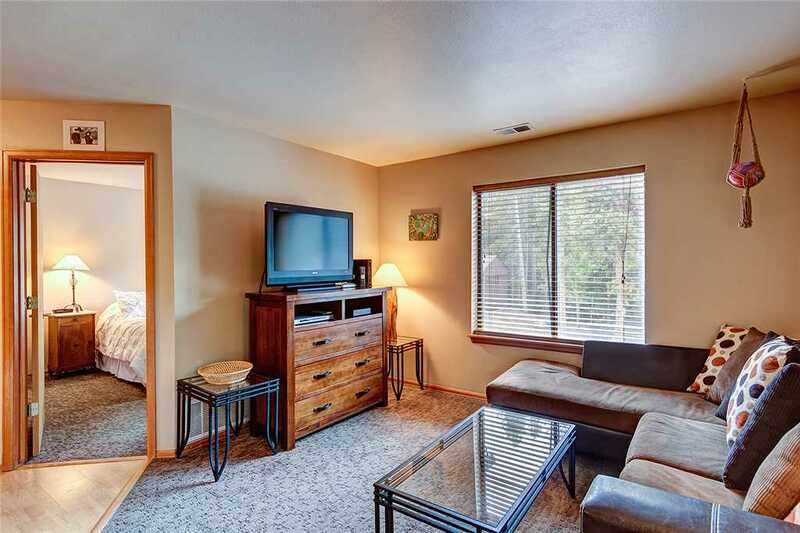 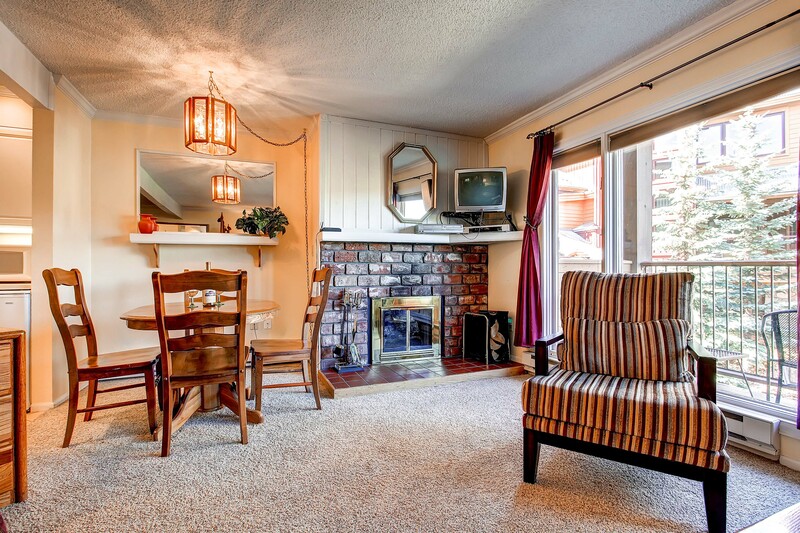 The master has 2 Queen beds and opposite an armoire with a 50″ flat panel TV atop. 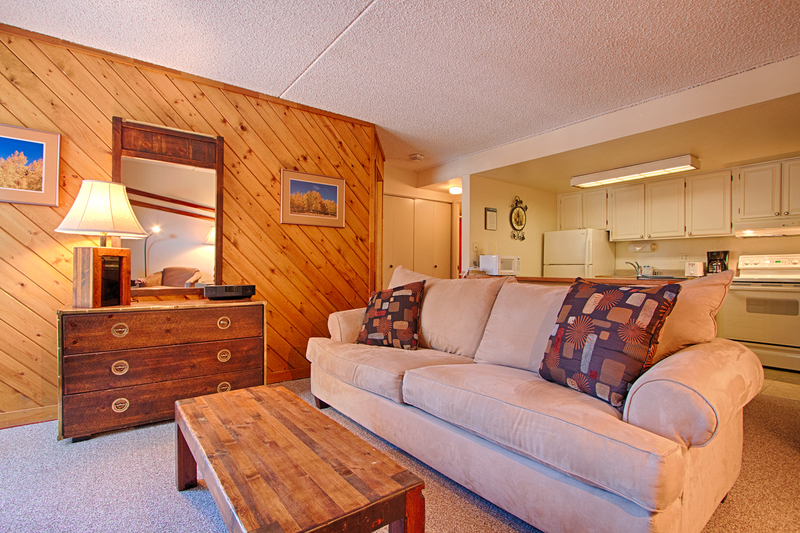 The master also has an additional Twin Sofa Sleeper and bathroom ensuite. 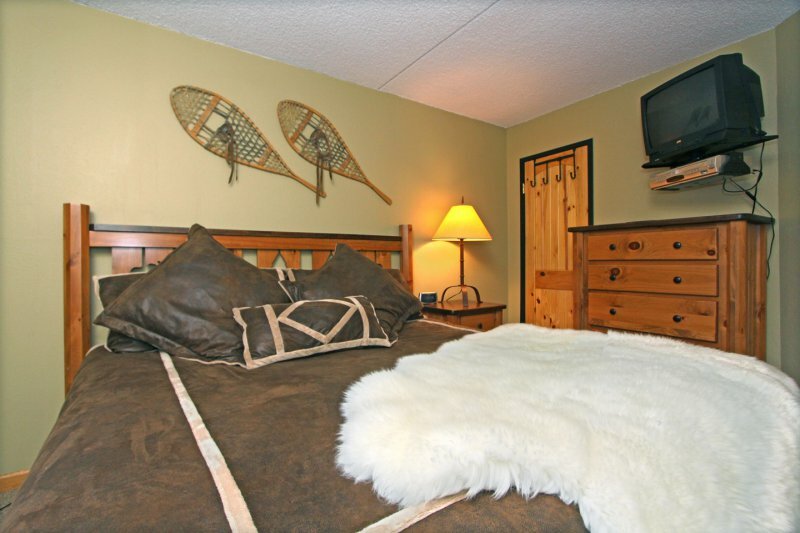 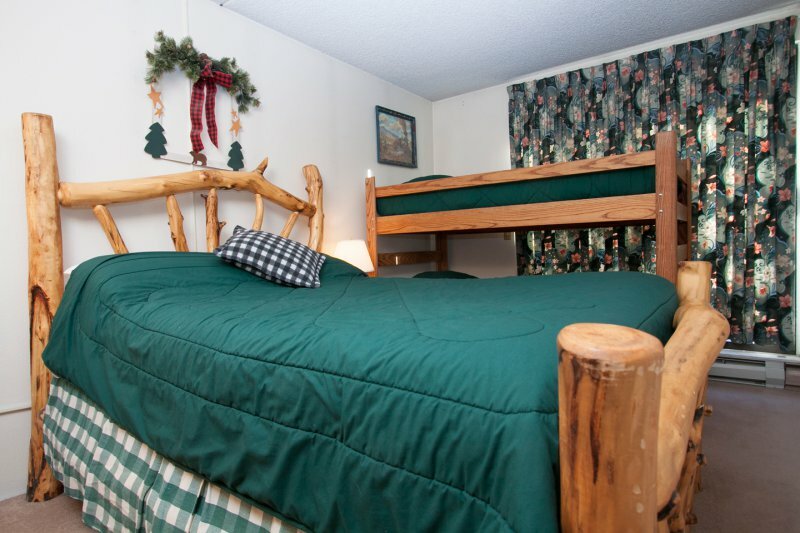 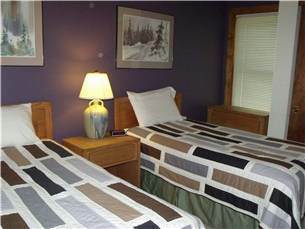 The guest bedroom has a Queen bed and Twin Sofa Sleeper and also has the bathroom ensuite. 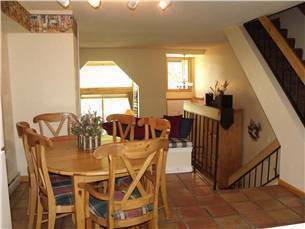 The loft is primarily located atop the kitchen area with a solidily constructed sloped ladder to bring you safely and securely up and down from the loft. 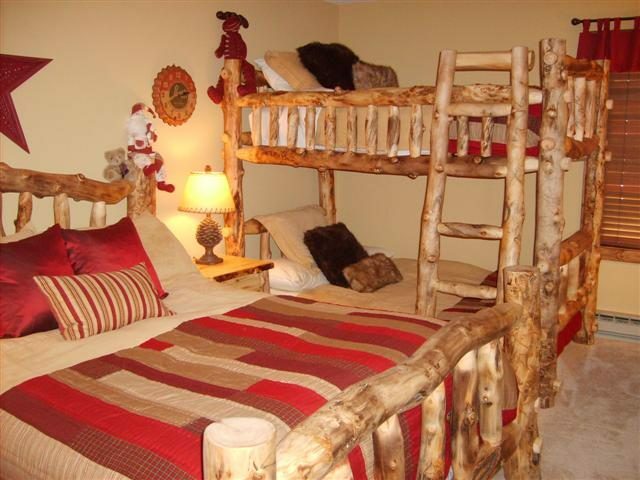 Once in the loft you have a Queen and then two twins tucked in a private enclosed nook. 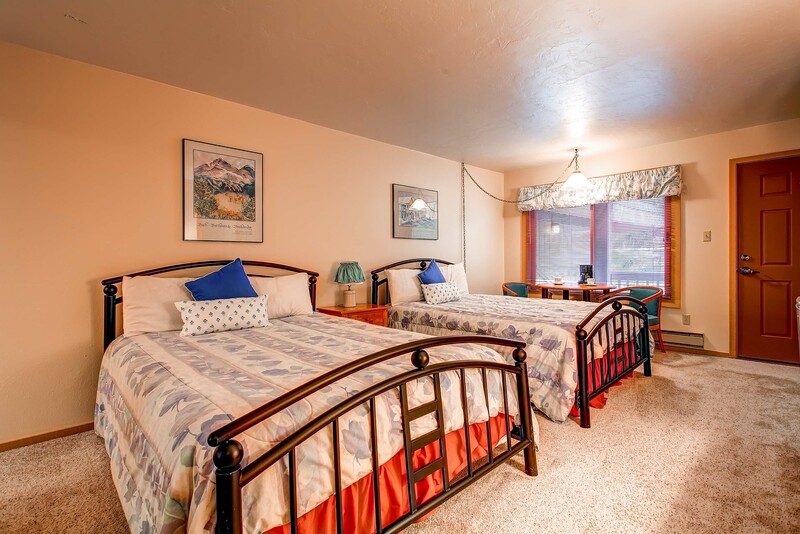 So groups looking for privacy you have essentially 4 different sleeping areas. 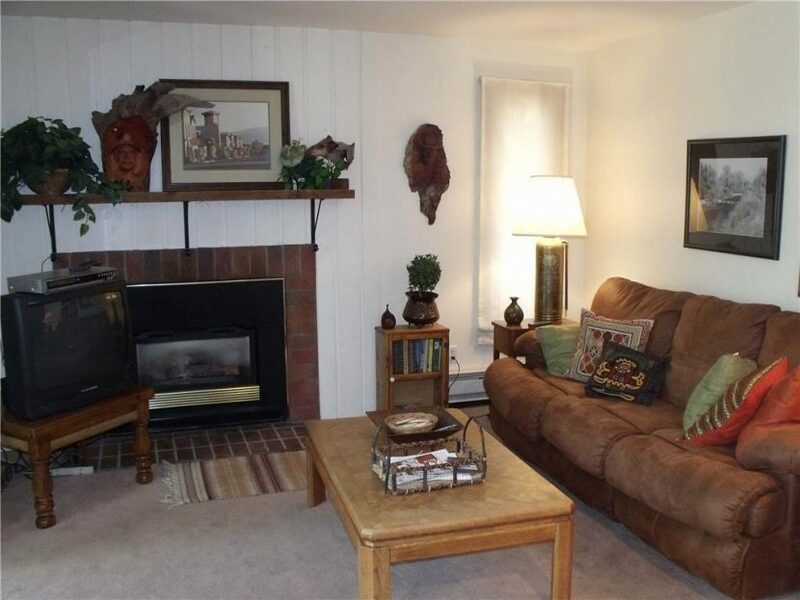 Unfortunately there is no sofa sleeper in the living room. 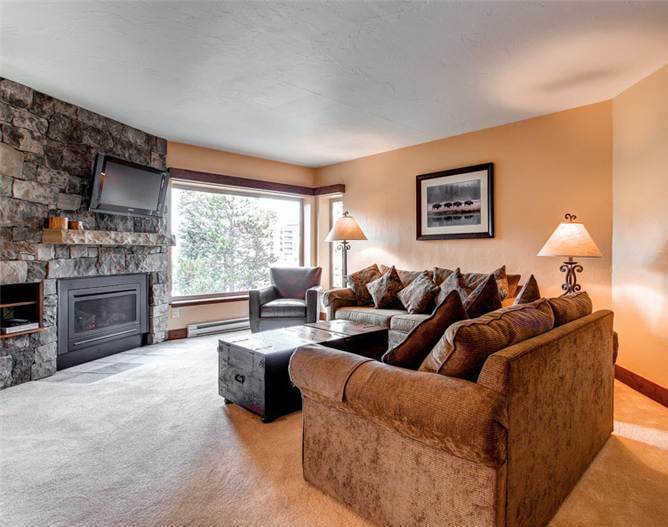 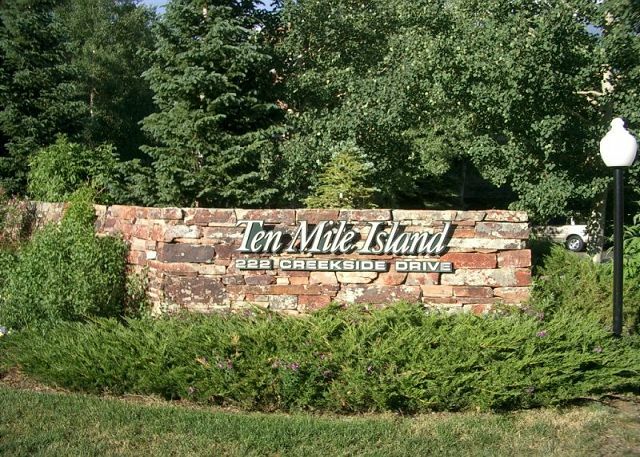 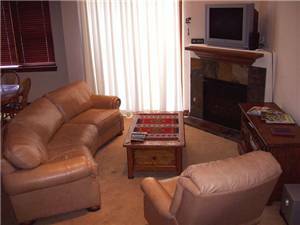 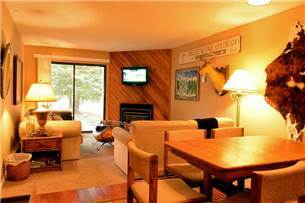 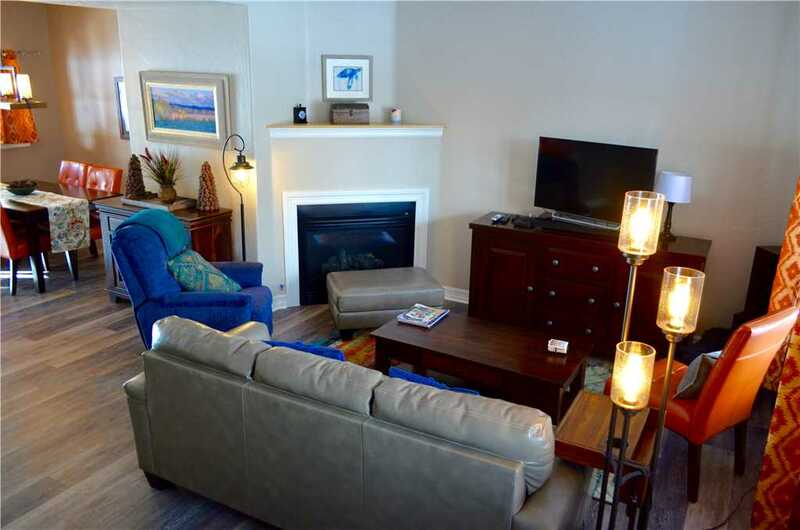 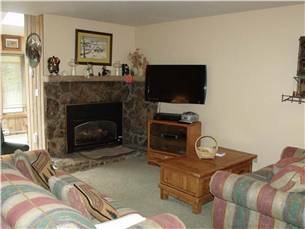 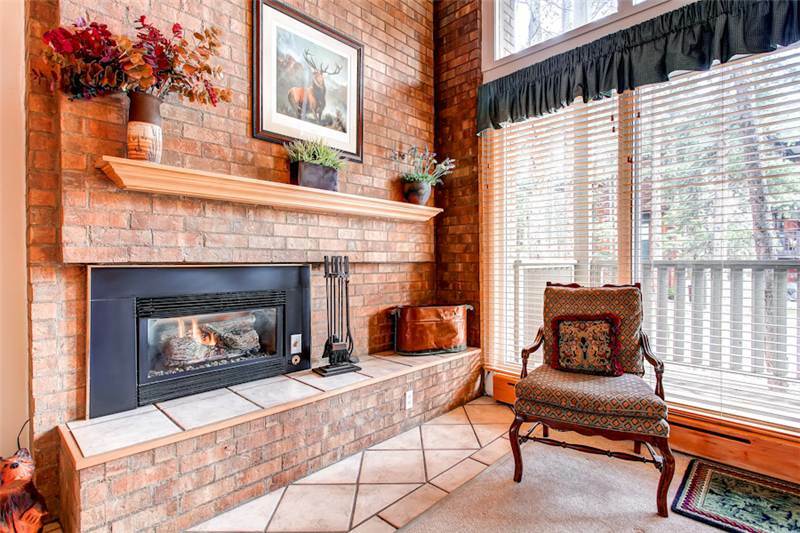 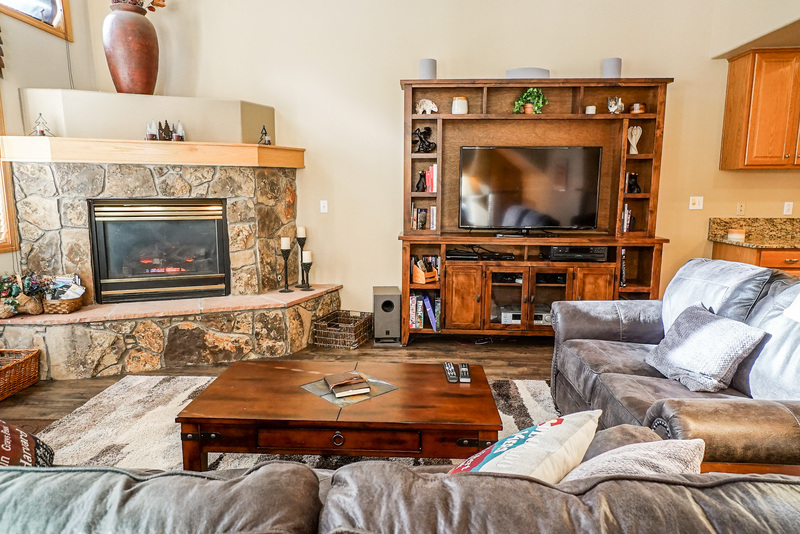 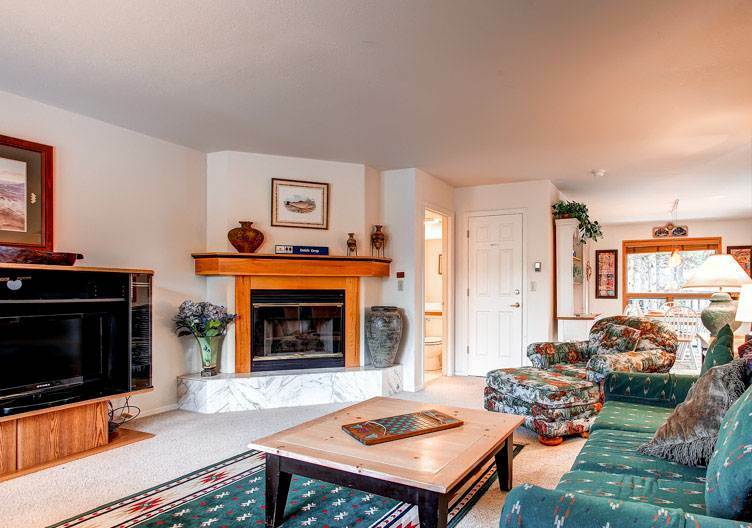 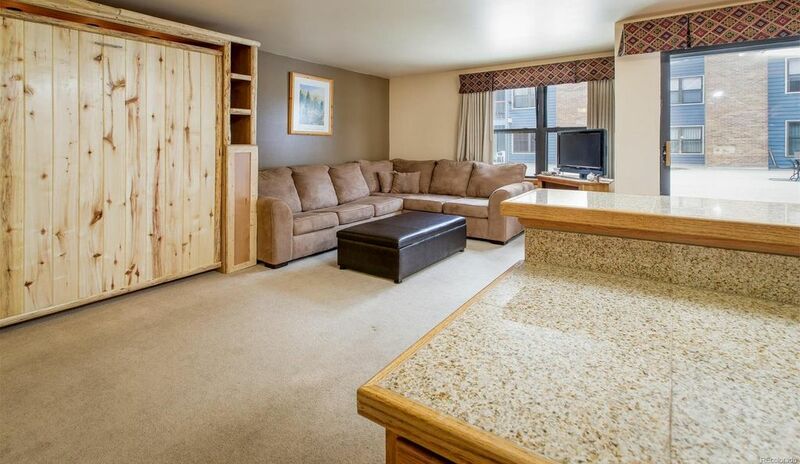 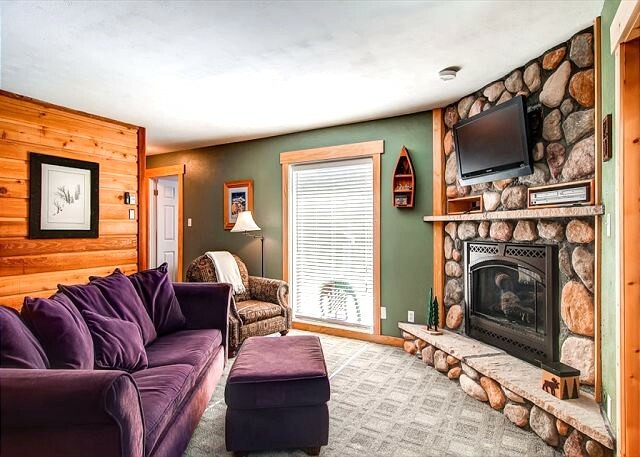 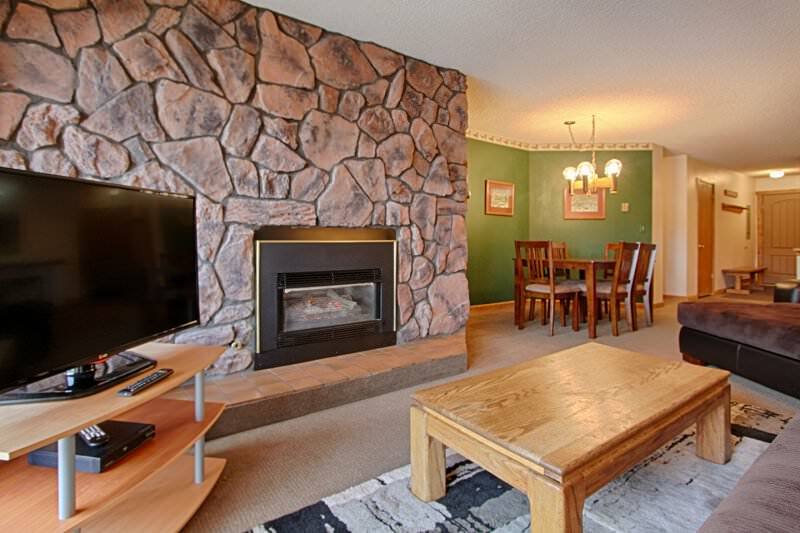 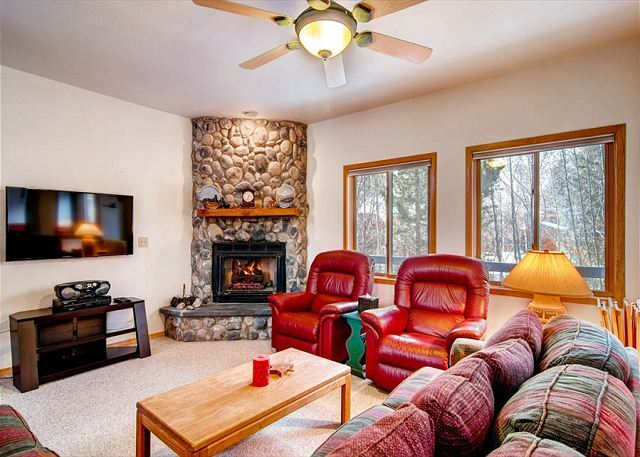 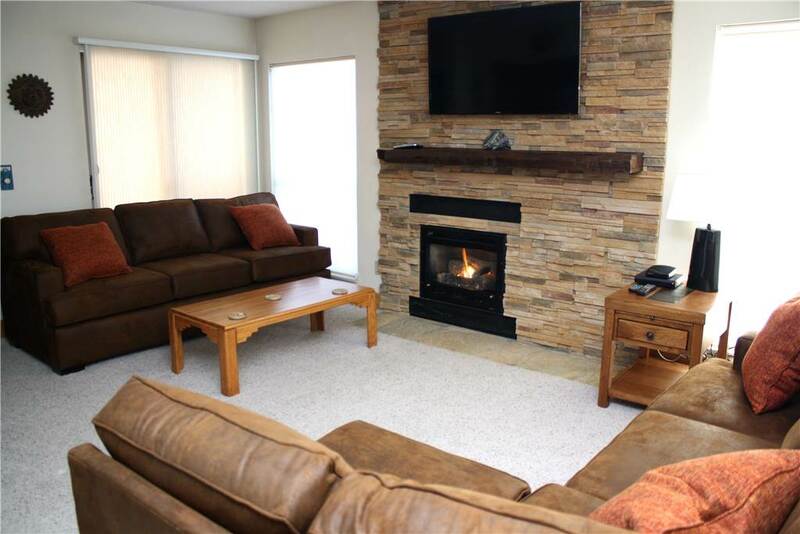 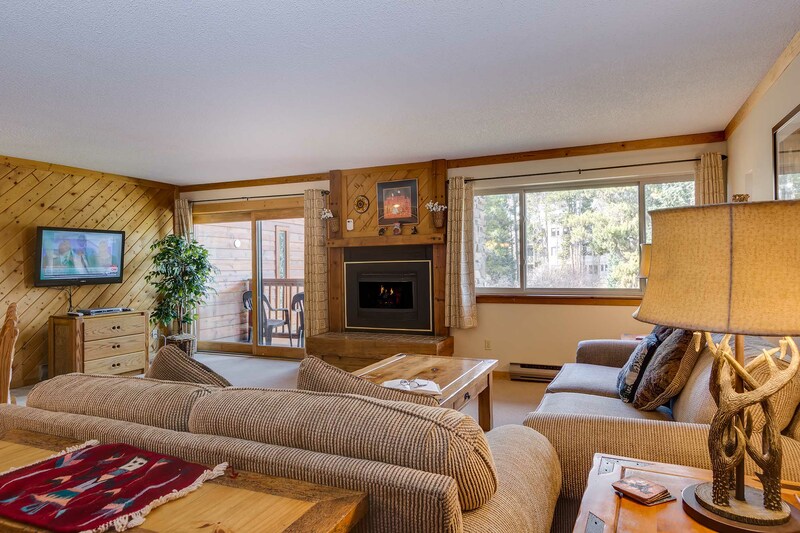 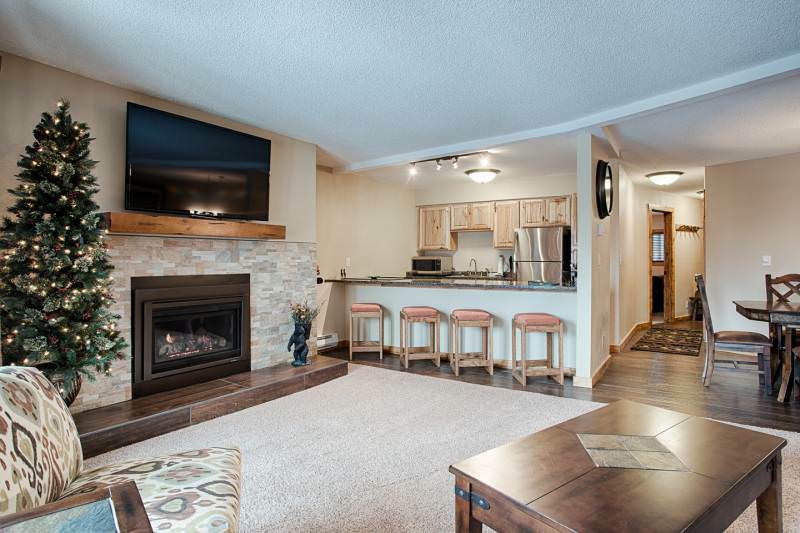 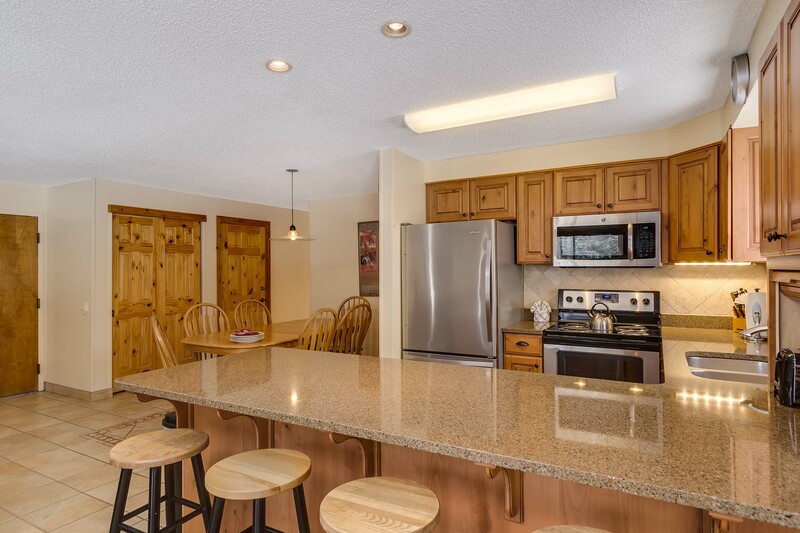 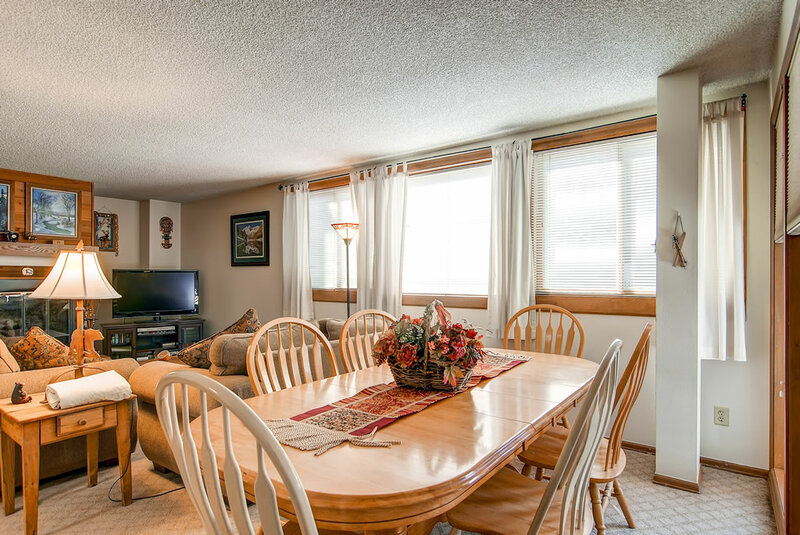 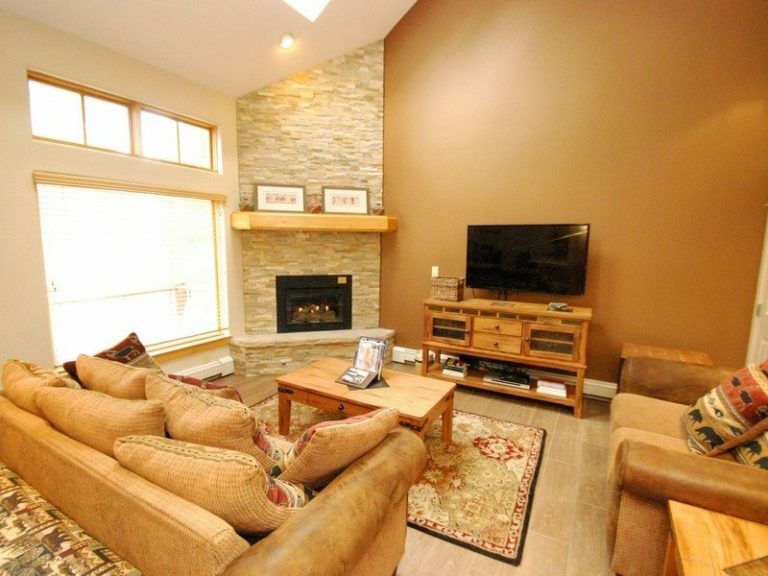 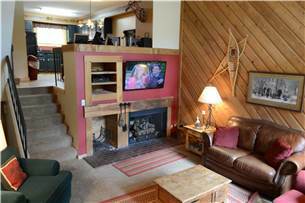 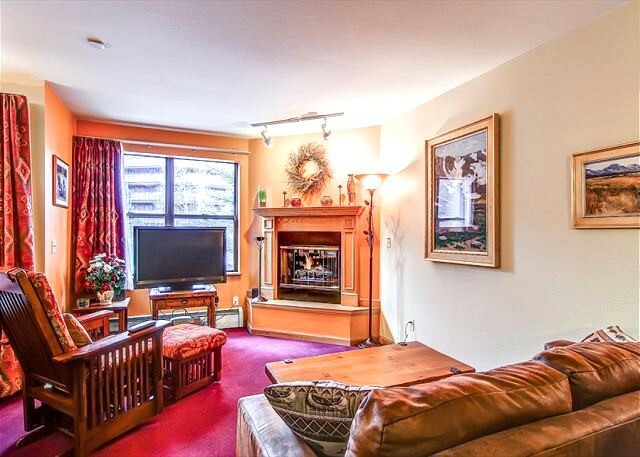 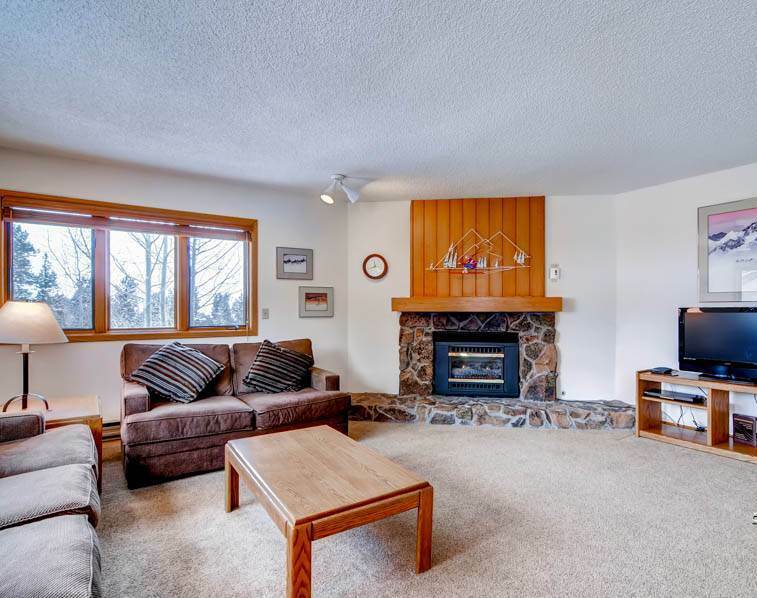 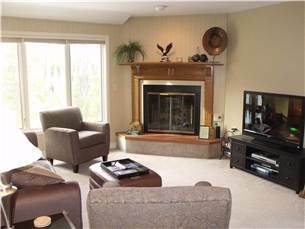 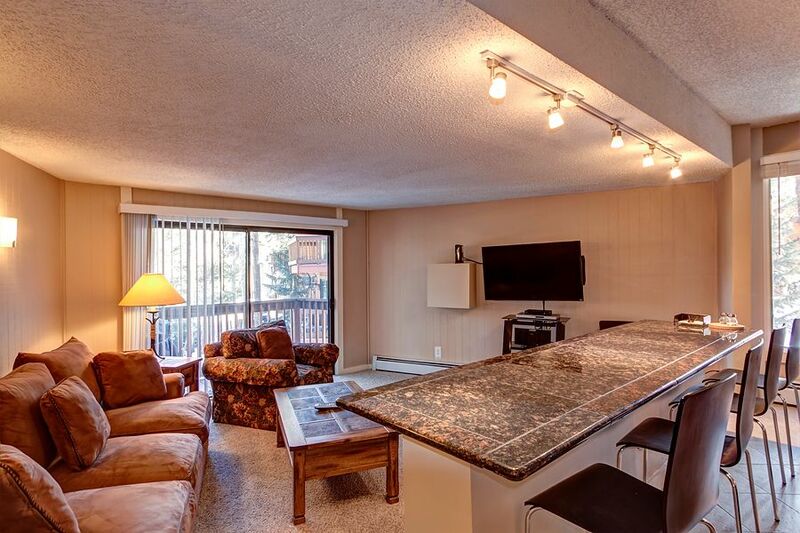 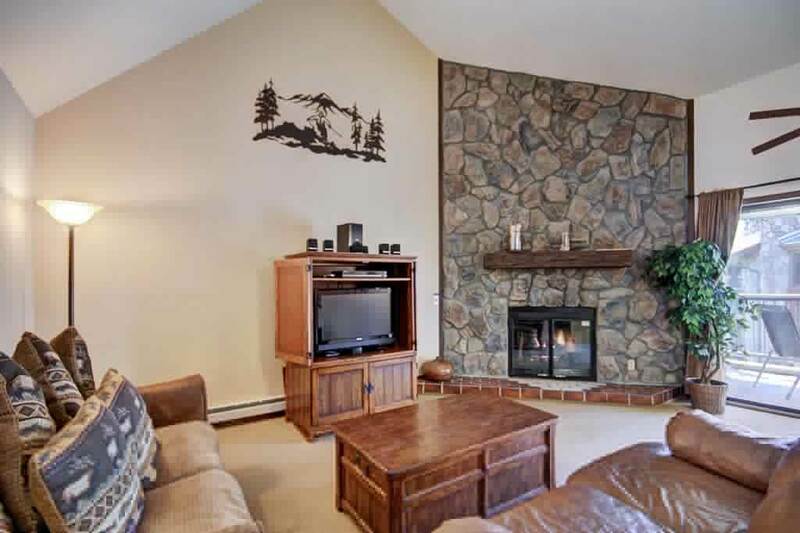 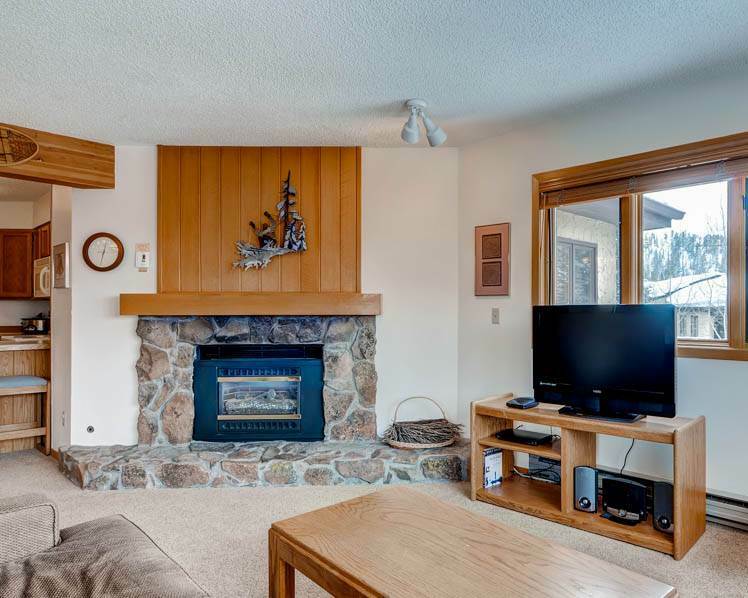 This spacious condo features a gas fireplace, private balcony with gas BBQ grill,, wi-fi, multiple TVs, covered parking and access to the clubhouse with an outdoor heated swimming pool and 2-indoor/2-outdoor hot tubs.